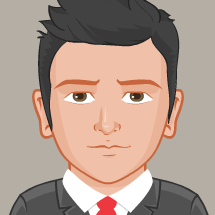 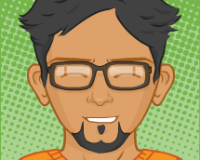 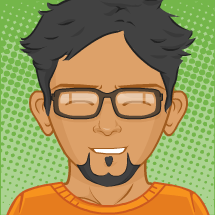 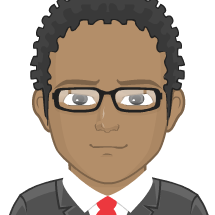 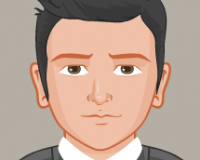 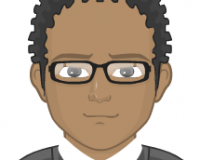 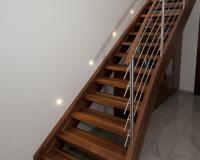 favourable quote, commensurate with the quality of service! 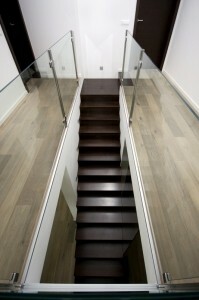 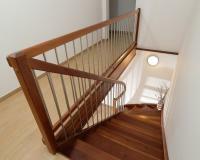 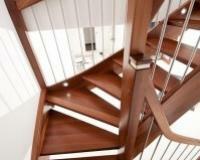 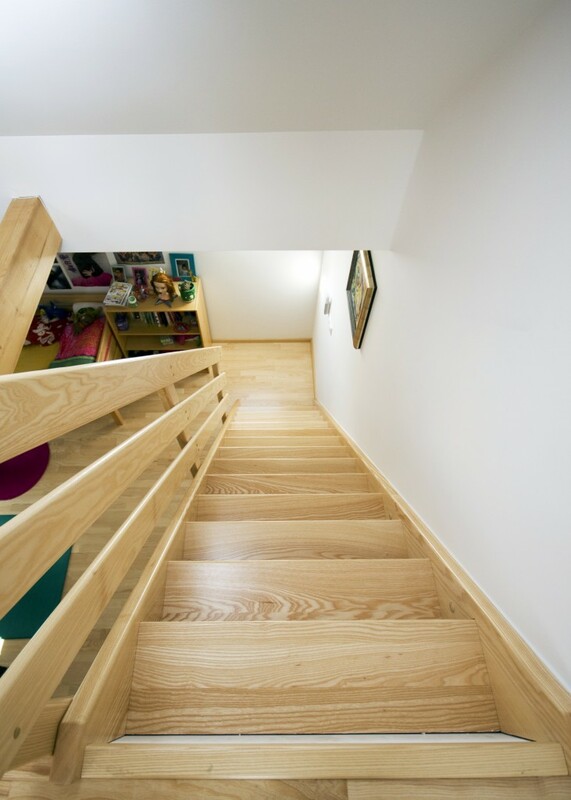 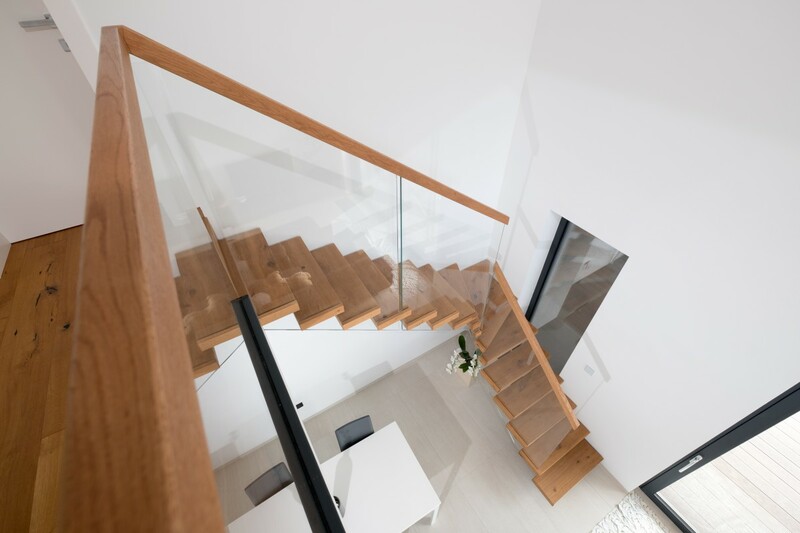 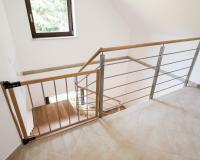 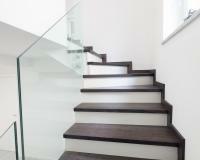 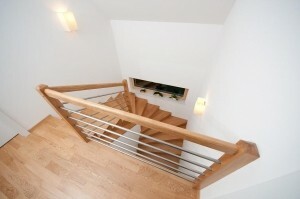 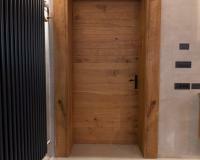 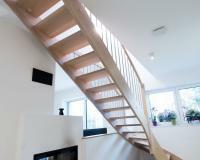 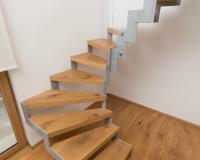 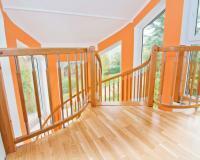 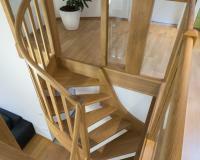 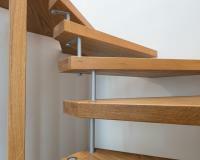 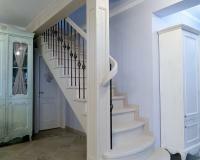 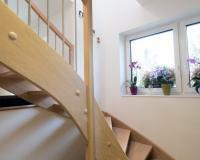 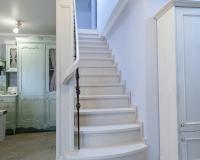 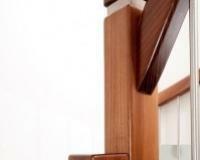 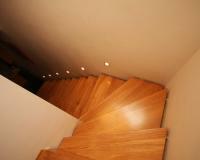 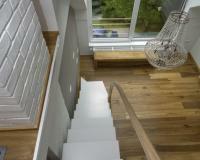 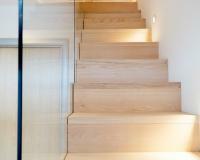 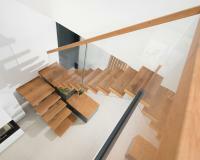 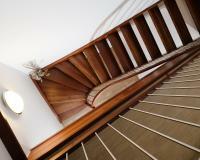 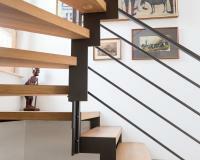 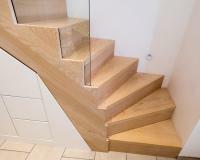 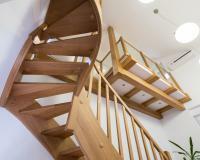 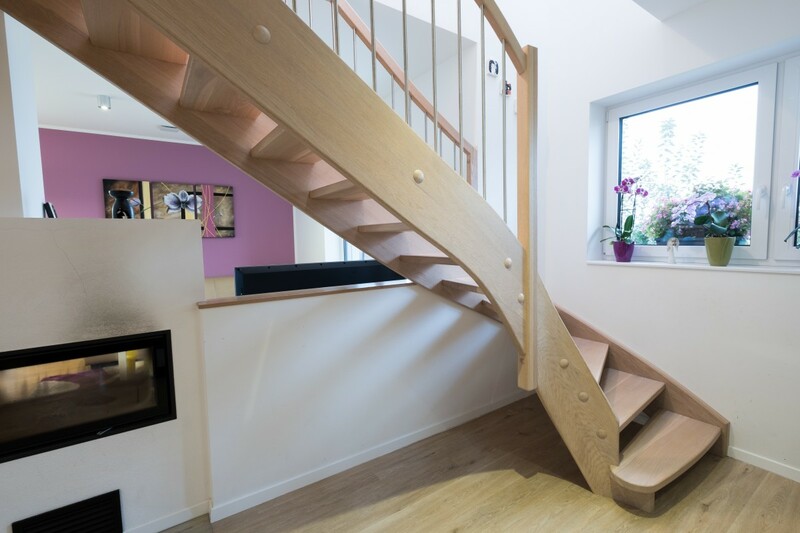 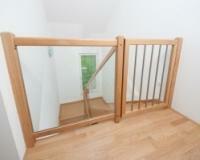 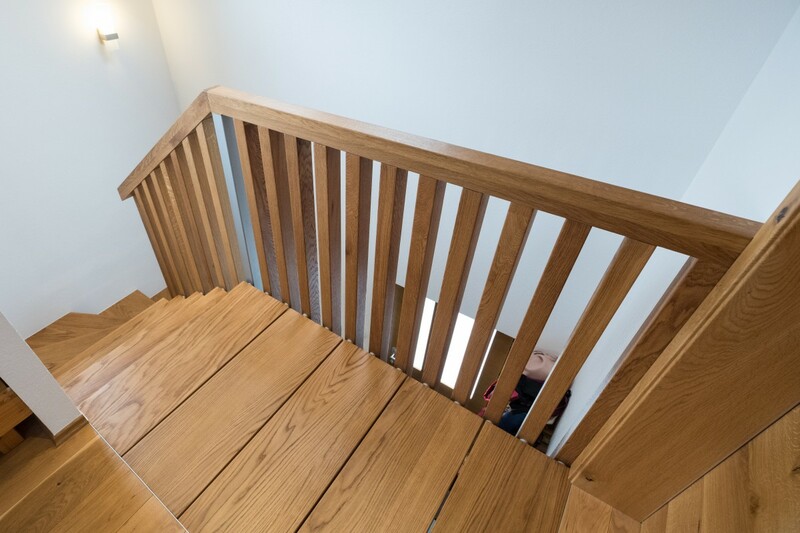 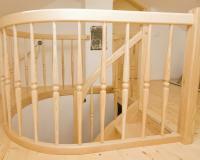 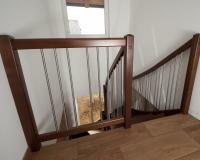 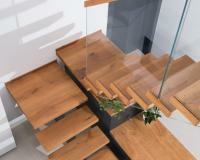 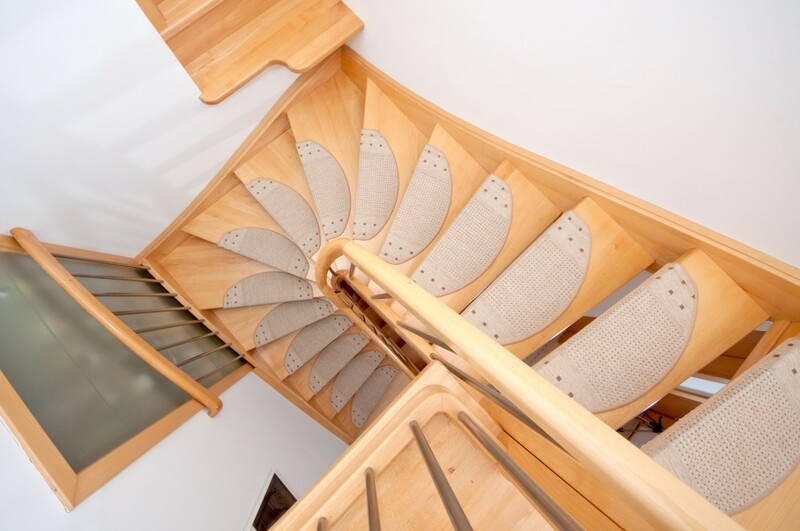 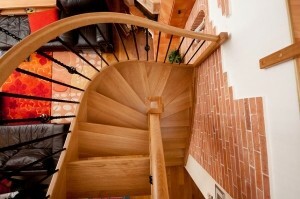 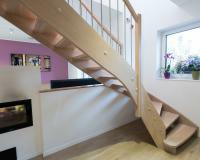 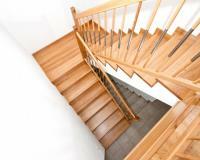 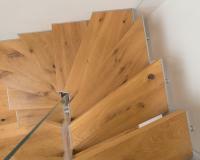 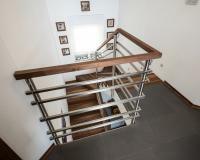 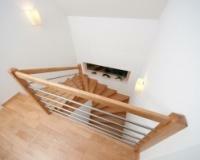 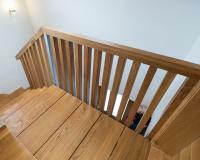 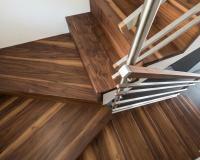 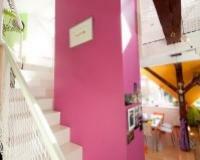 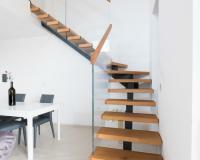 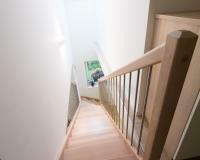 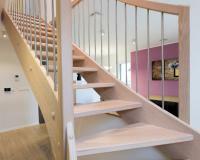 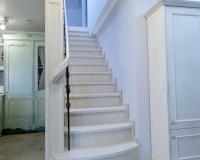 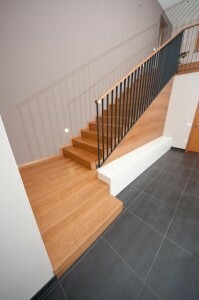 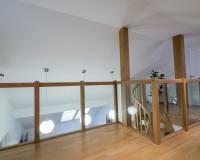 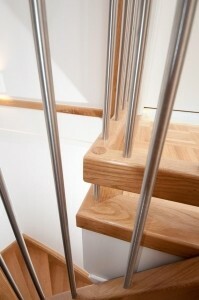 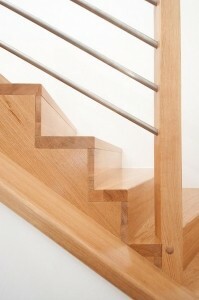 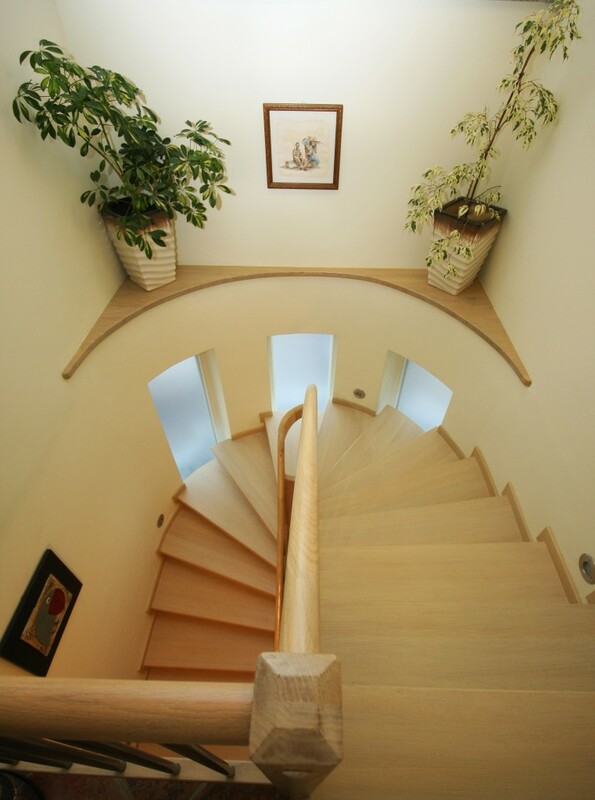 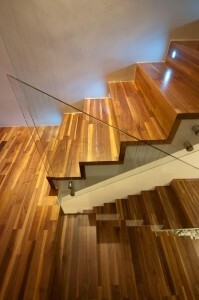 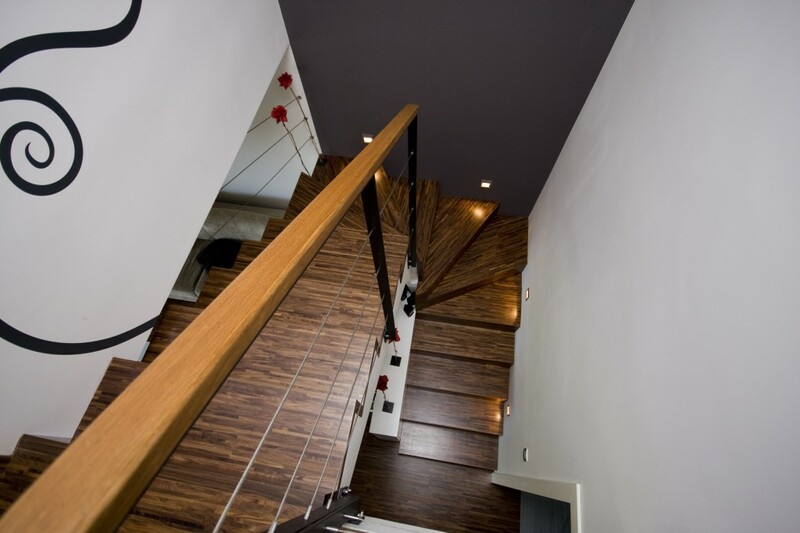 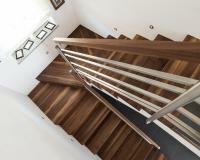 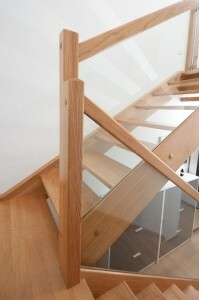 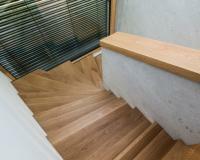 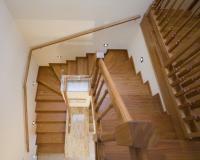 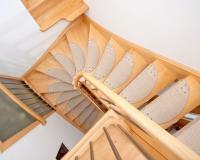 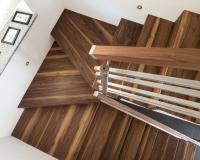 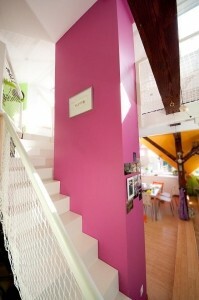 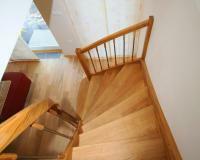 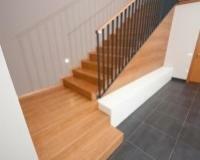 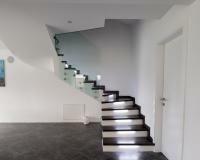 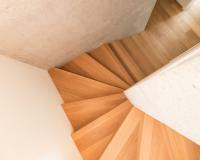 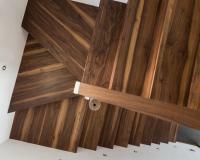 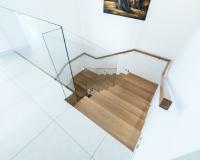 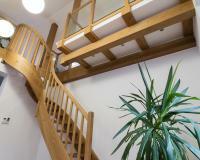 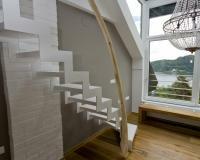 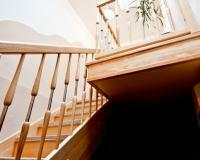 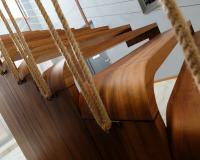 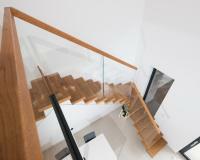 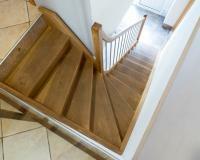 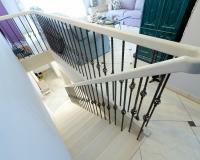 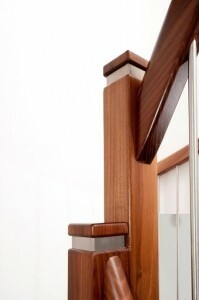 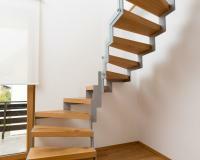 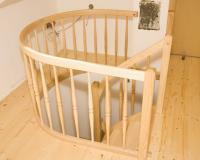 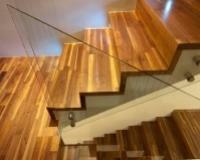 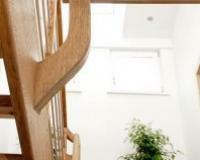 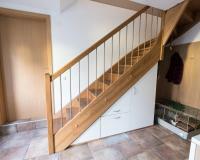 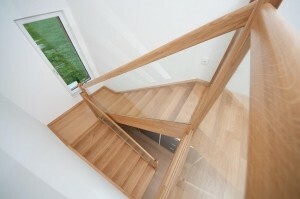 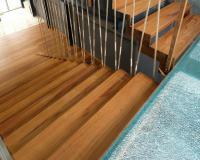 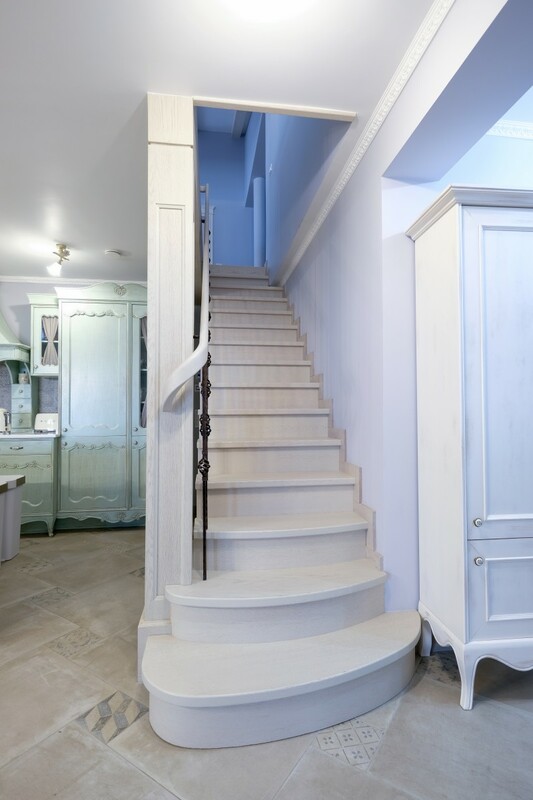 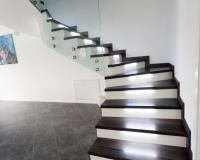 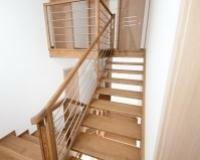 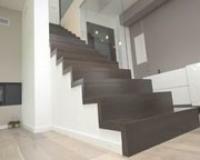 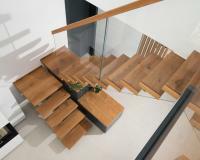 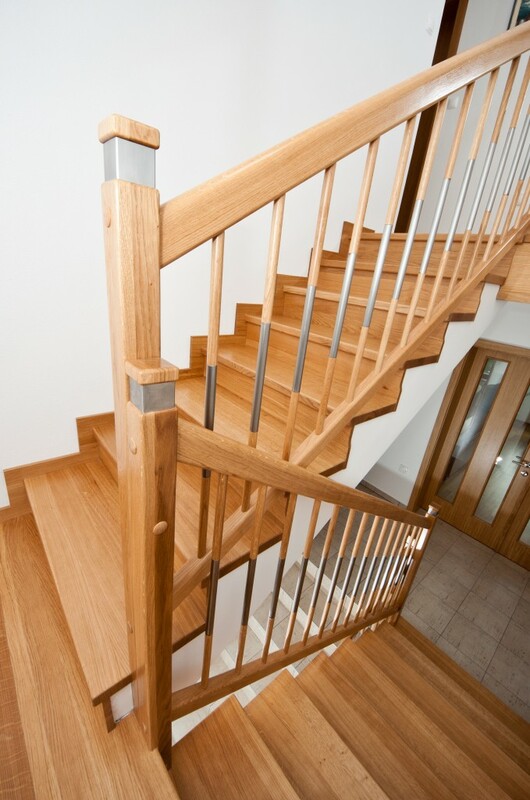 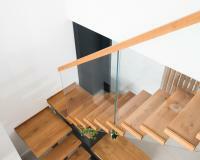 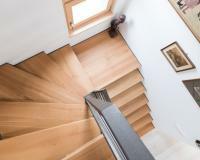 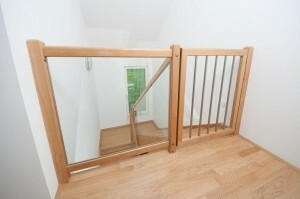 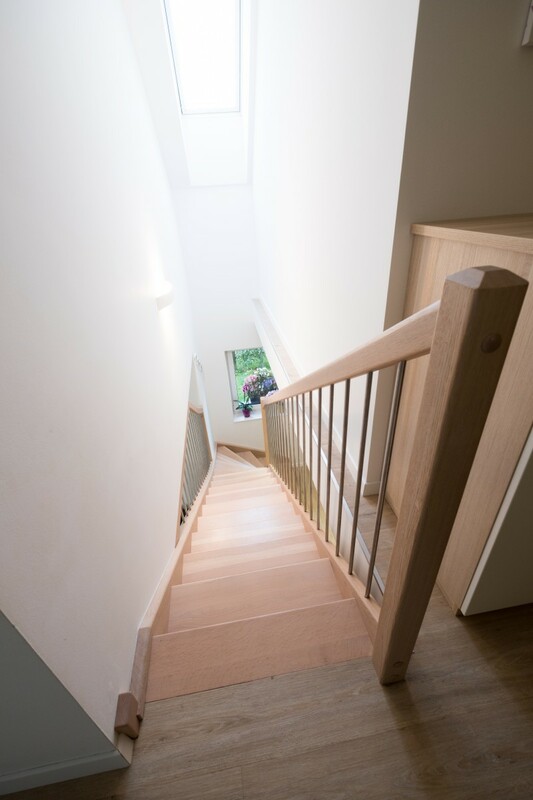 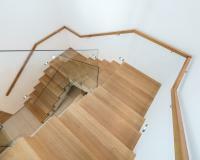 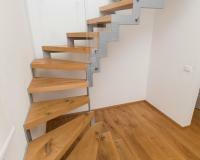 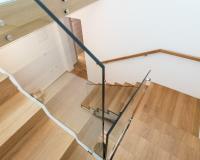 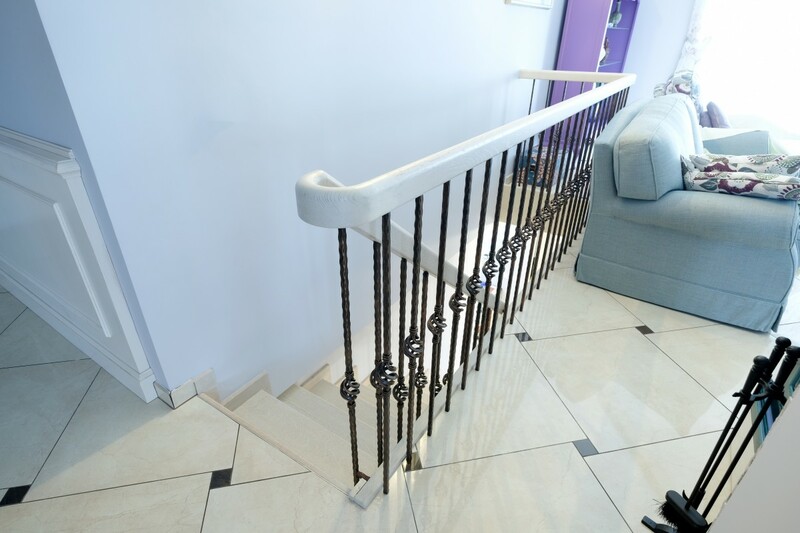 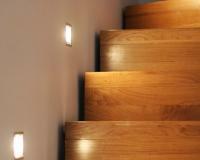 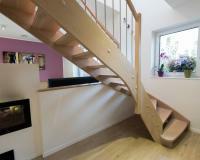 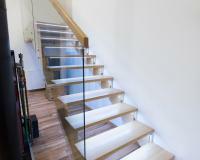 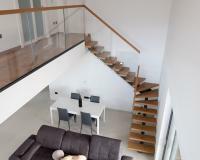 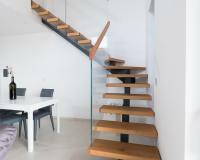 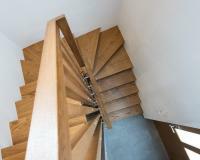 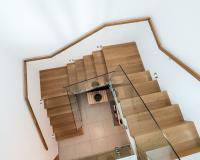 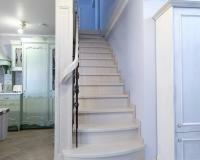 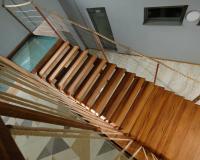 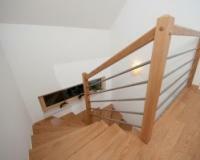 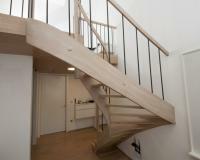 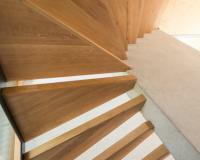 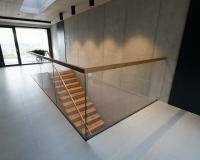 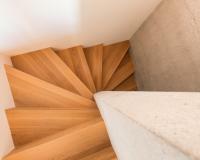 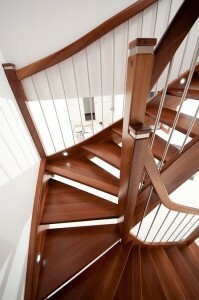 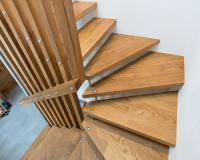 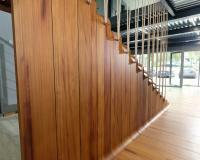 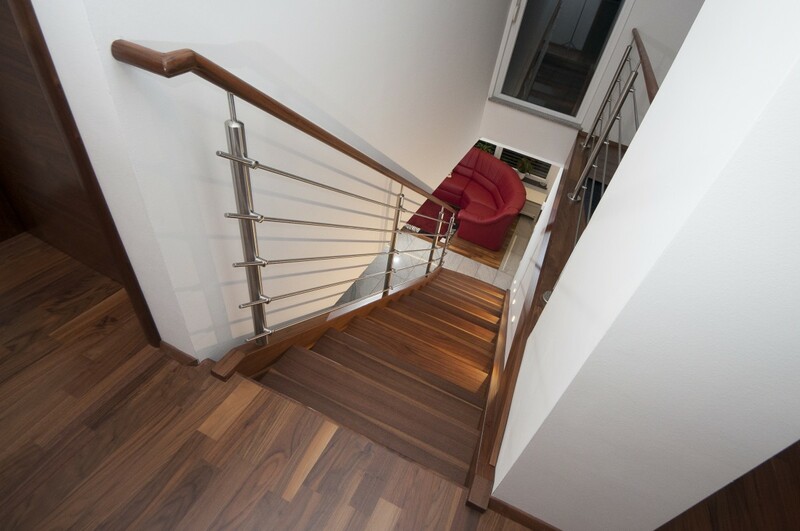 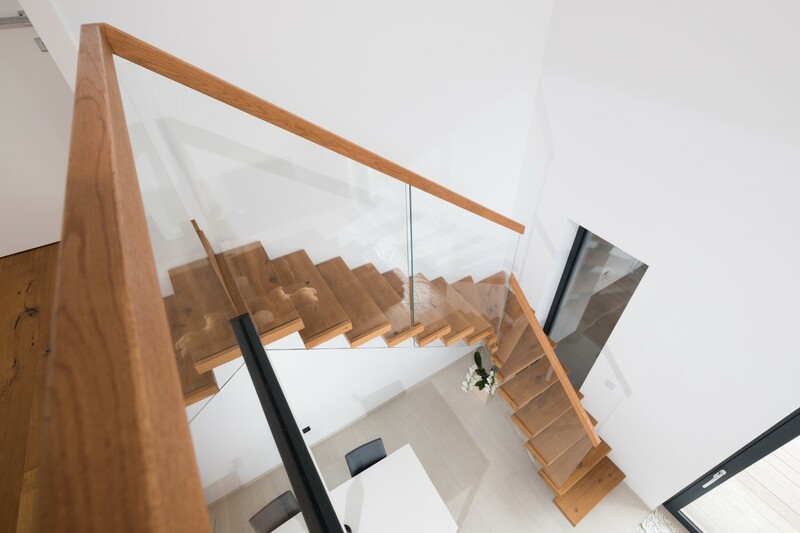 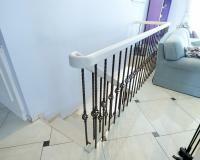 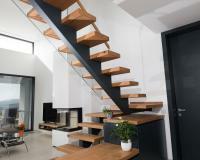 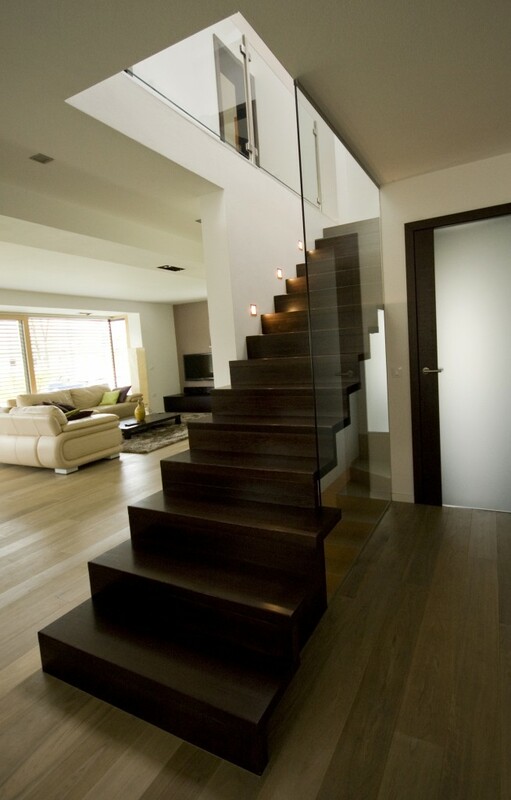 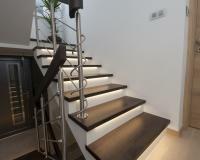 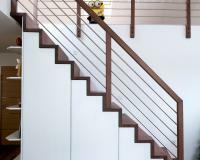 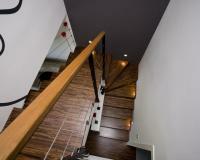 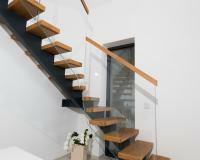 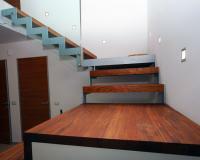 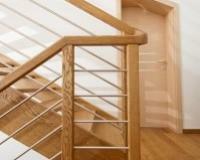 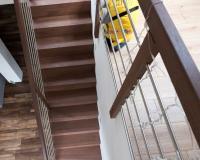 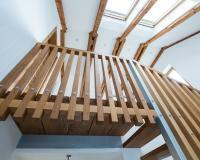 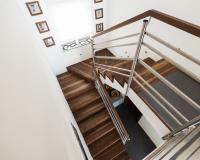 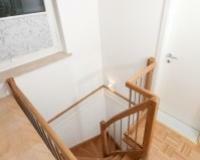 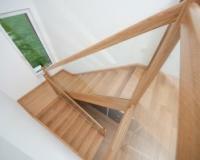 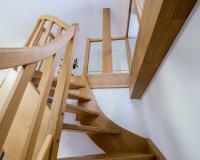 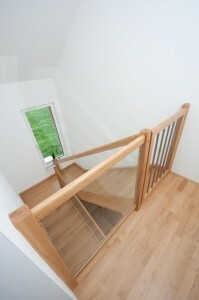 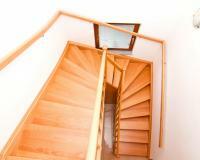 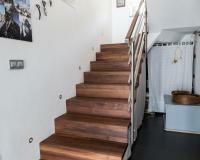 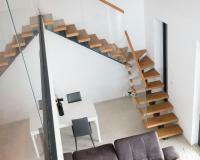 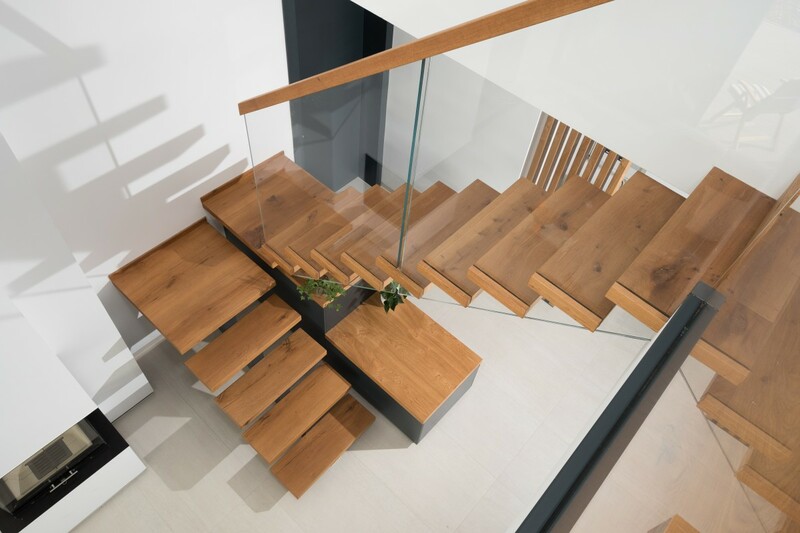 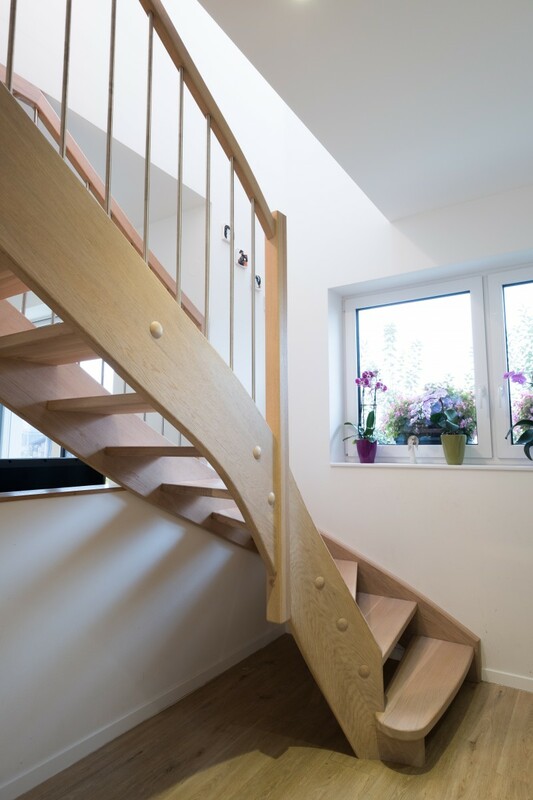 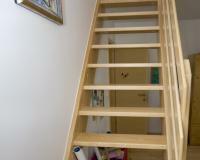 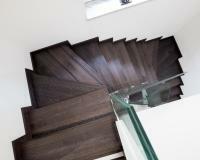 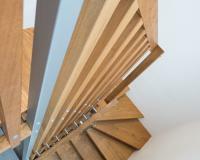 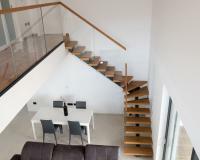 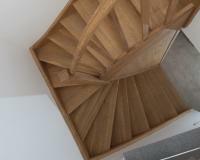 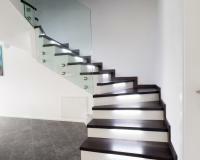 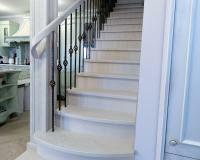 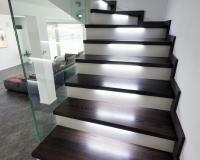 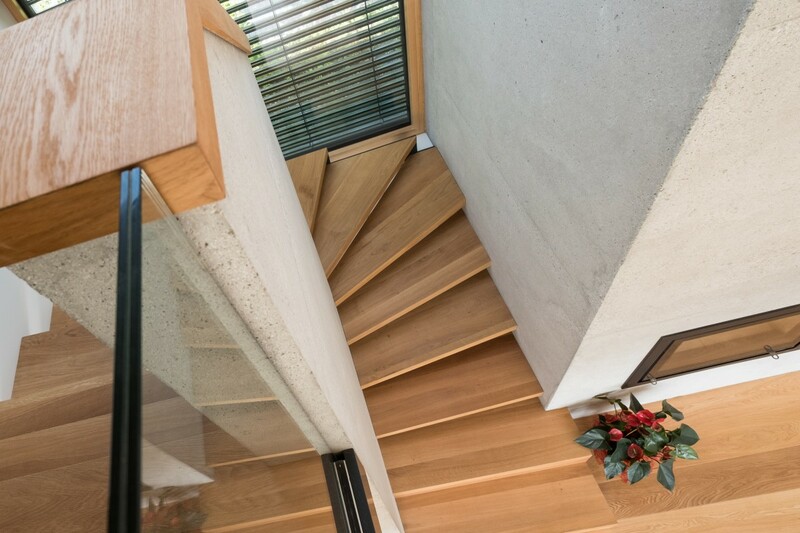 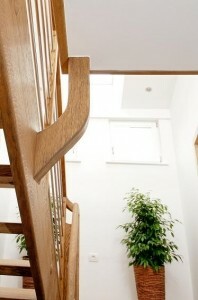 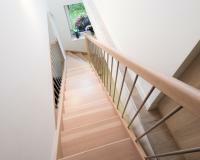 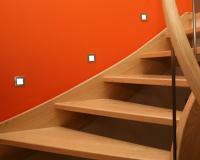 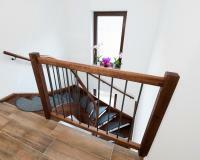 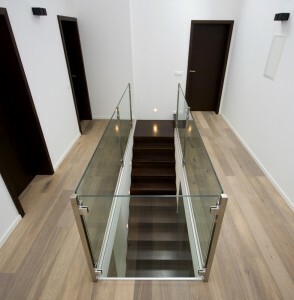 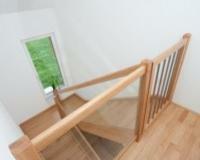 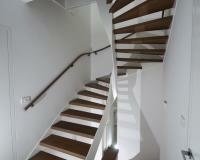 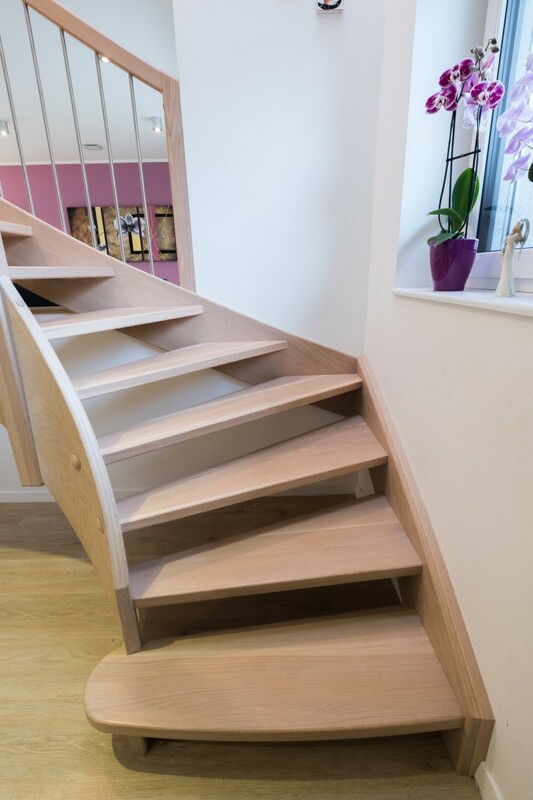 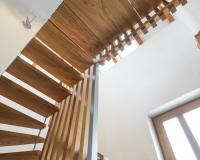 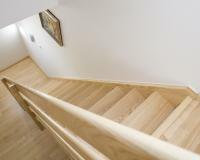 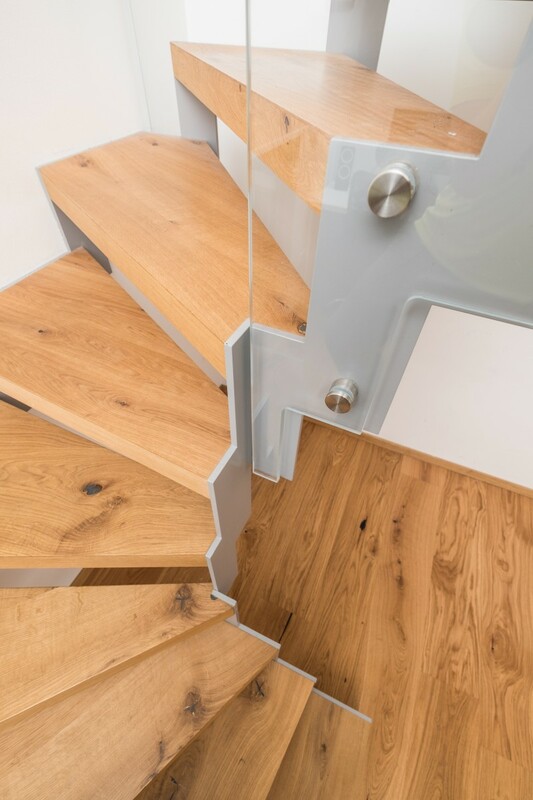 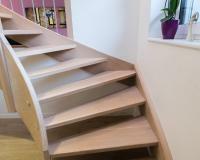 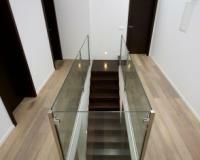 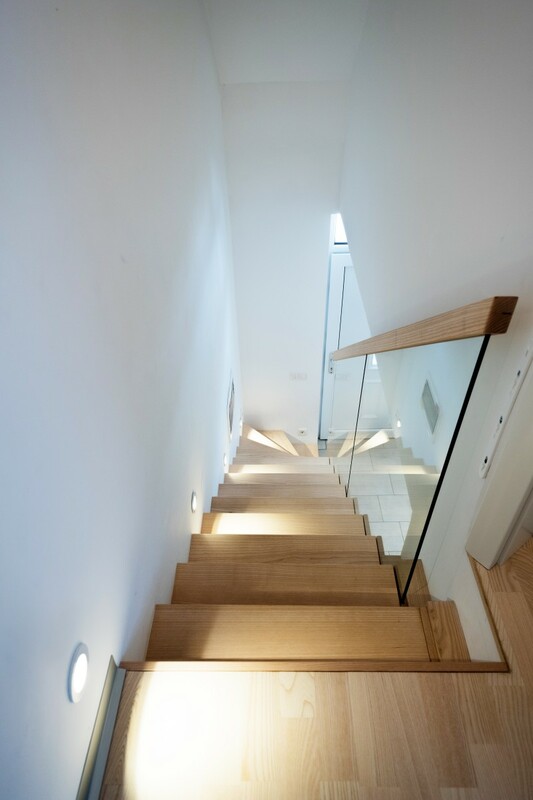 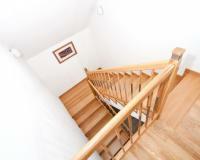 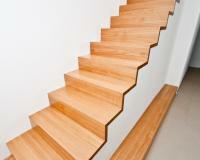 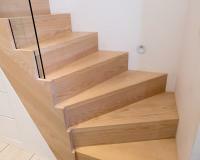 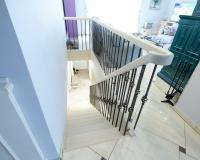 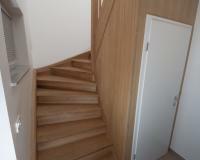 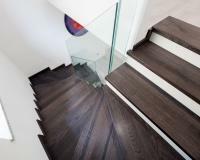 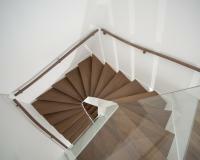 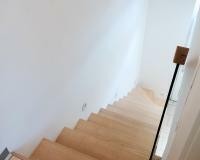 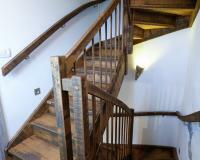 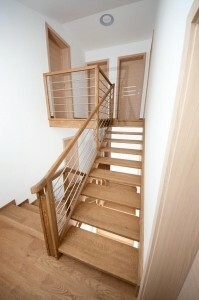 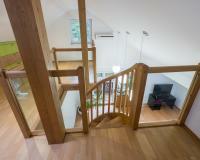 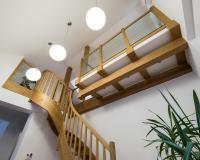 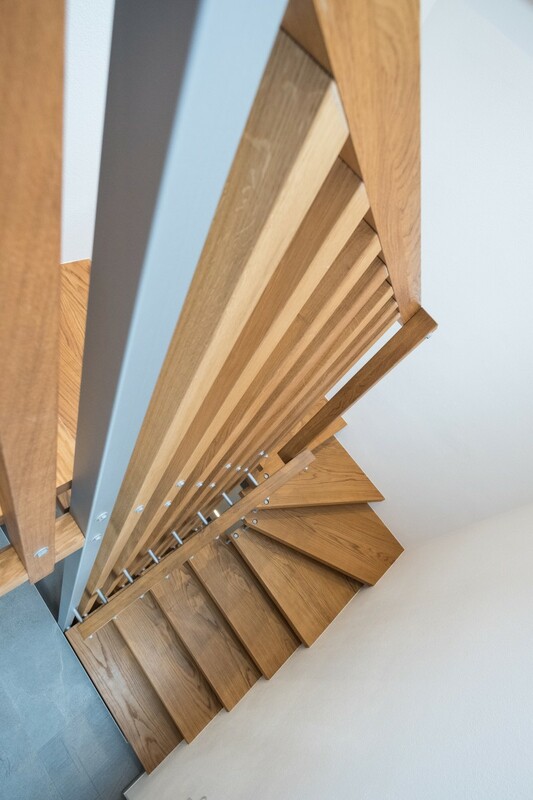 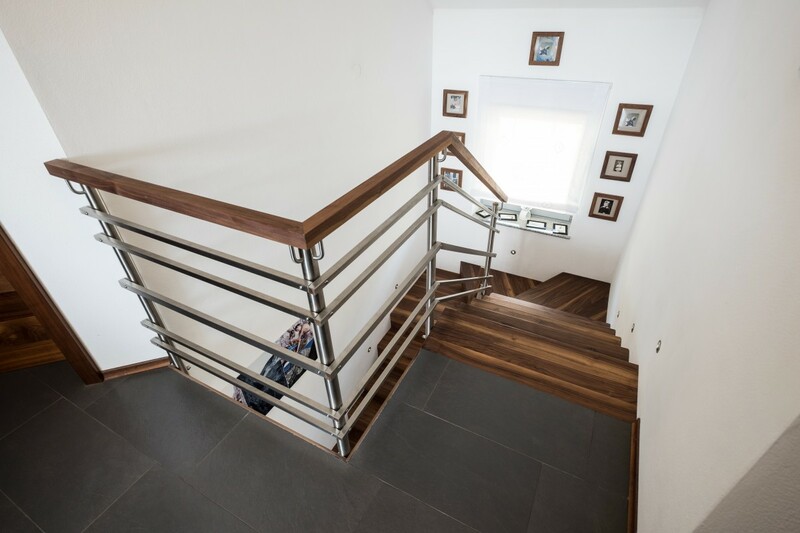 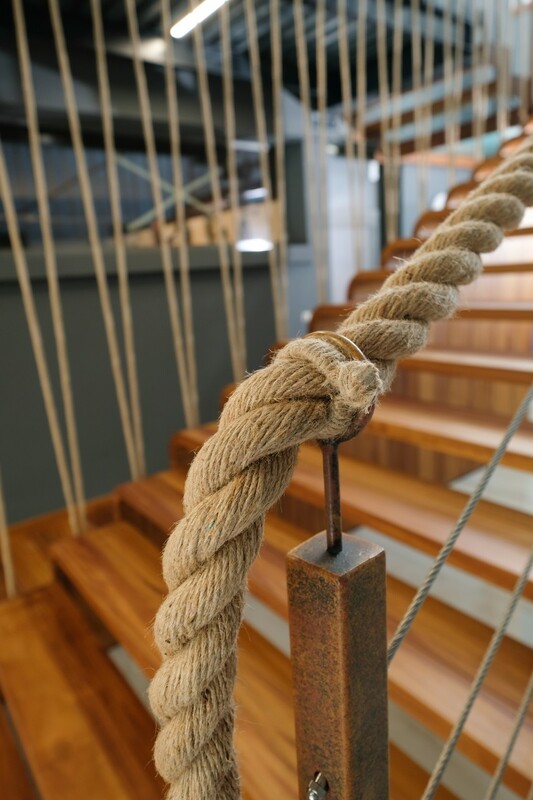 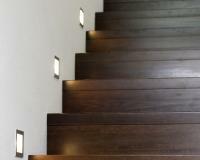 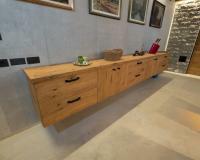 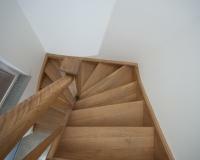 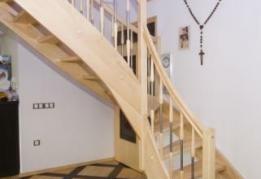 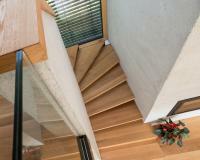 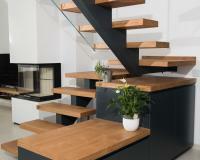 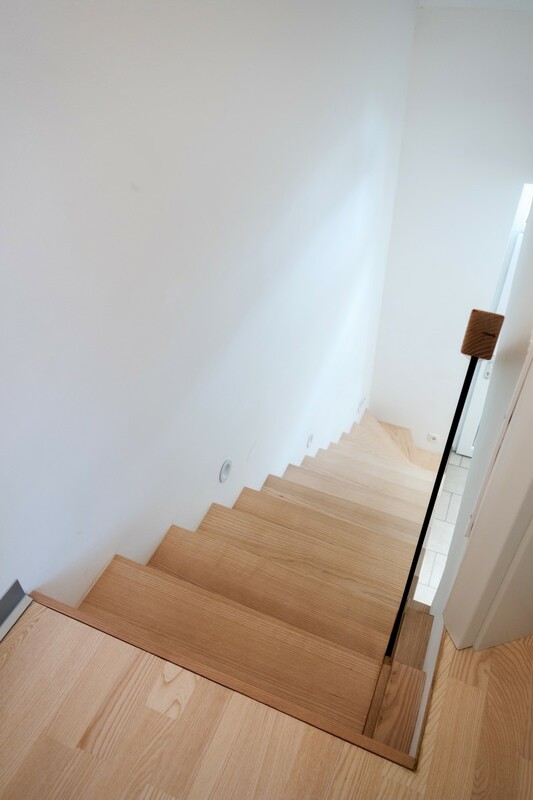 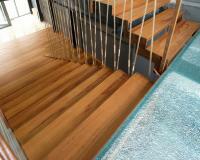 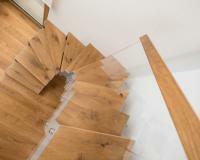 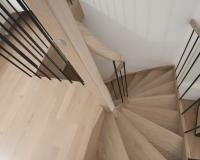 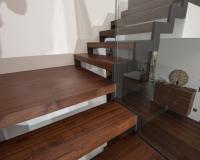 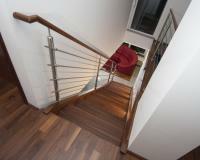 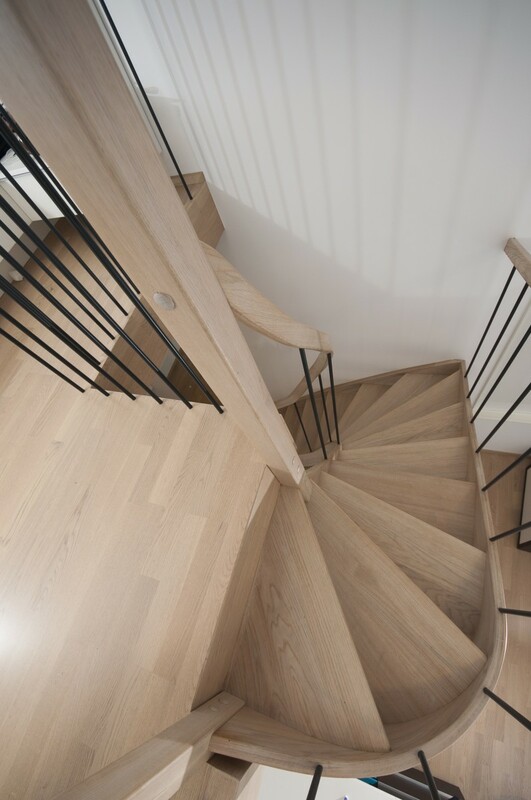 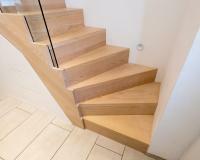 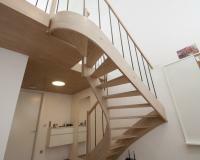 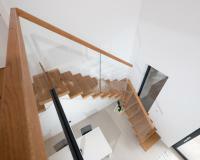 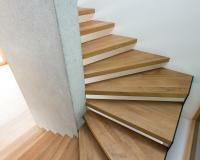 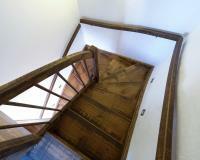 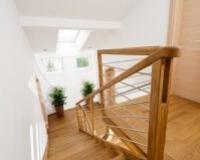 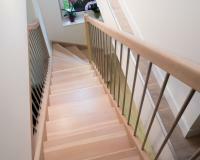 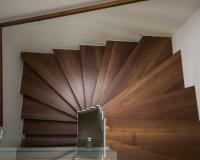 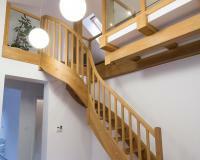 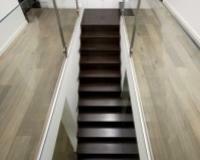 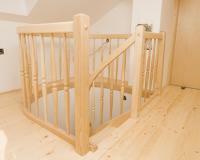 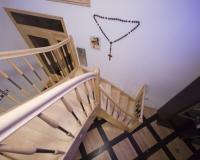 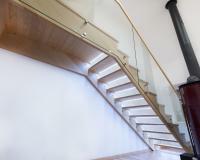 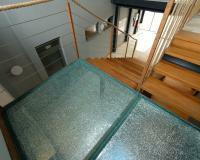 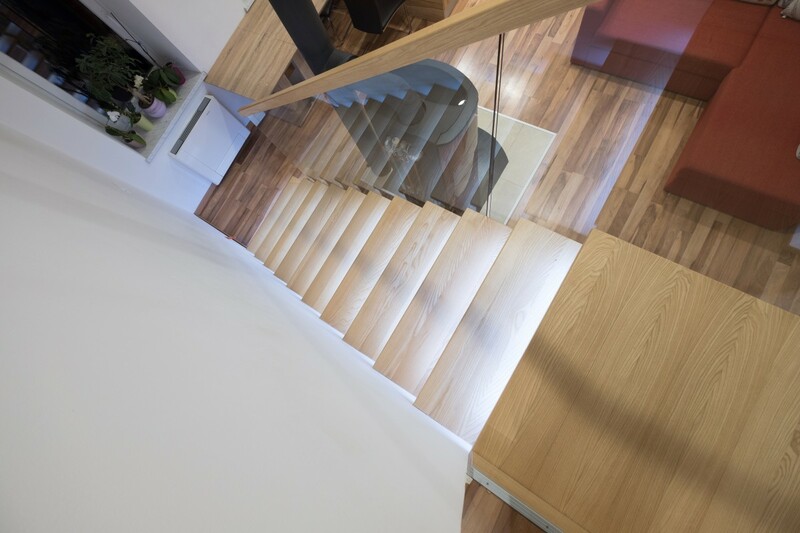 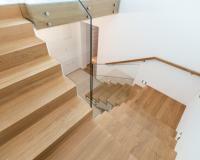 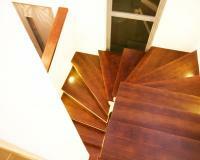 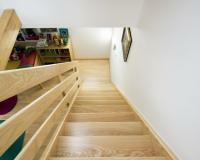 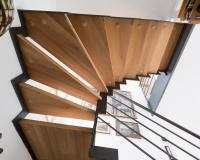 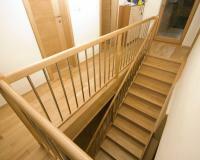 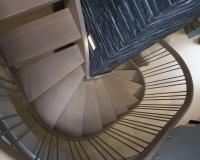 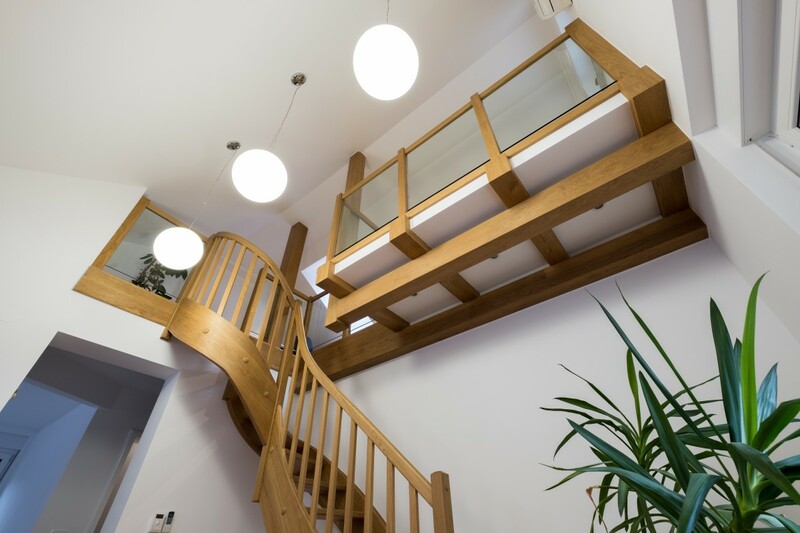 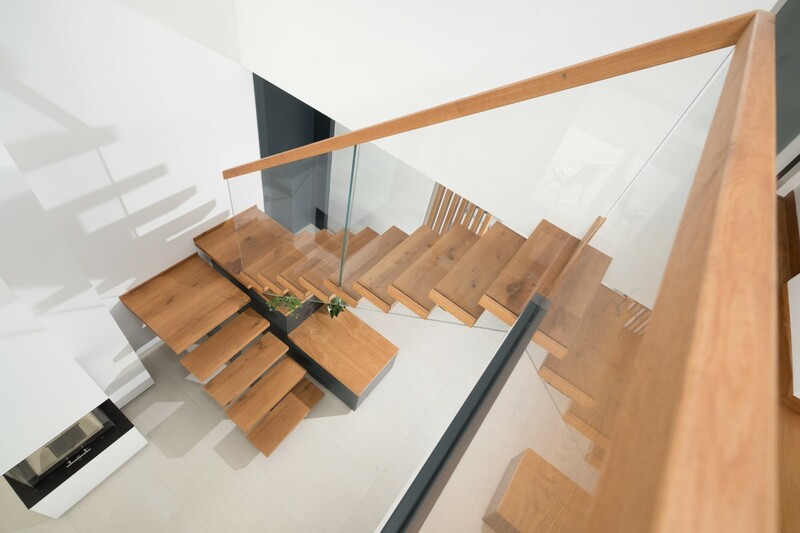 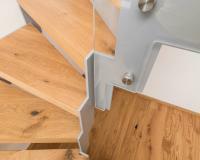 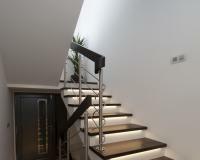 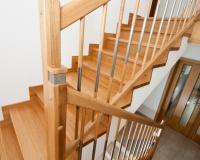 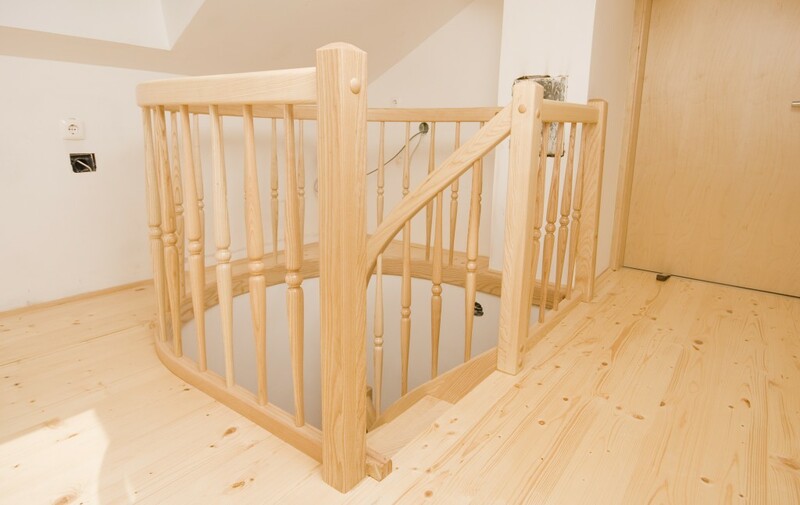 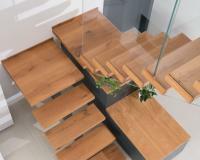 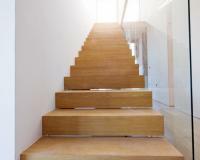 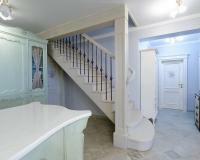 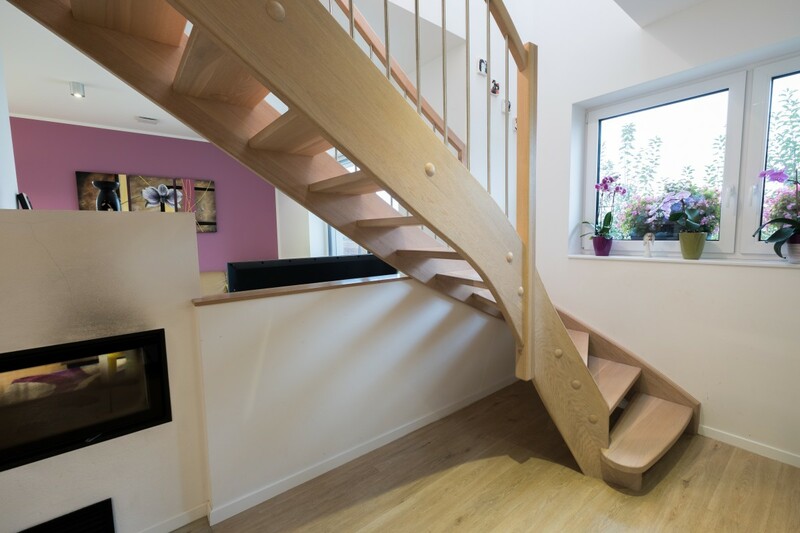 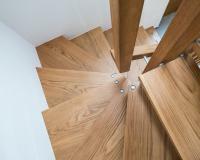 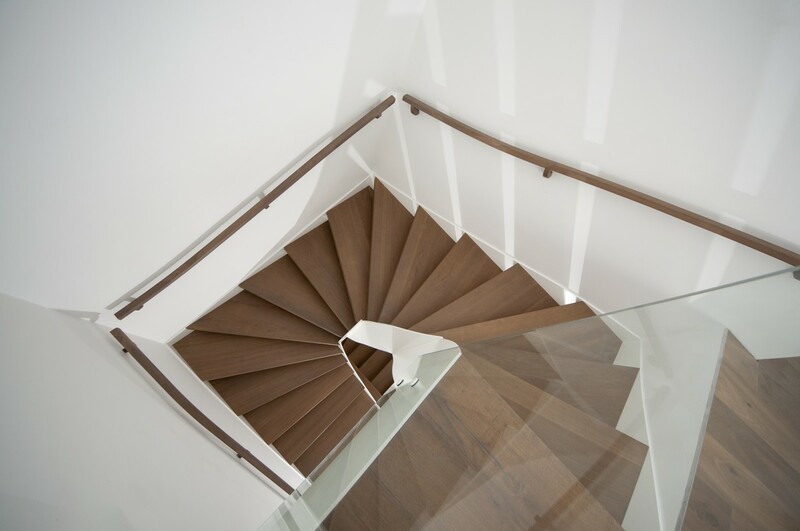 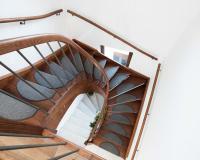 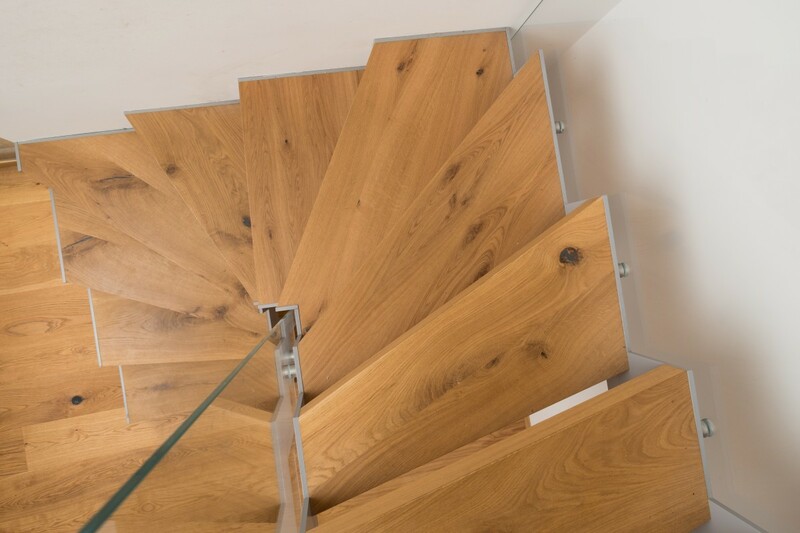 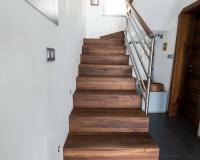 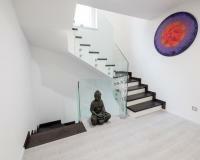 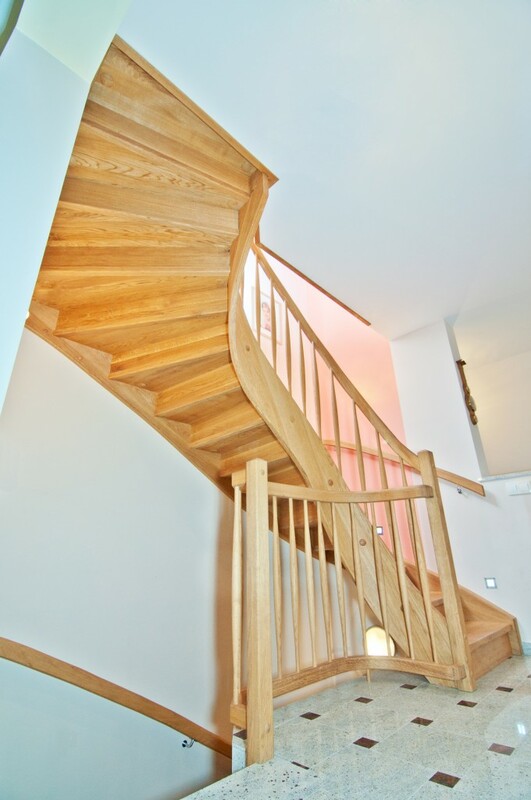 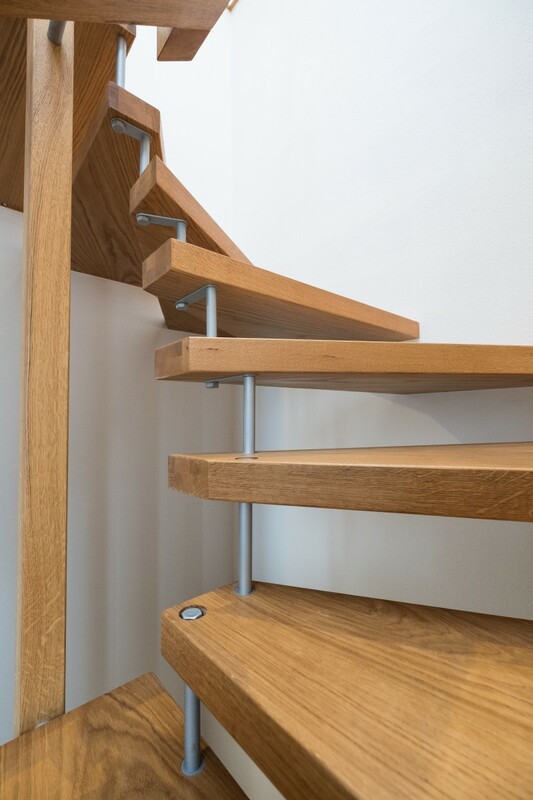 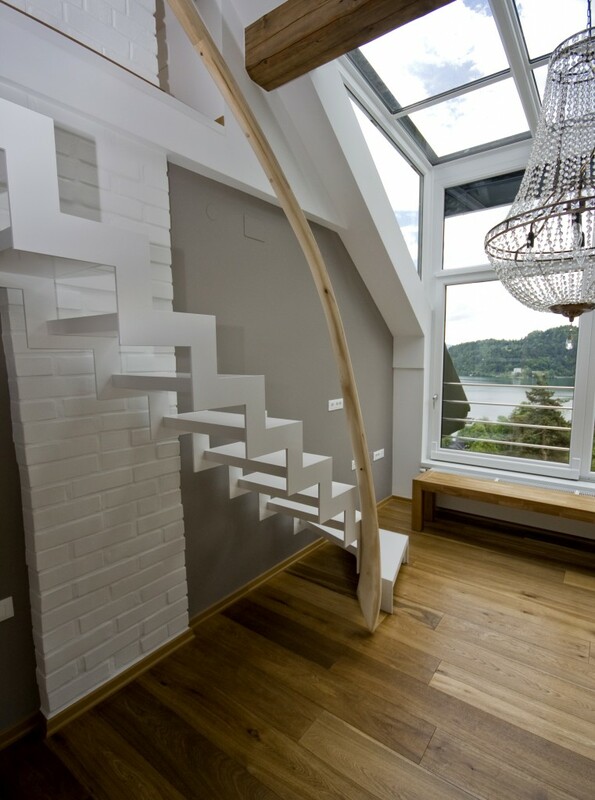 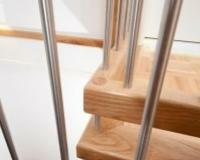 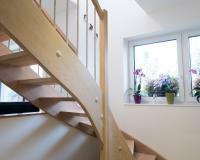 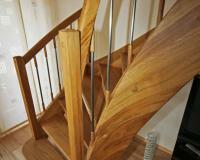 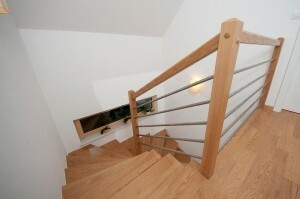 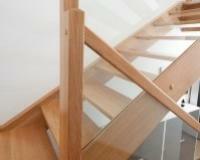 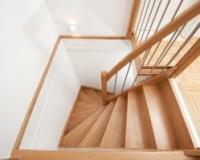 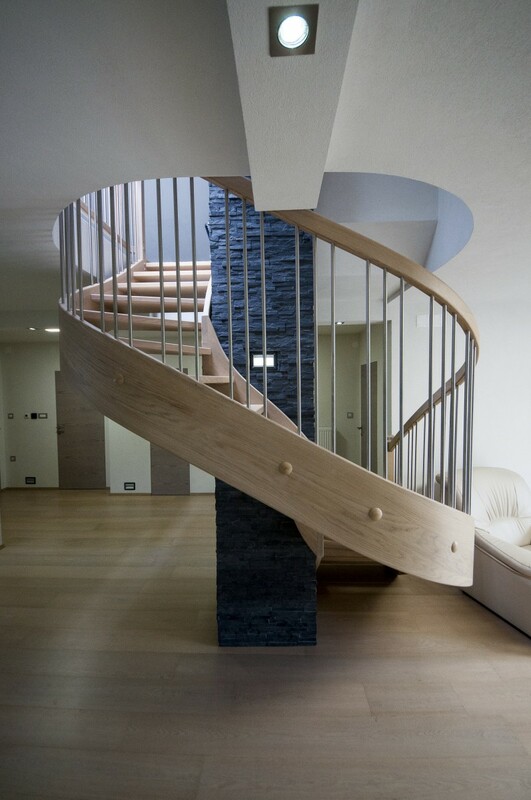 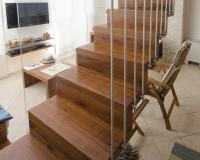 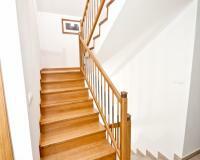 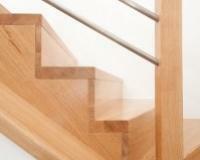 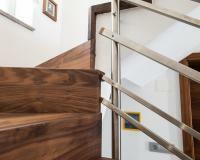 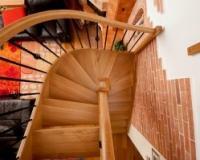 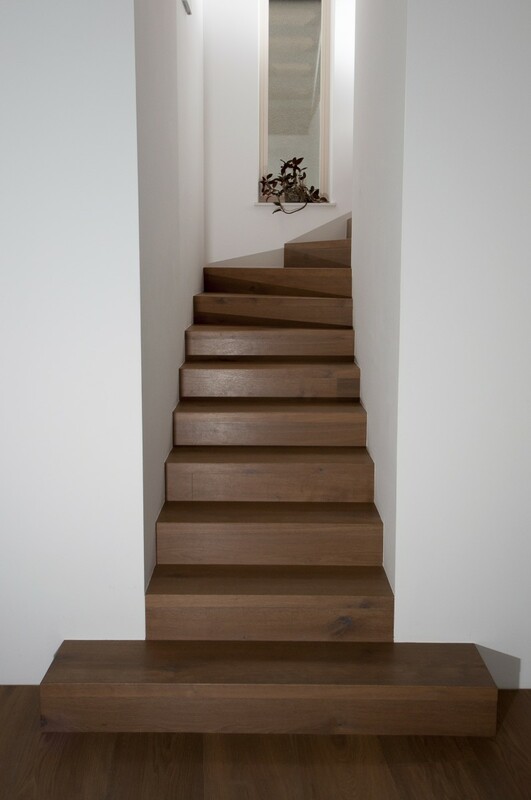 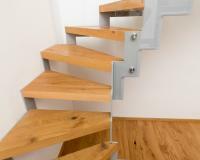 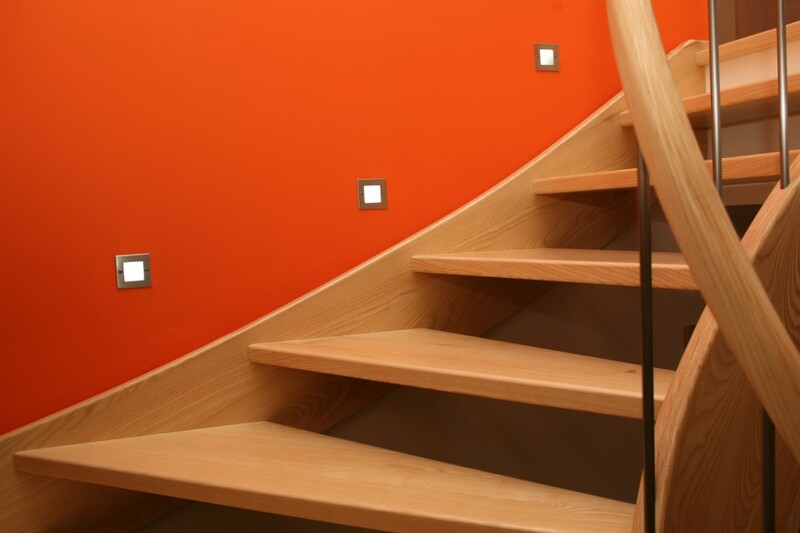 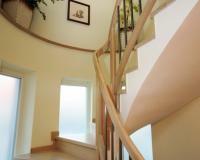 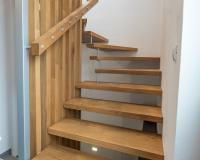 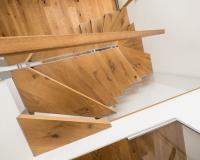 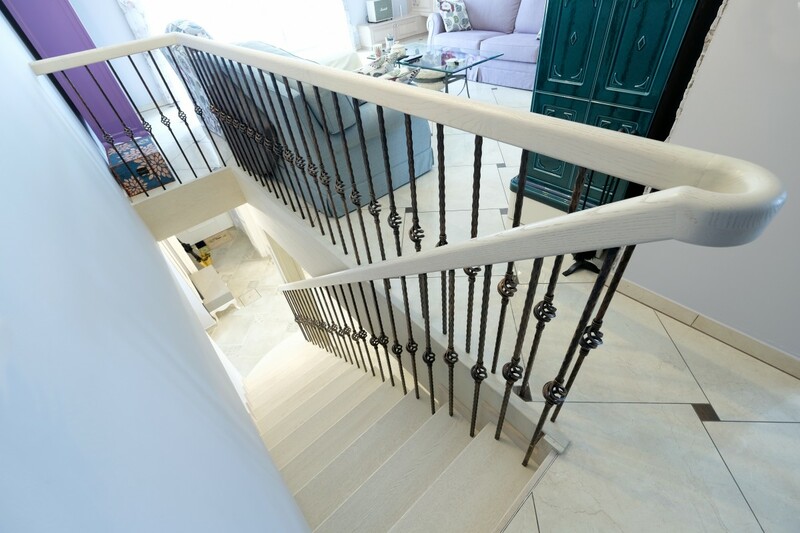 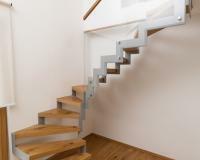 A quality service for customised stairs for your home. 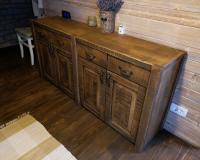 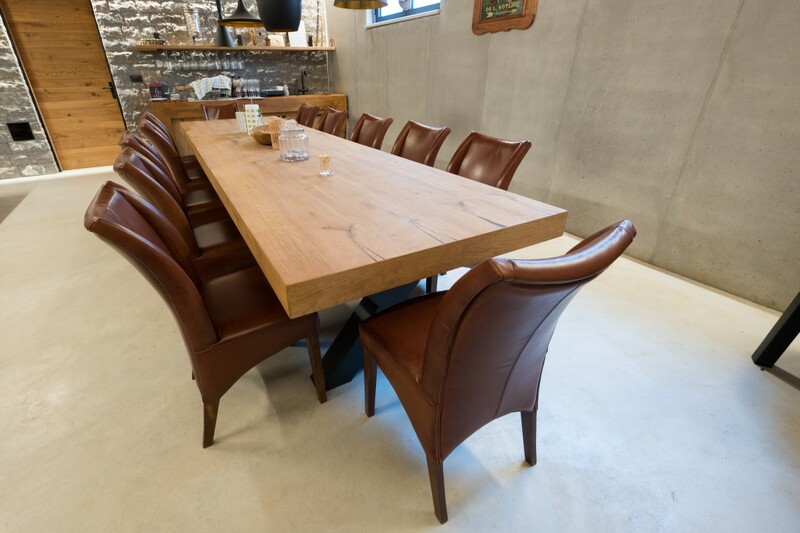 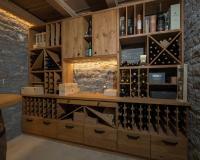 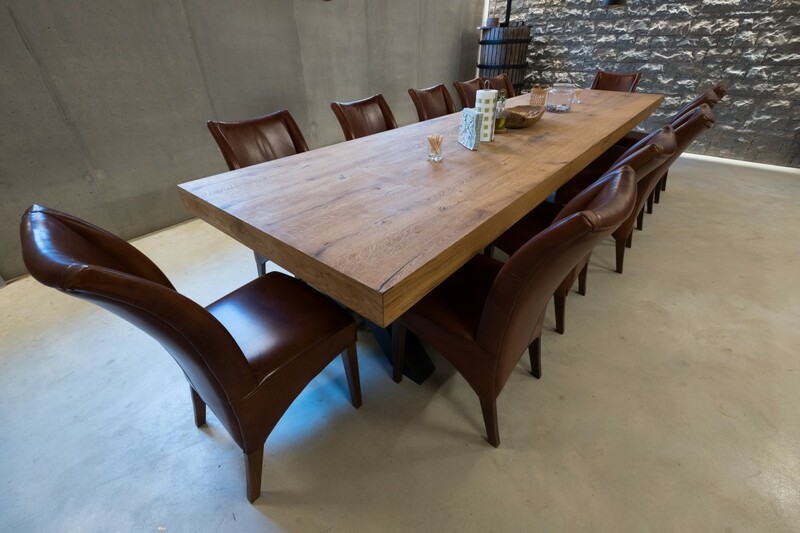 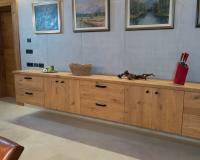 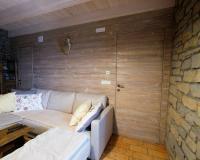 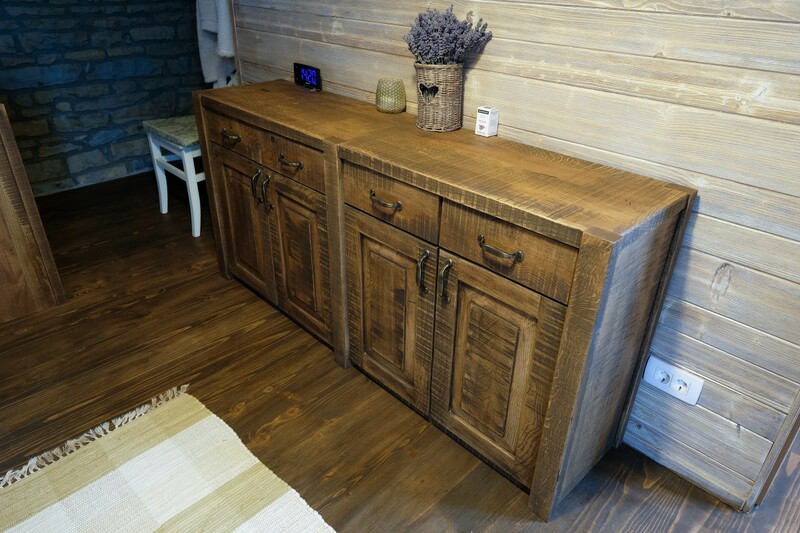 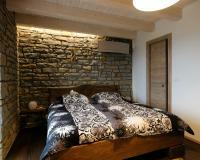 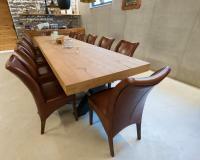 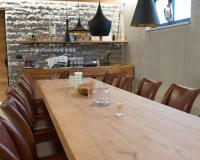 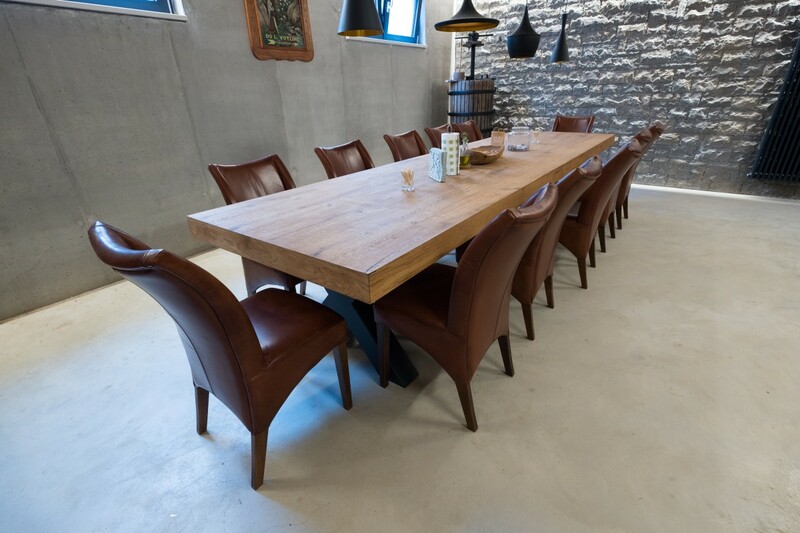 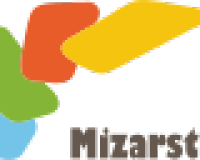 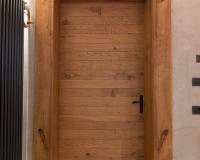 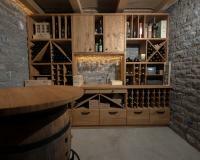 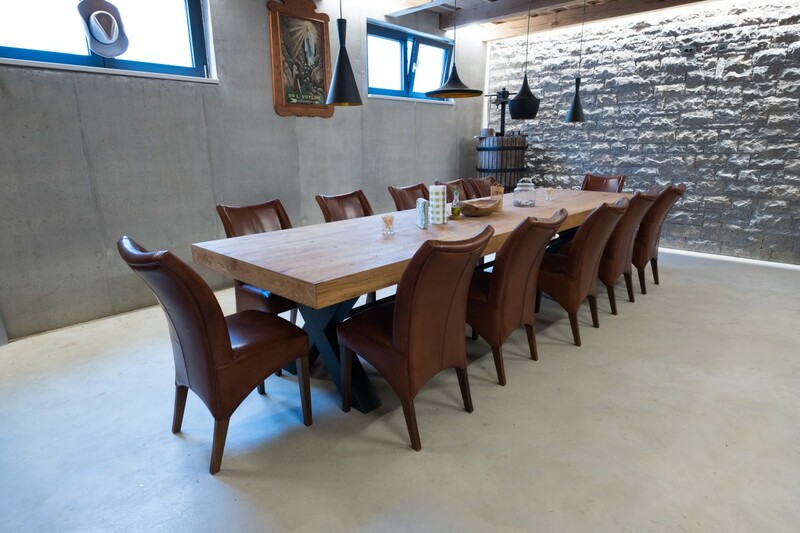 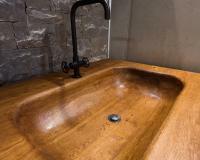 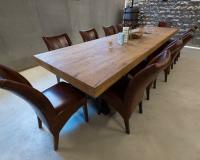 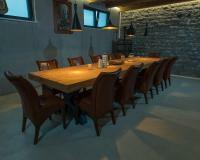 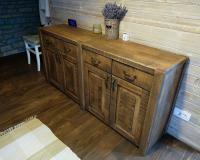 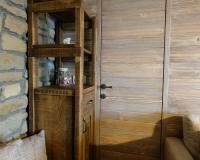 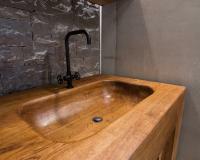 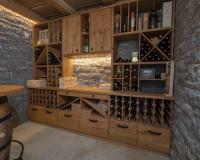 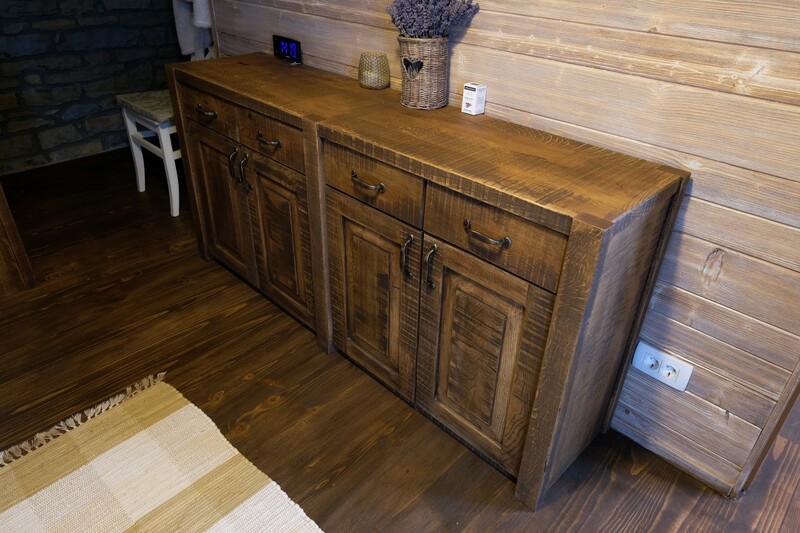 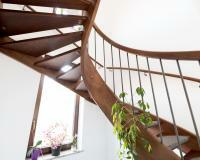 Mizarstvo Kunc is a family company with twenty years of experience! 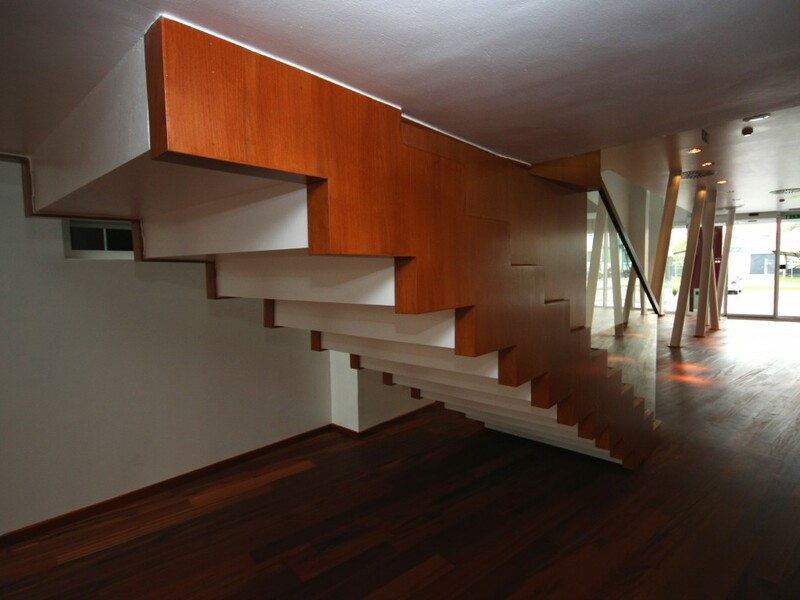 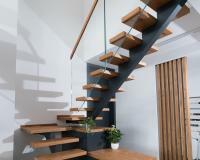 in making modern stairs for every home. 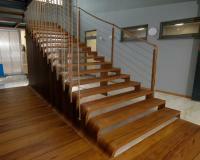 Why choose the Kunc stairs? 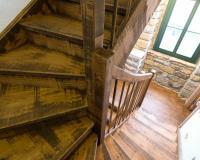 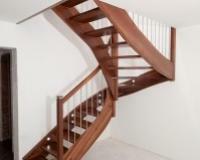 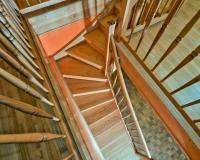 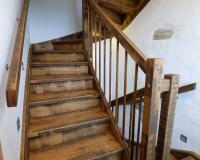 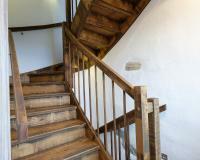 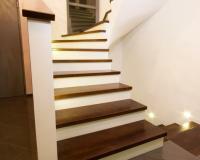 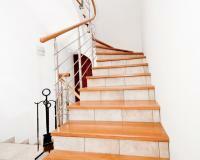 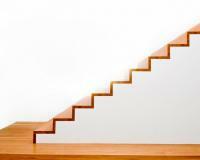 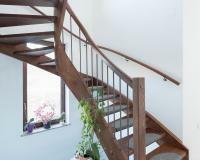 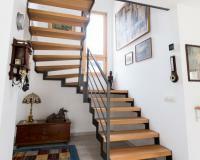 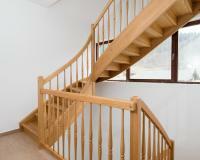 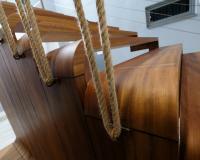 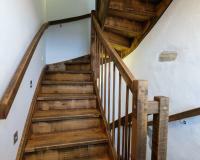 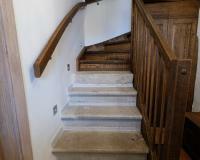 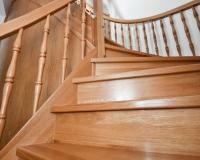 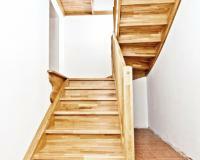 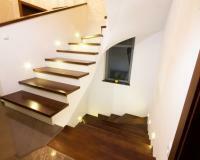 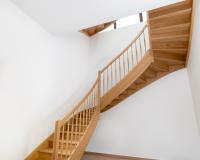 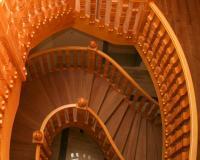 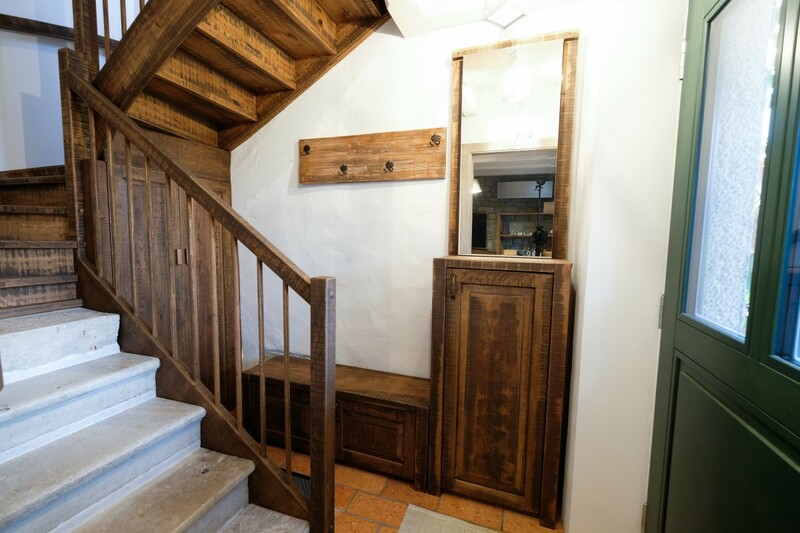 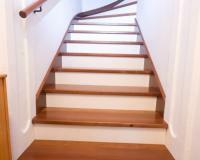 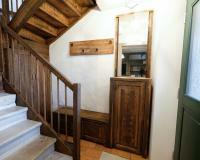 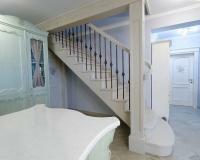 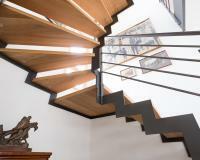 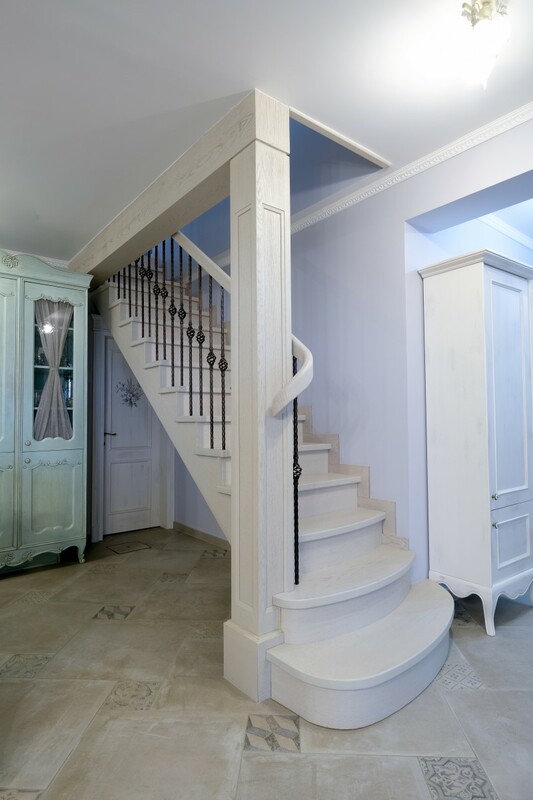 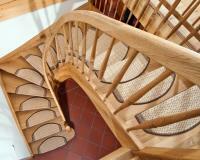 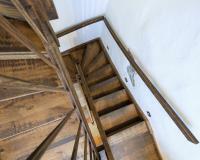 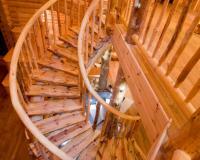 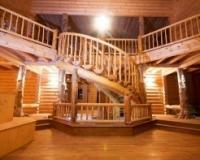 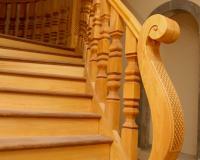 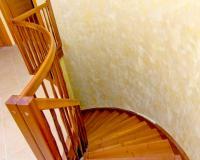 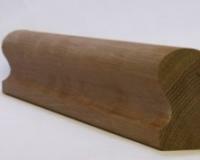 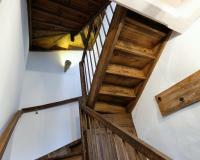 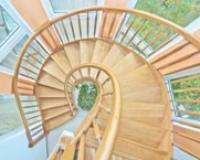 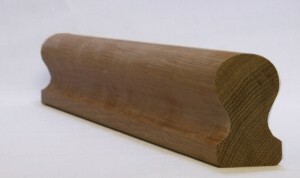 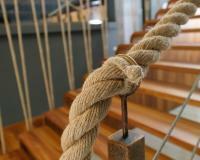 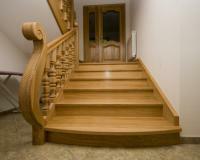 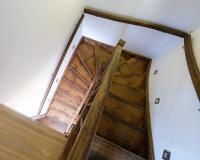 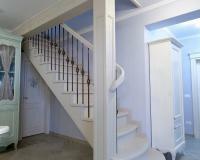 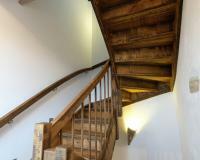 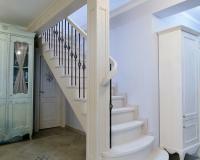 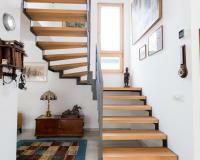 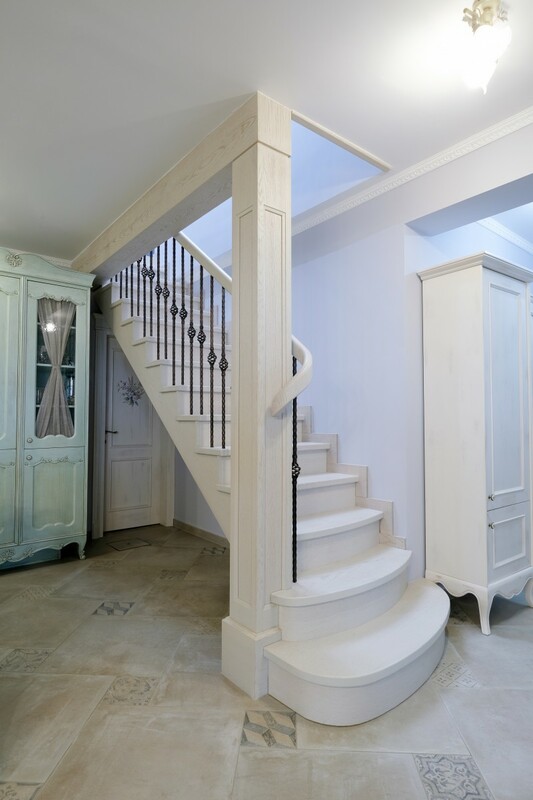 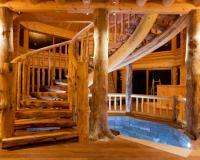 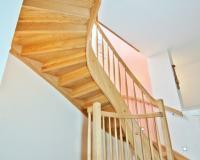 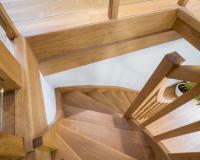 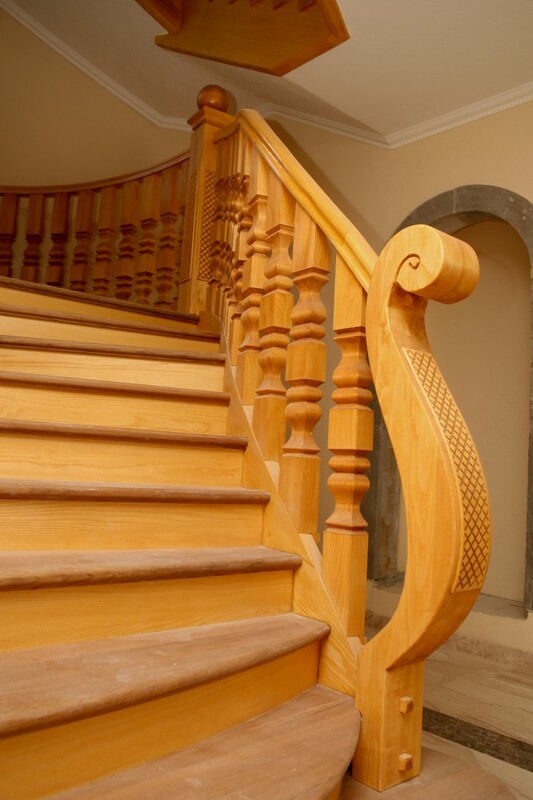 Classic staircases made of solid wood of all kinds of form, from the flat ones to 90-, 180-, 270-, or 380-degree ones. 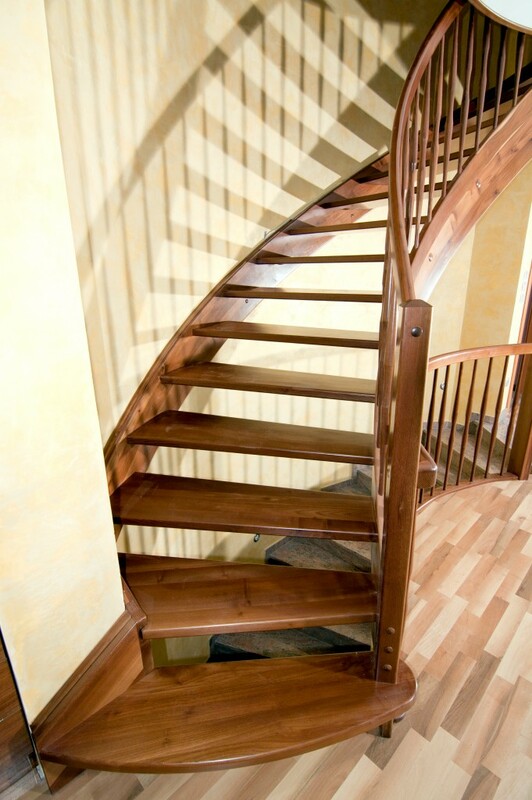 Unique curved staircases that are made in all possible variants add a beautiful and holistic look to your home. 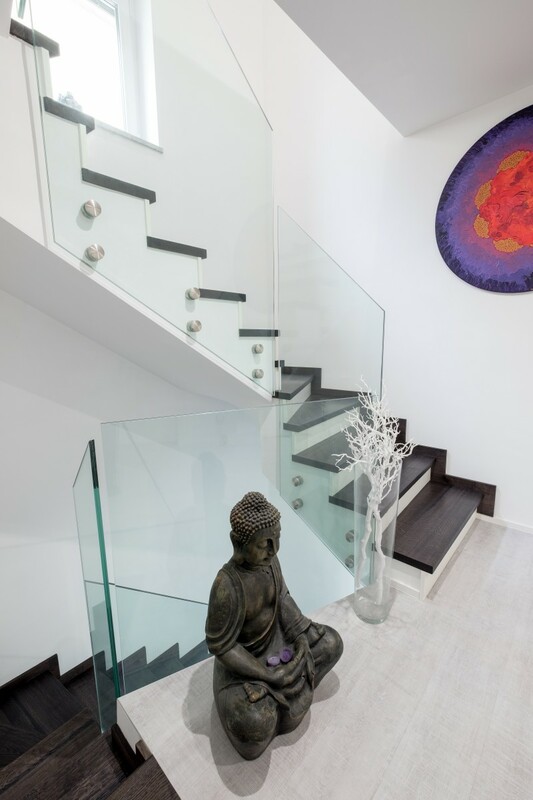 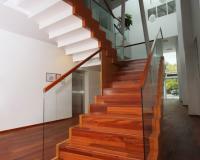 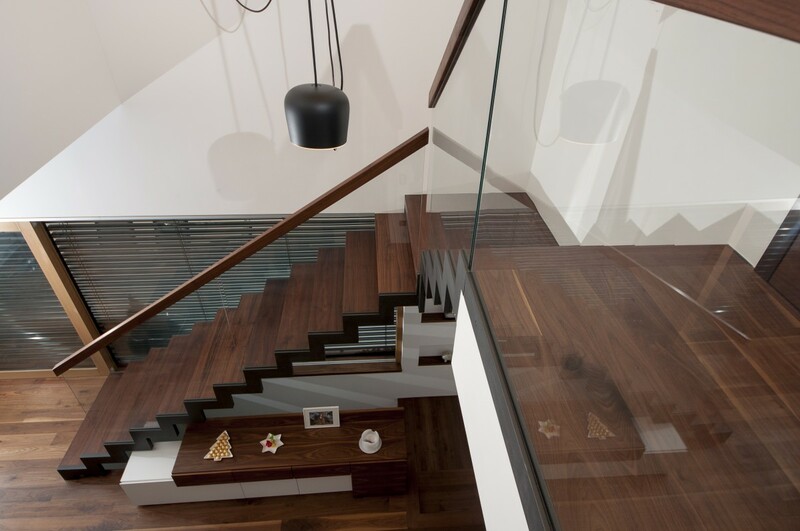 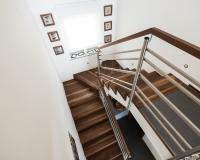 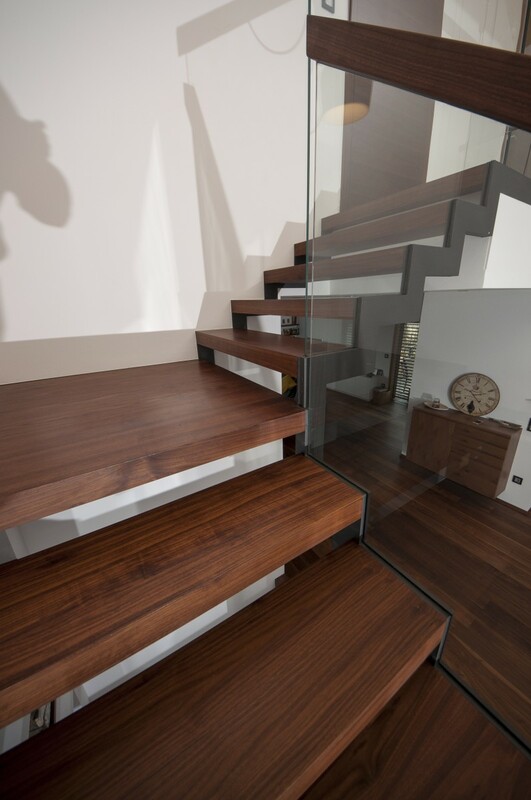 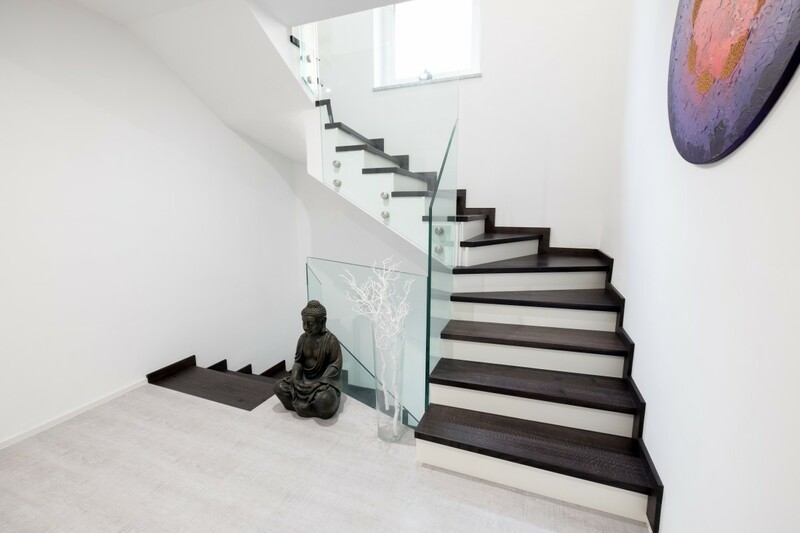 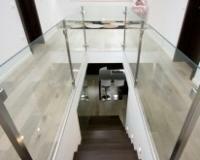 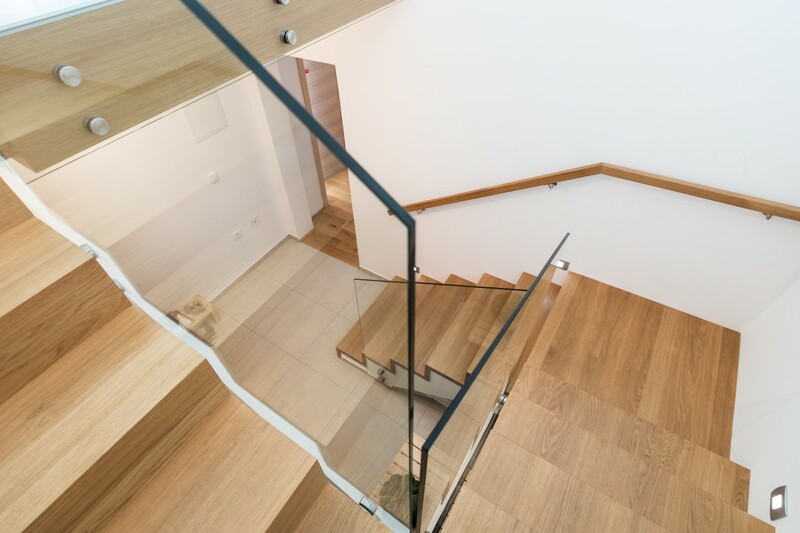 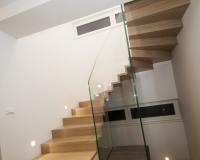 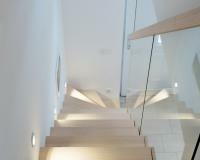 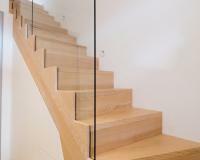 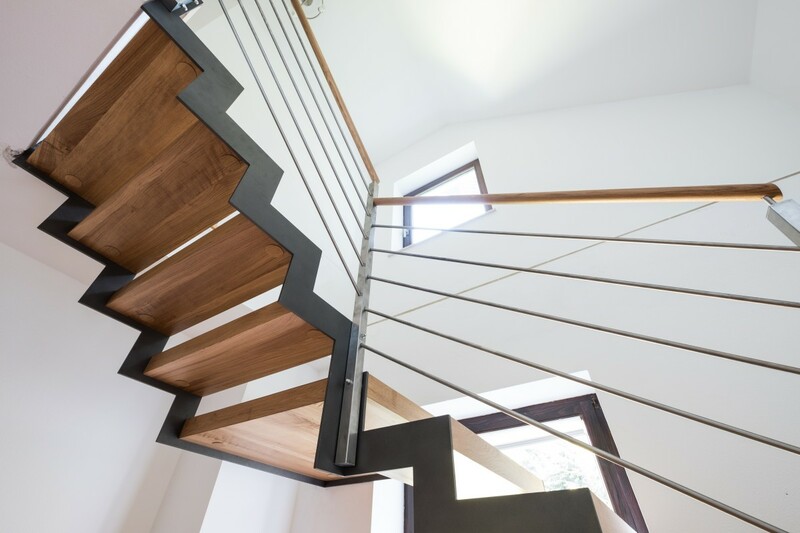 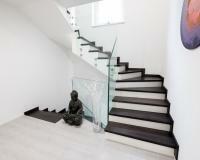 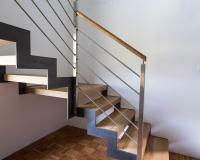 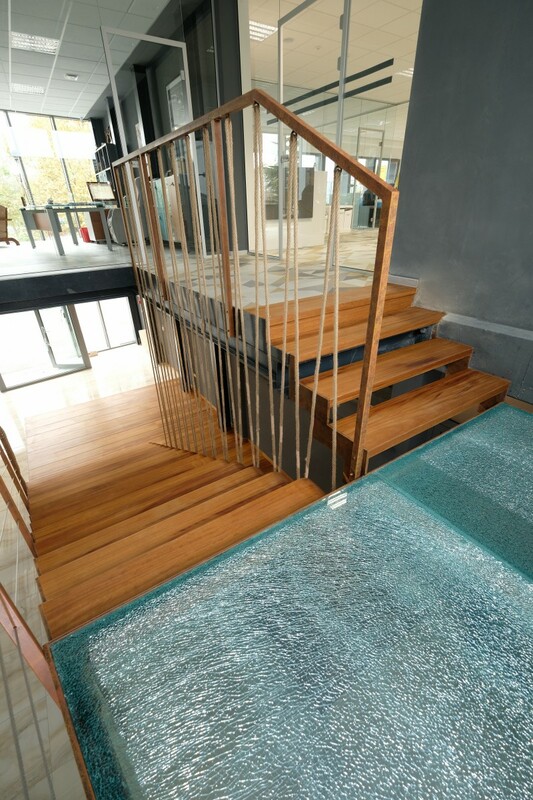 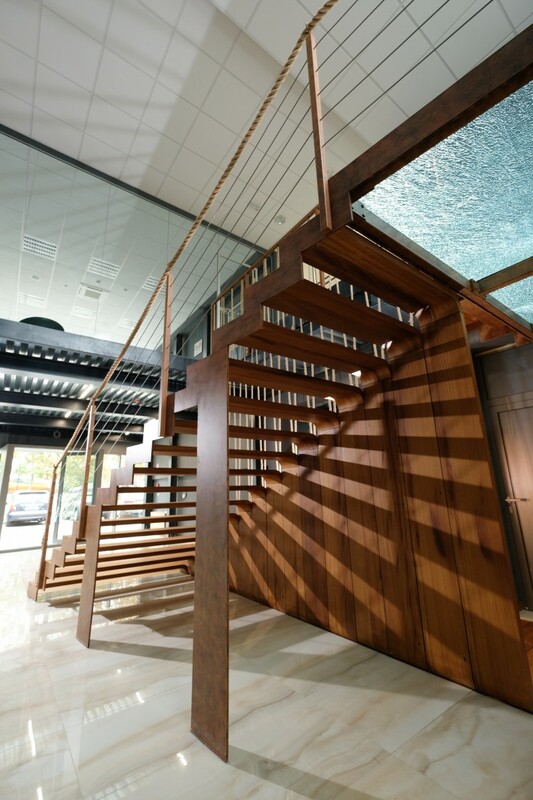 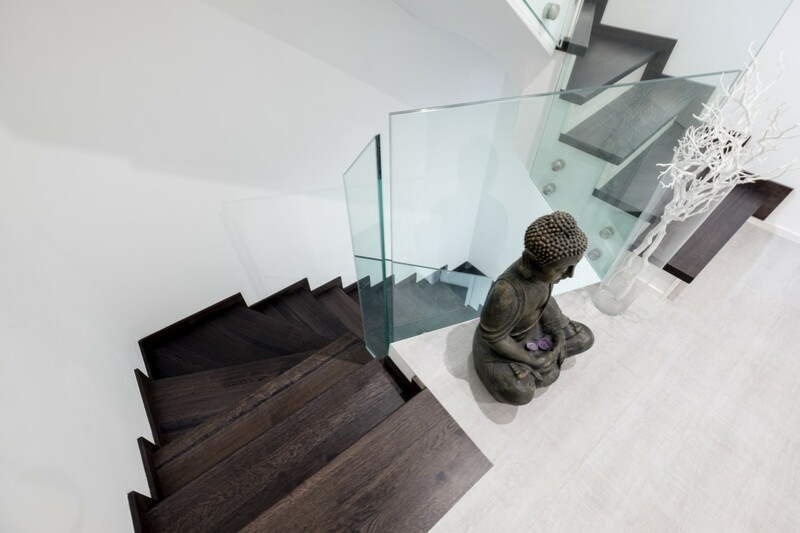 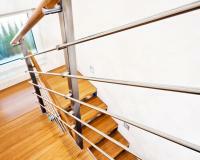 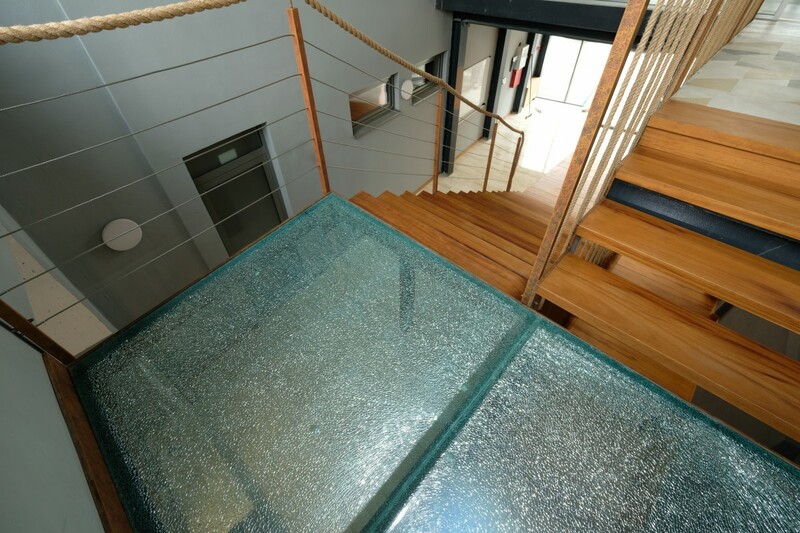 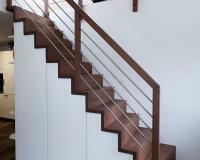 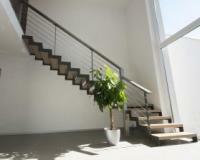 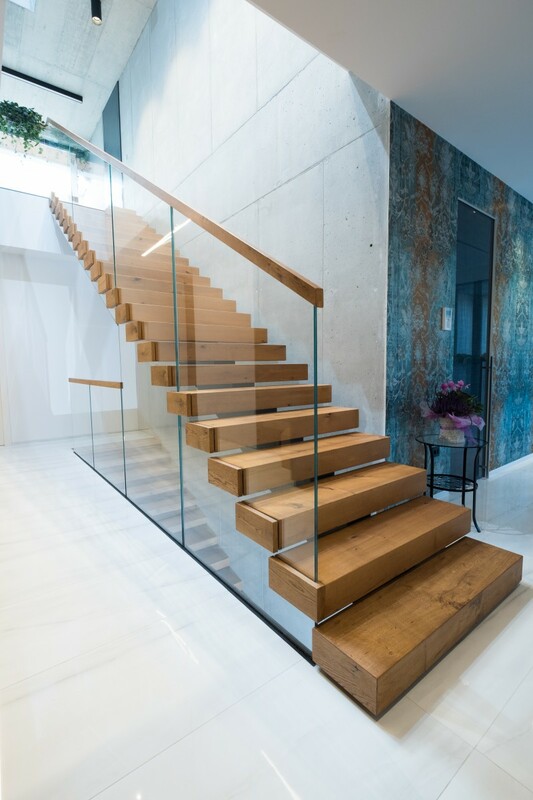 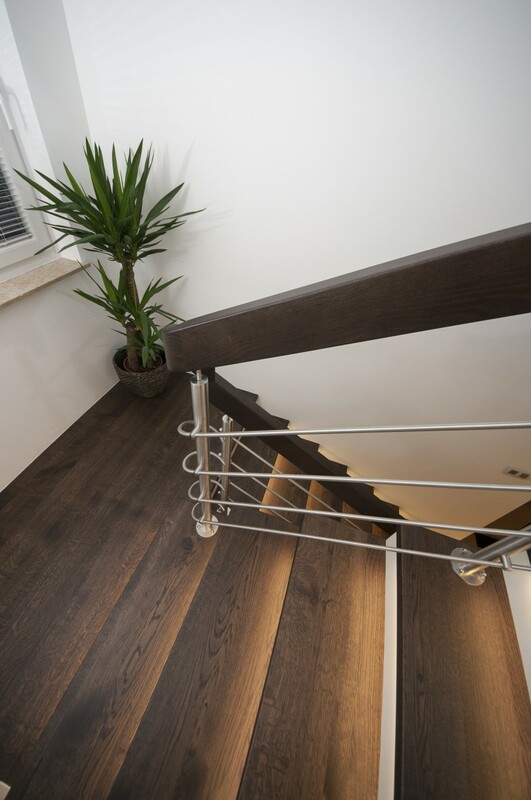 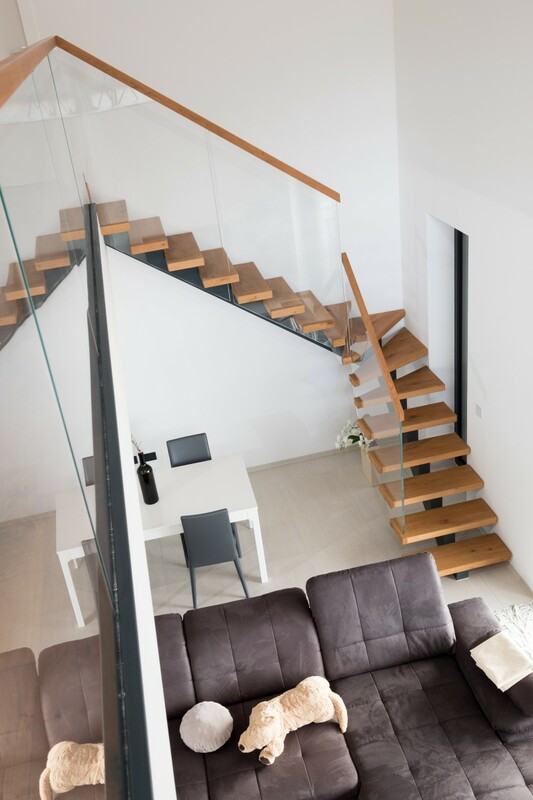 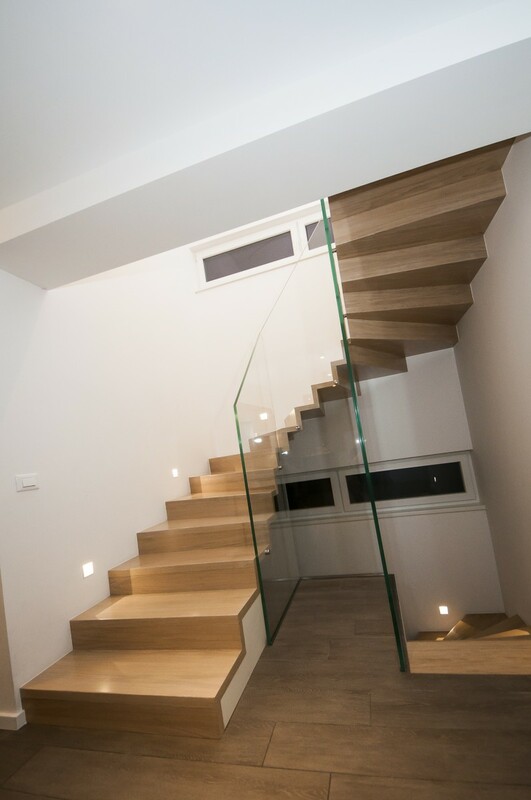 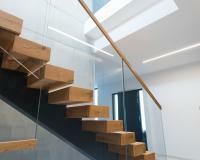 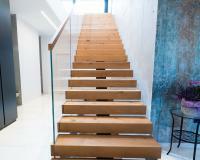 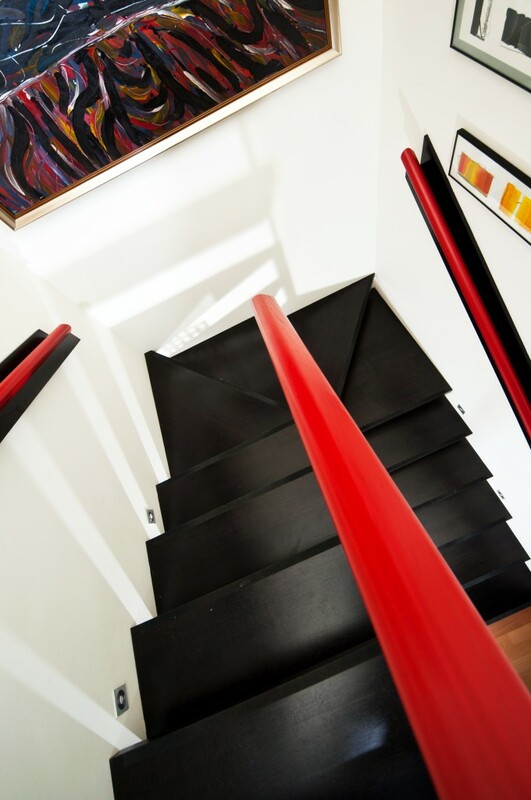 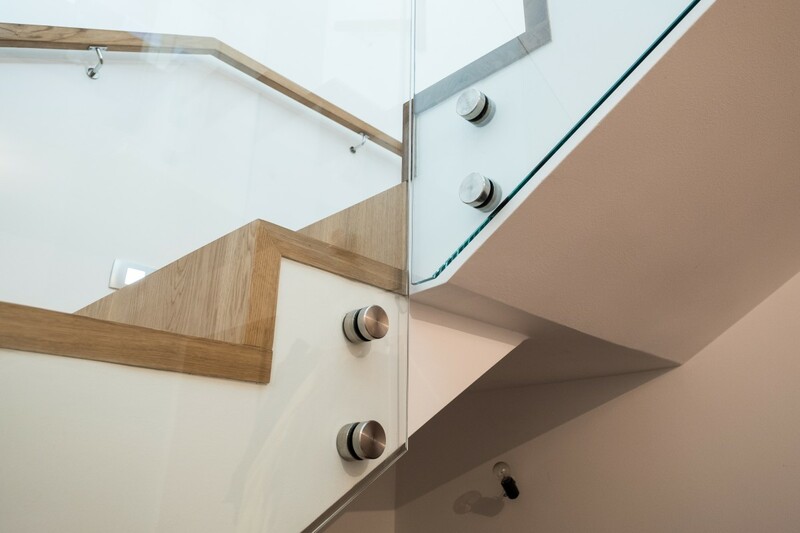 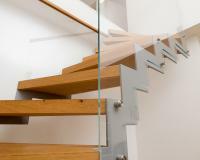 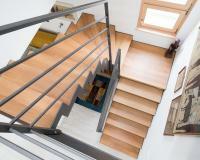 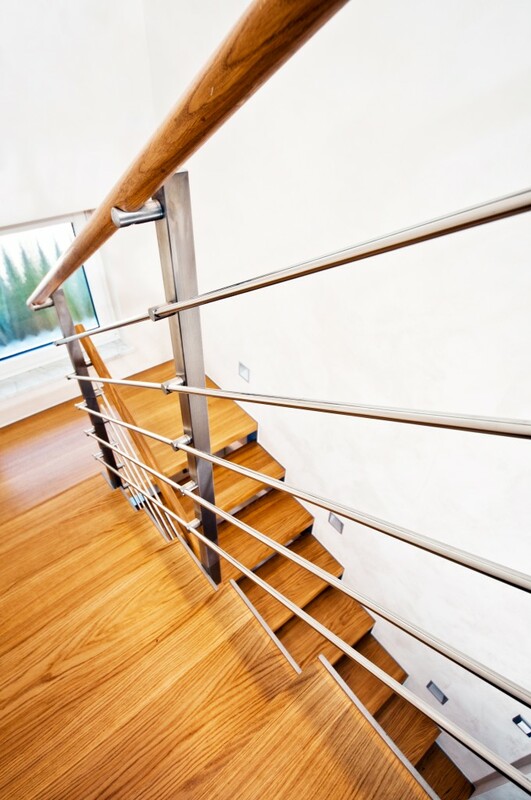 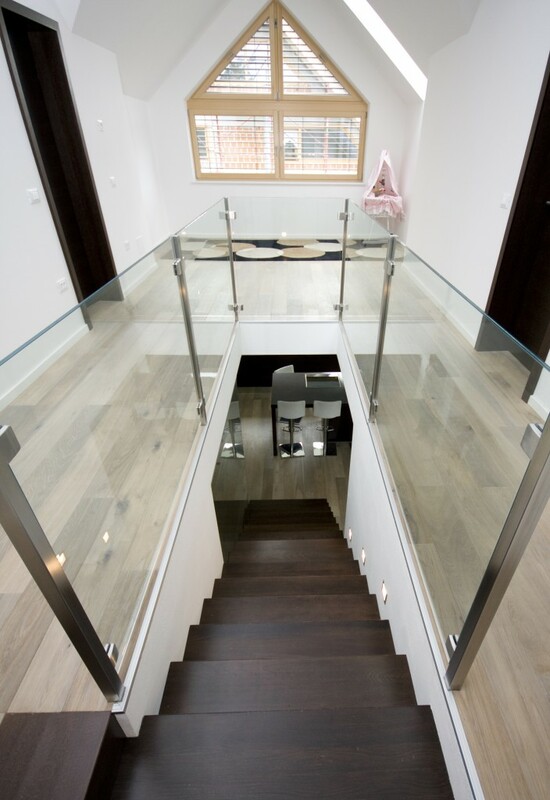 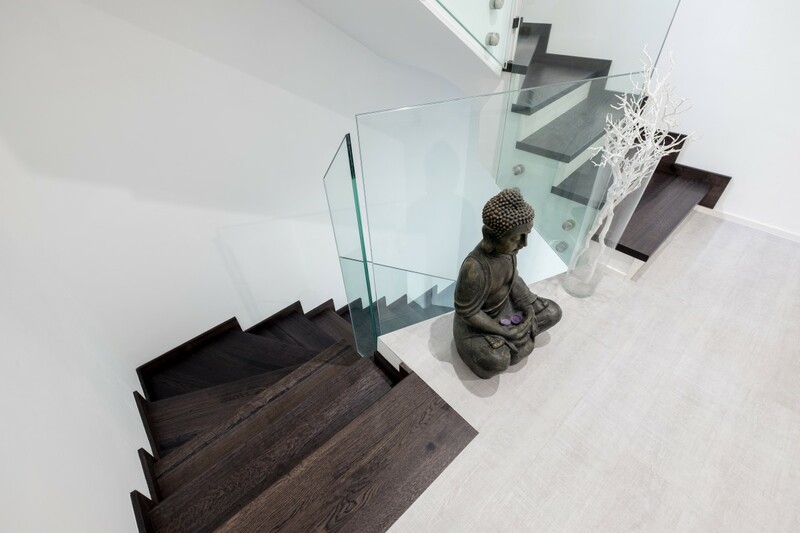 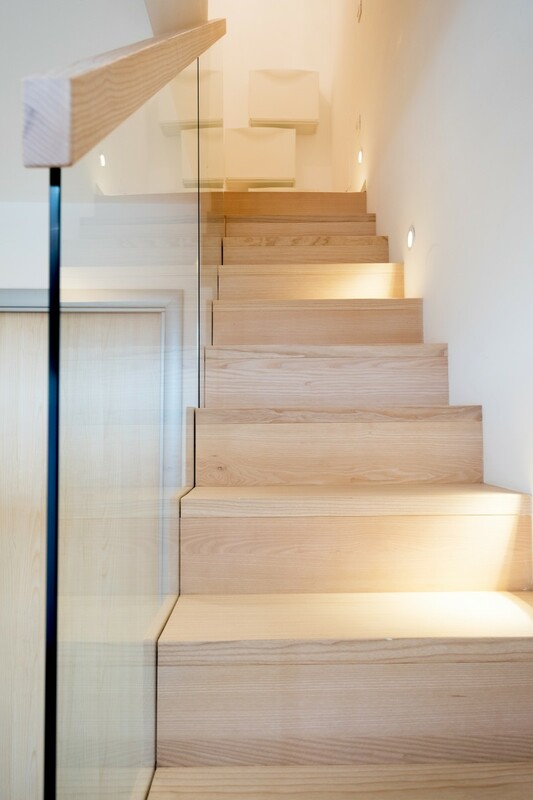 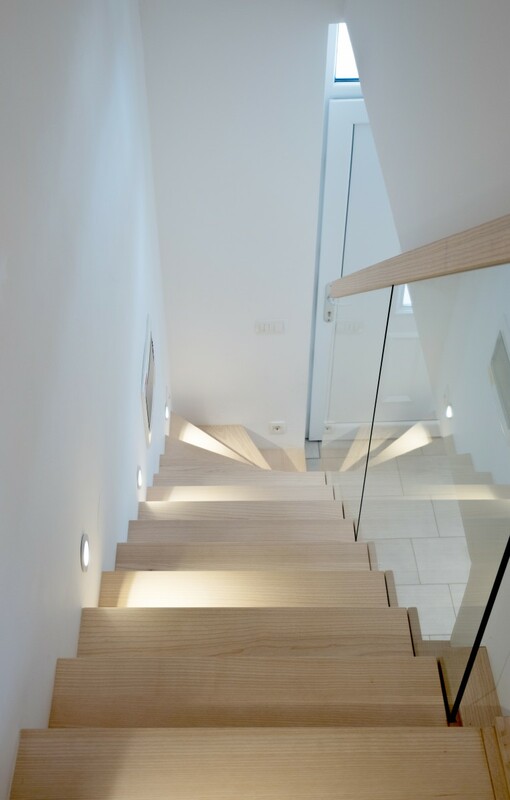 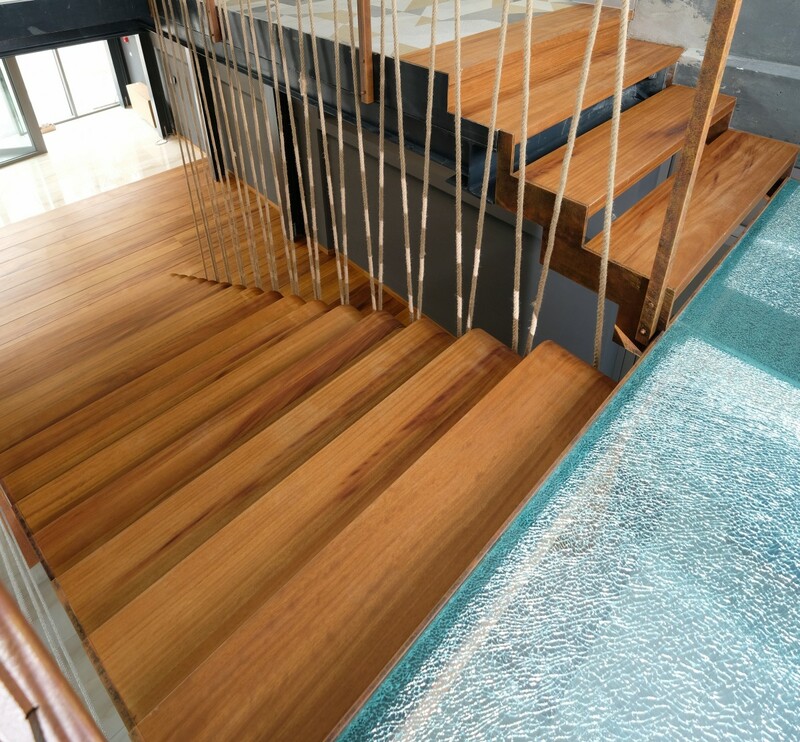 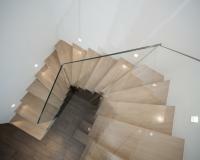 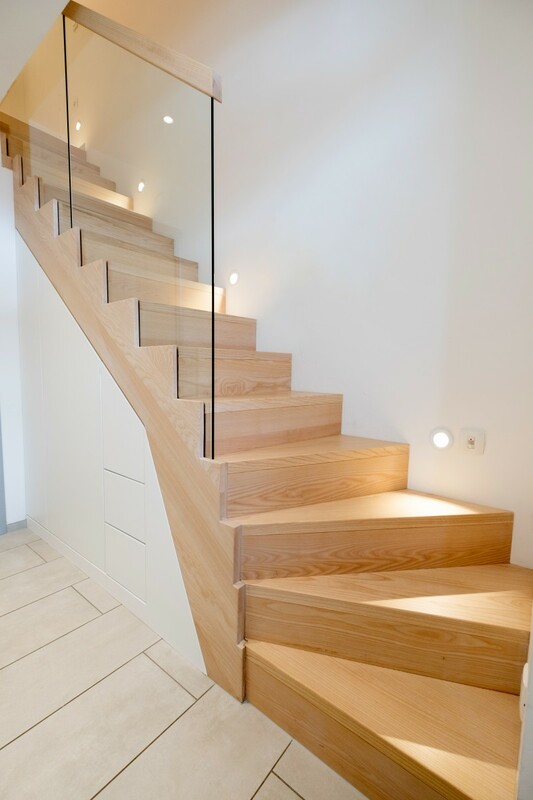 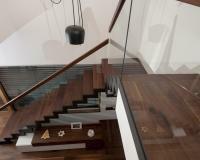 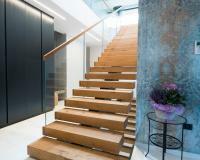 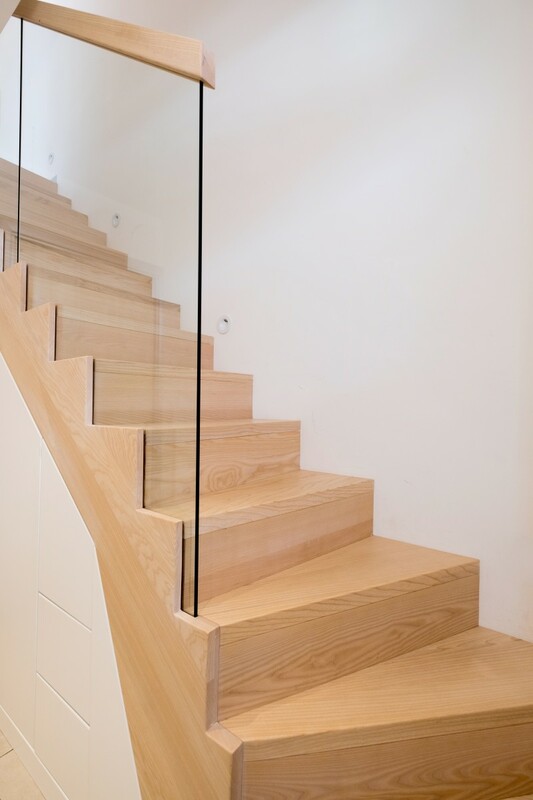 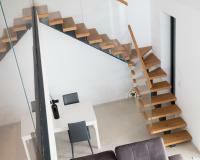 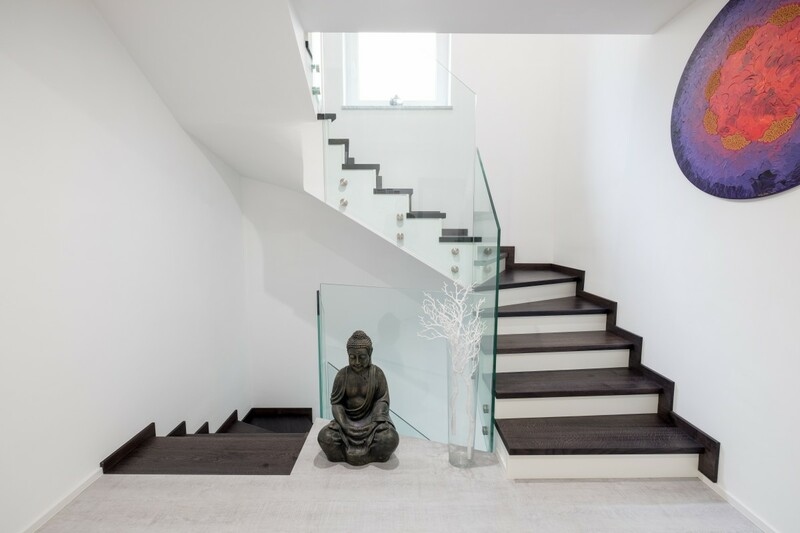 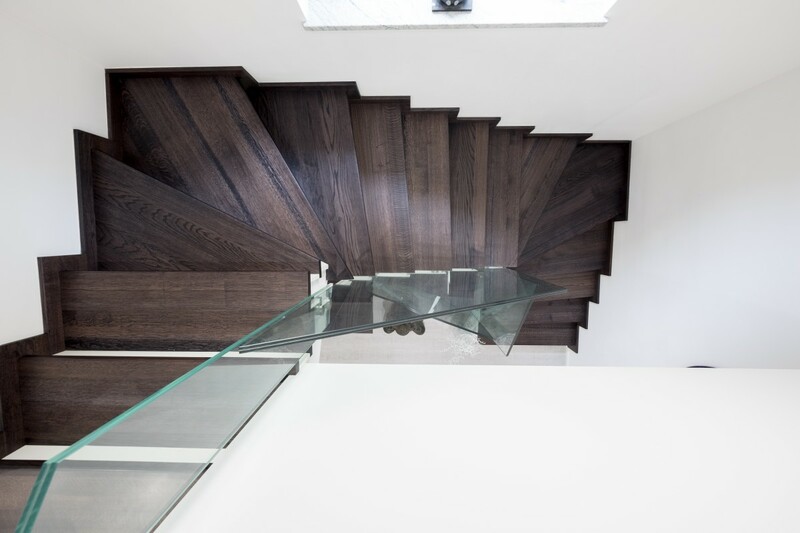 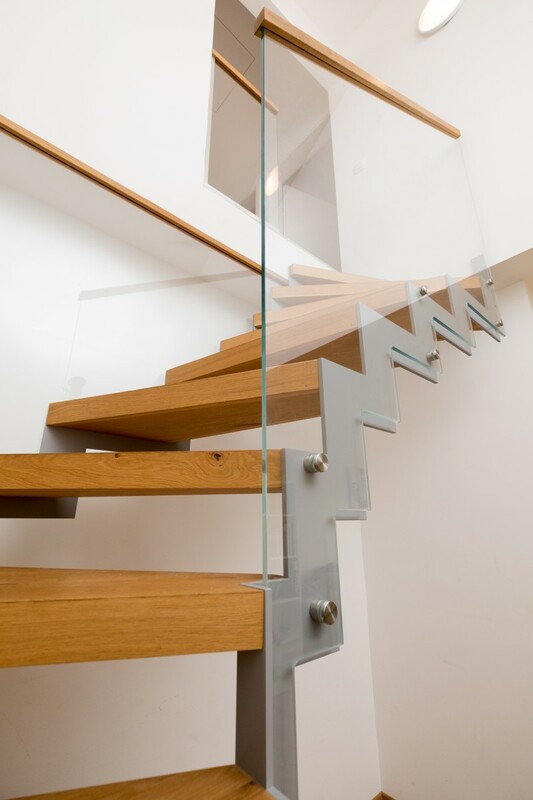 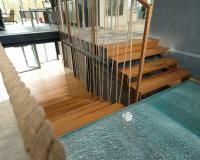 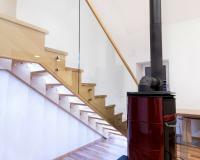 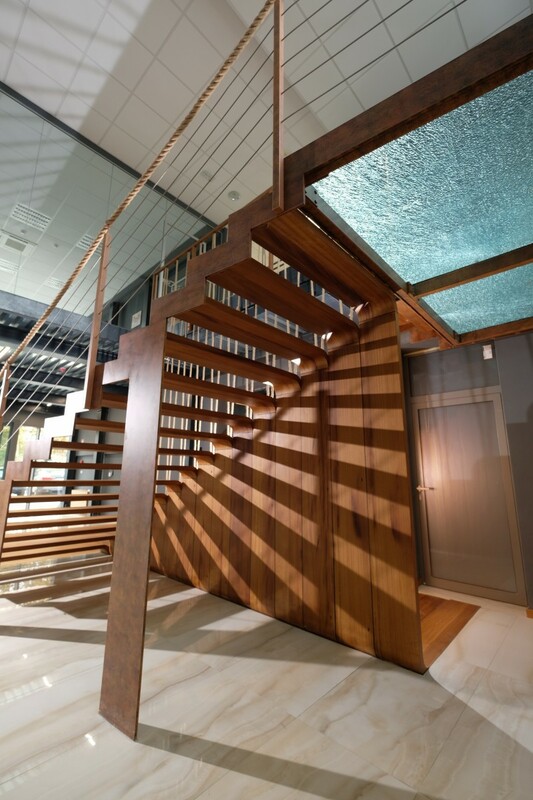 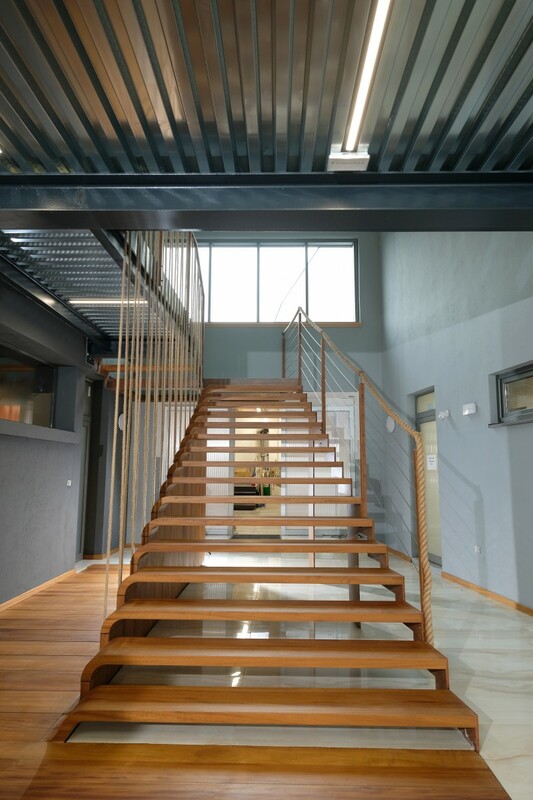 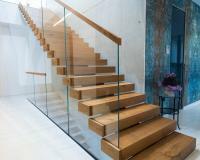 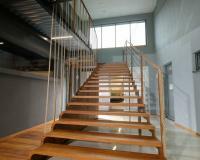 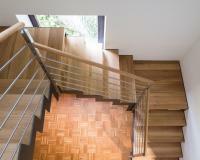 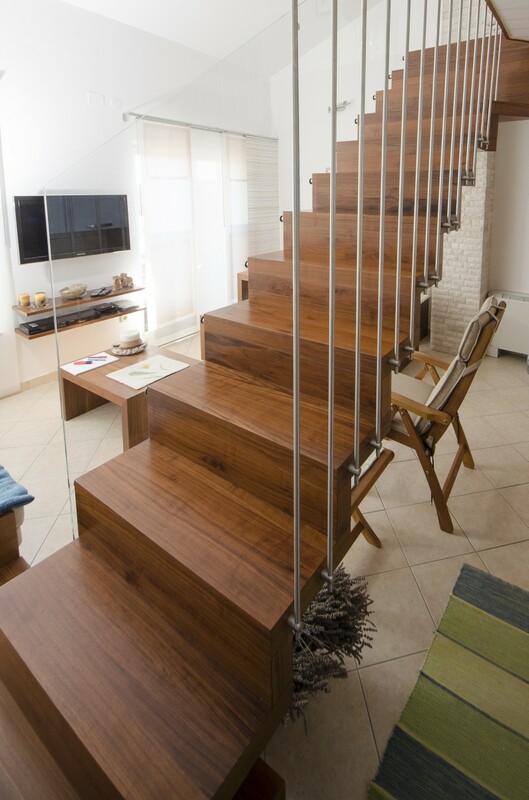 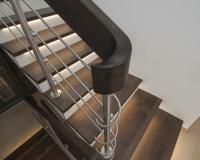 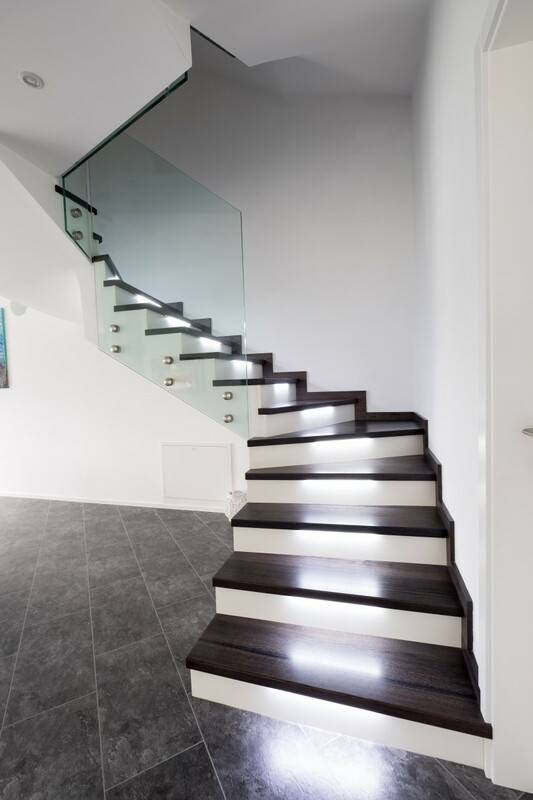 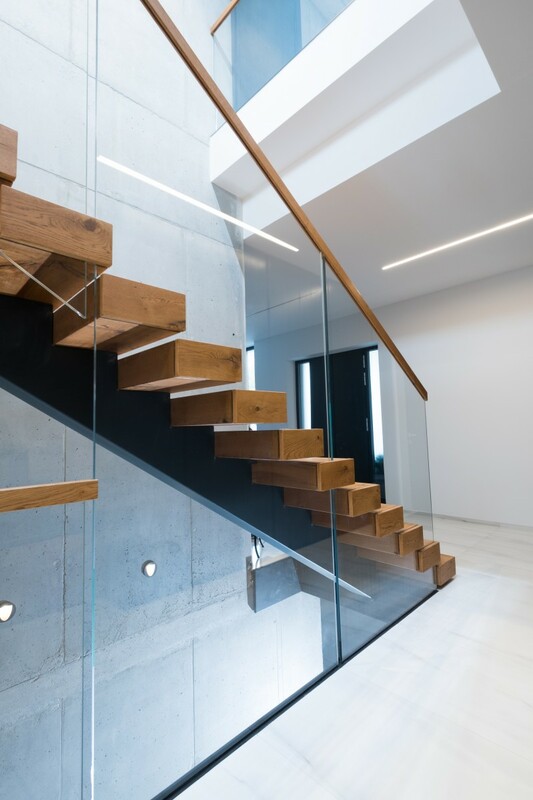 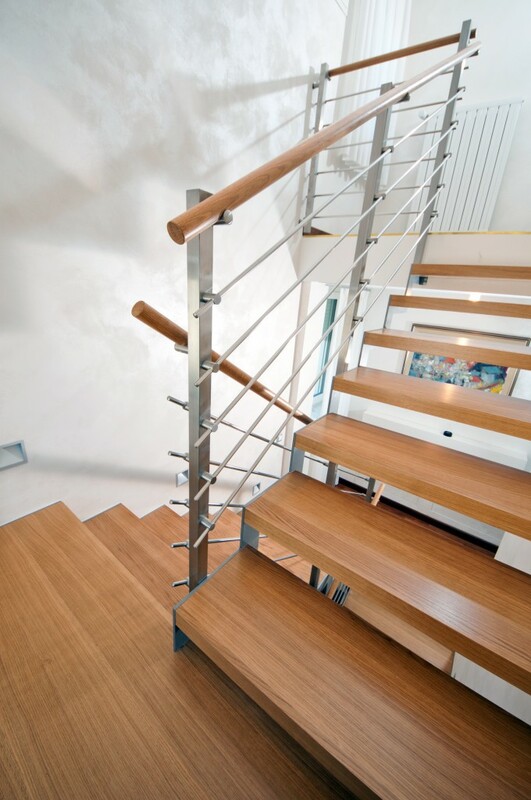 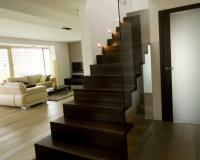 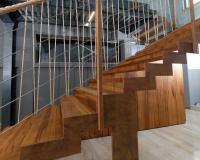 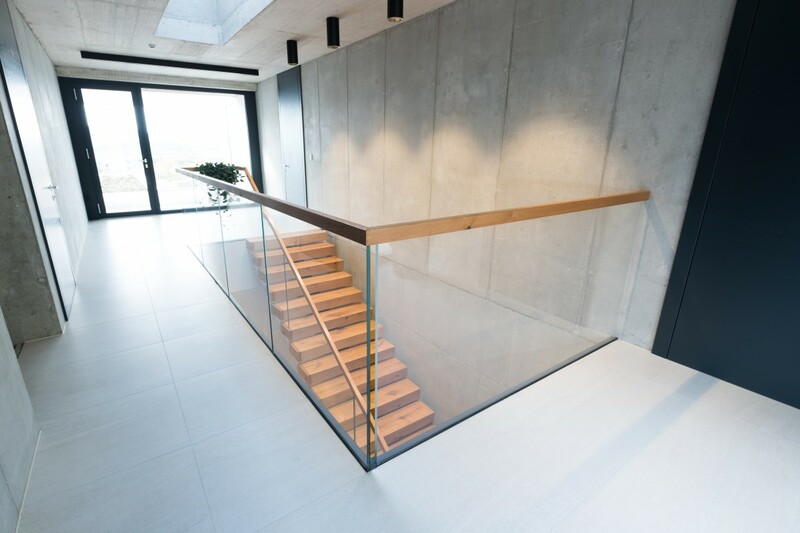 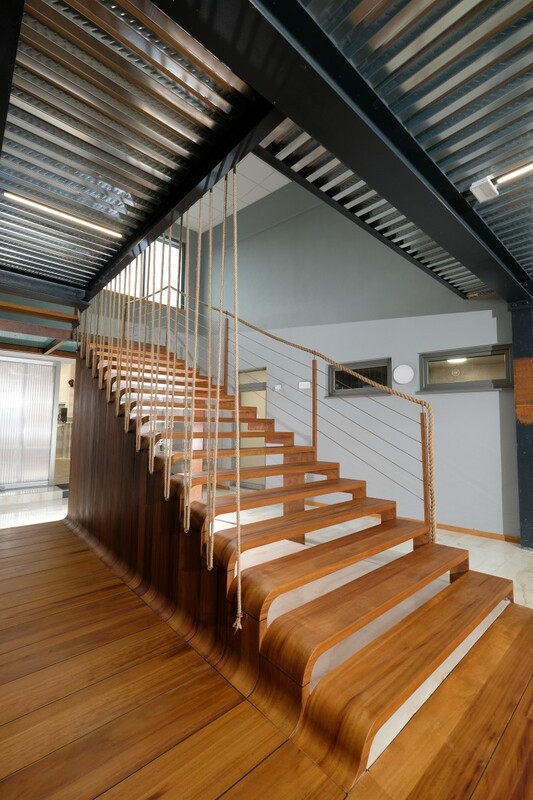 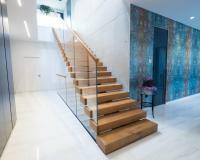 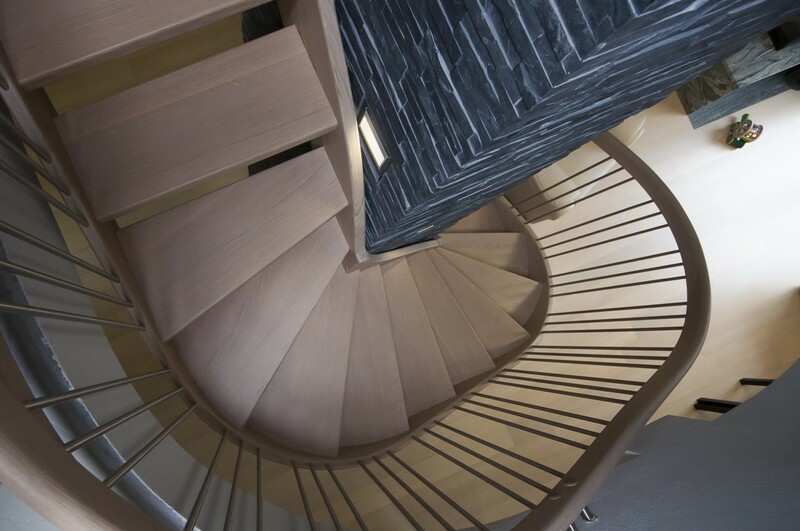 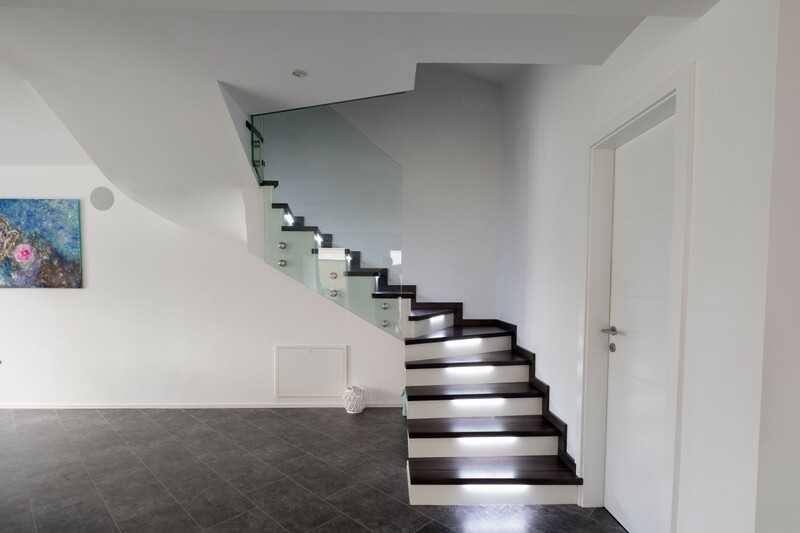 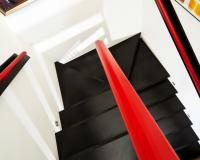 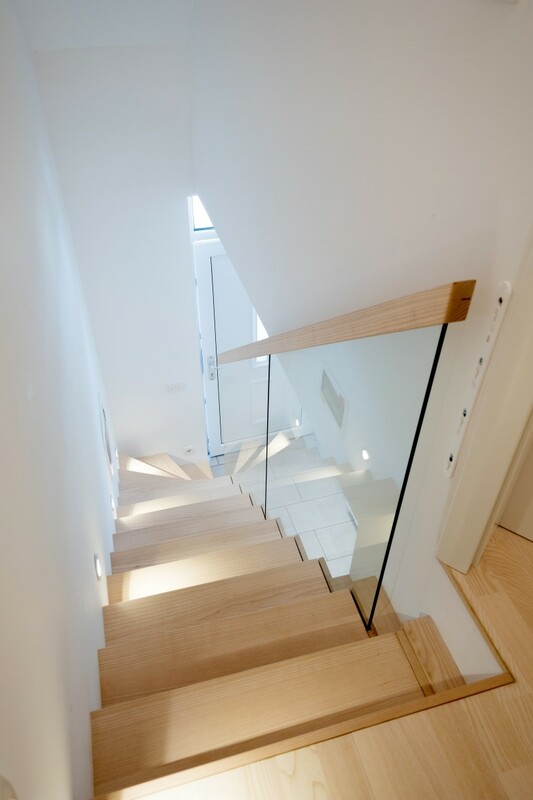 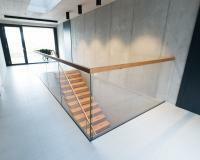 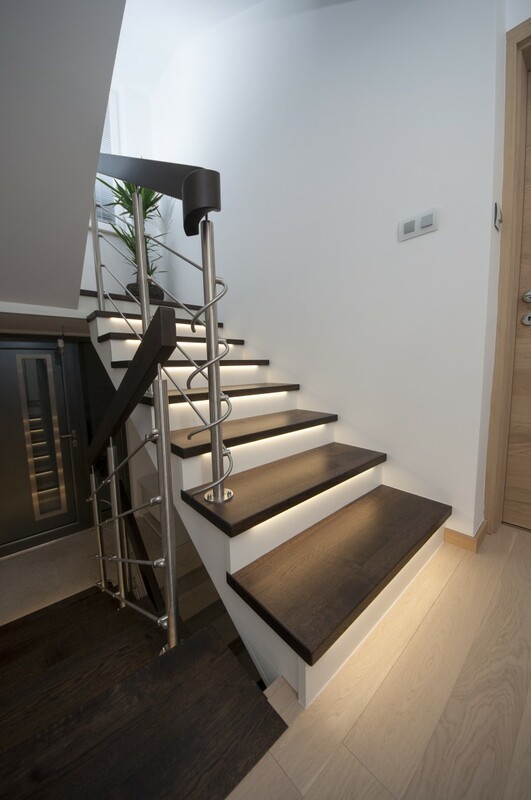 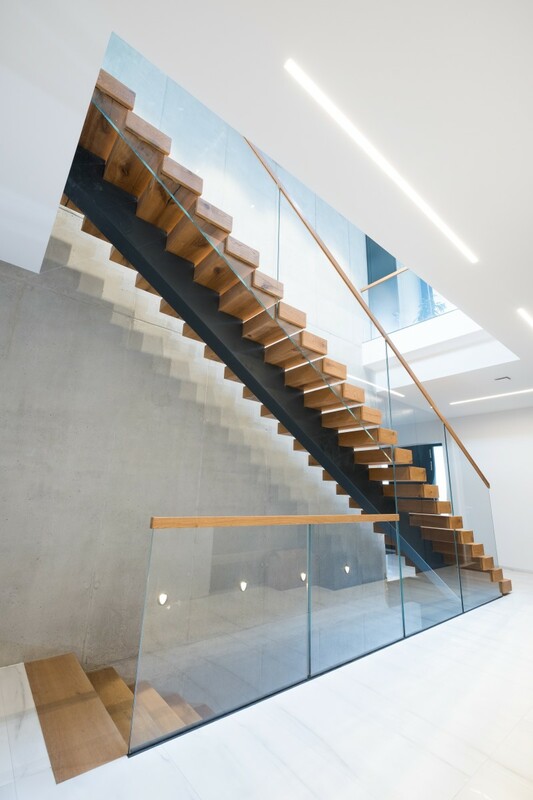 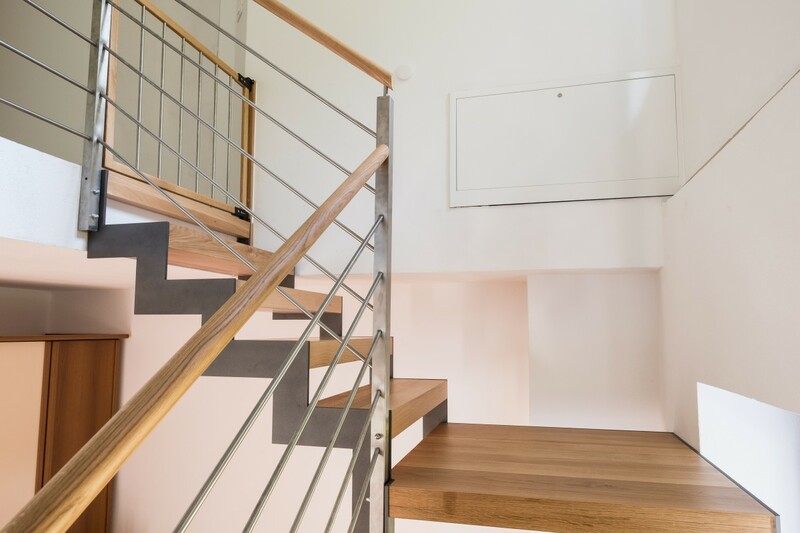 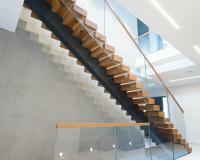 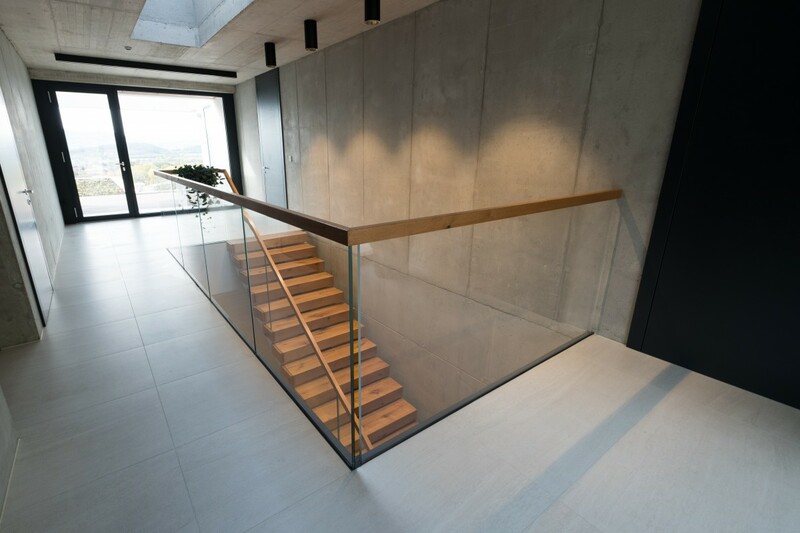 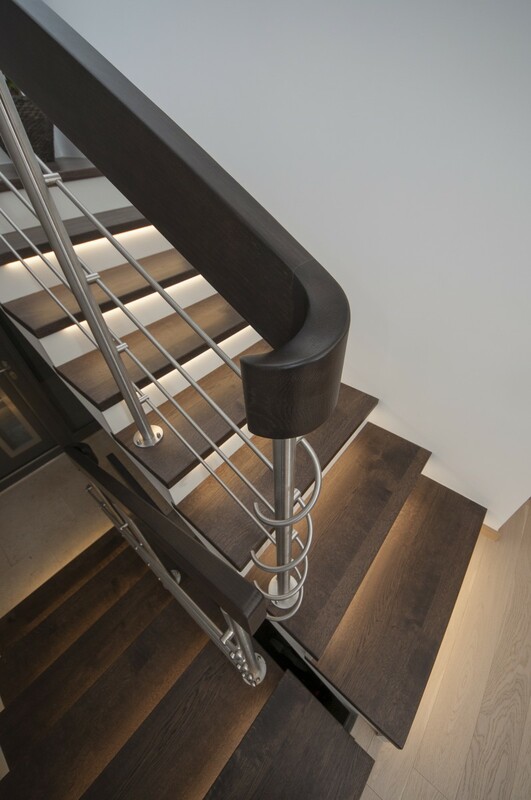 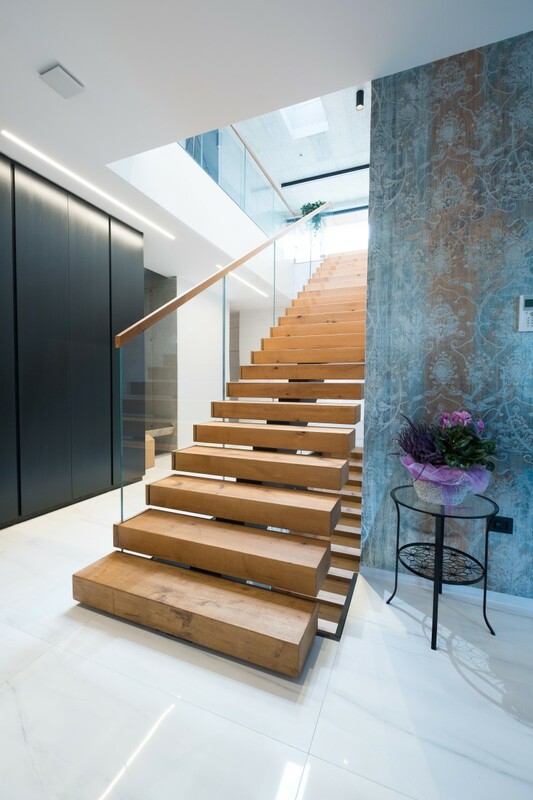 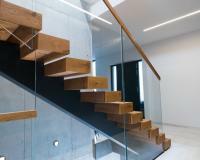 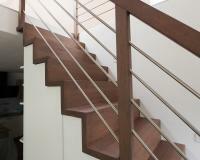 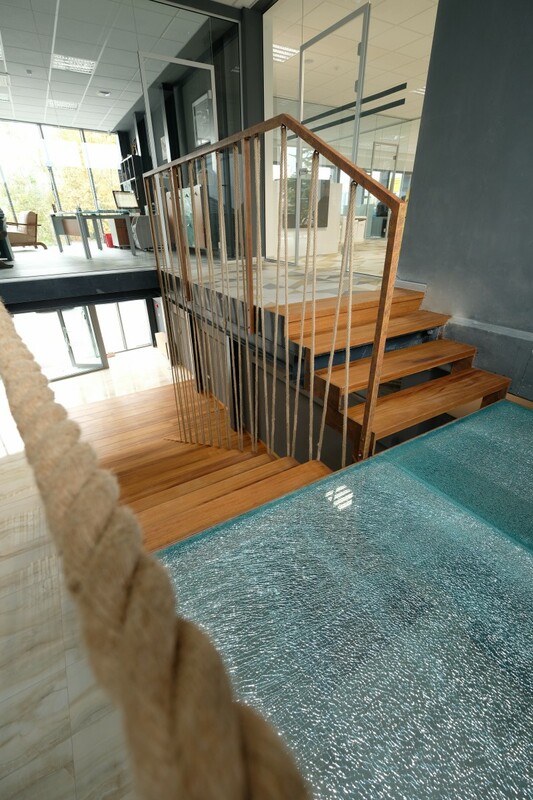 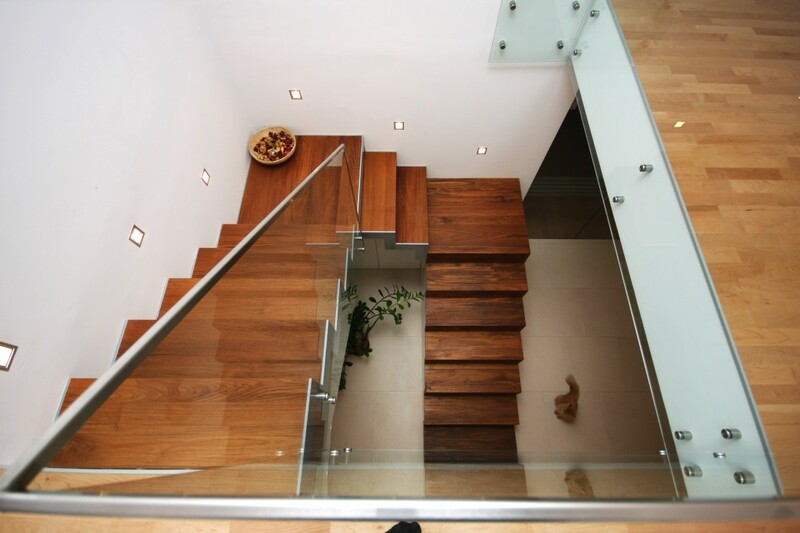 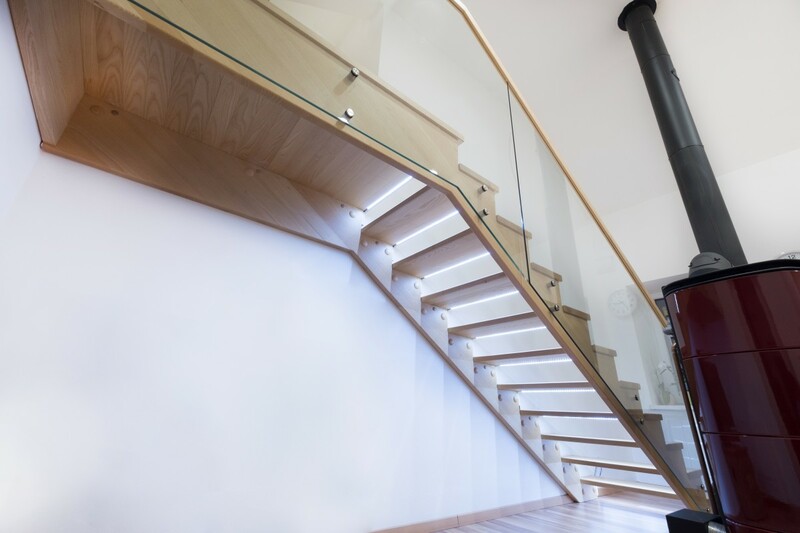 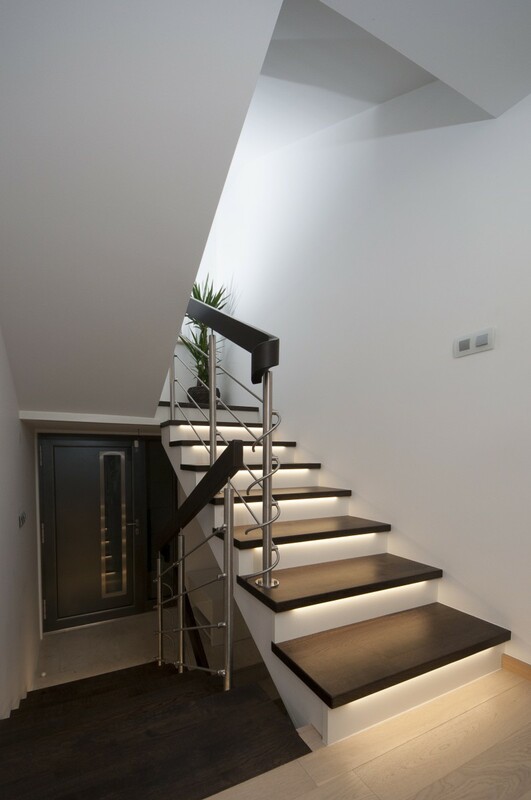 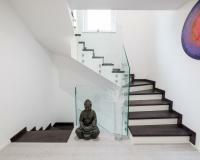 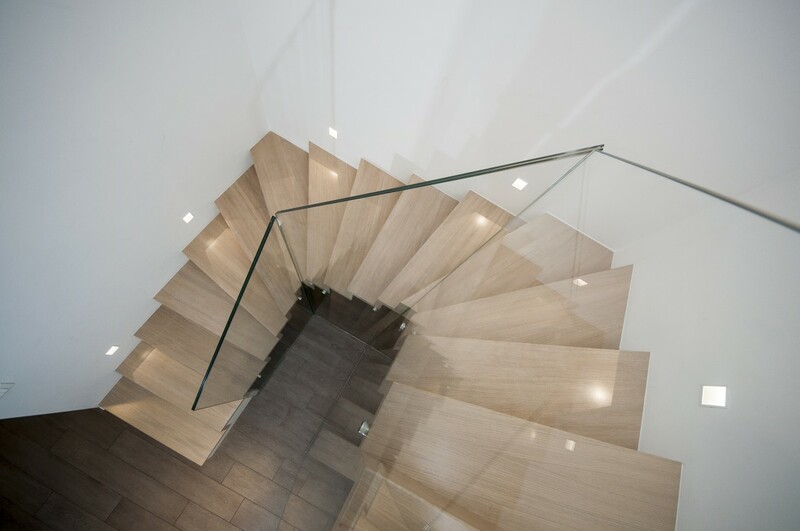 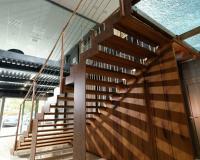 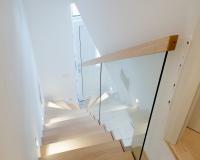 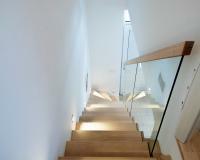 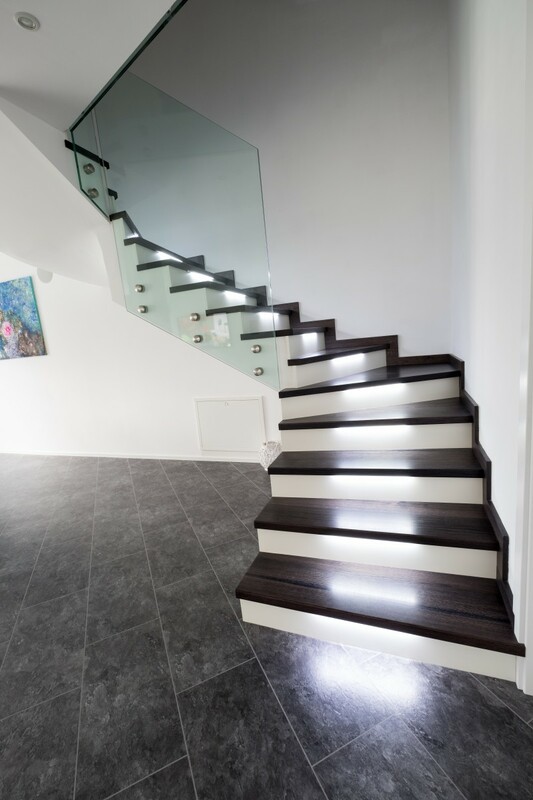 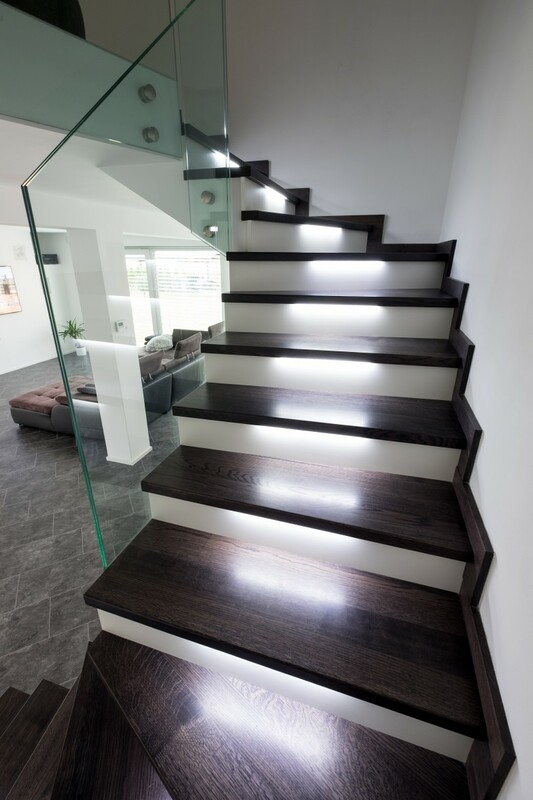 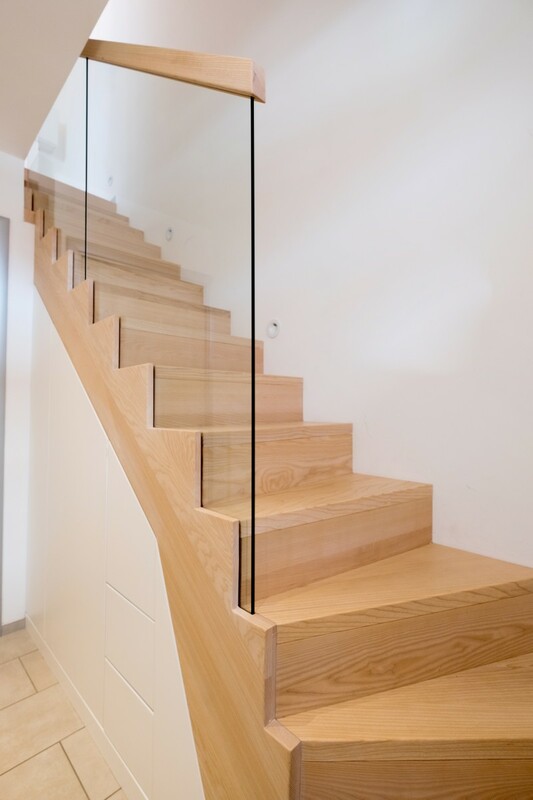 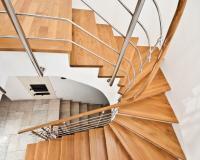 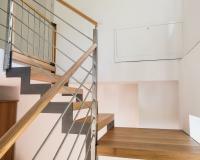 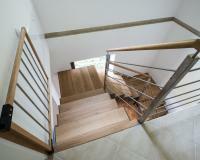 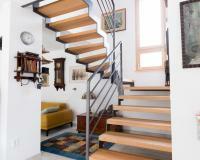 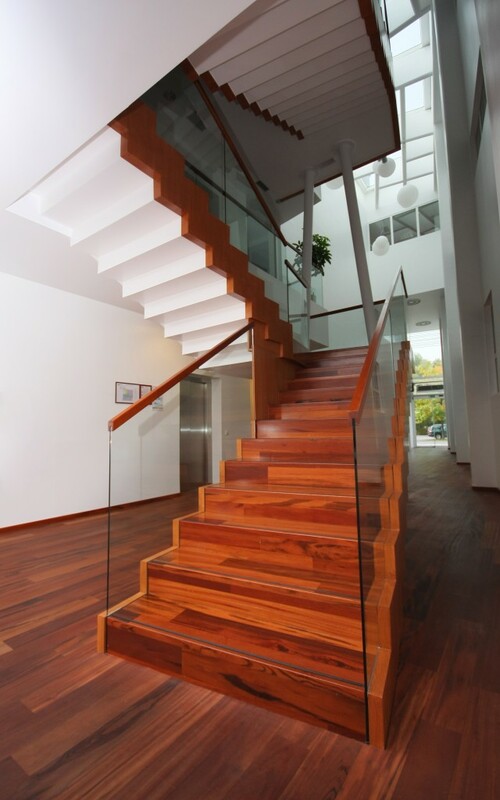 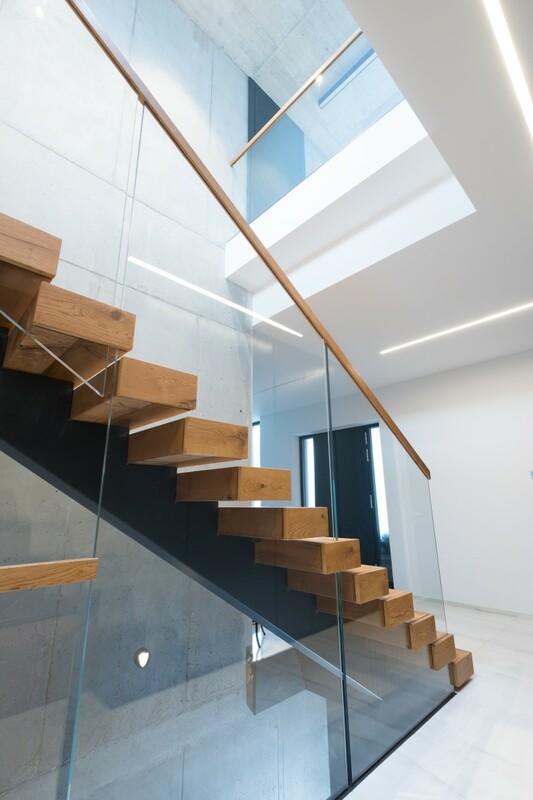 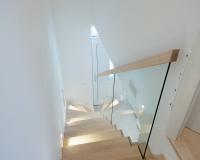 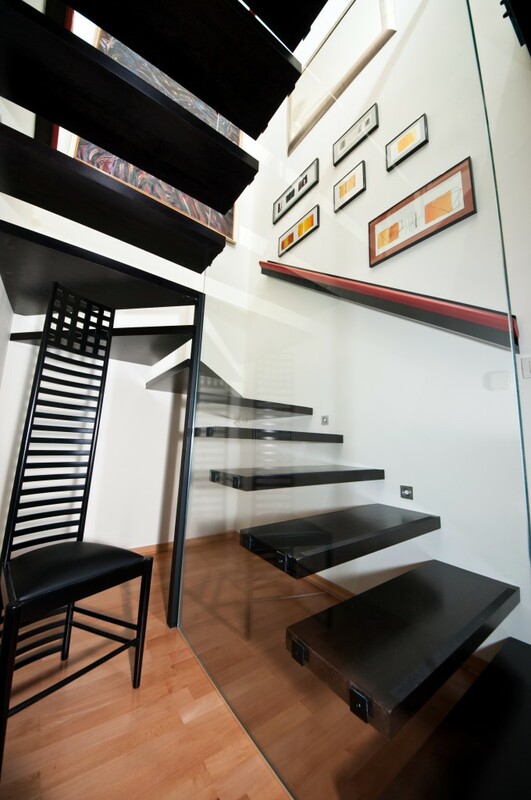 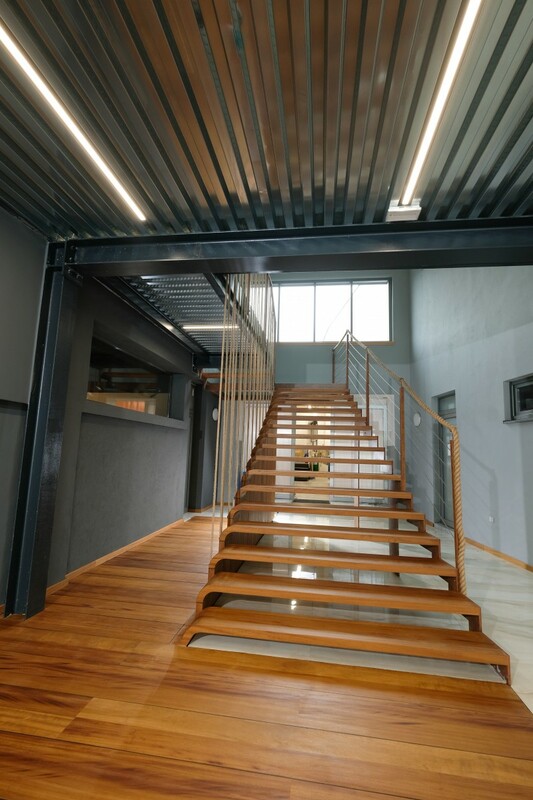 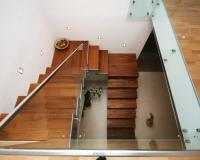 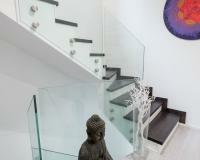 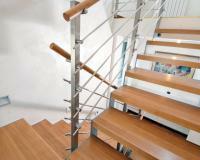 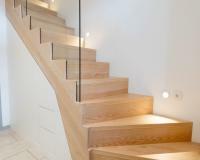 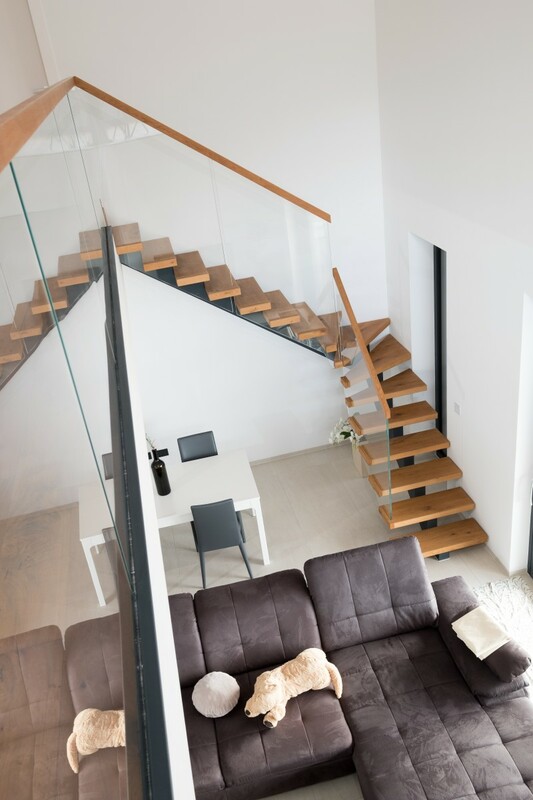 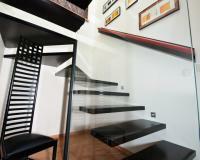 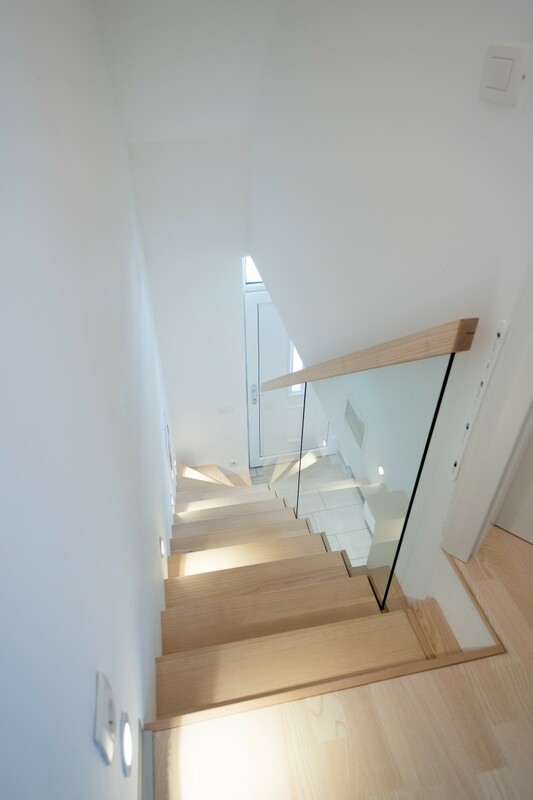 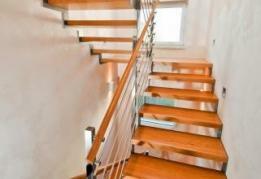 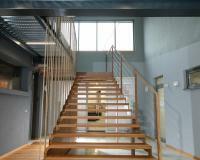 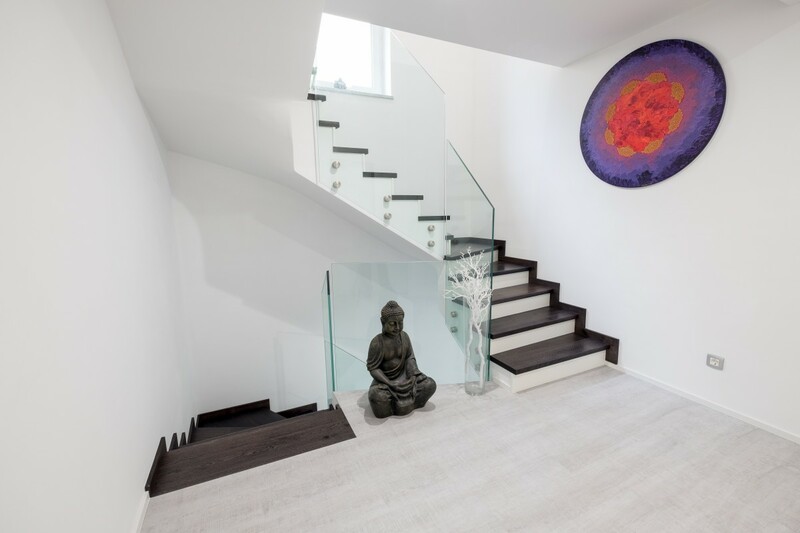 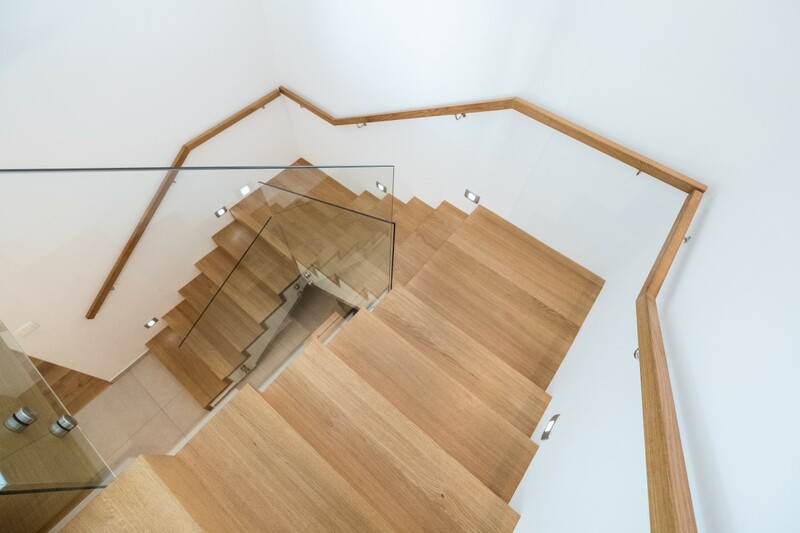 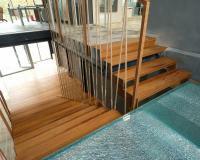 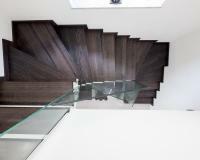 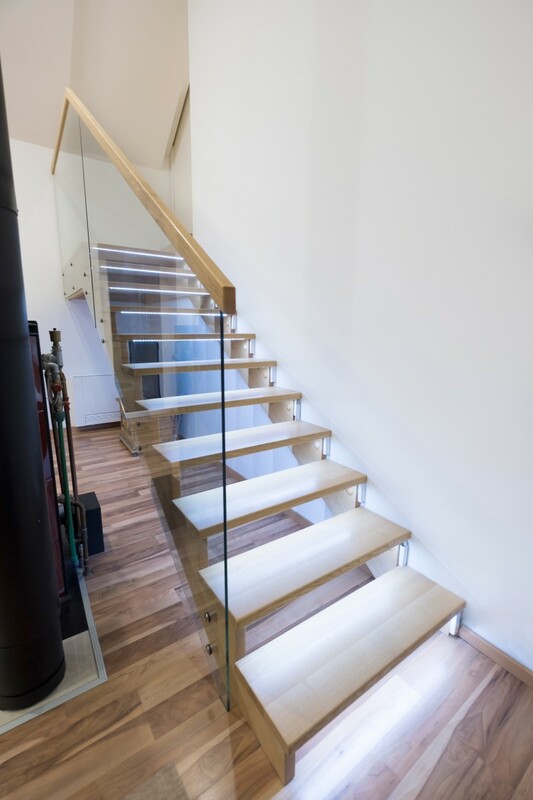 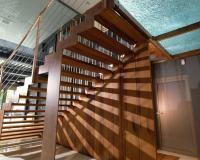 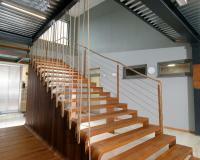 Modern staircases incorporate modern straight lines, combined with stainless steel or glass accessories. 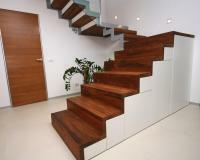 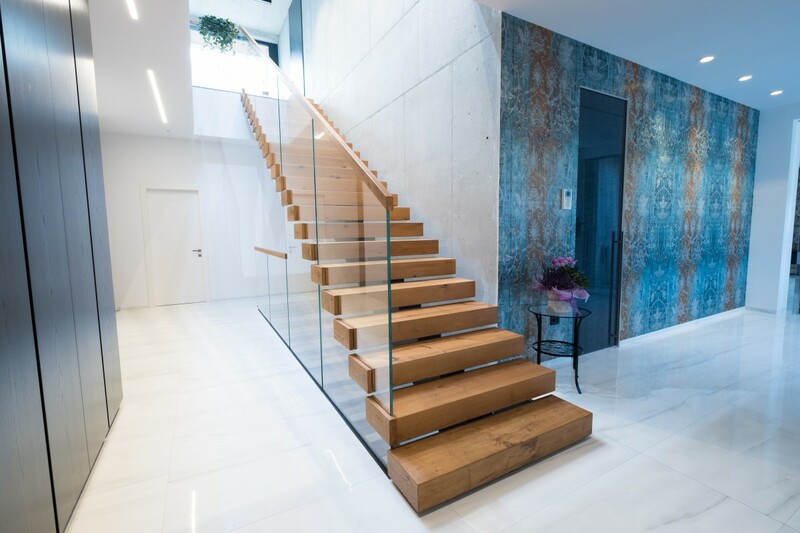 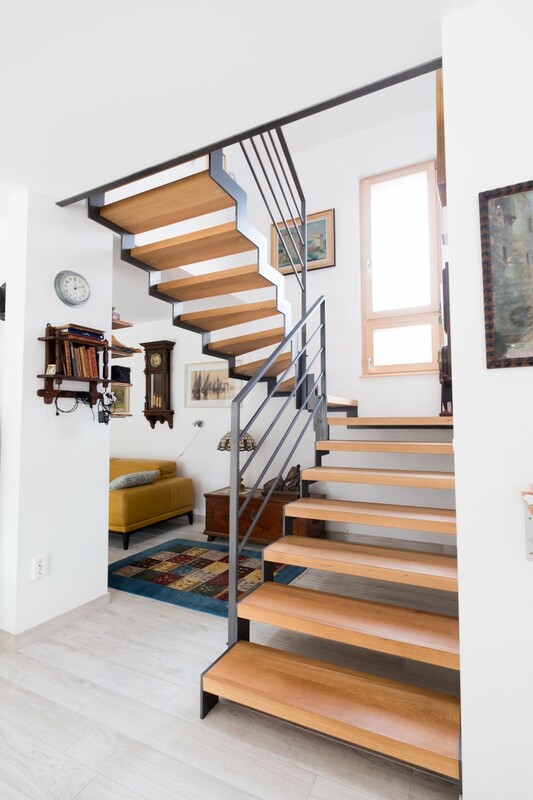 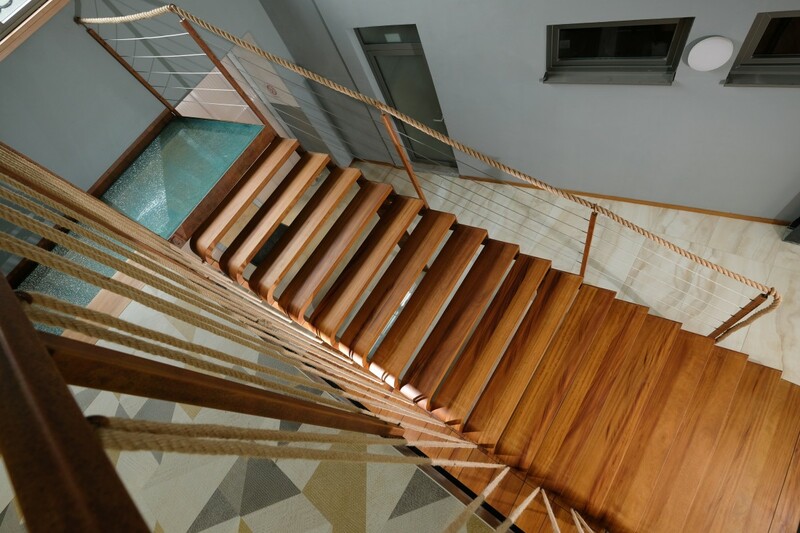 Unique staircases on concrete that are made in all possible variants add a beautiful and holistic look to your home. 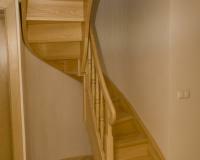 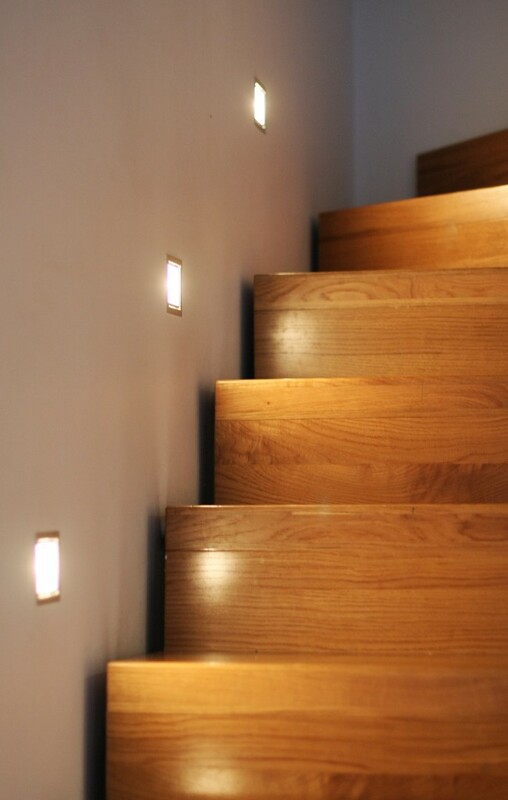 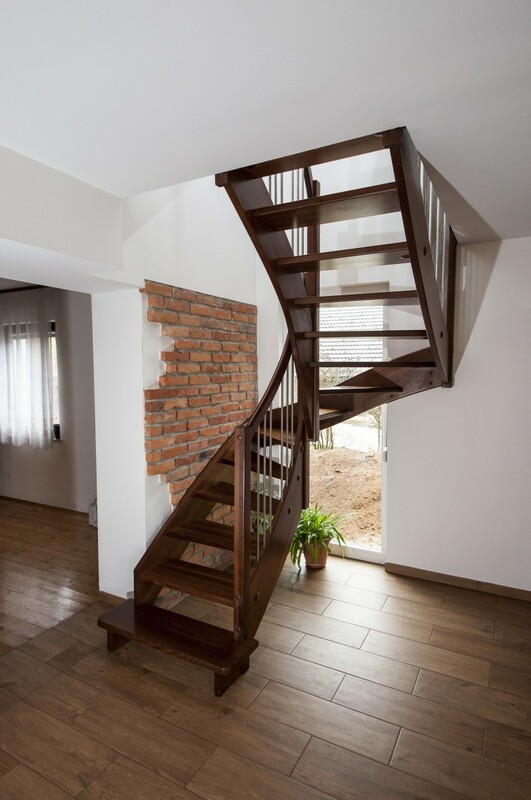 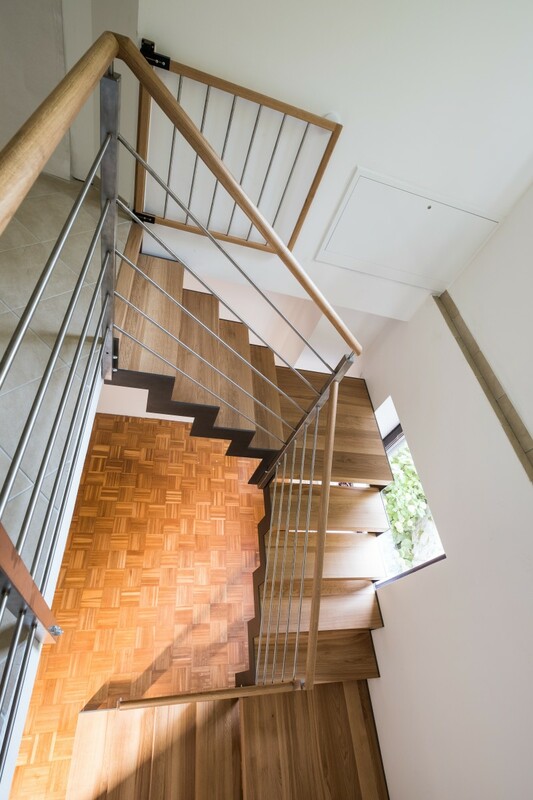 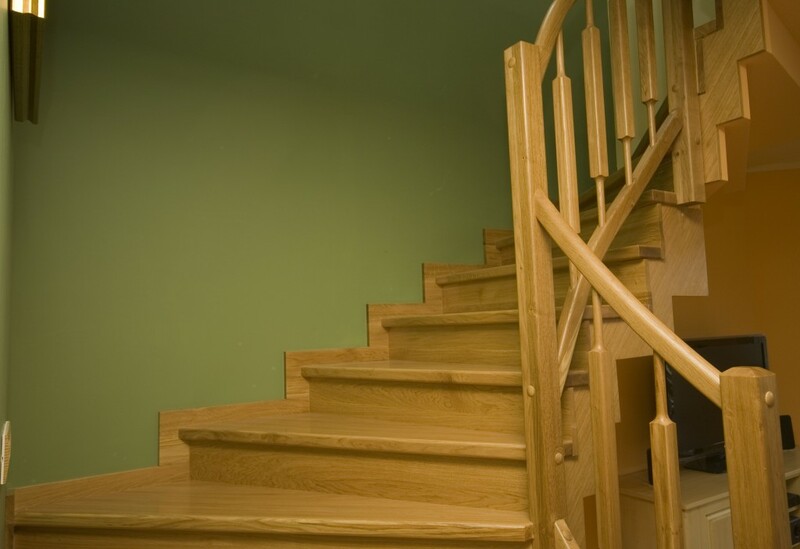 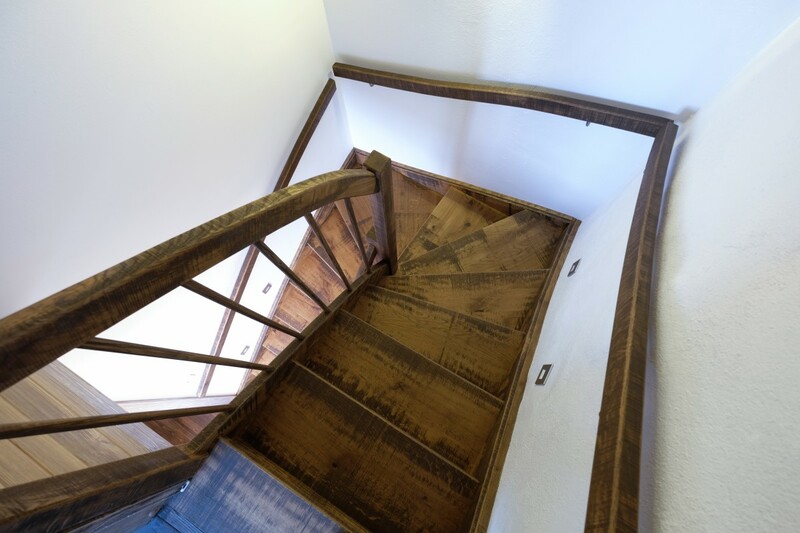 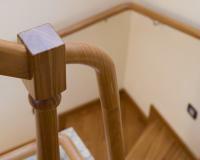 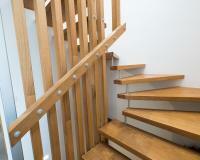 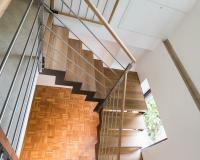 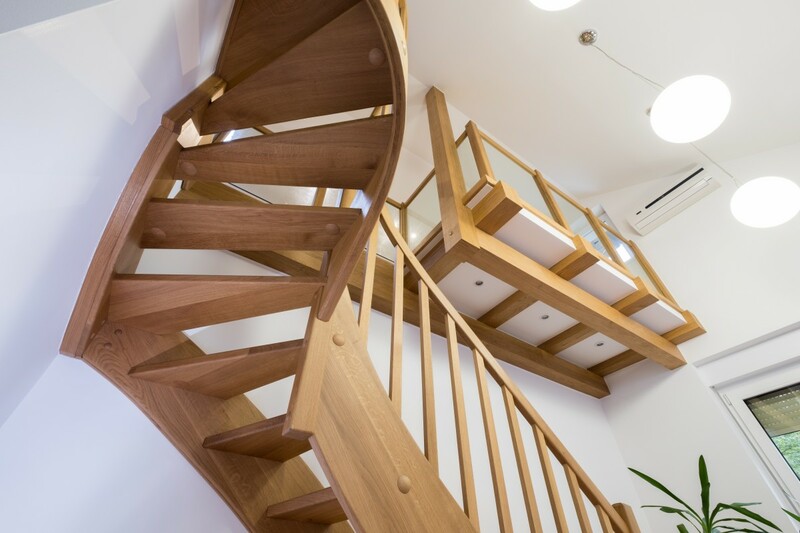 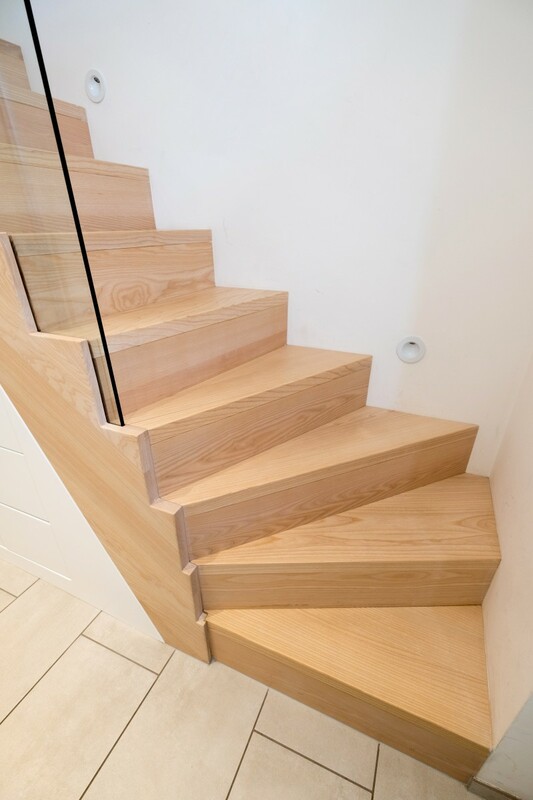 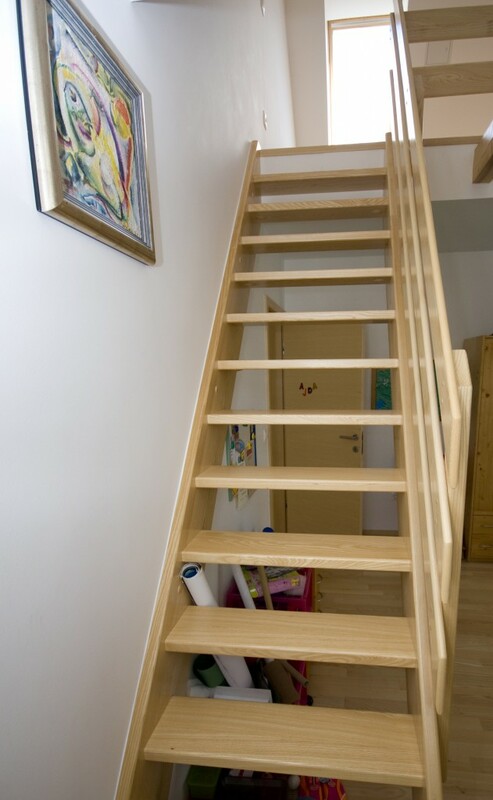 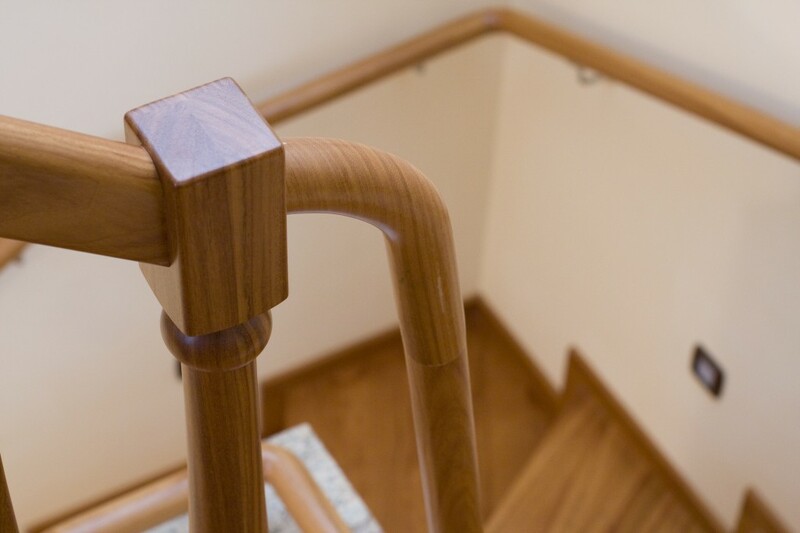 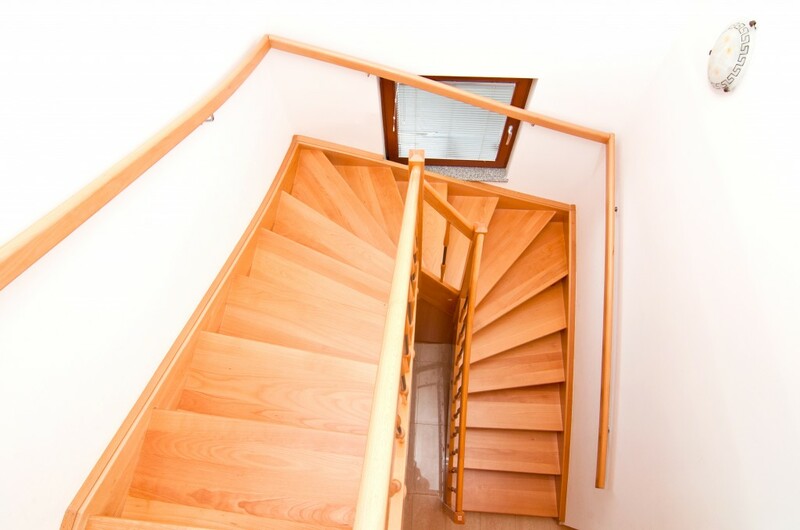 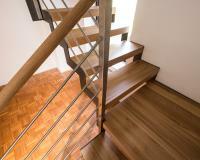 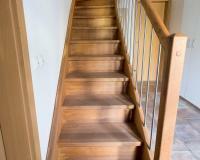 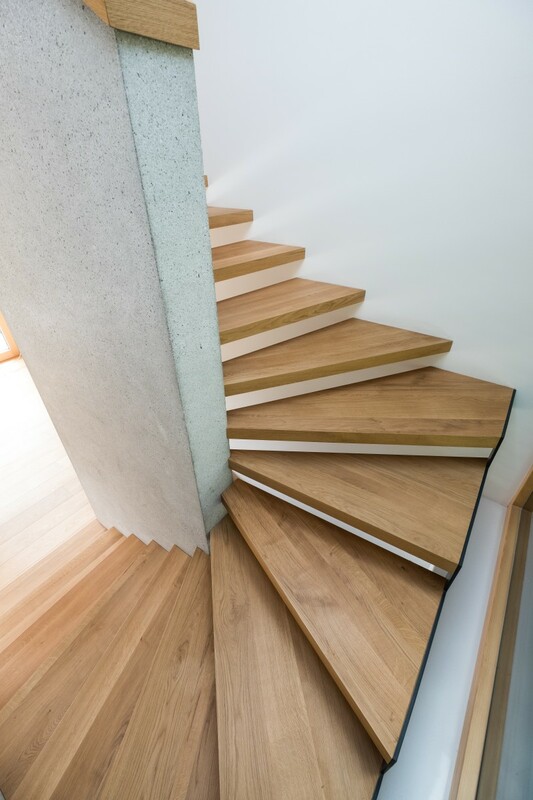 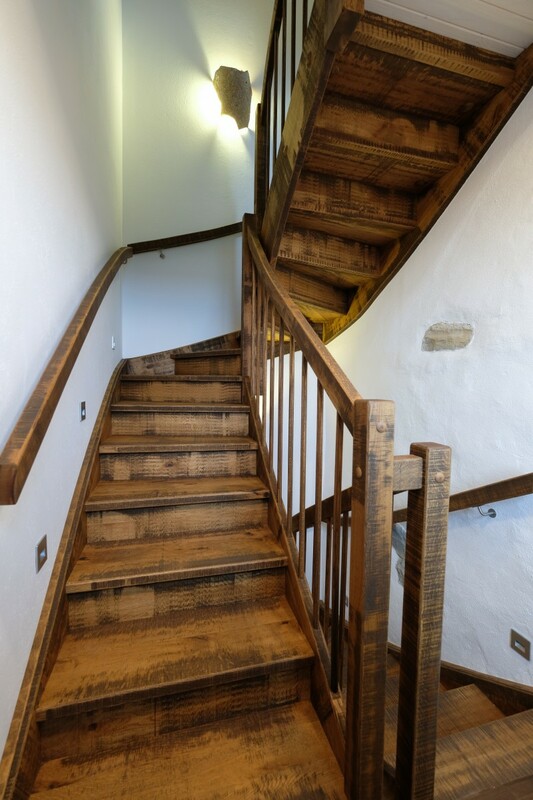 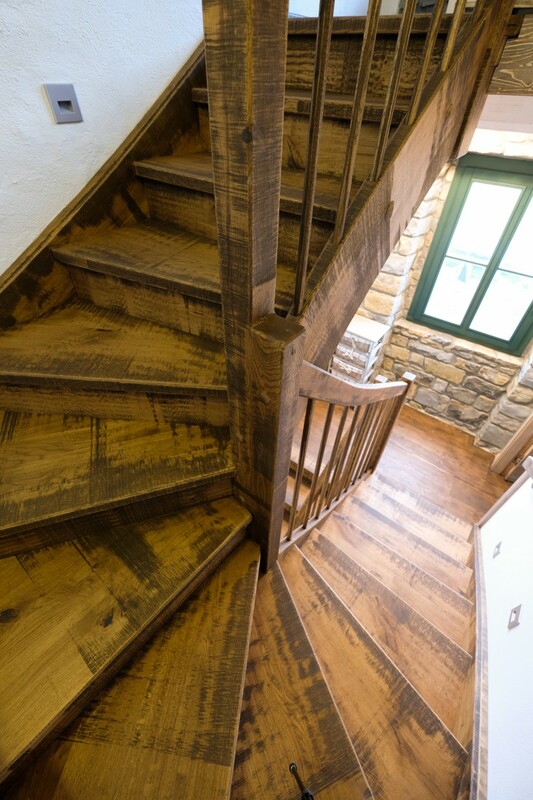 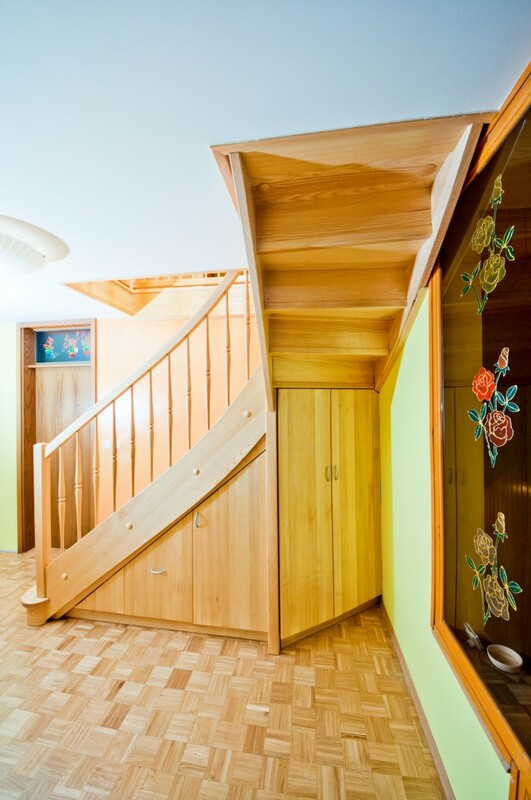 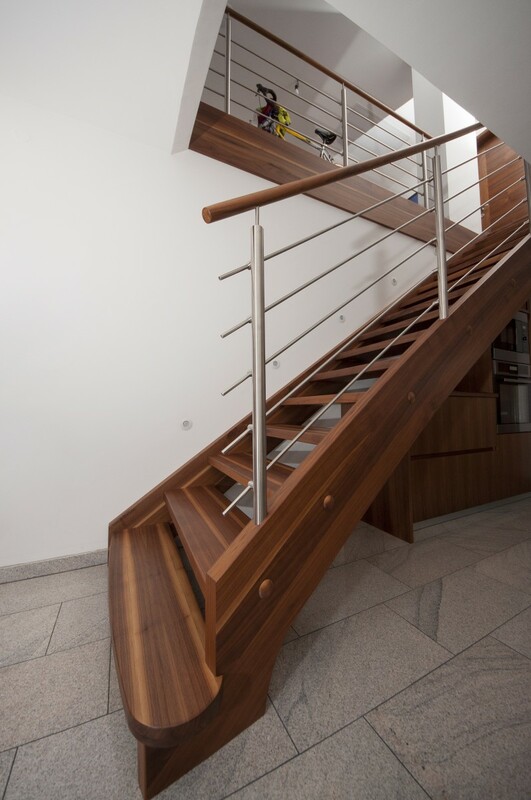 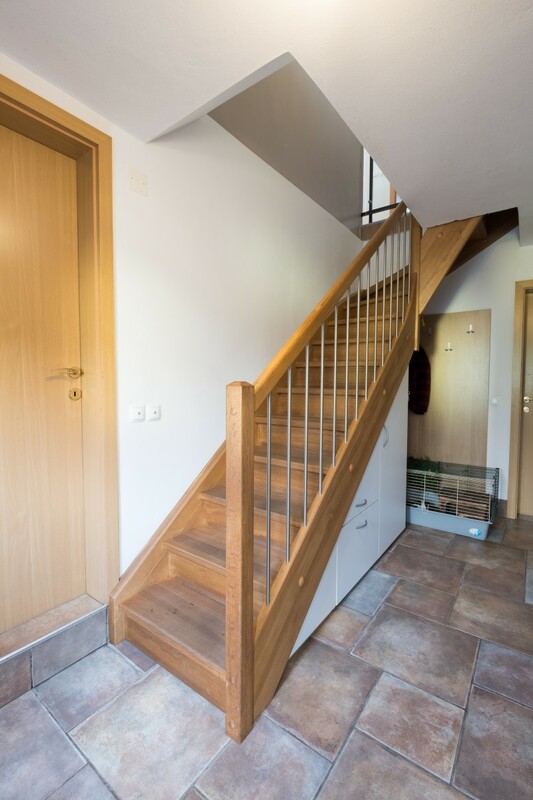 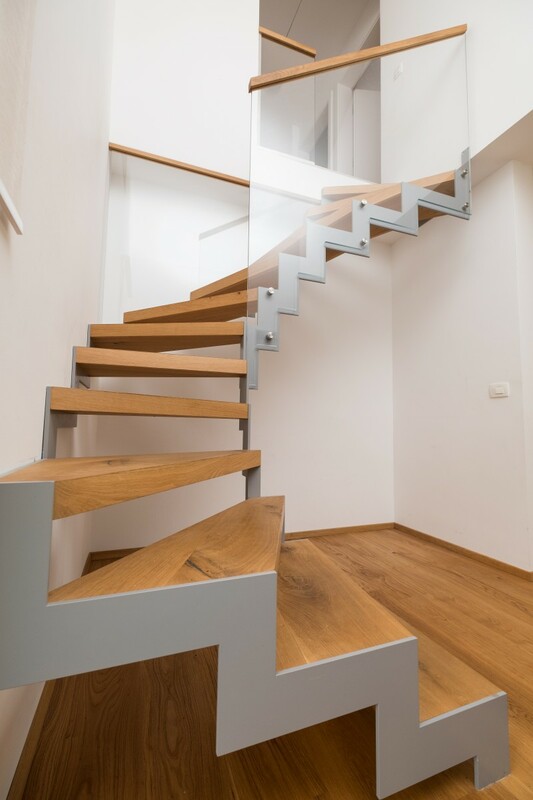 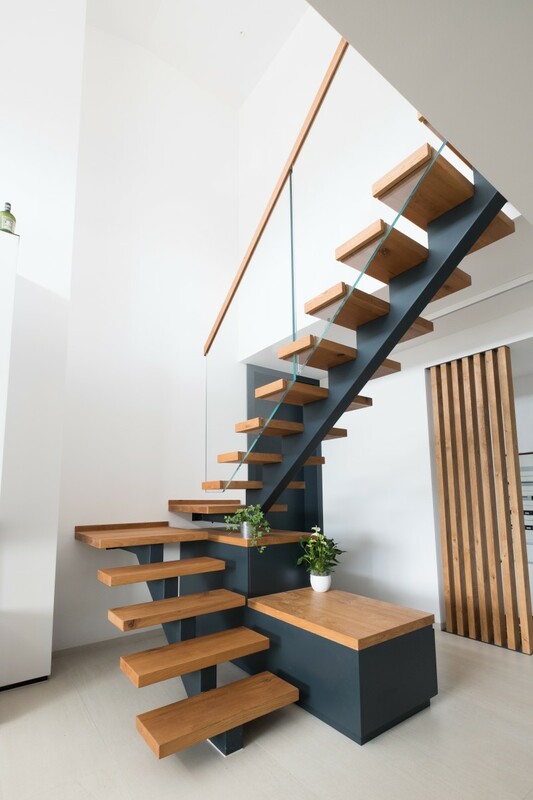 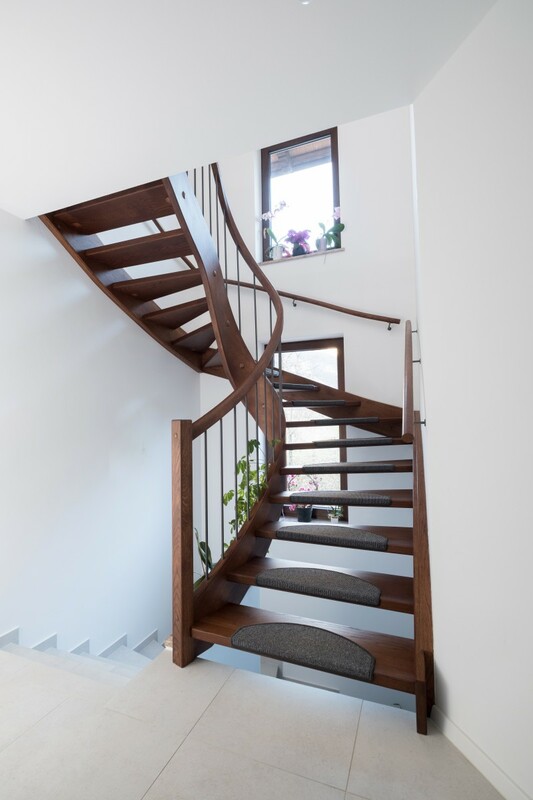 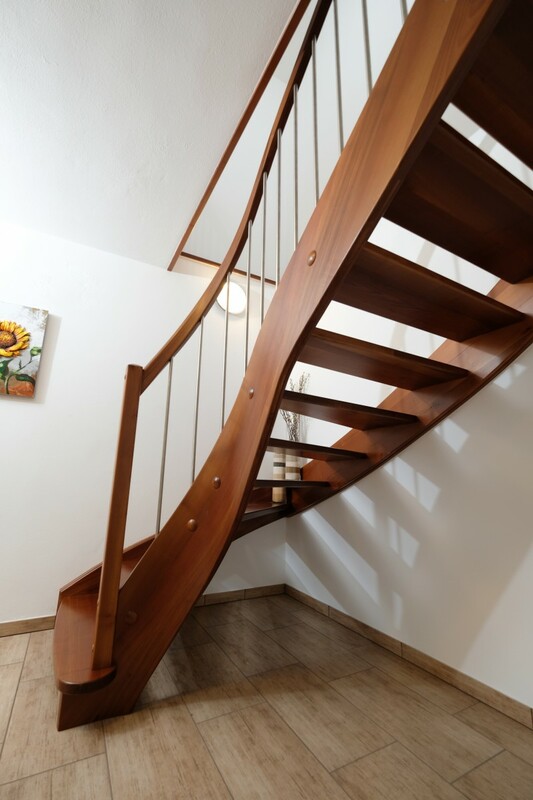 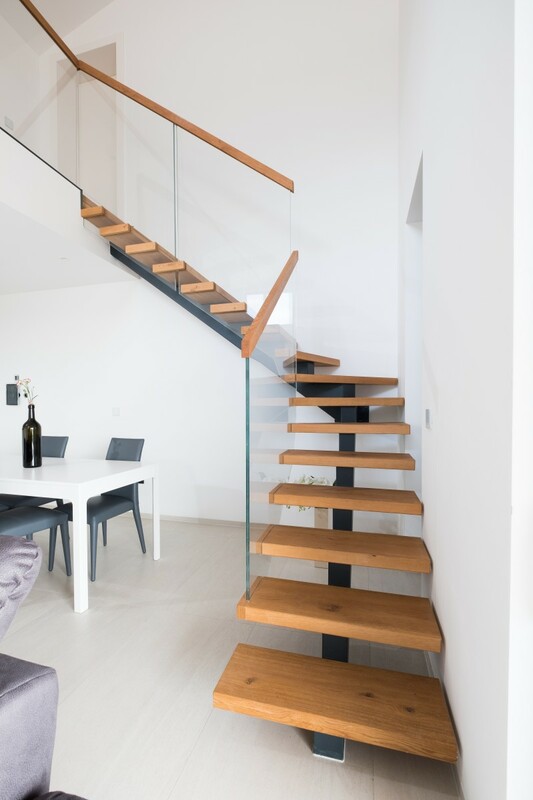 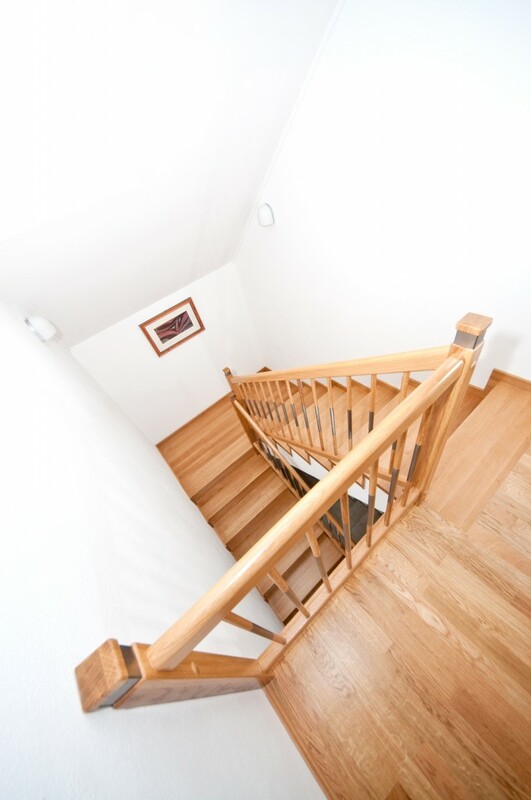 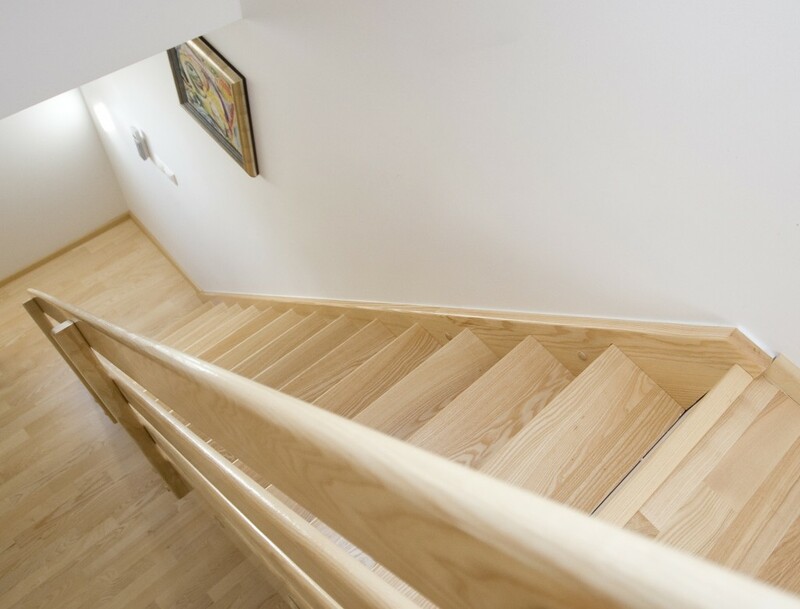 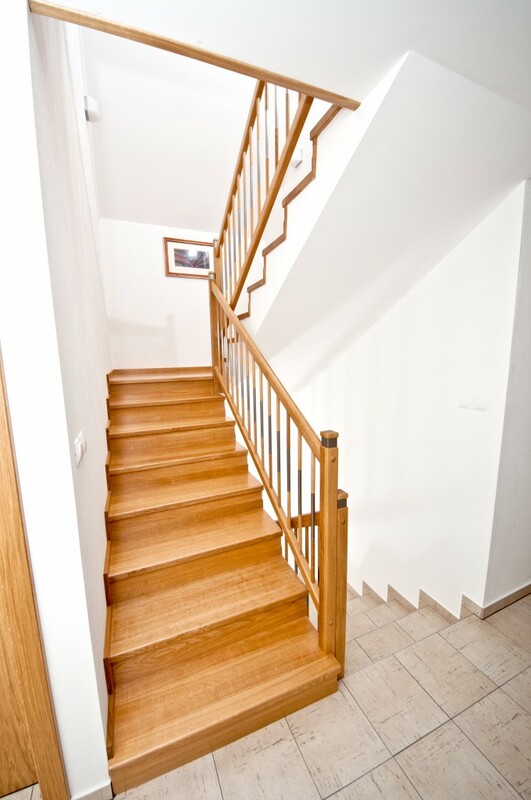 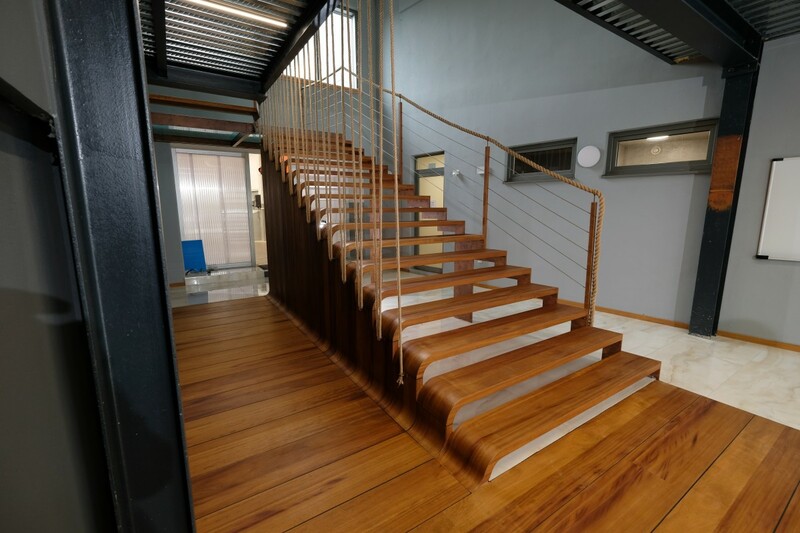 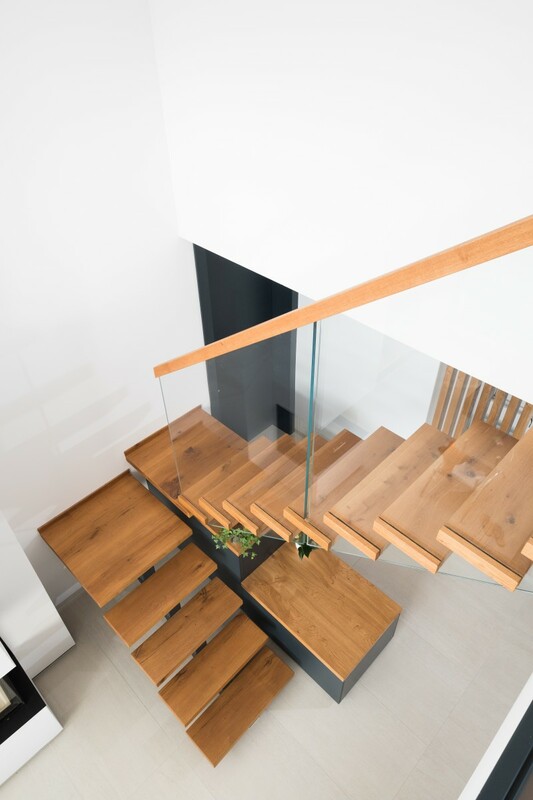 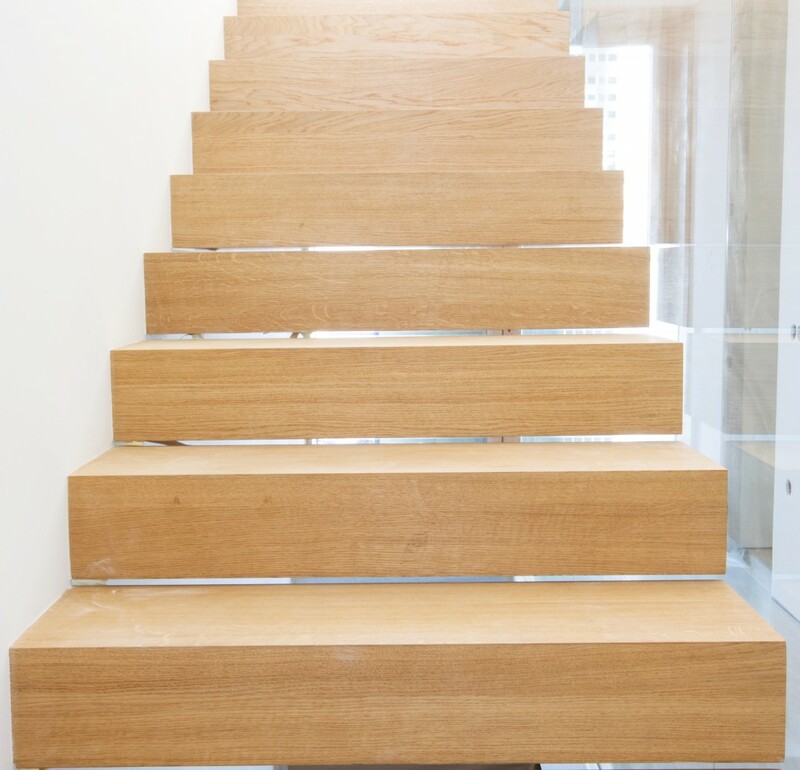 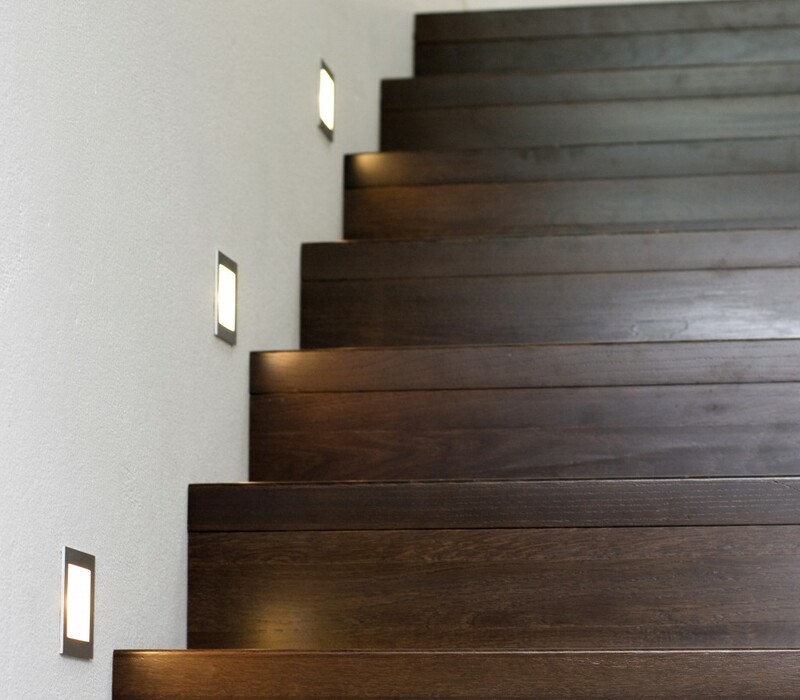 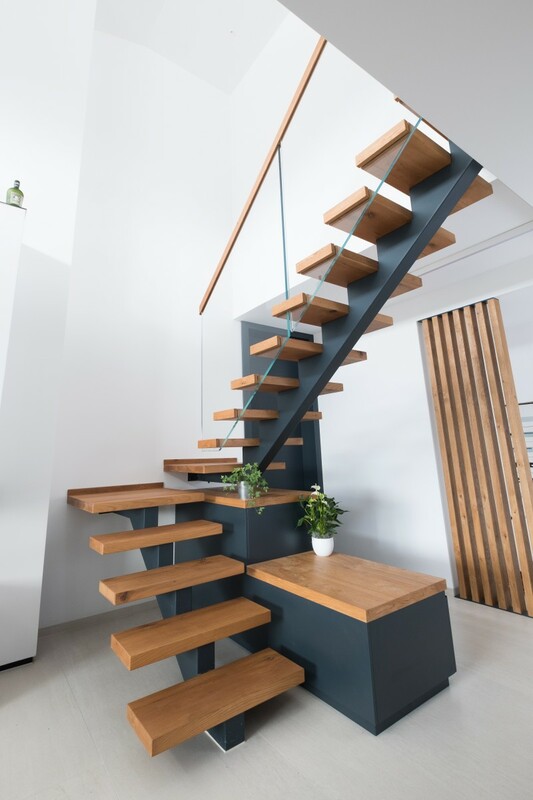 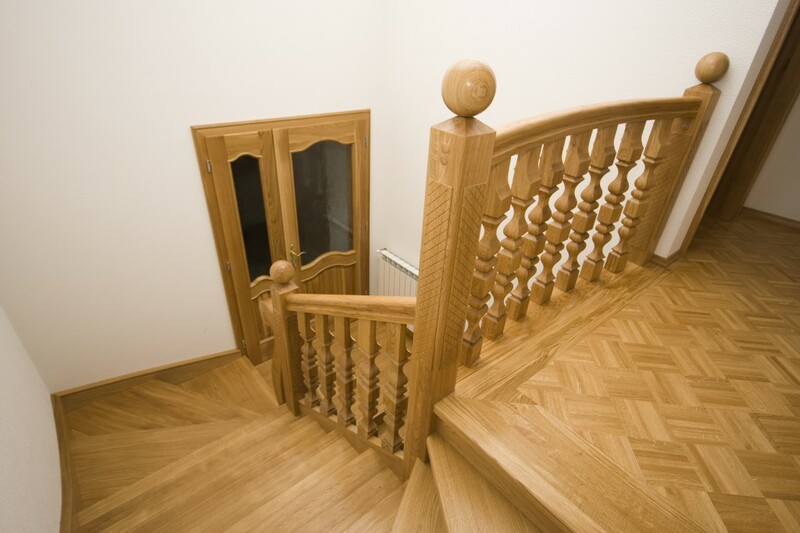 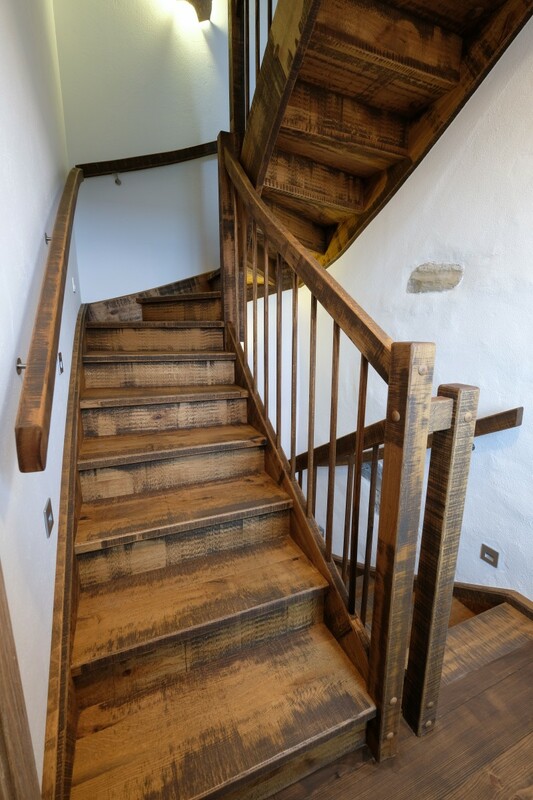 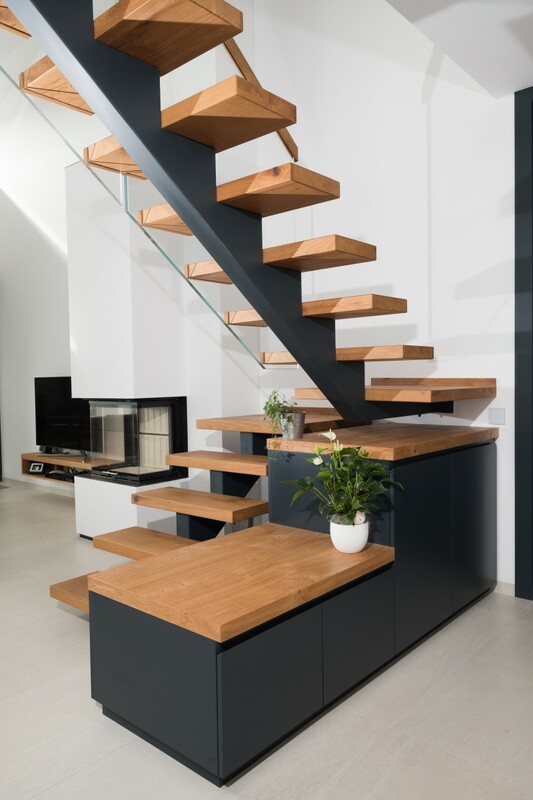 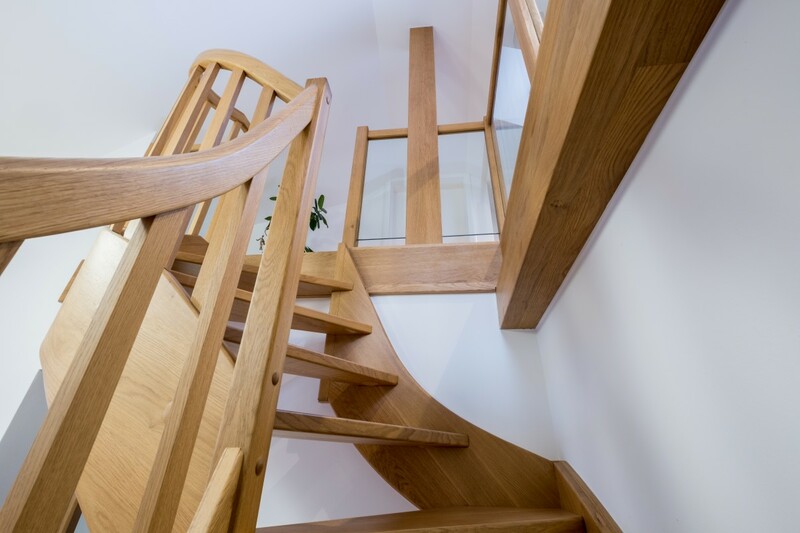 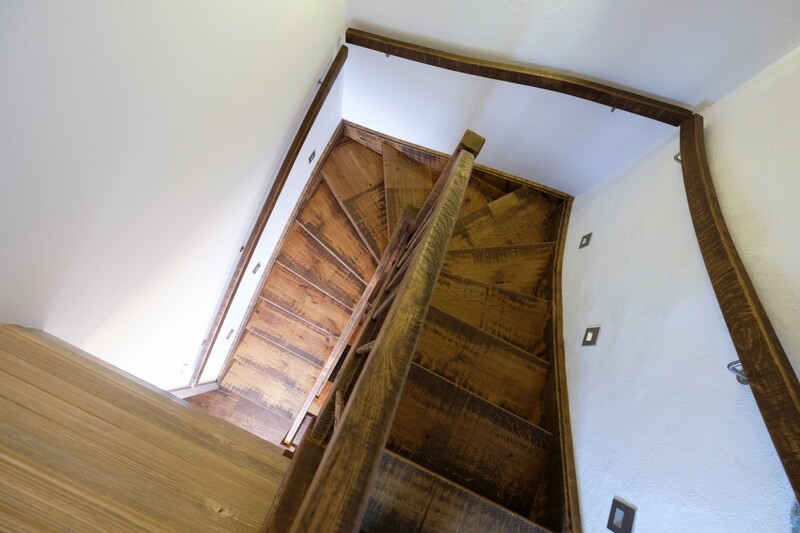 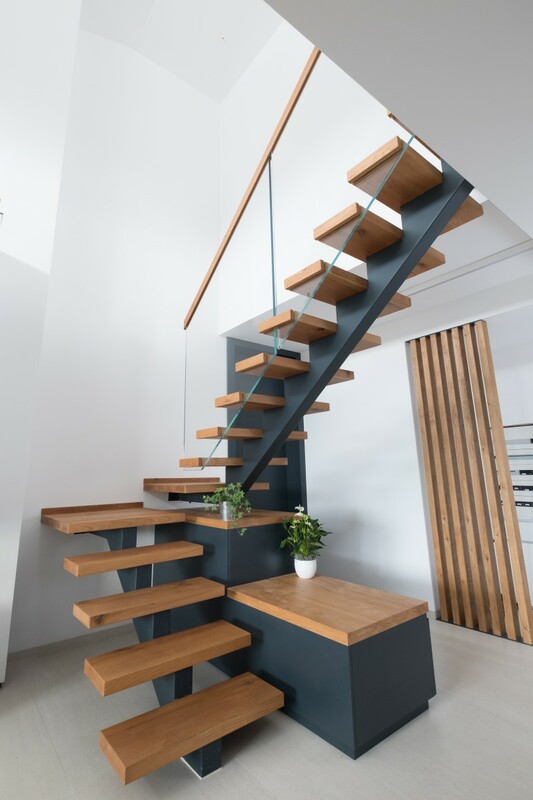 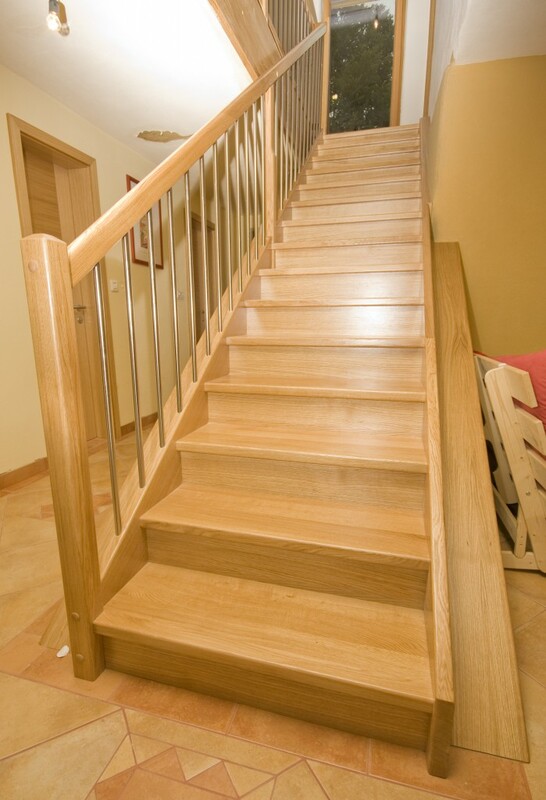 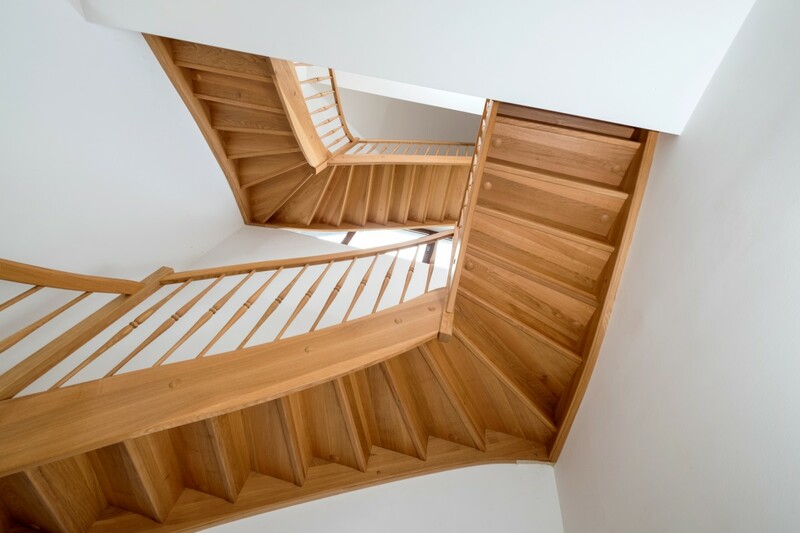 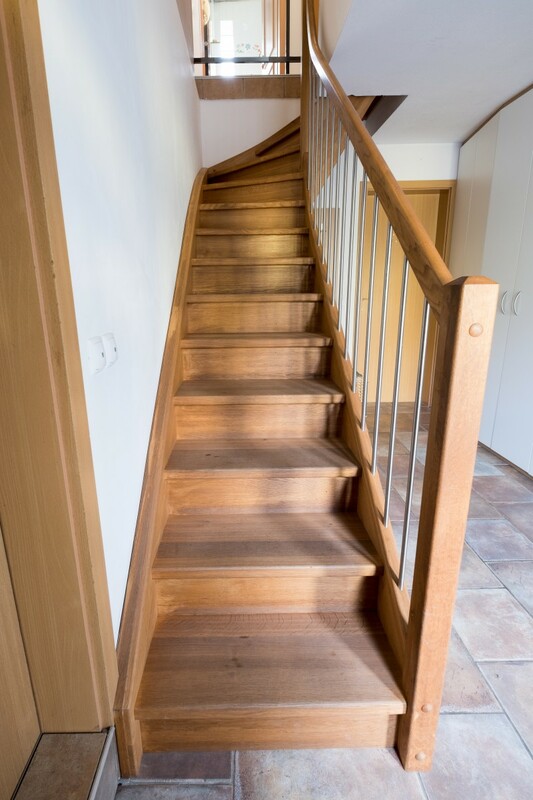 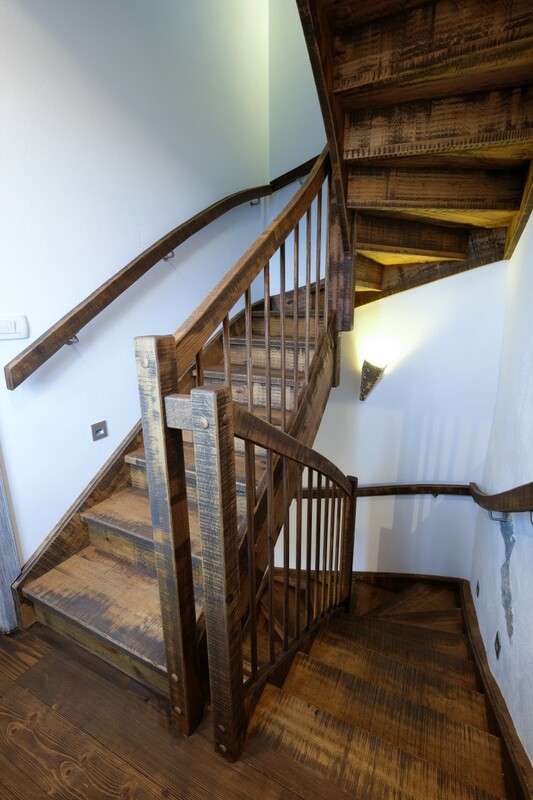 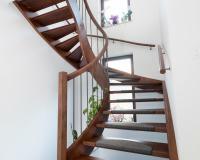 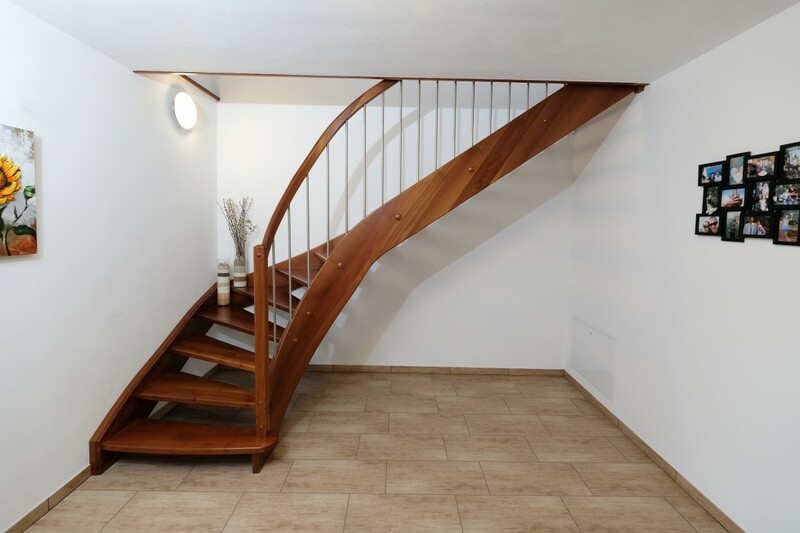 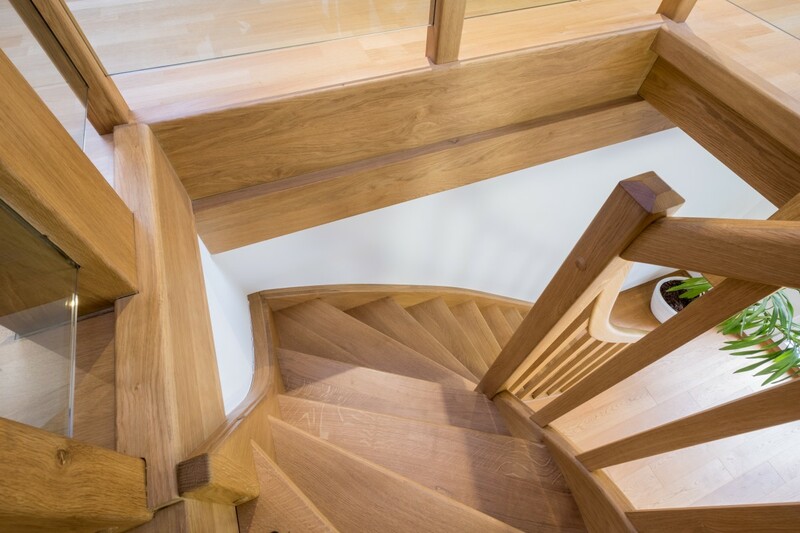 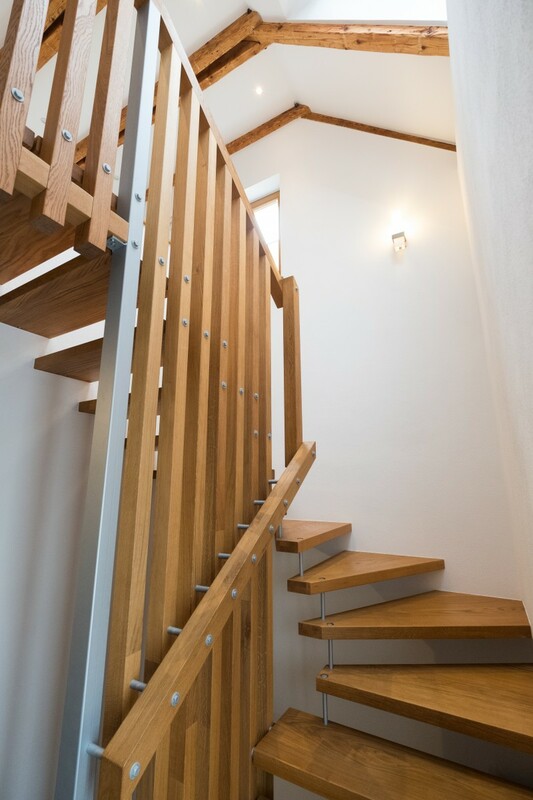 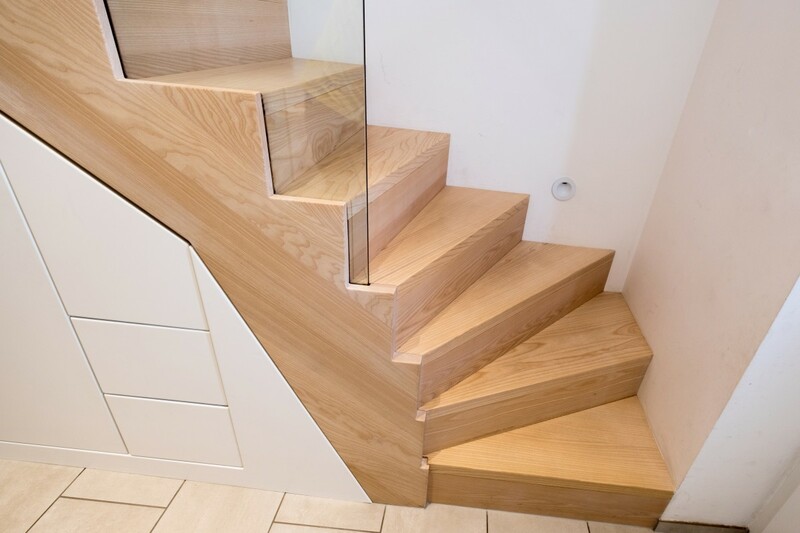 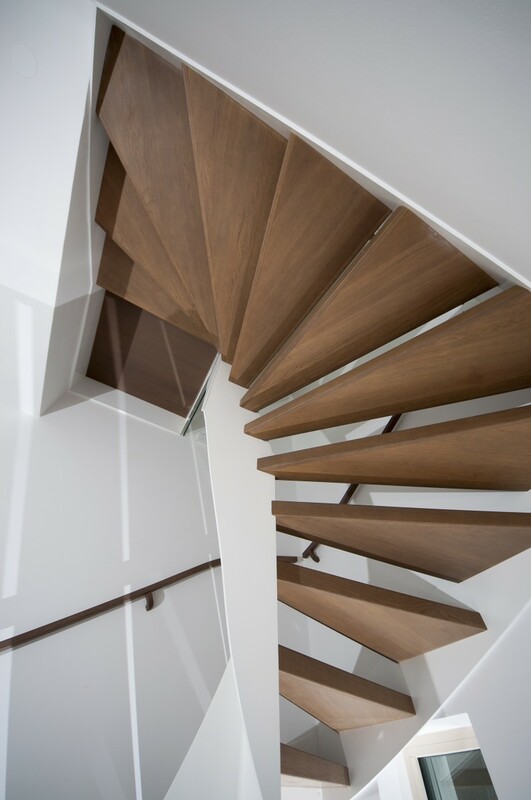 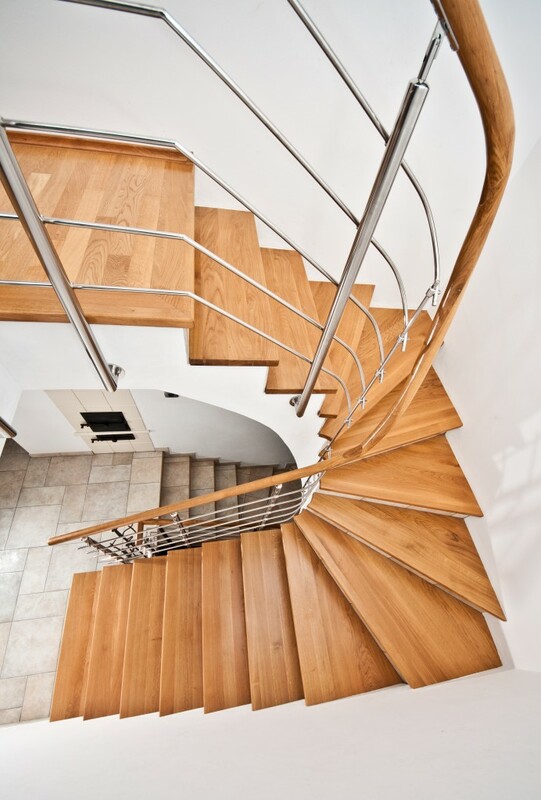 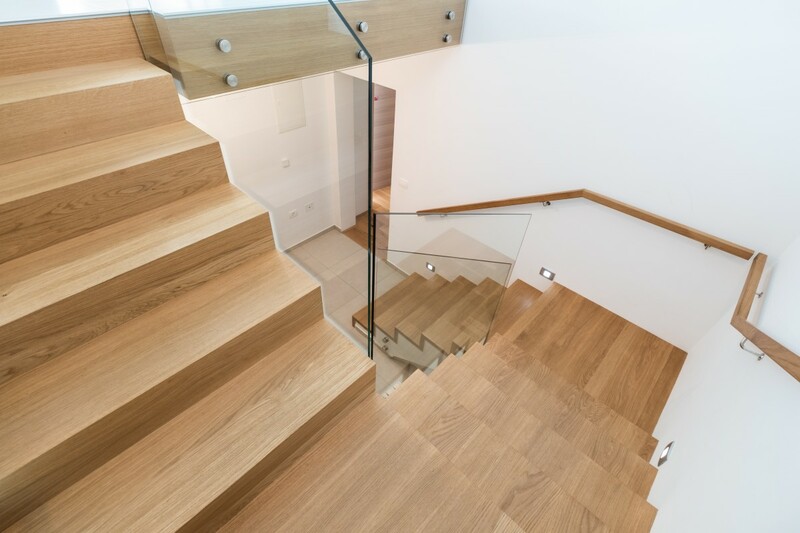 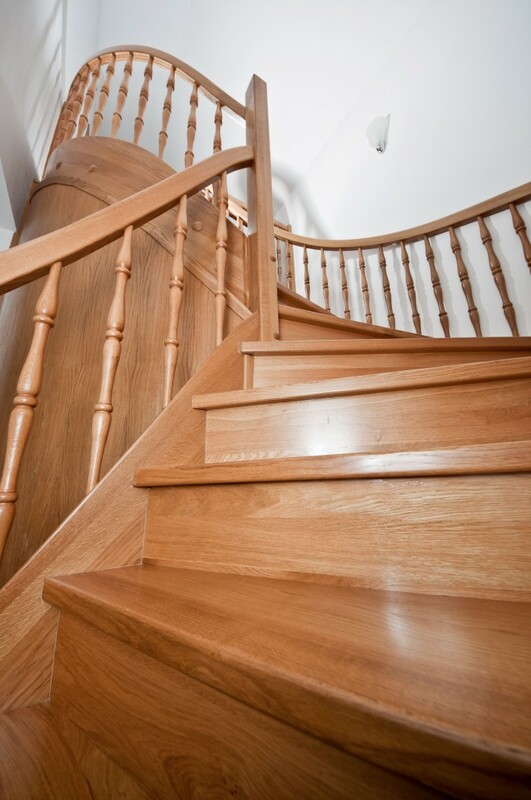 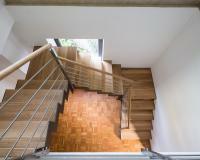 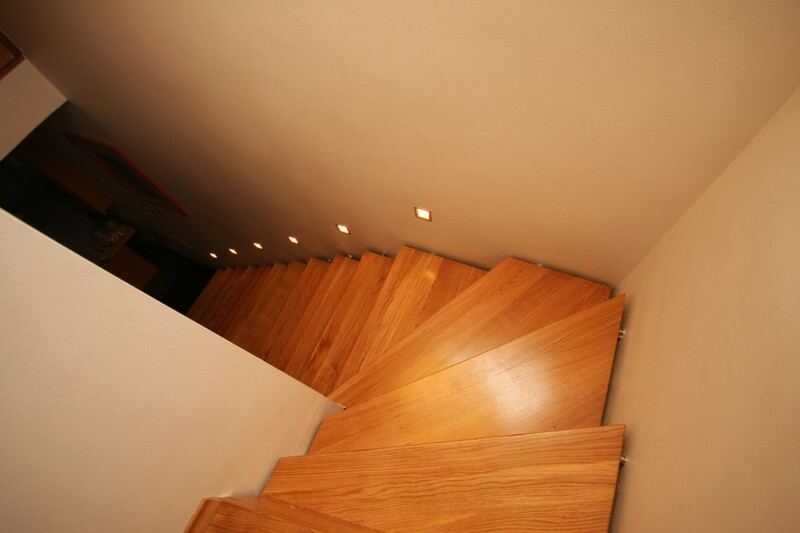 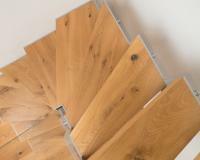 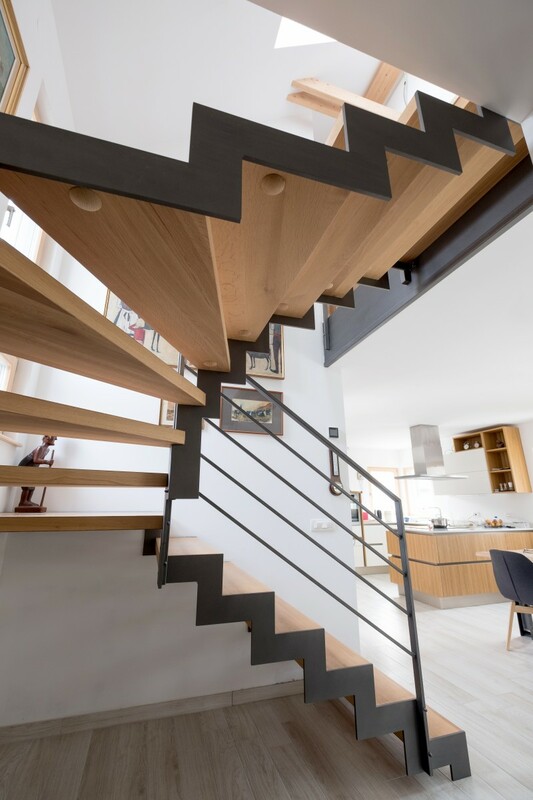 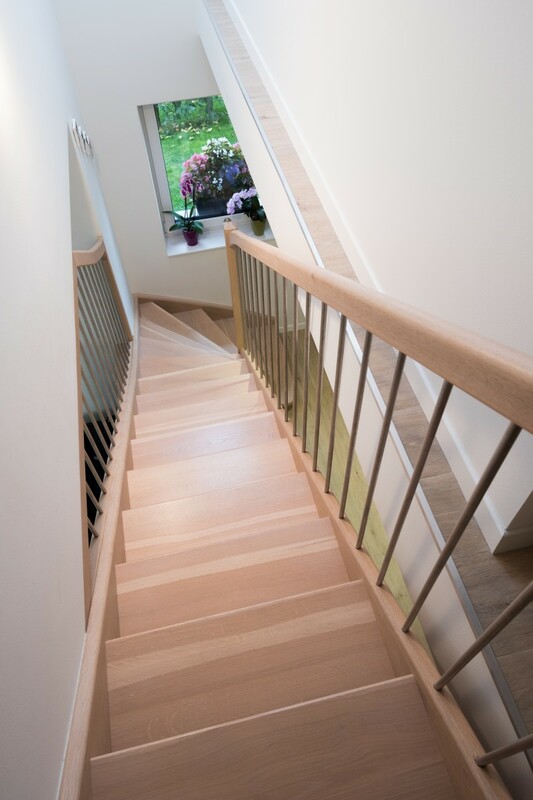 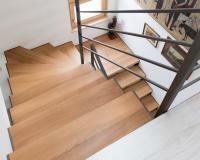 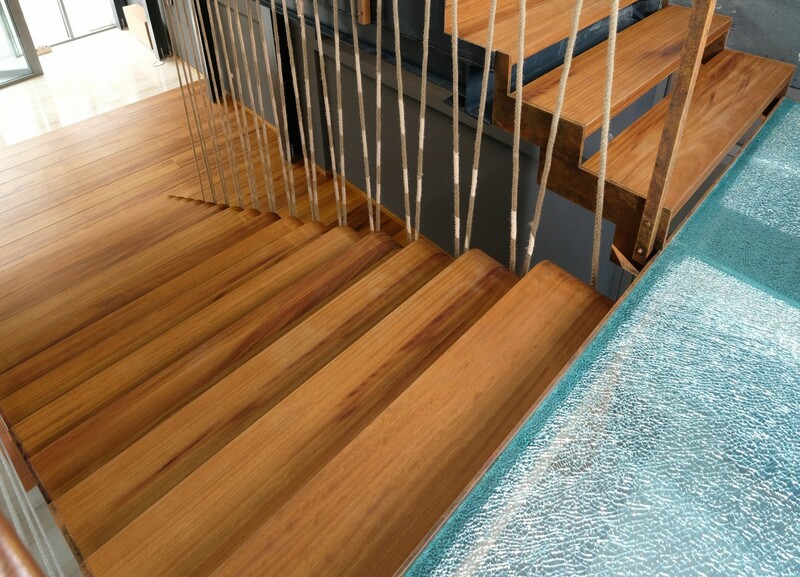 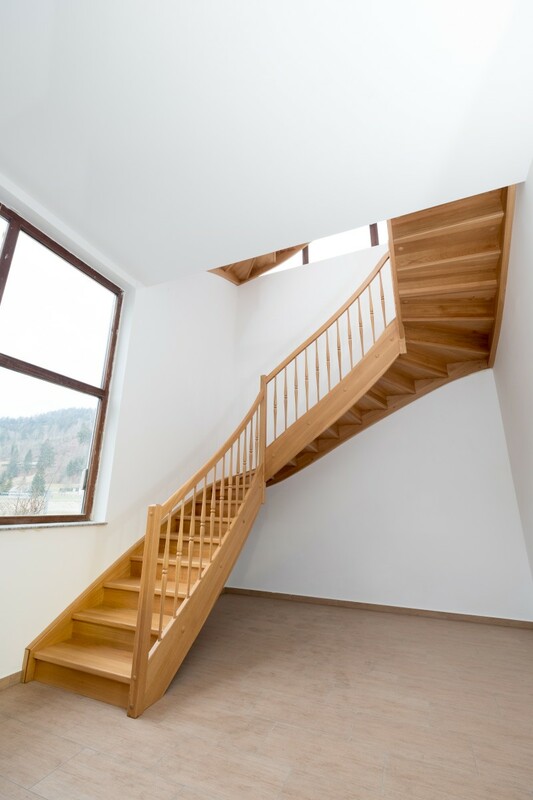 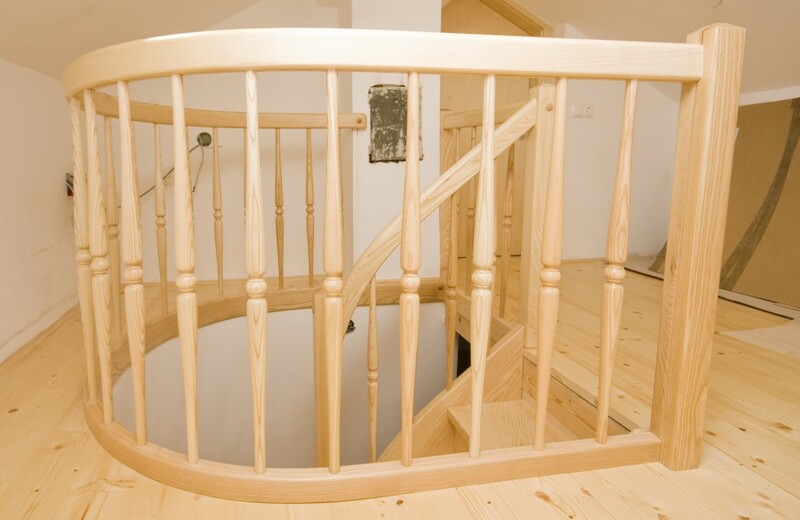 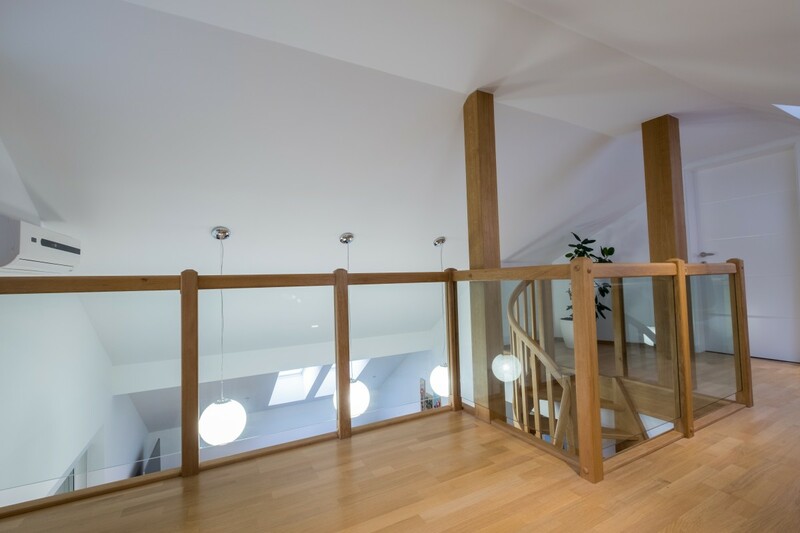 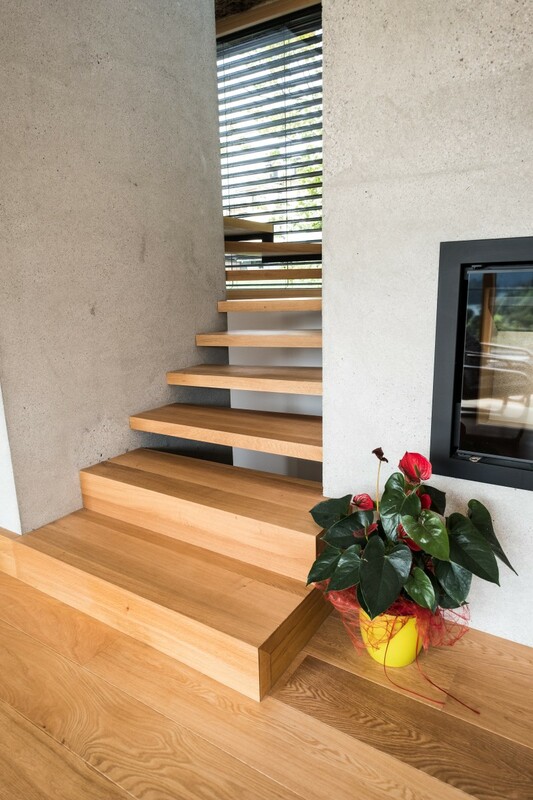 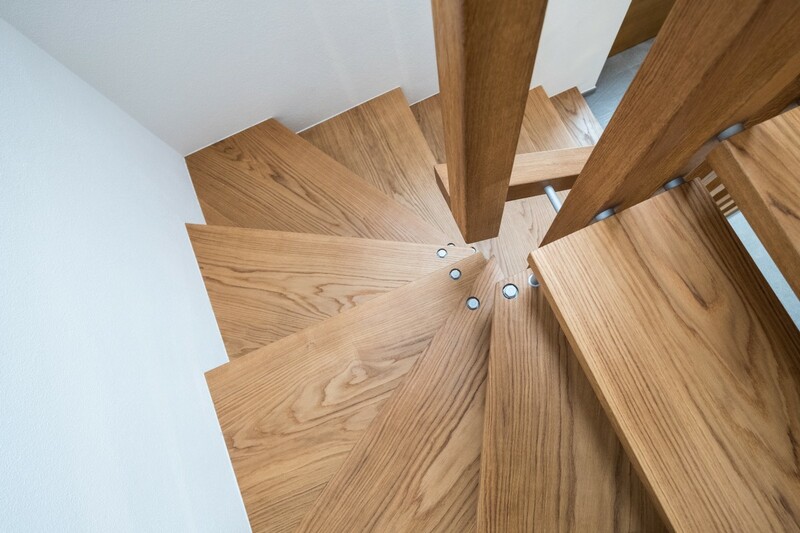 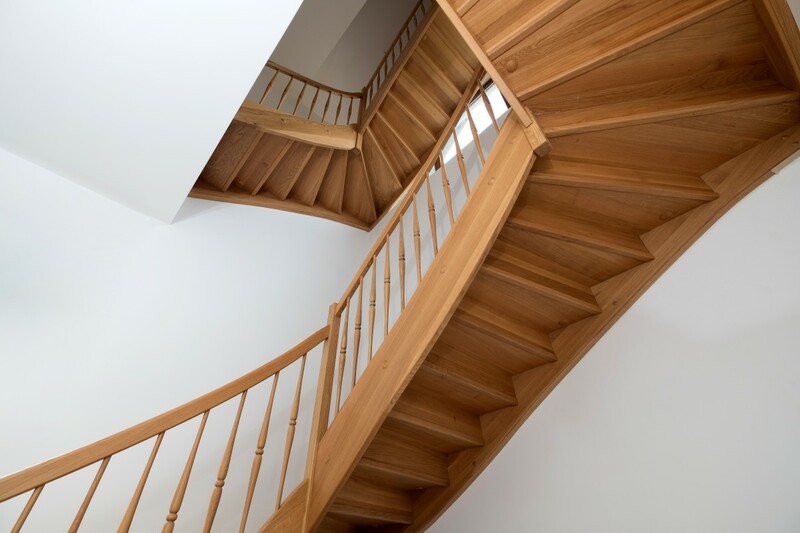 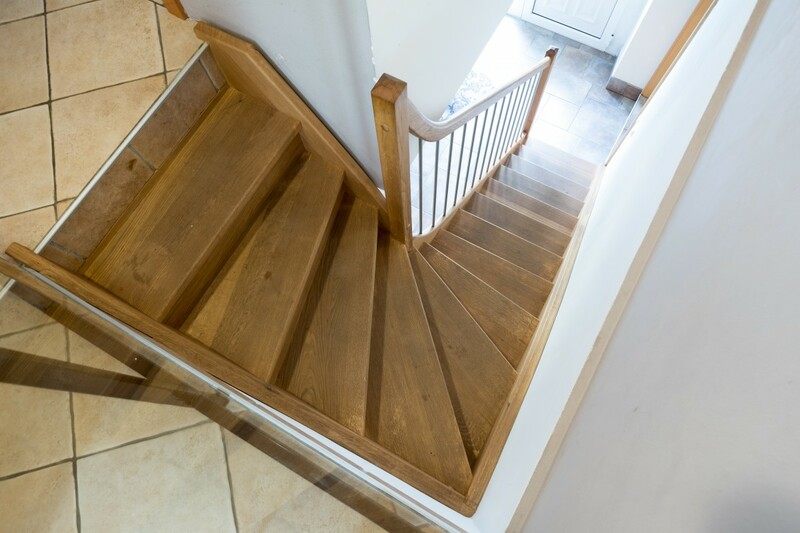 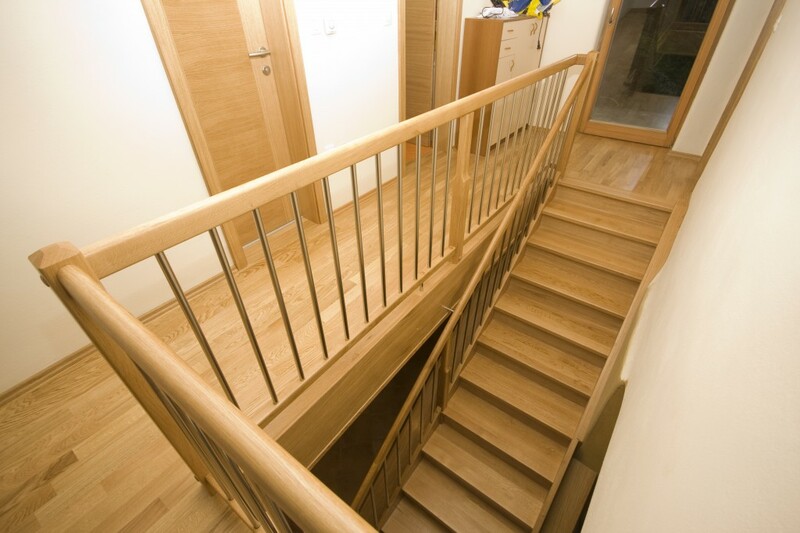 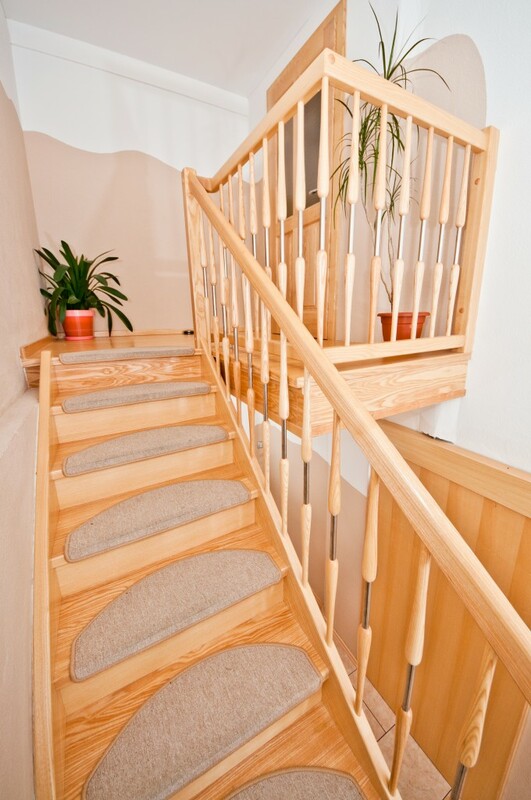 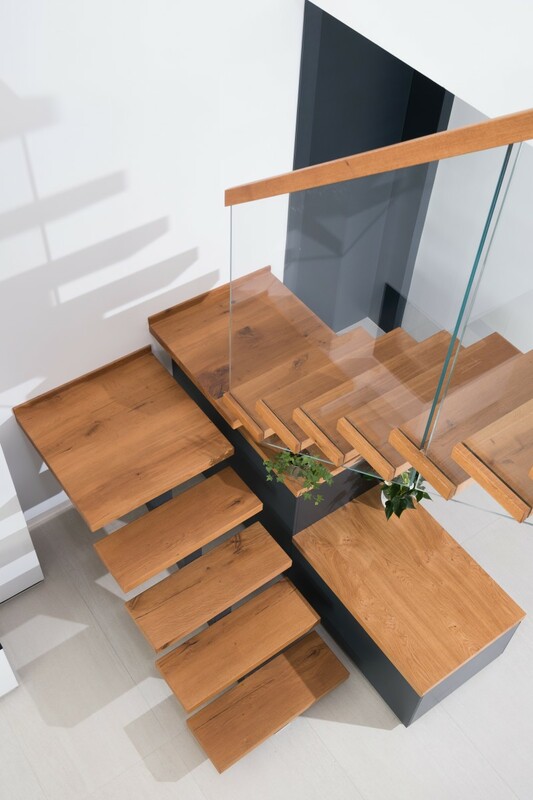 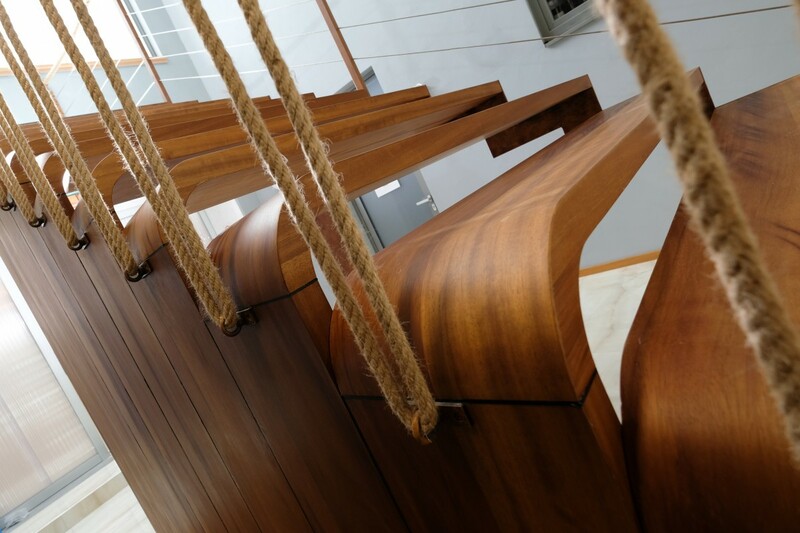 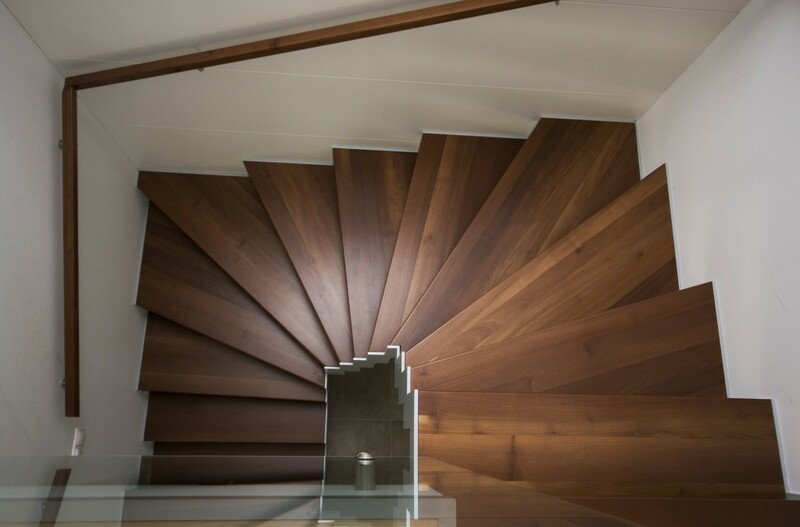 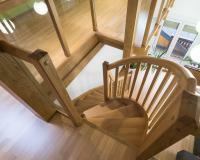 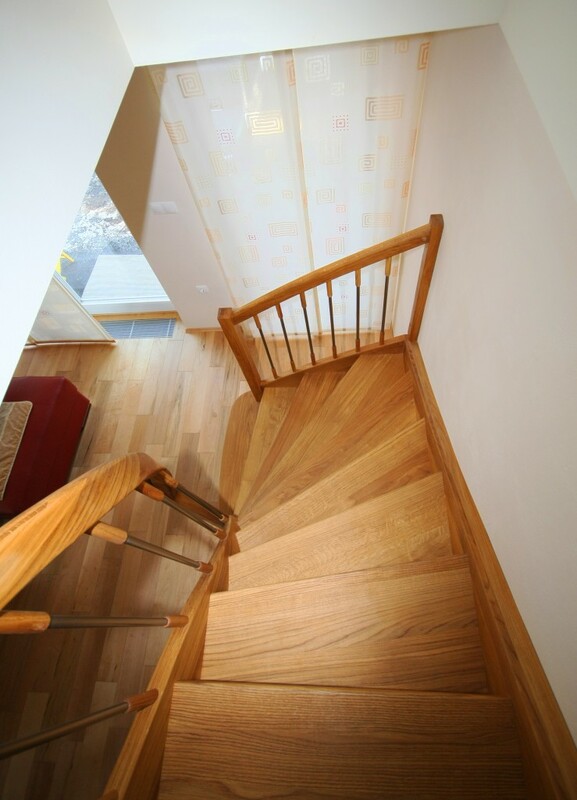 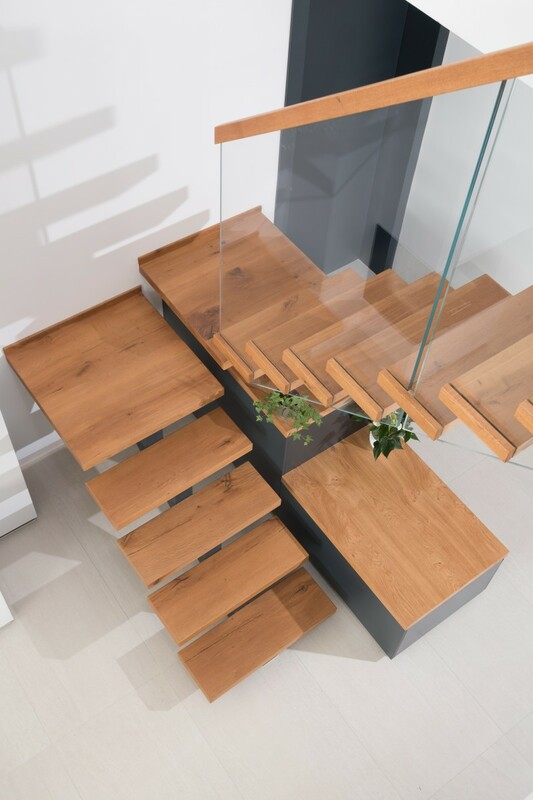 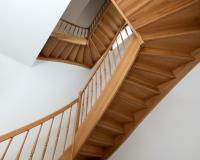 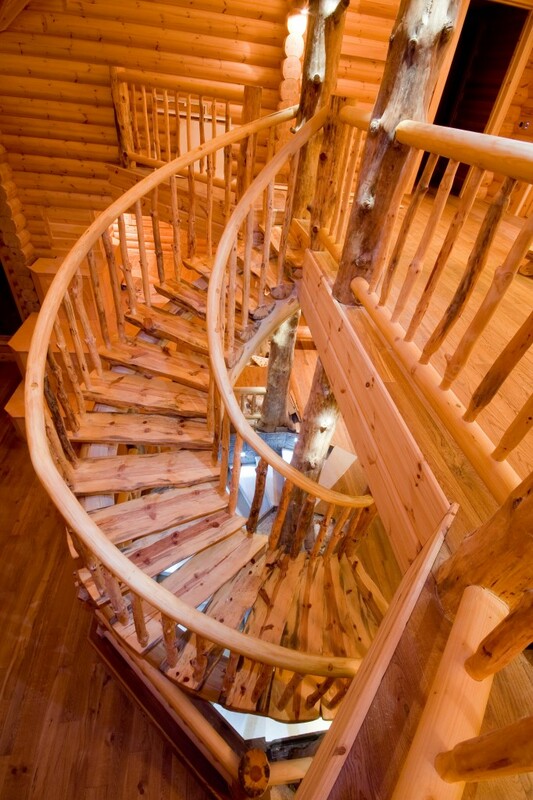 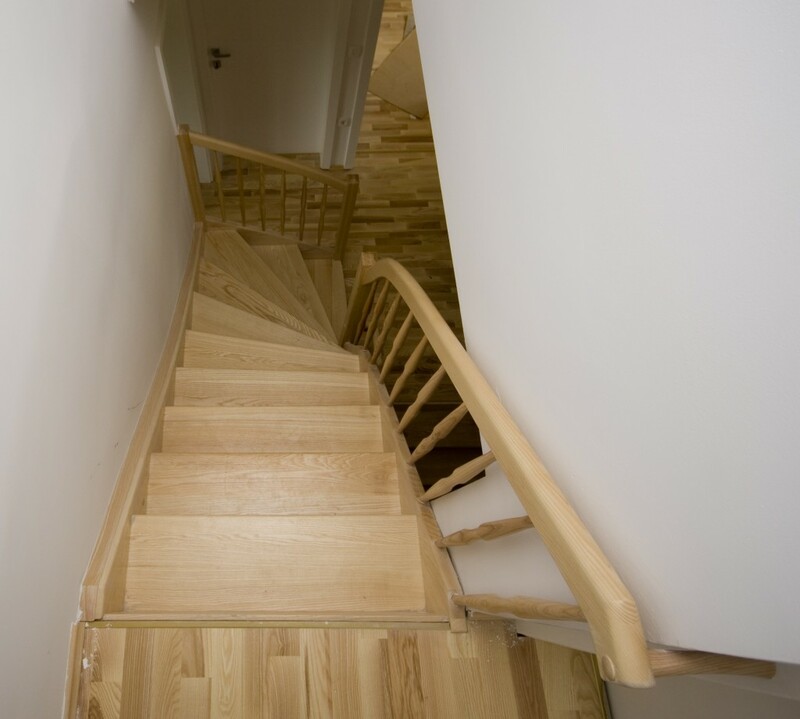 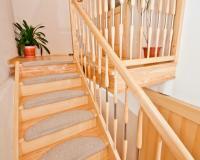 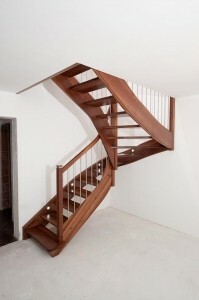 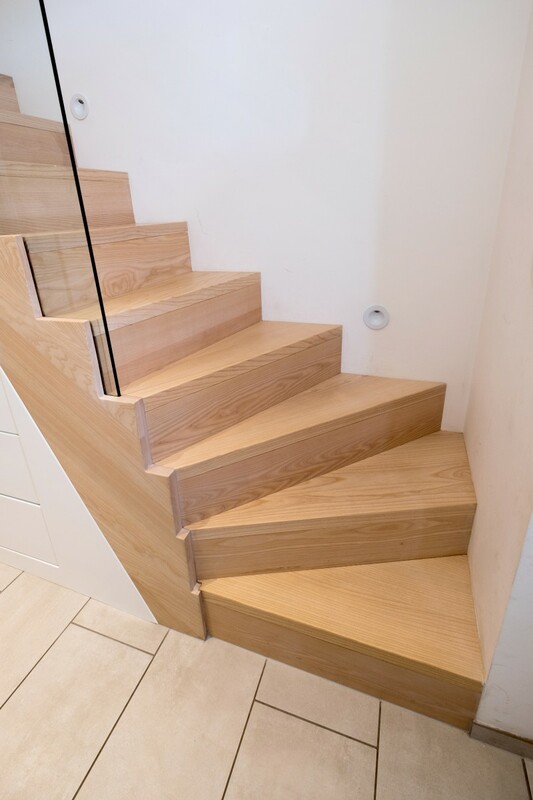 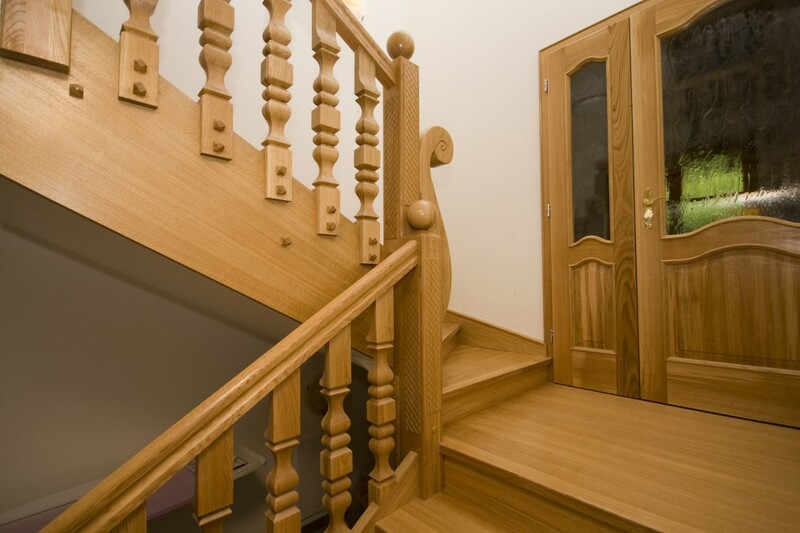 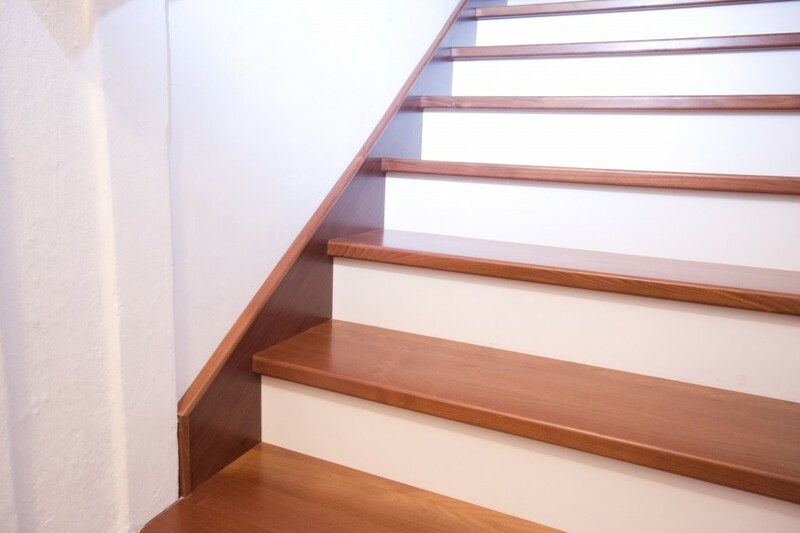 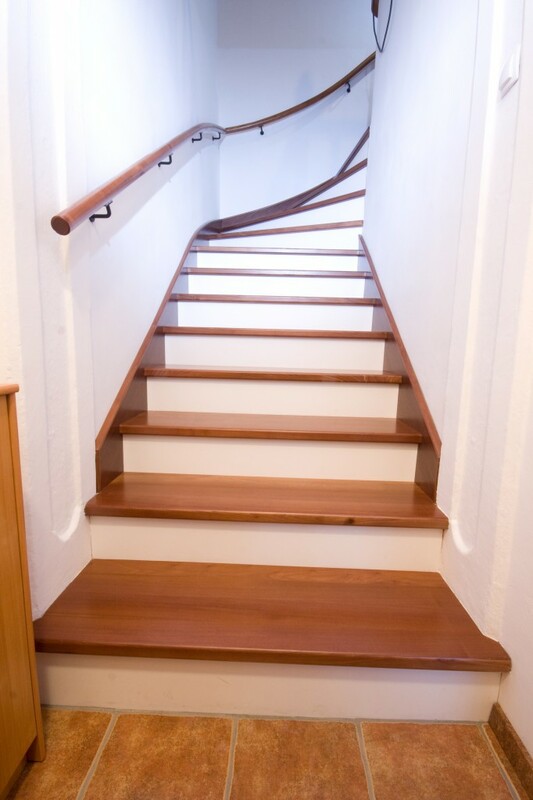 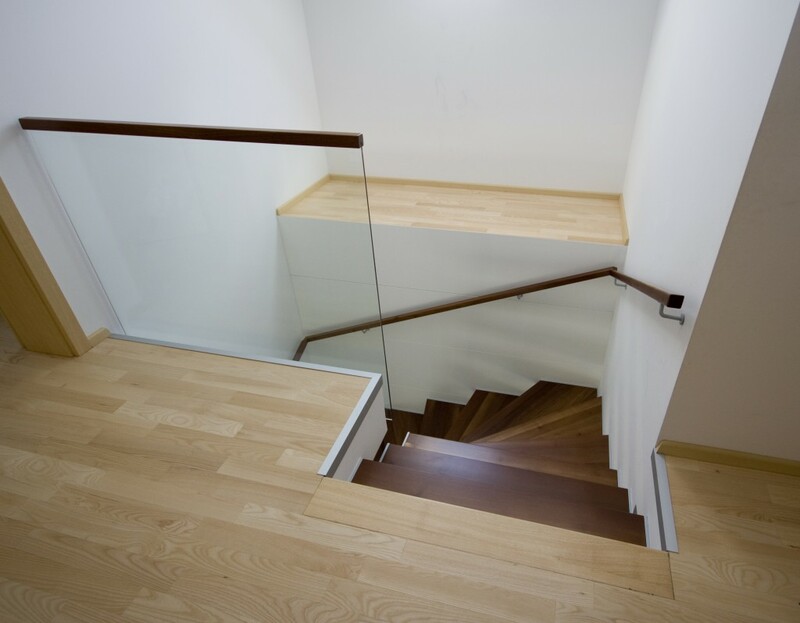 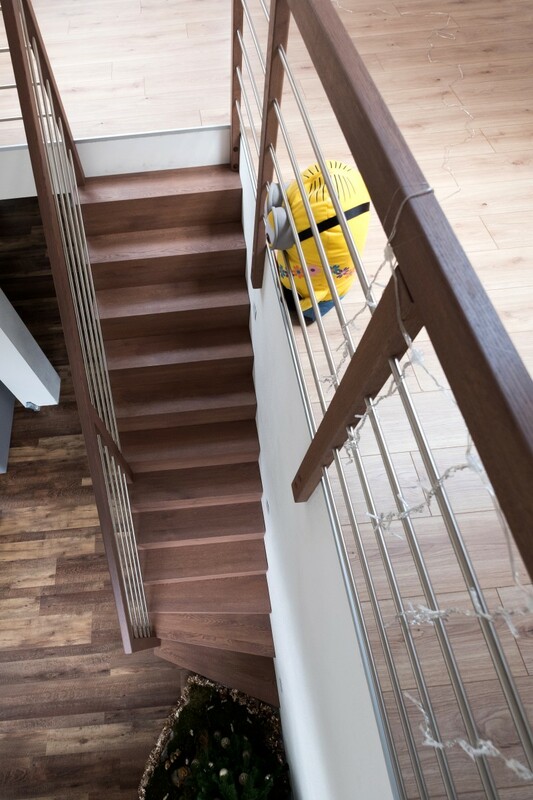 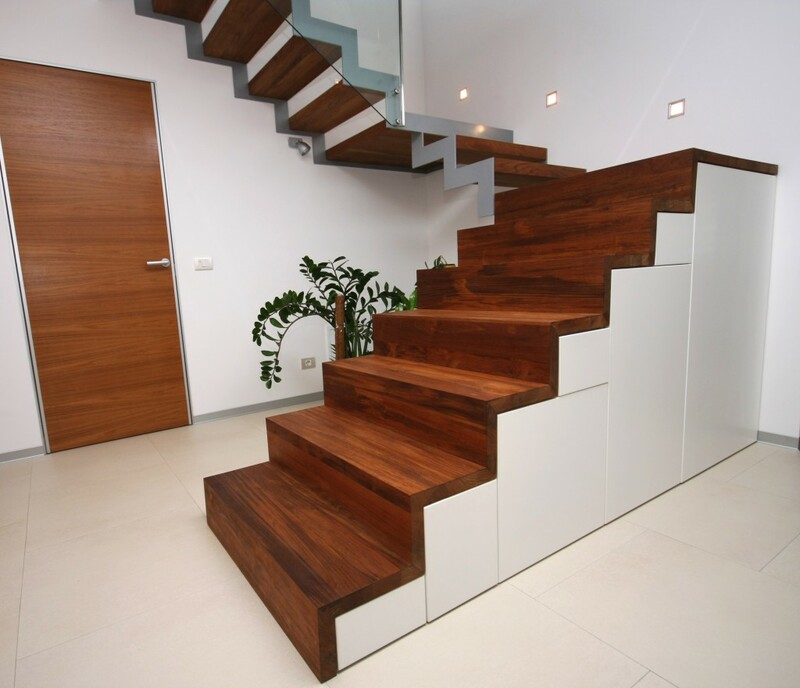 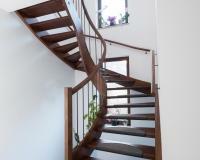 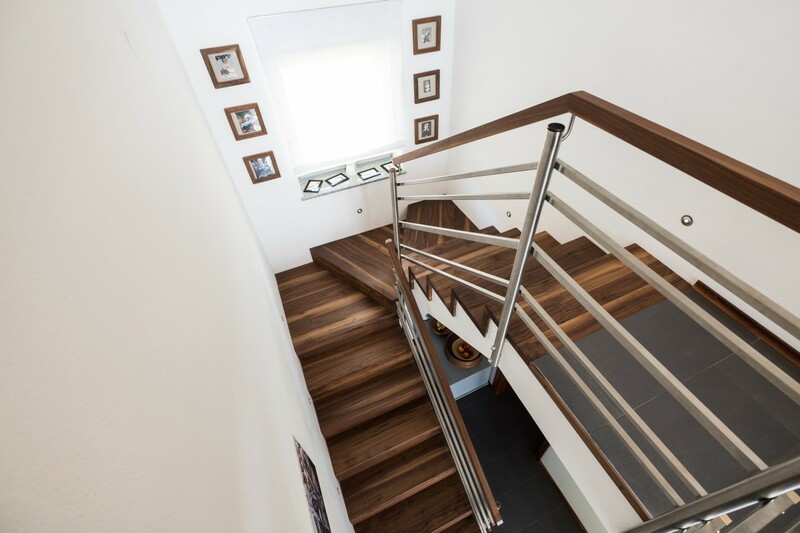 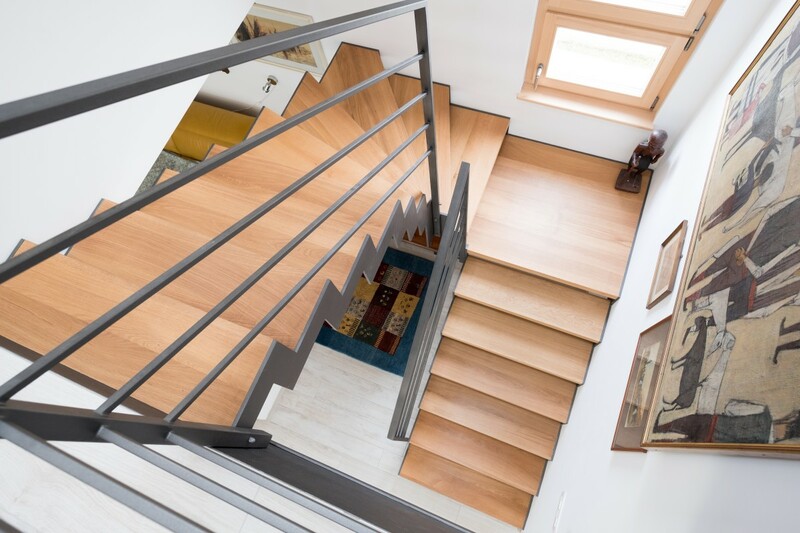 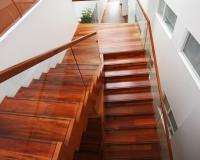 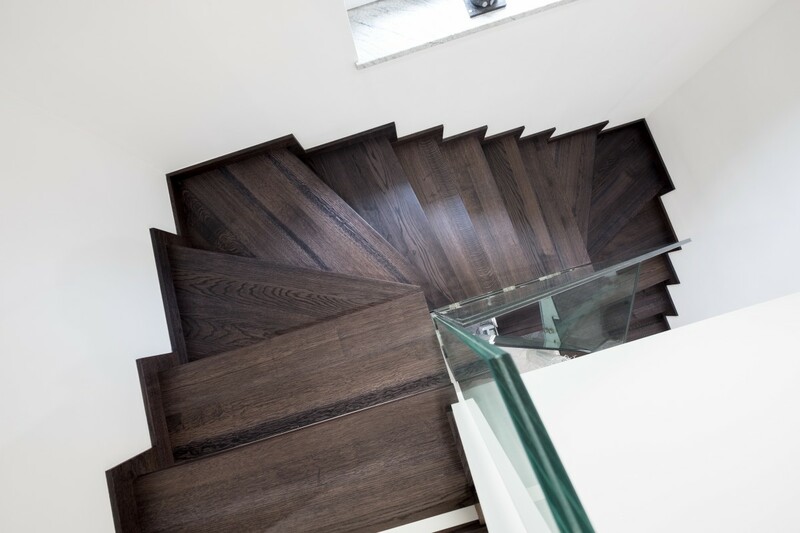 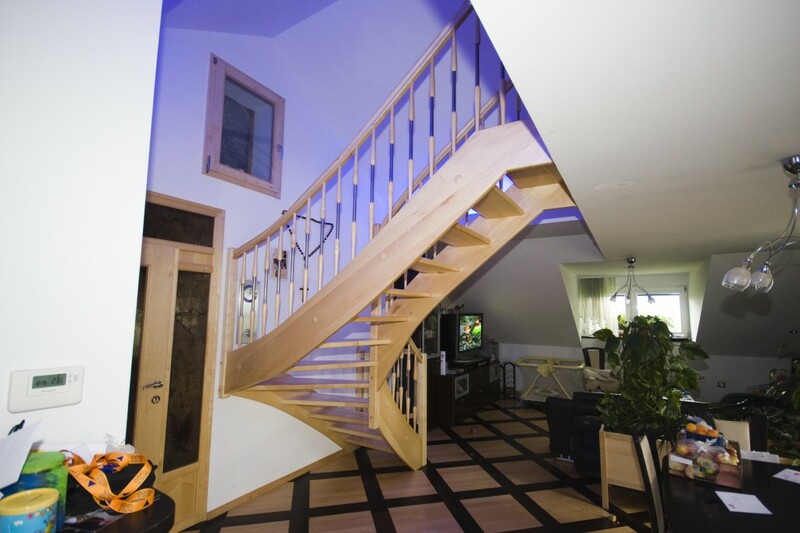 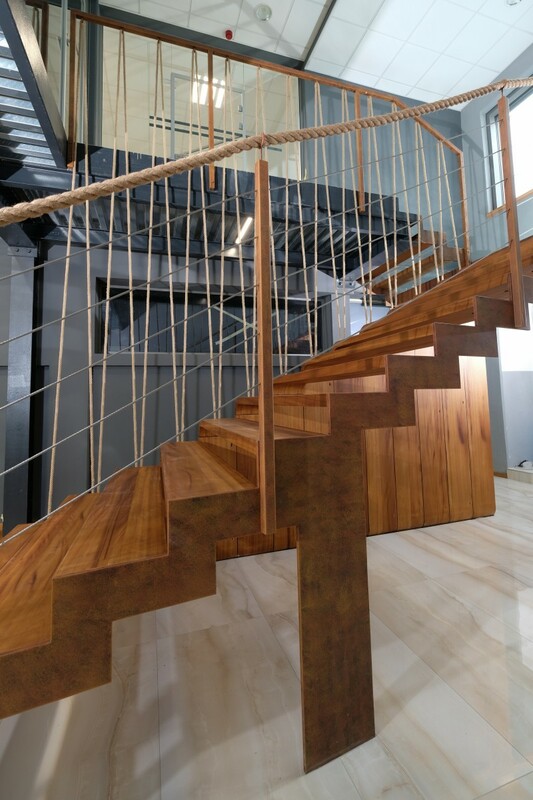 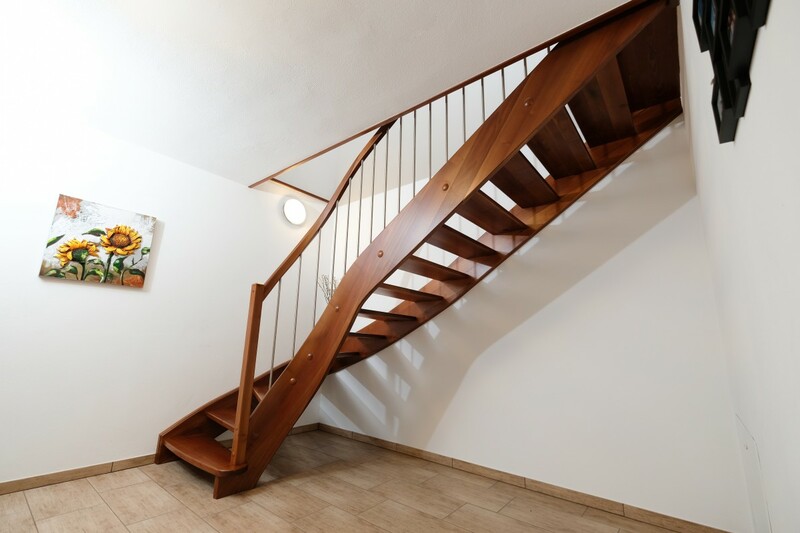 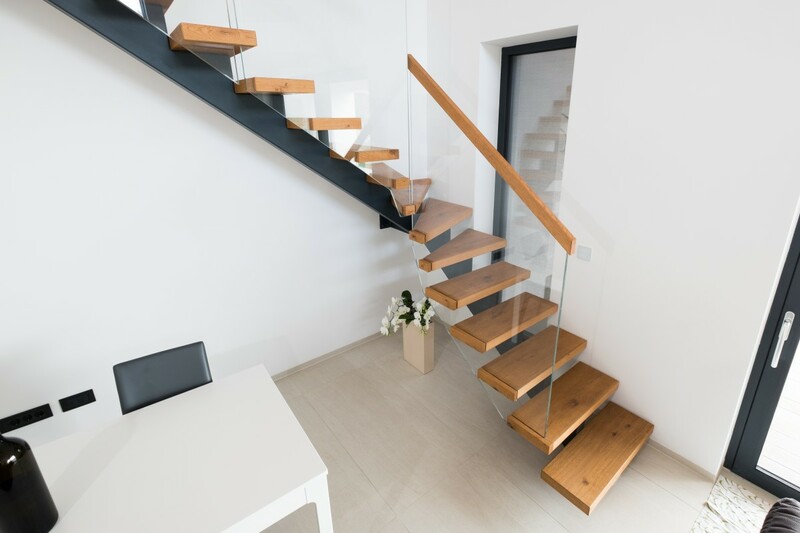 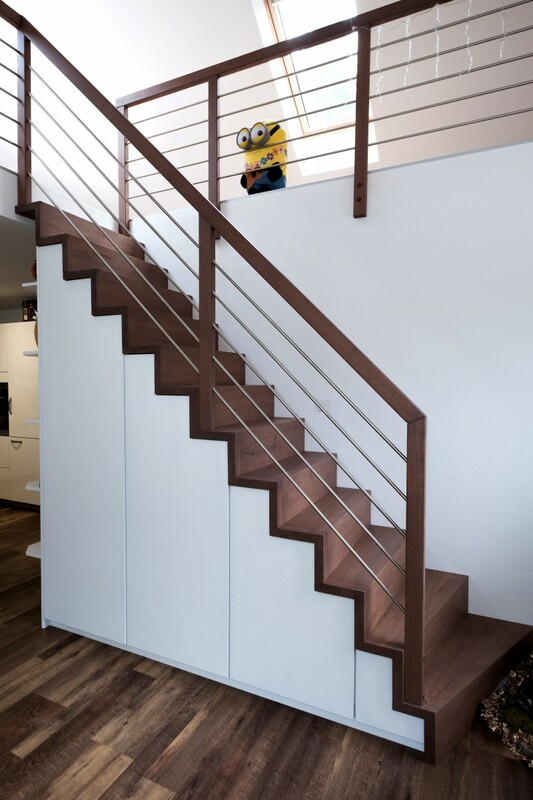 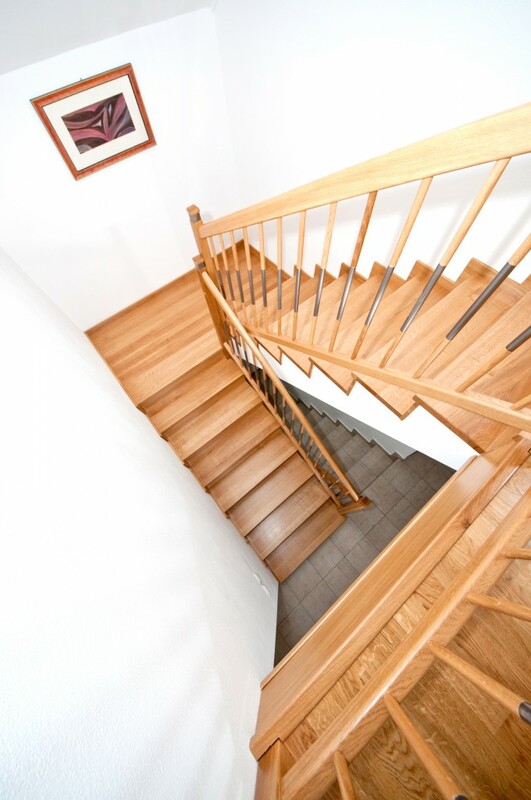 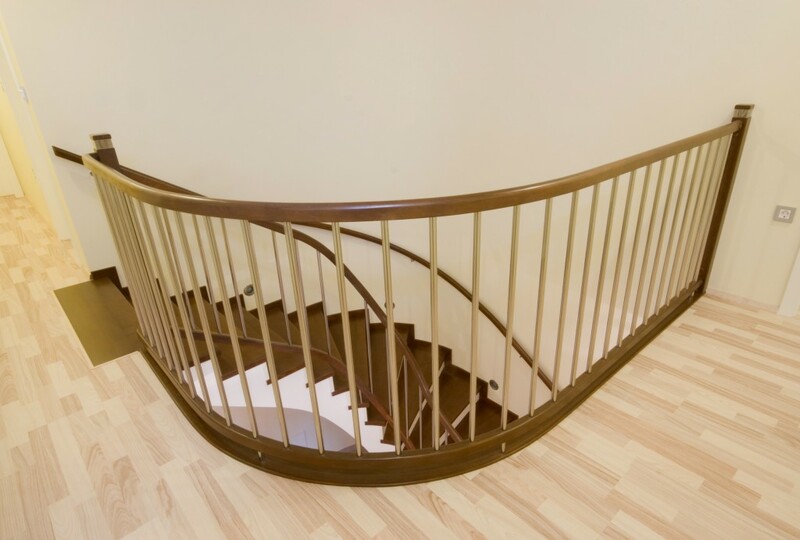 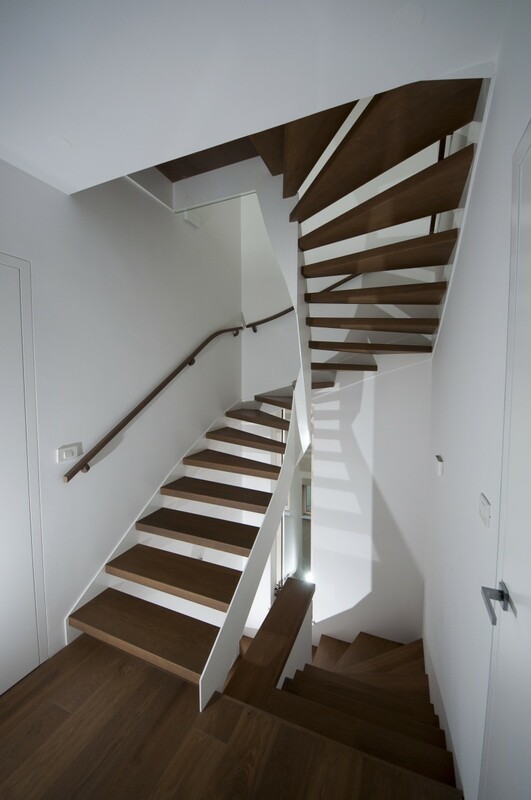 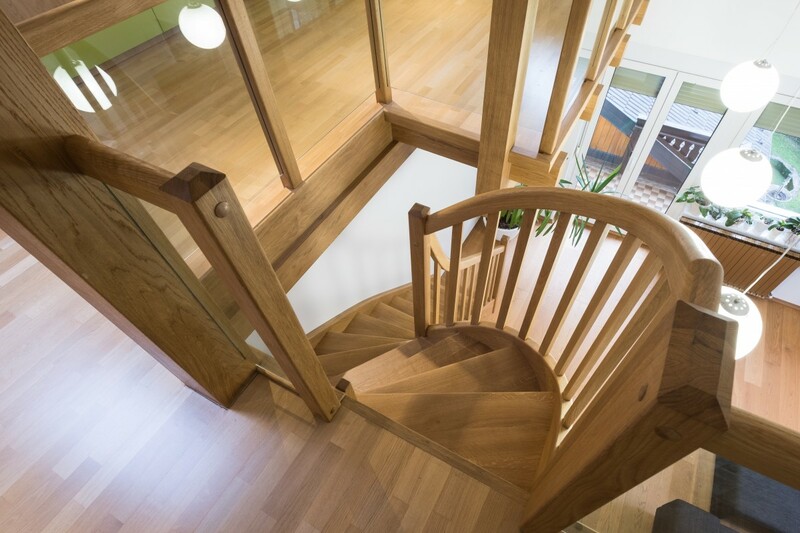 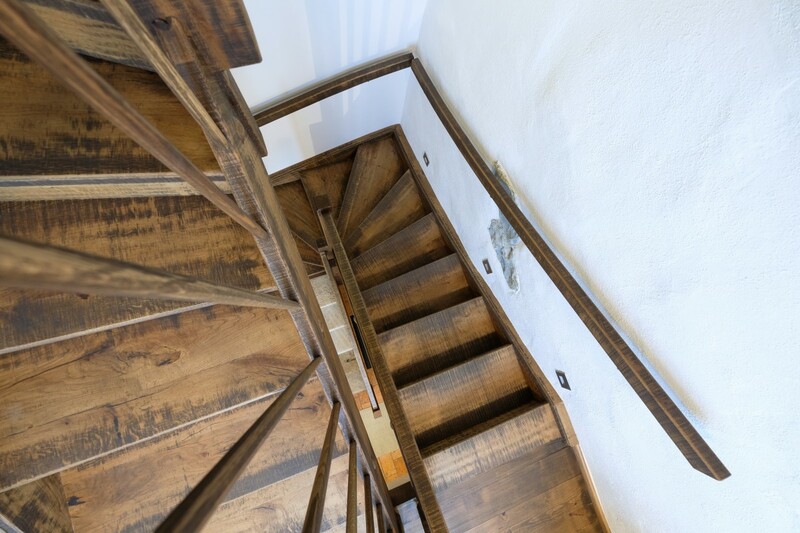 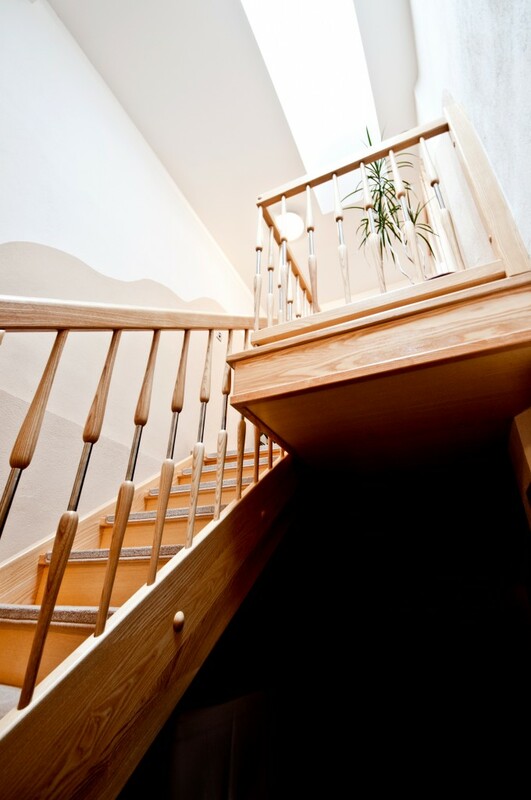 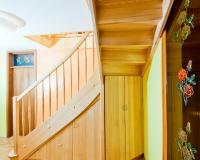 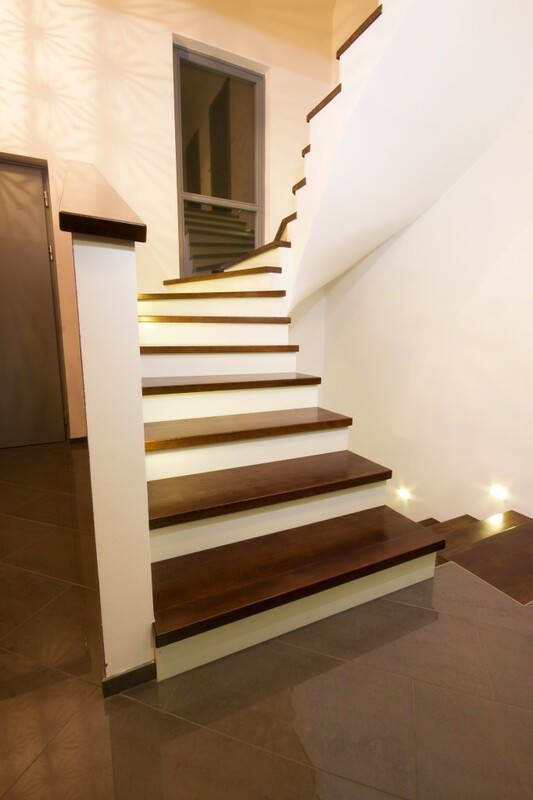 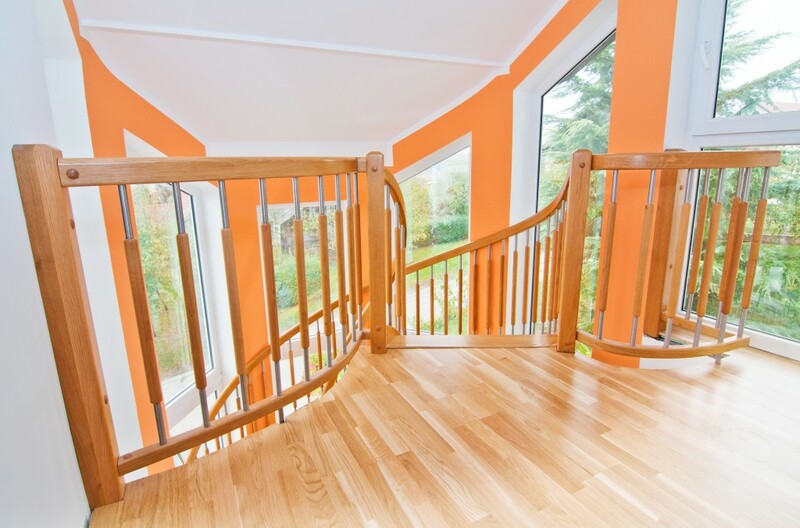 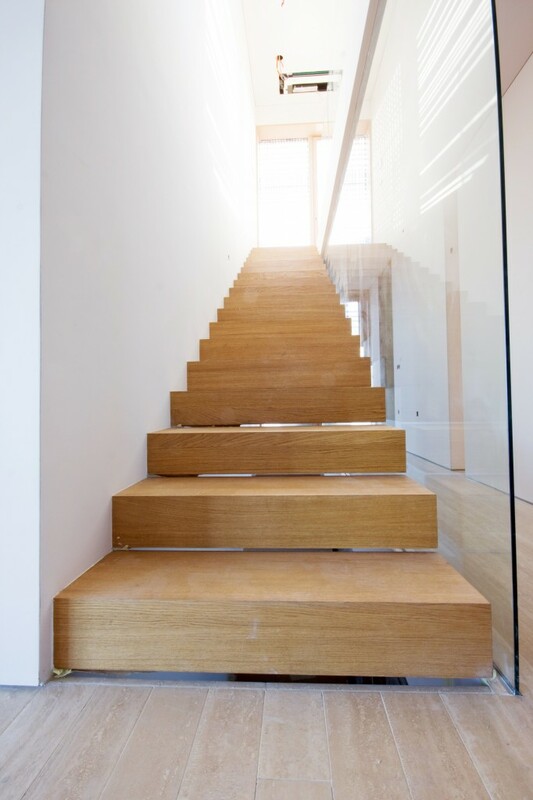 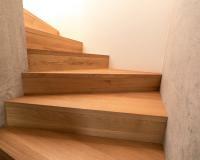 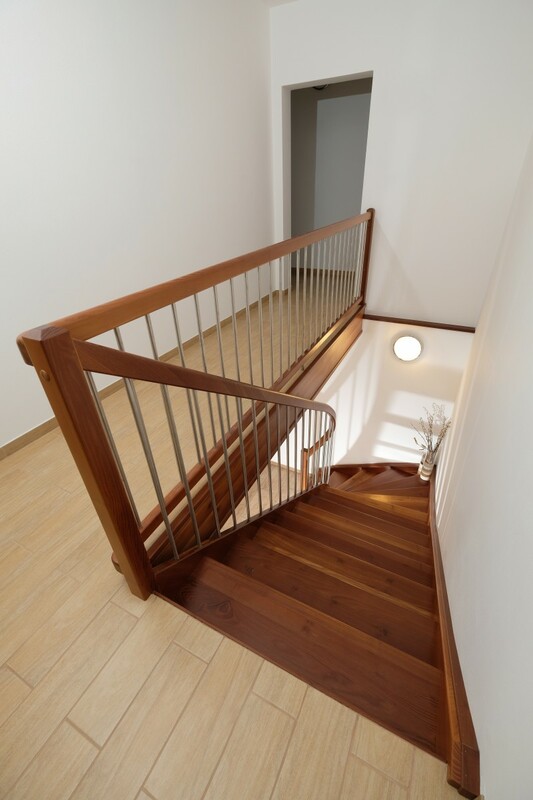 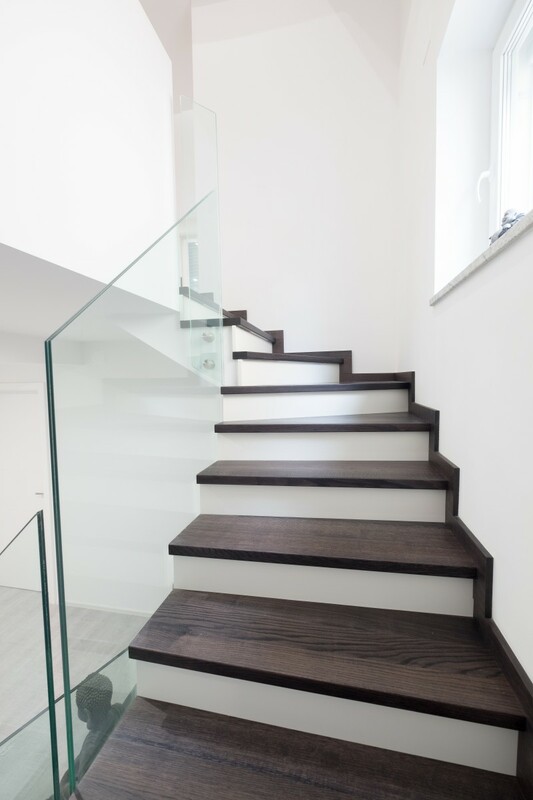 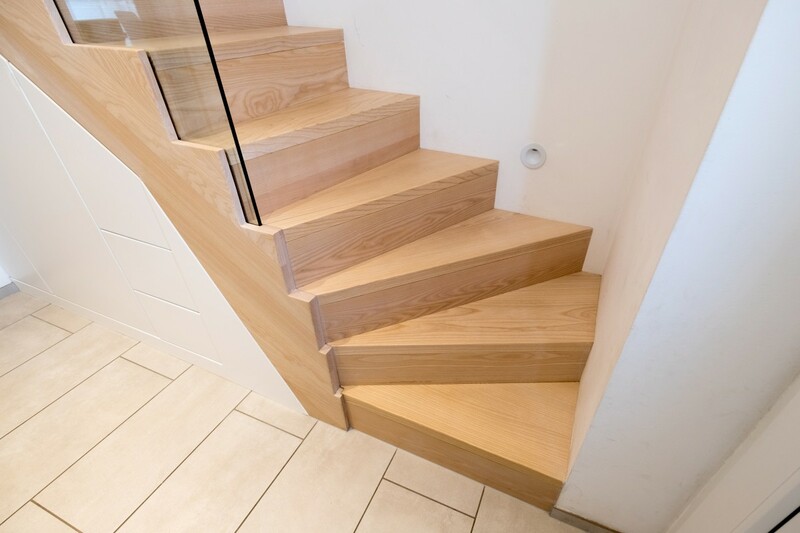 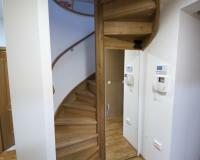 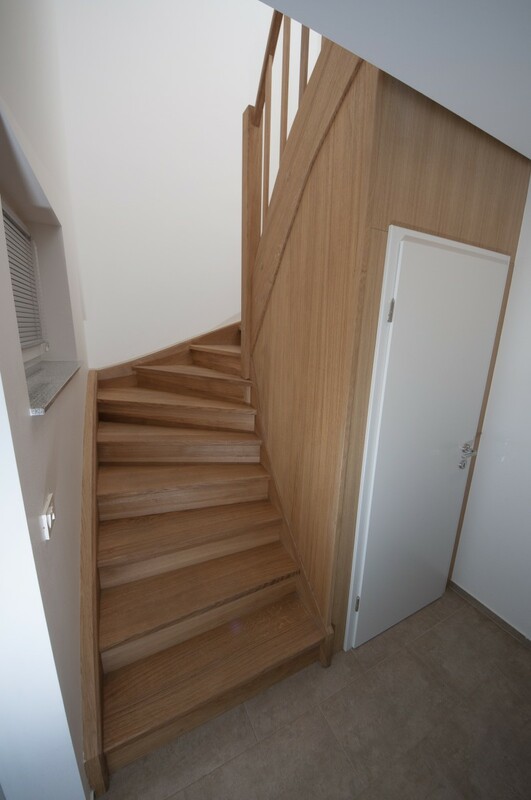 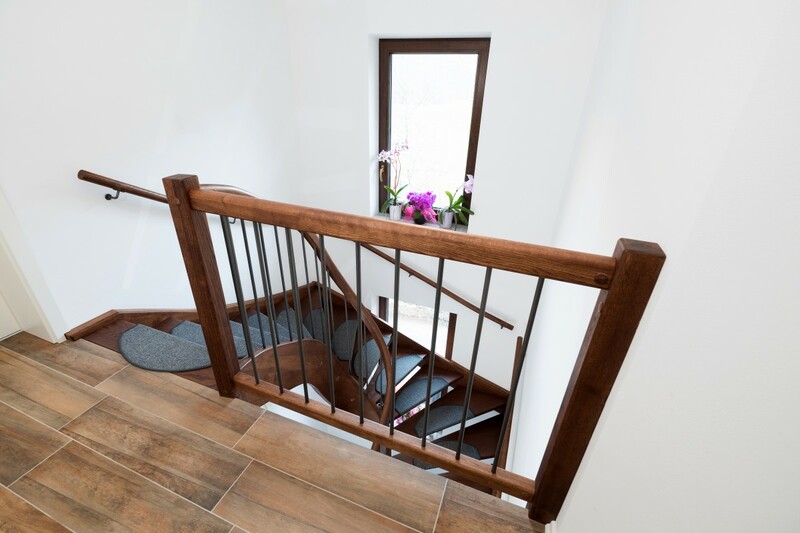 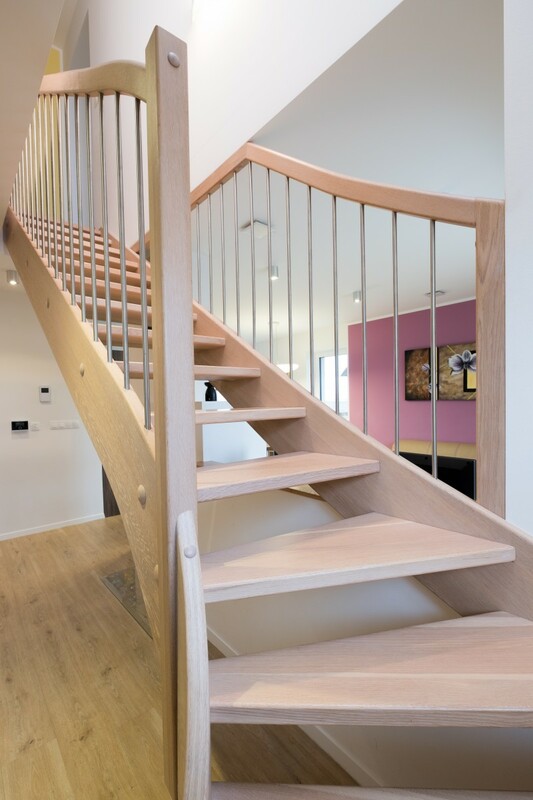 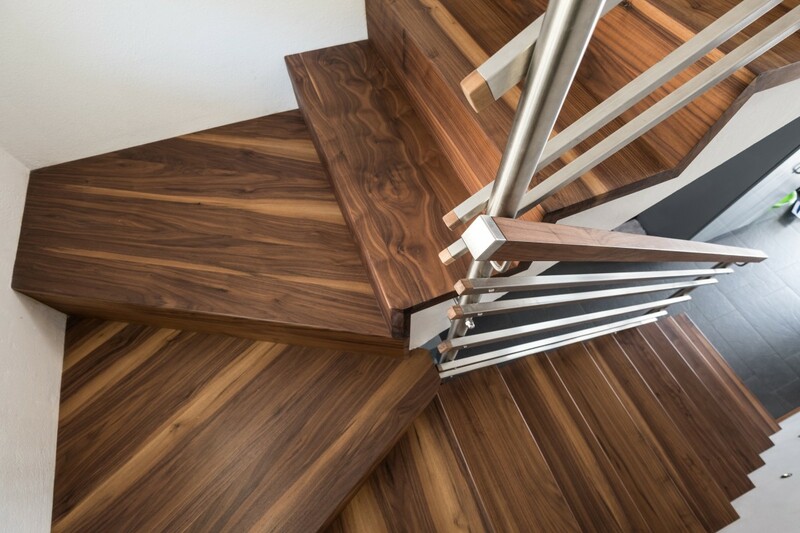 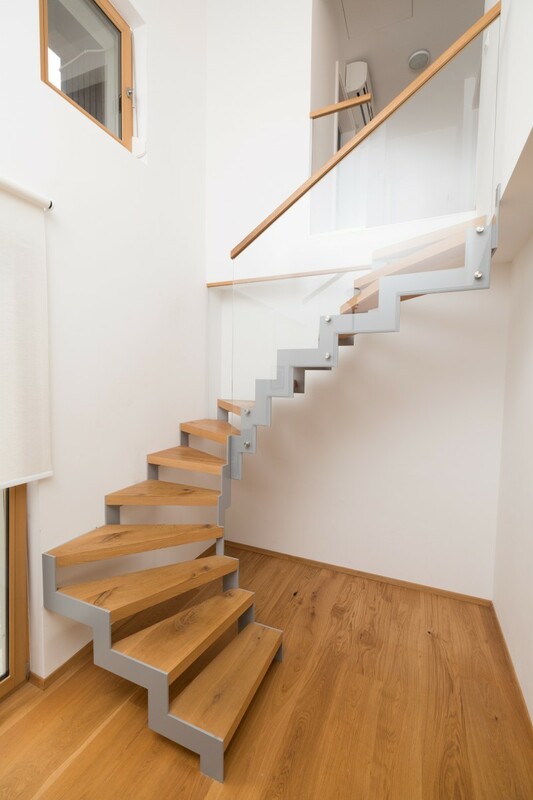 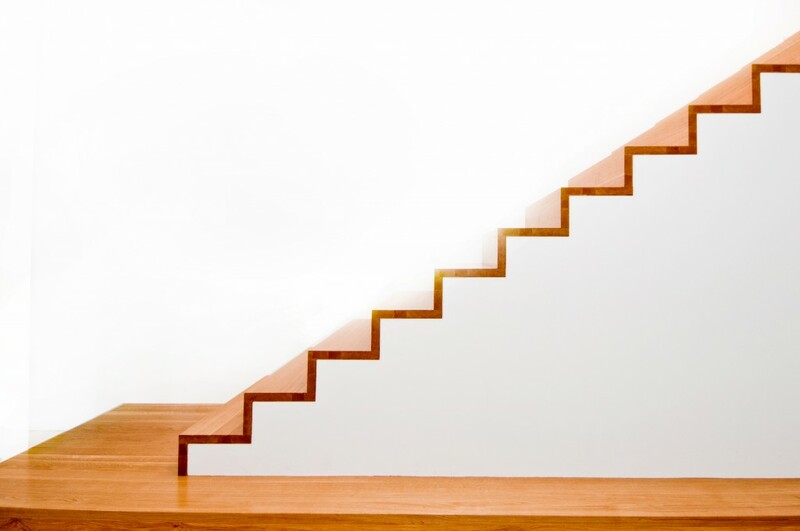 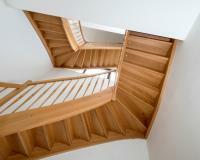 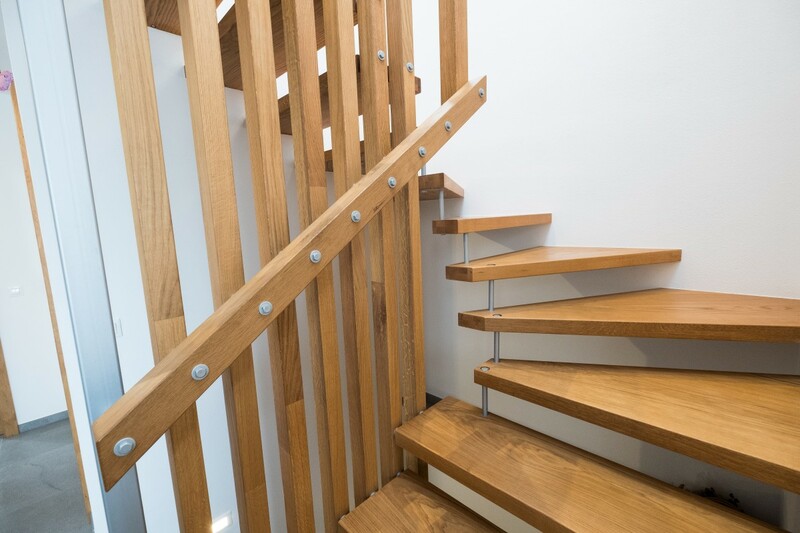 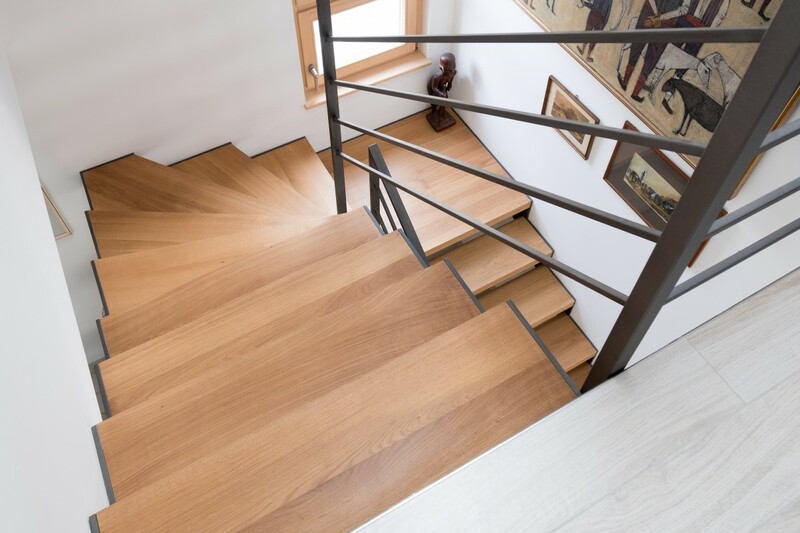 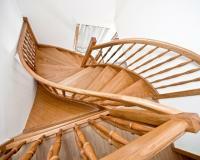 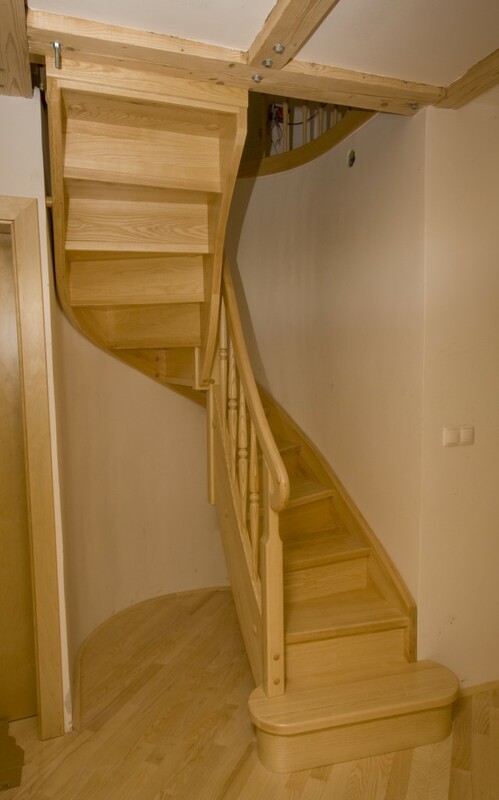 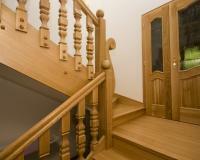 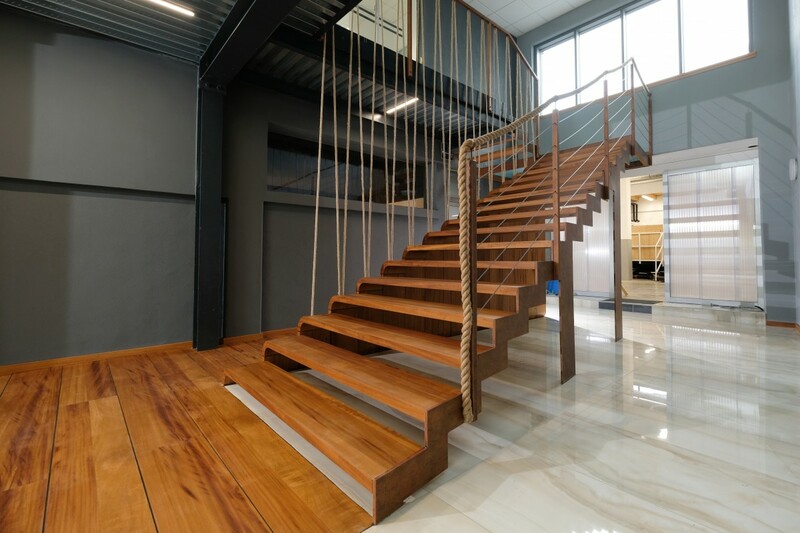 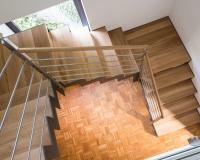 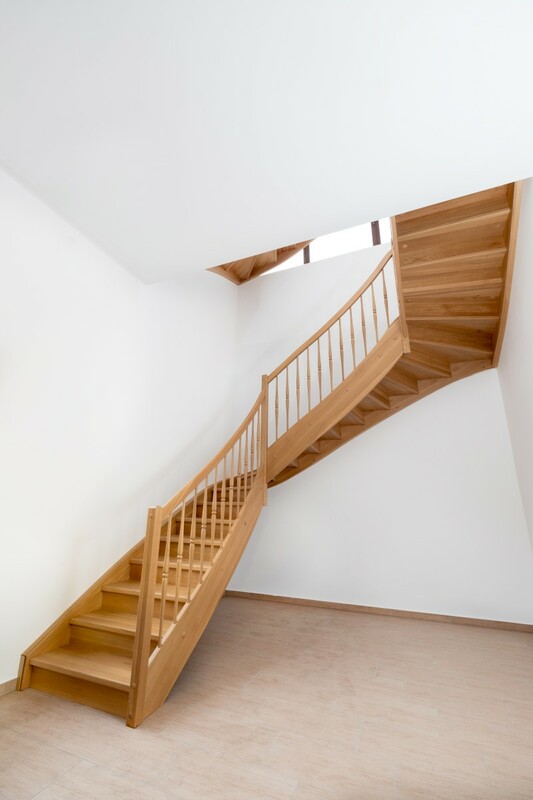 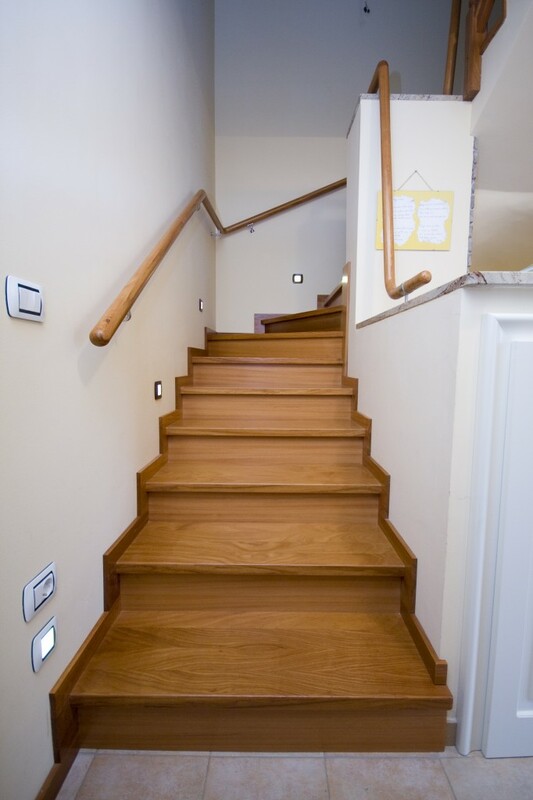 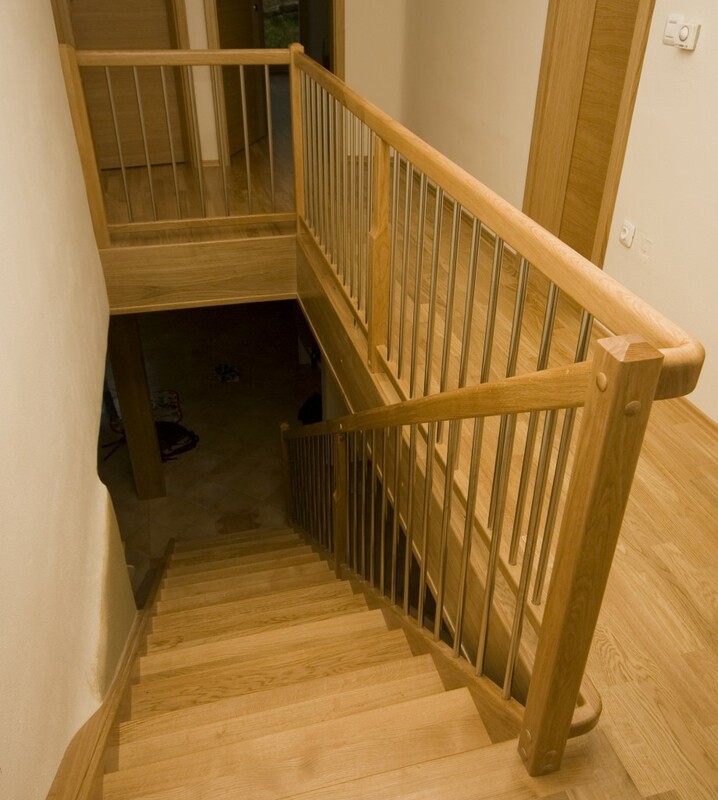 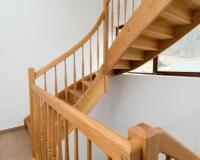 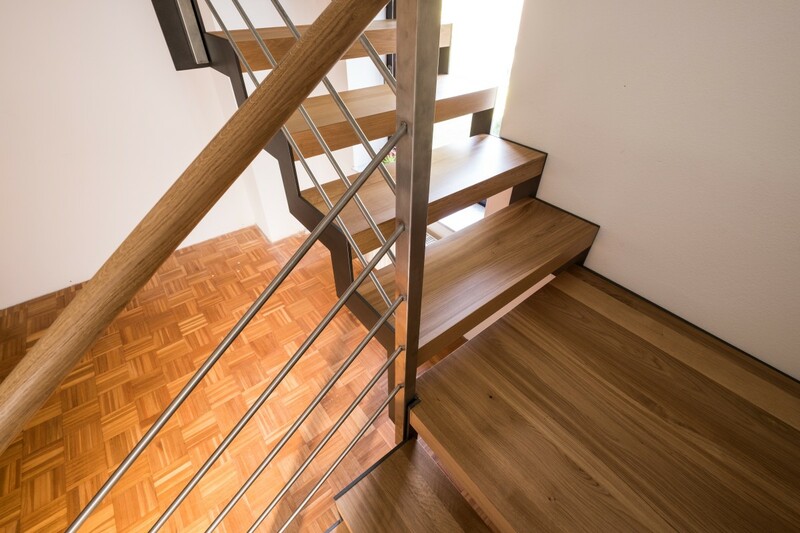 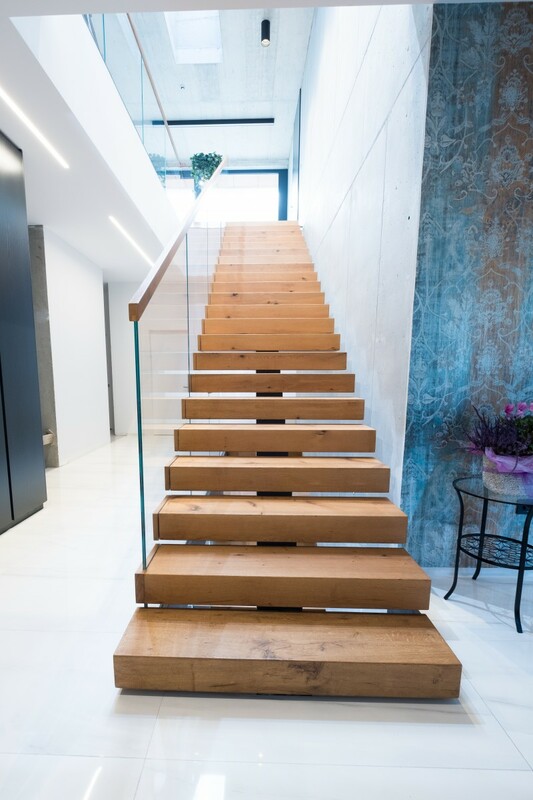 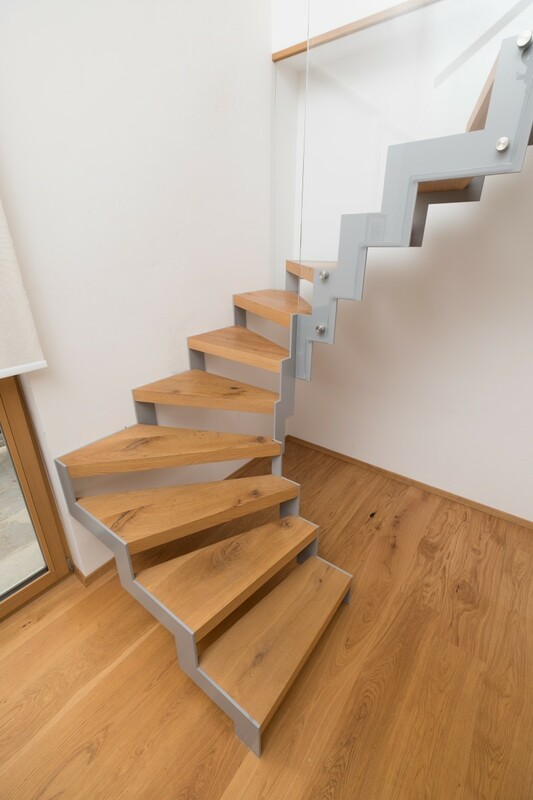 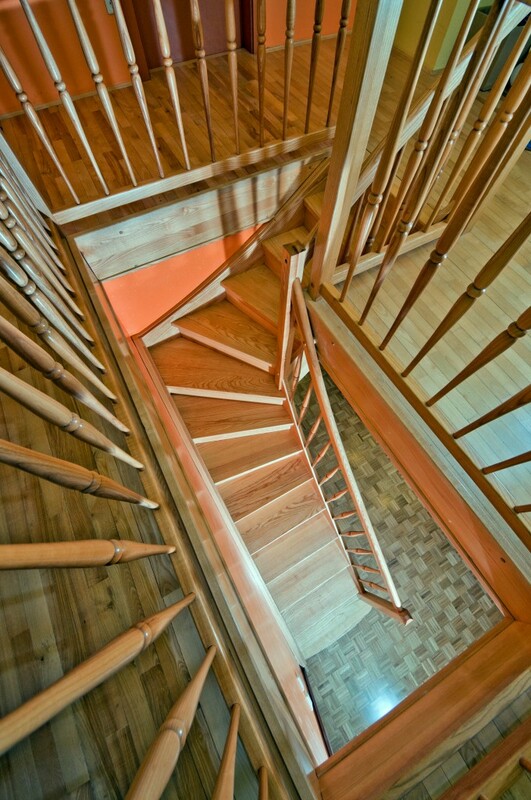 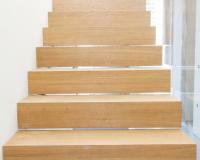 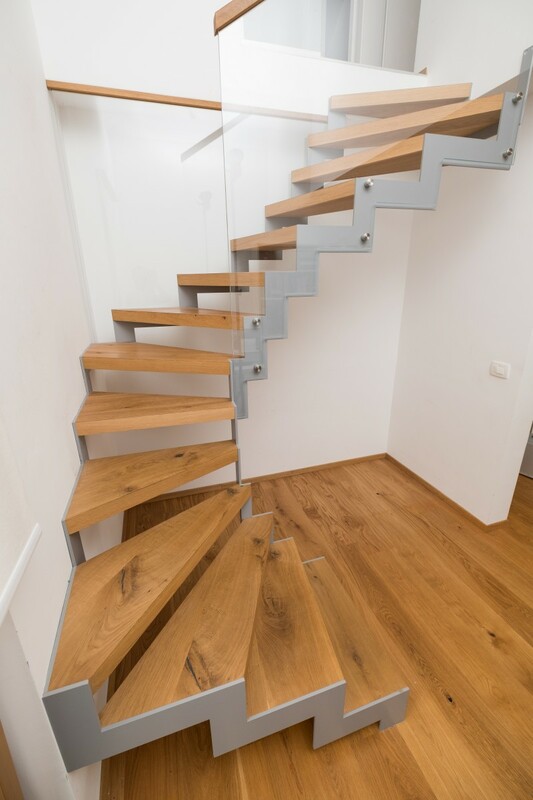 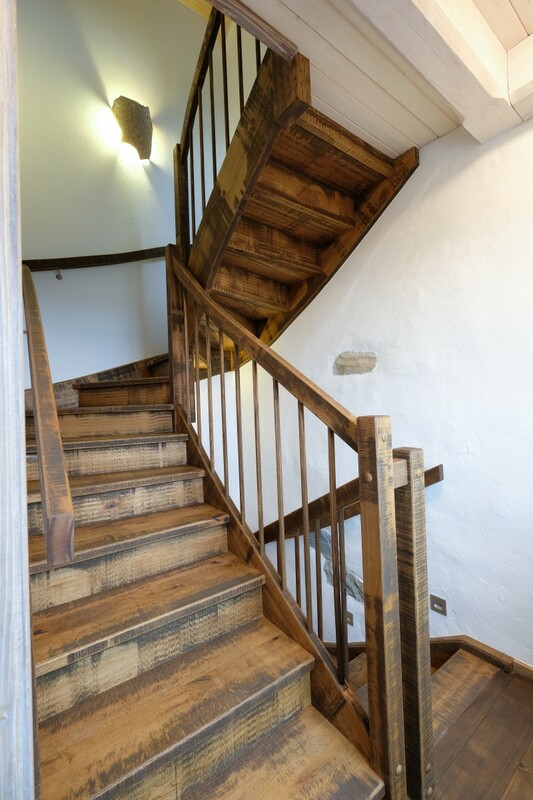 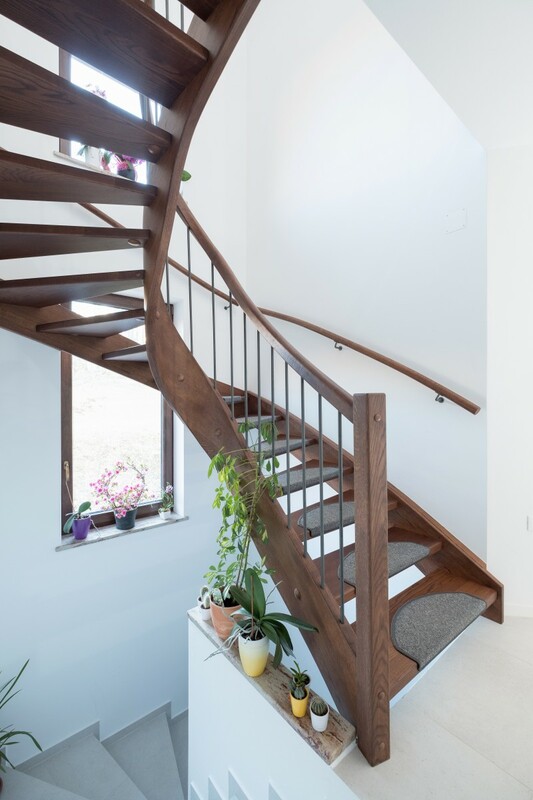 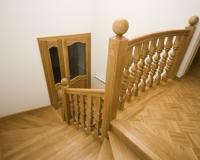 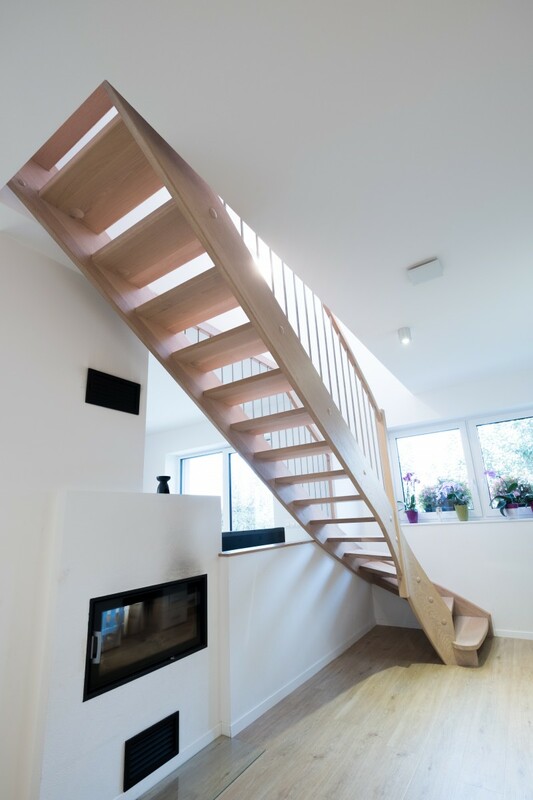 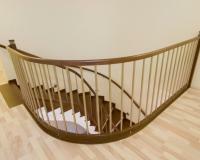 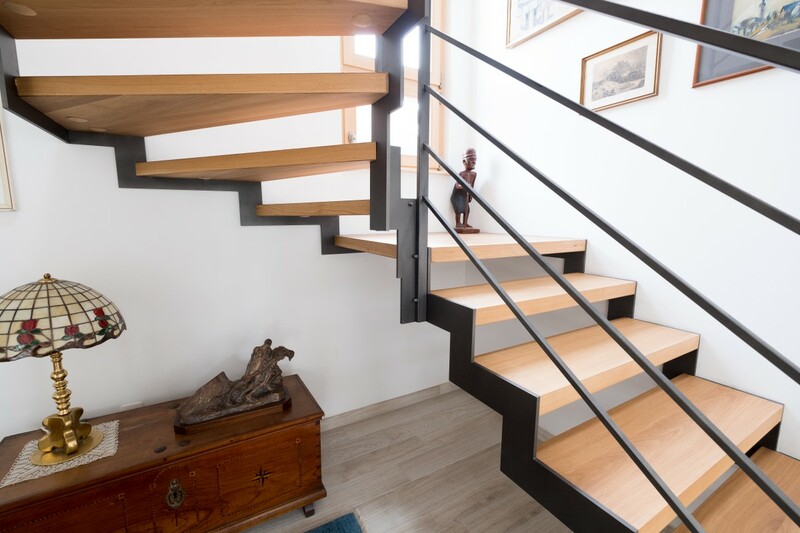 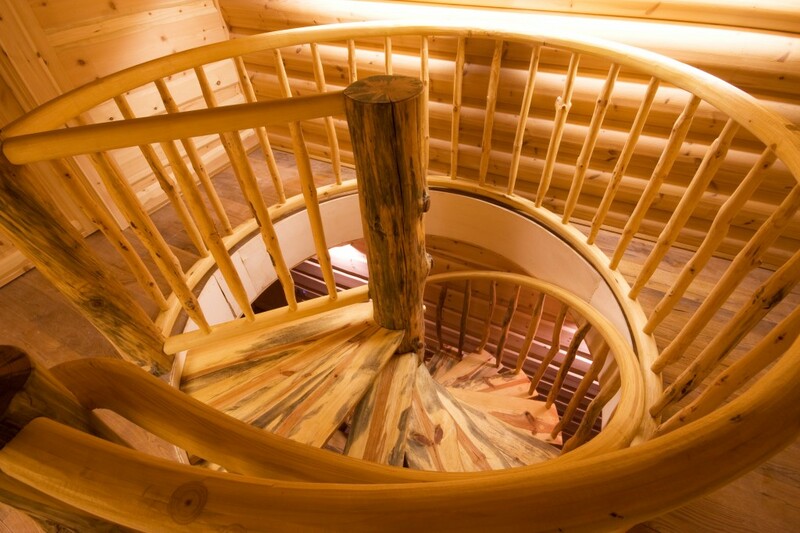 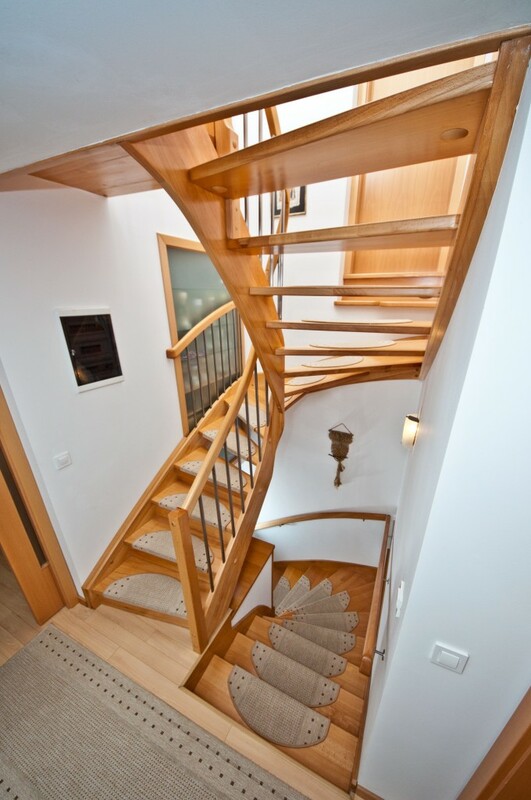 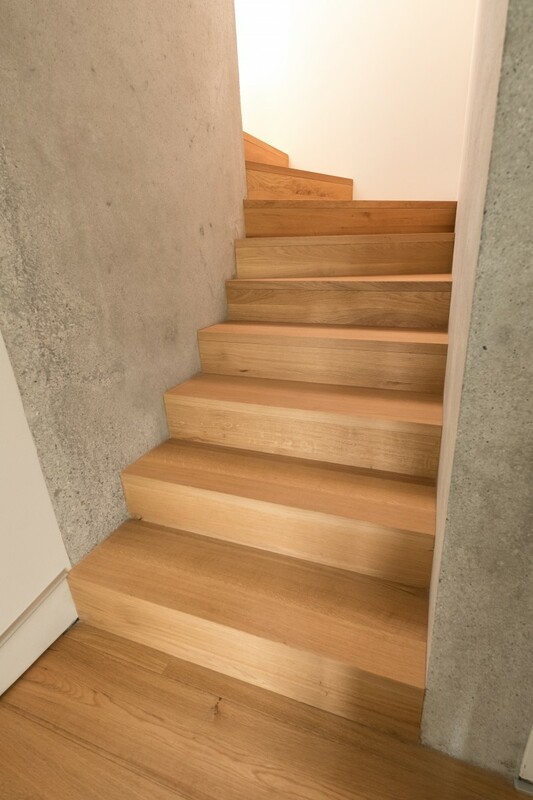 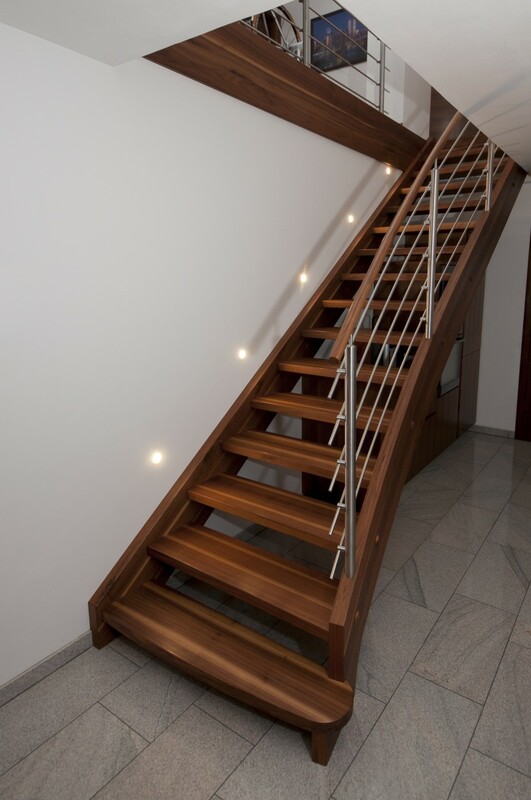 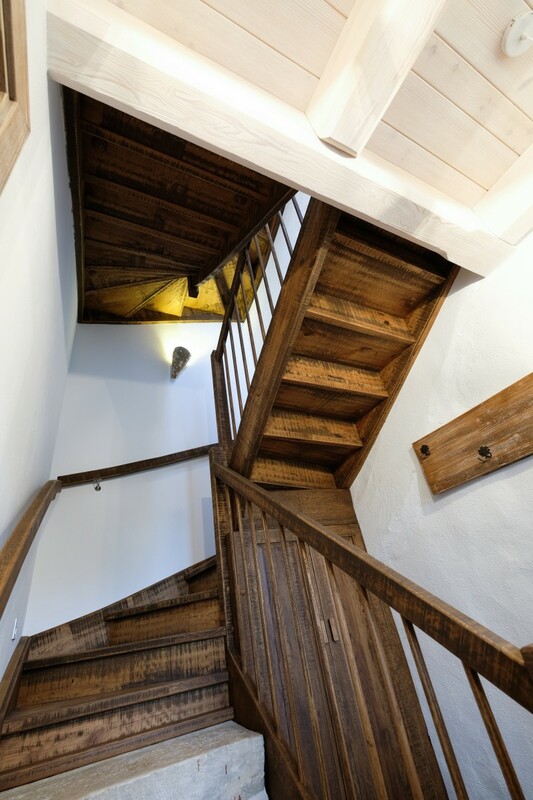 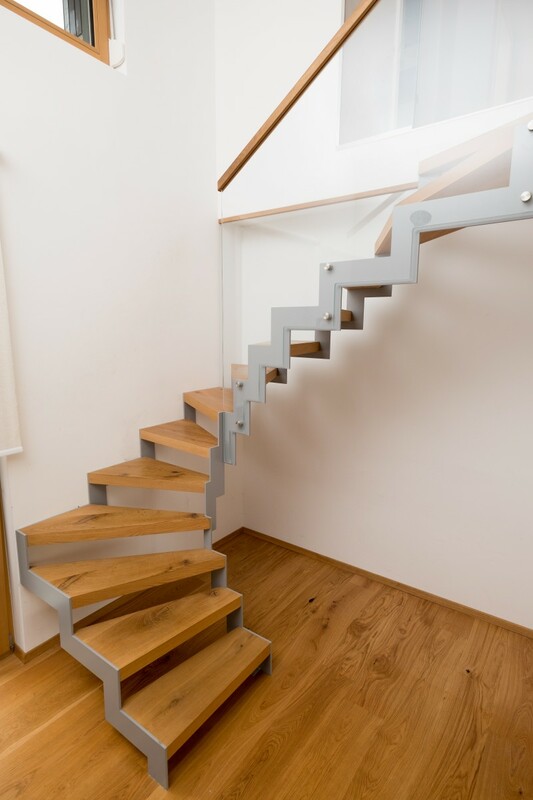 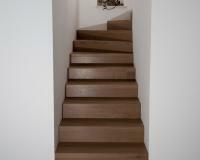 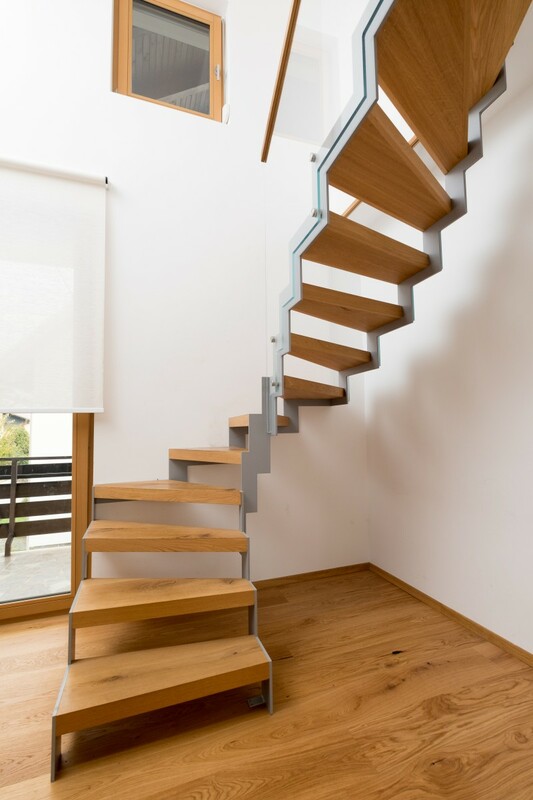 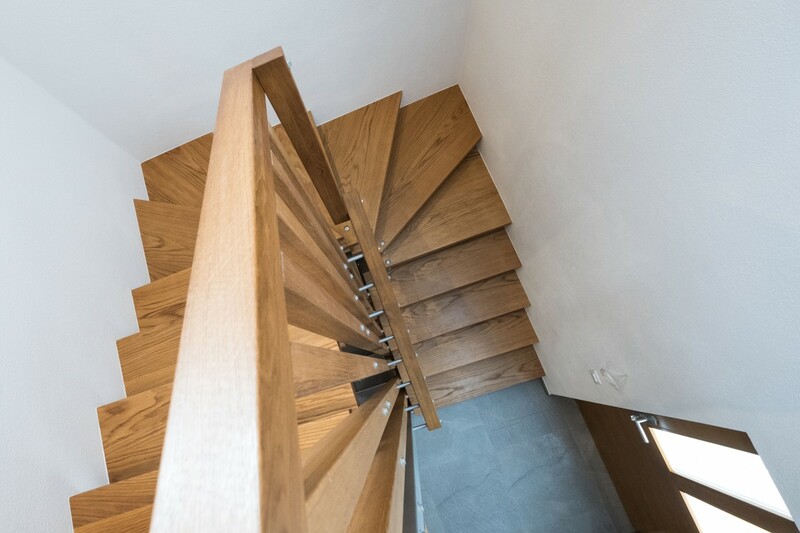 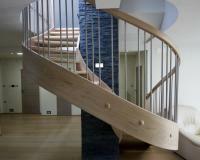 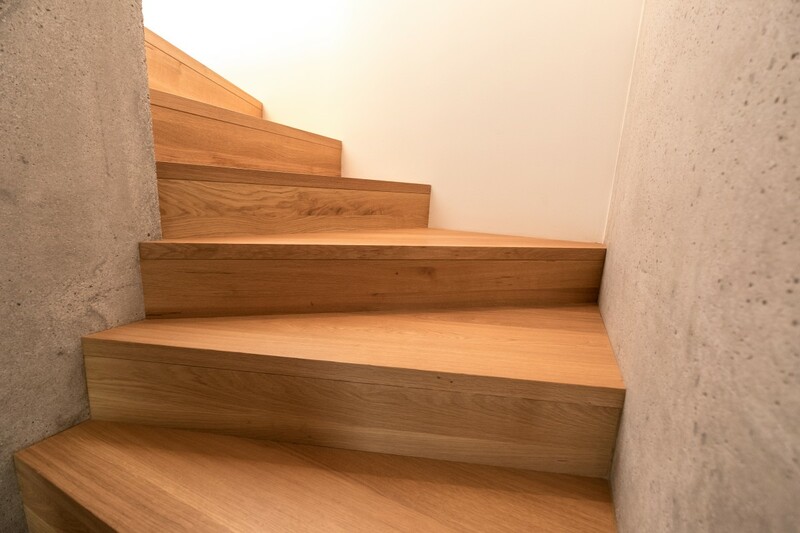 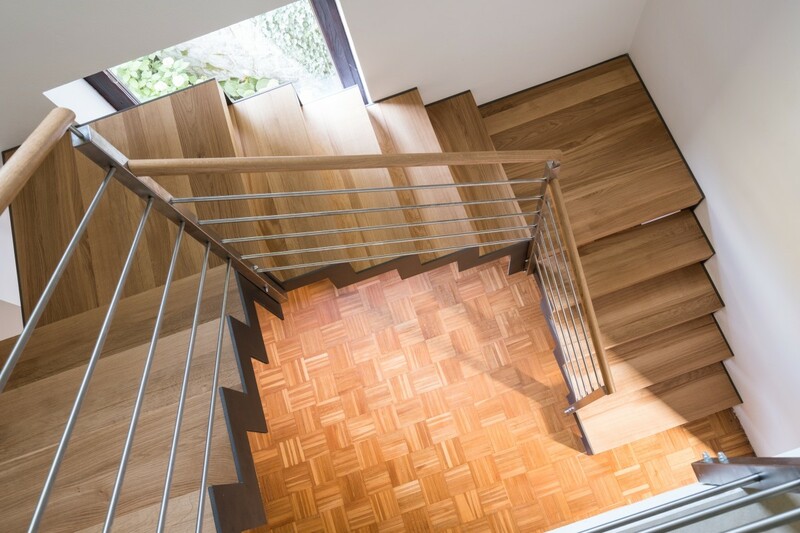 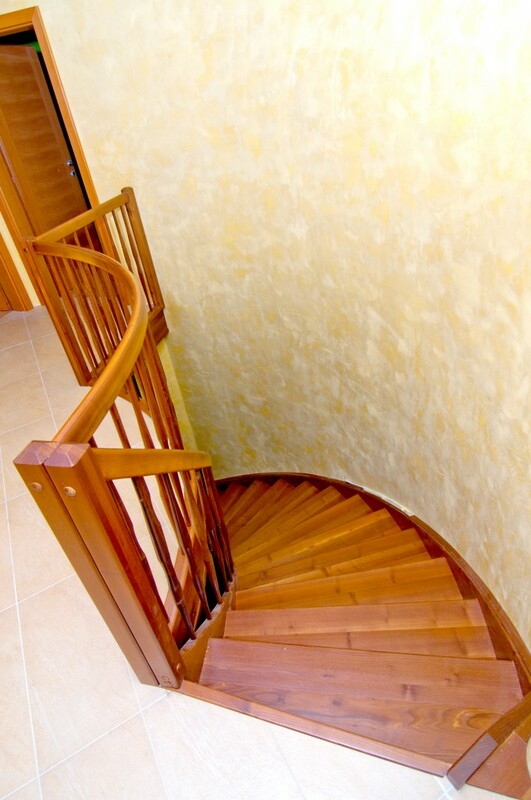 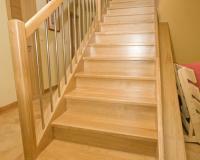 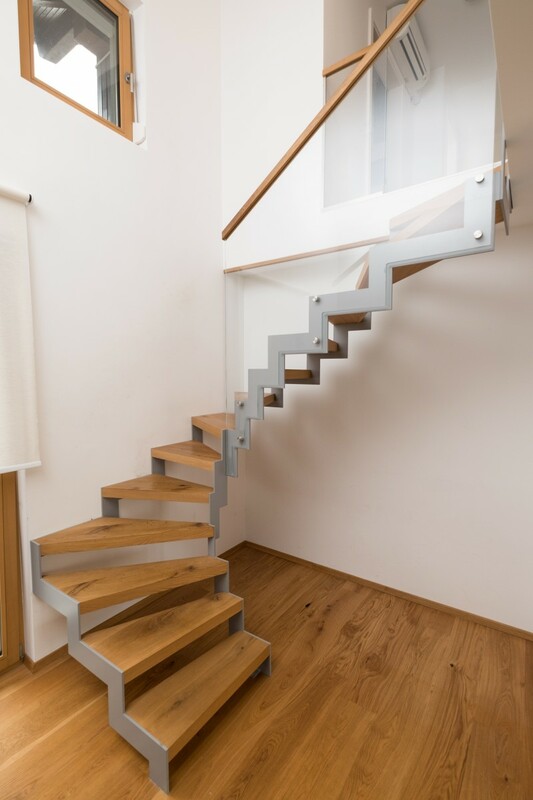 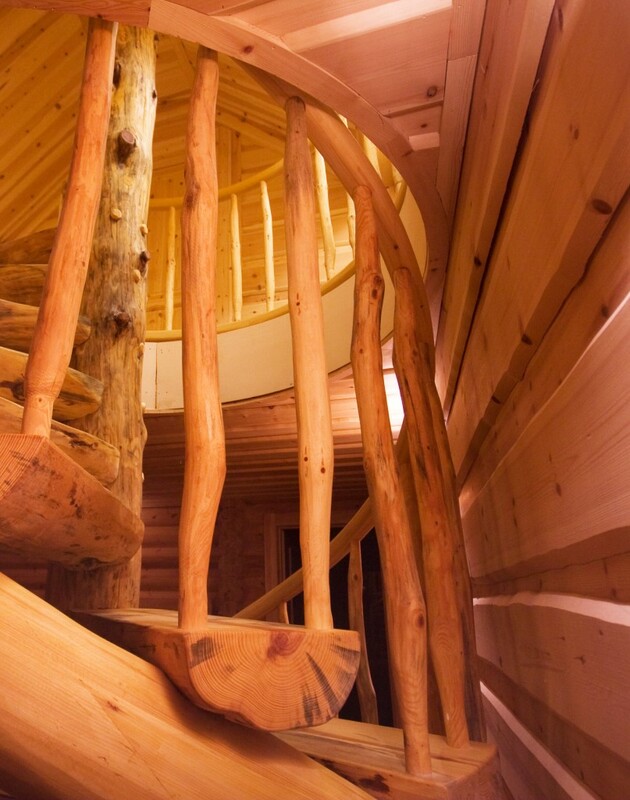 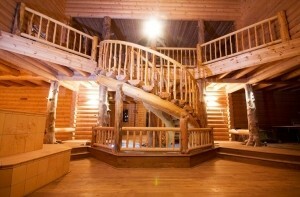 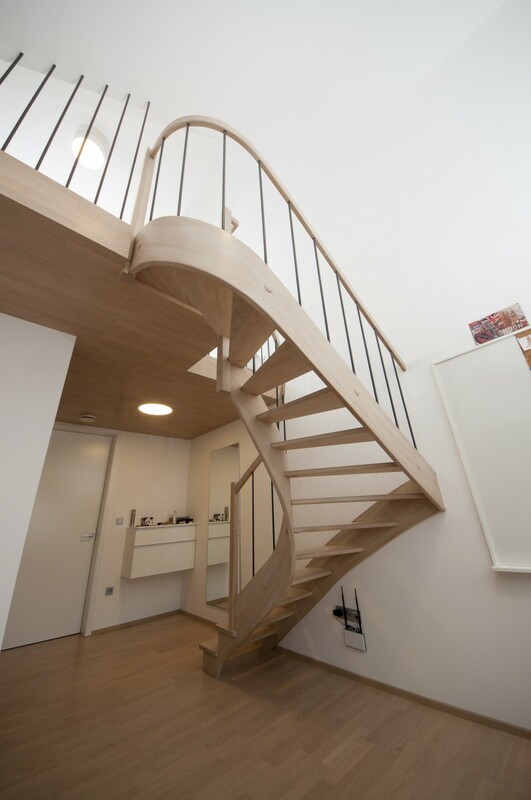 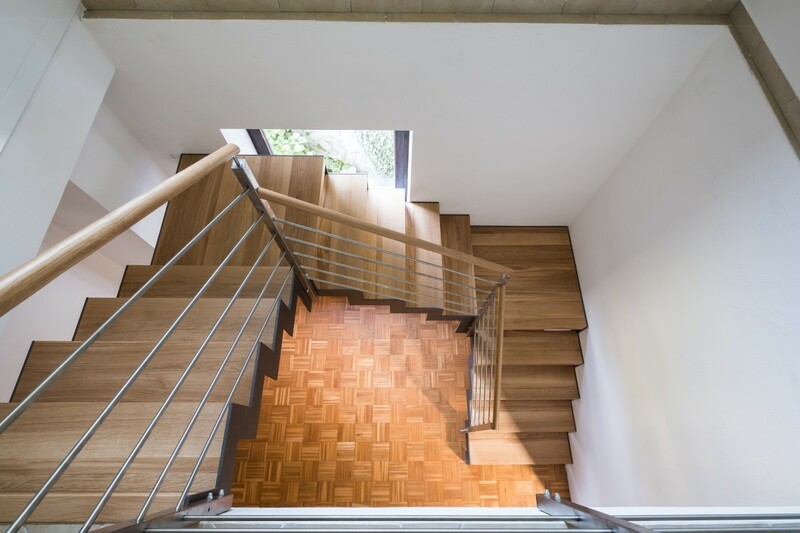 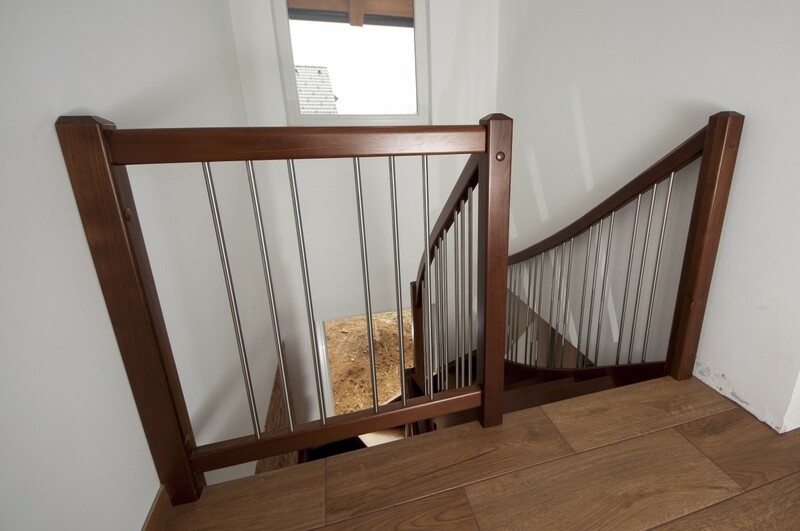 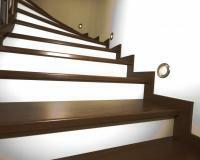 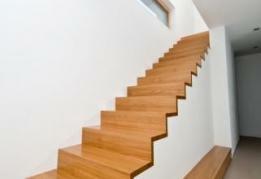 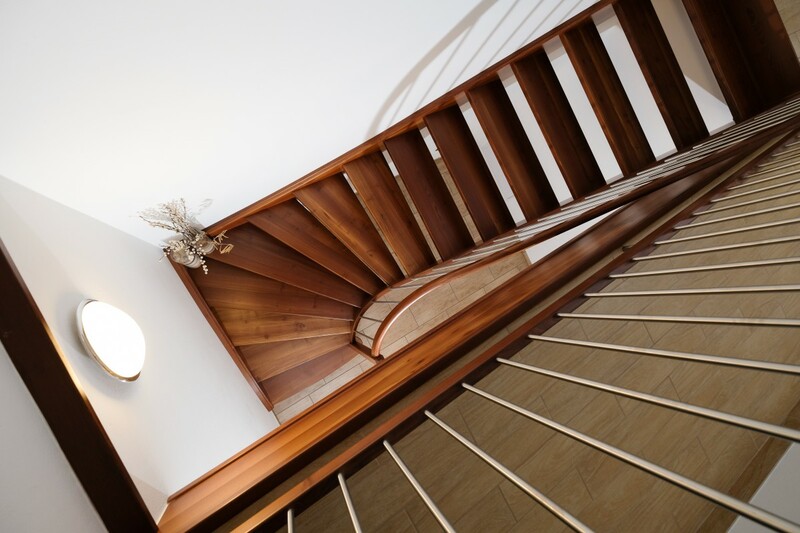 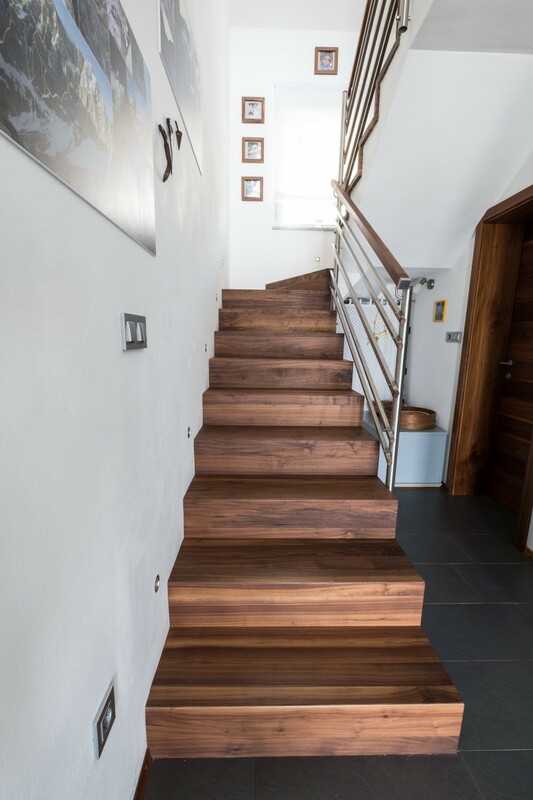 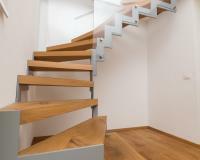 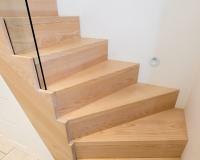 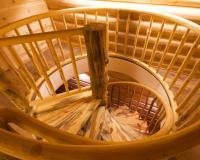 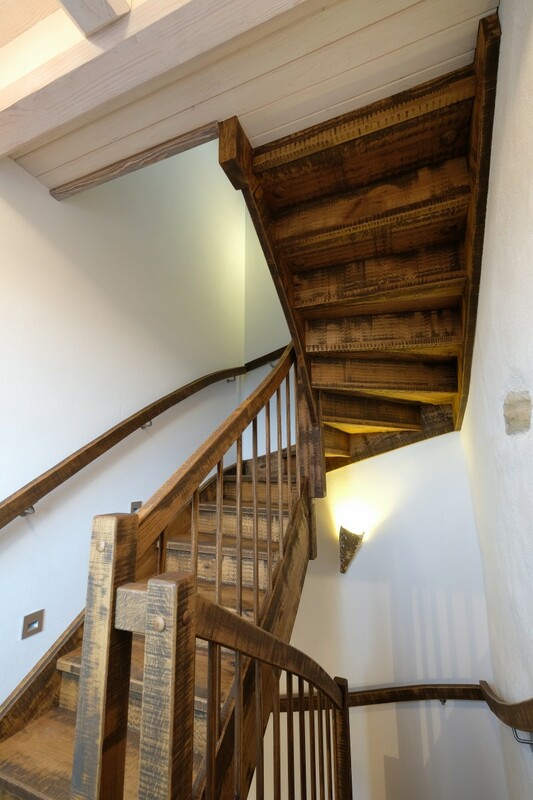 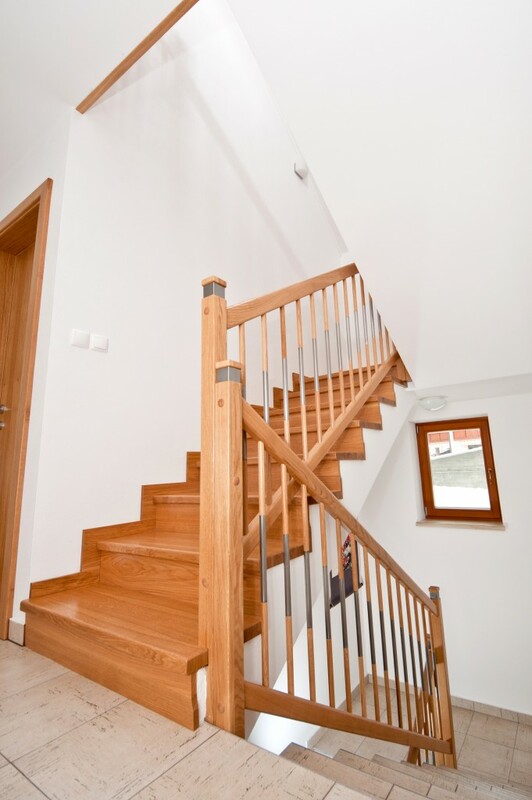 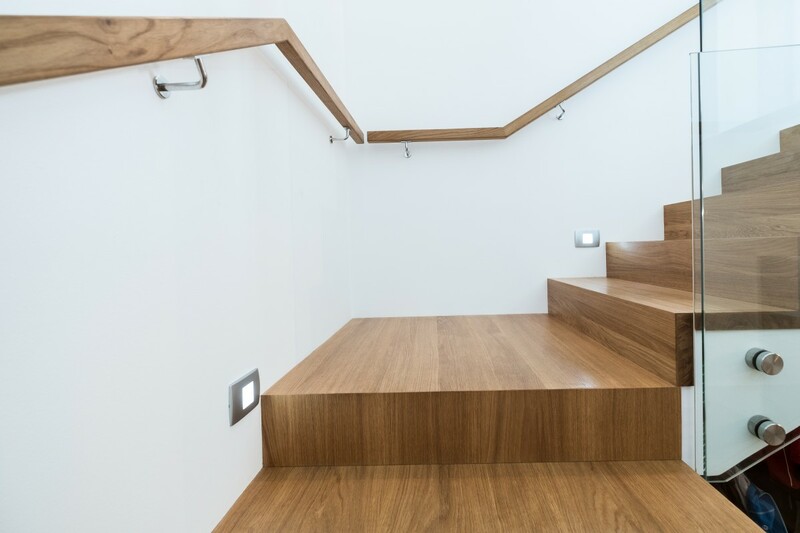 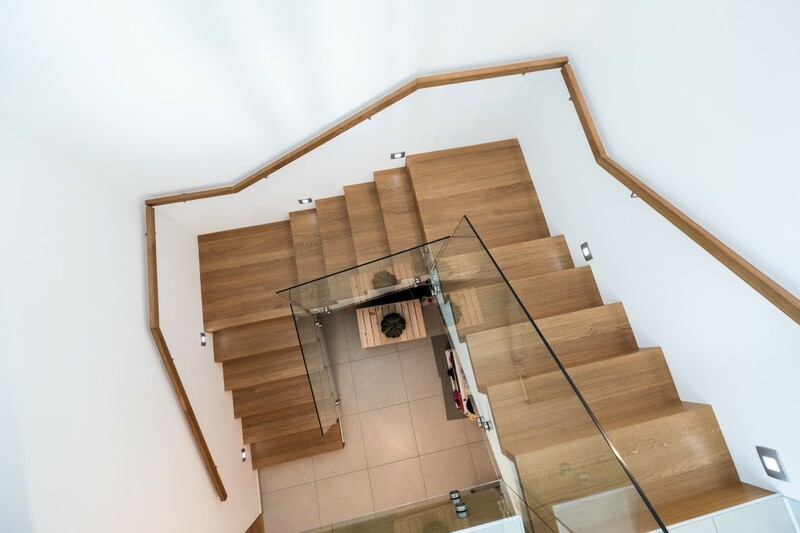 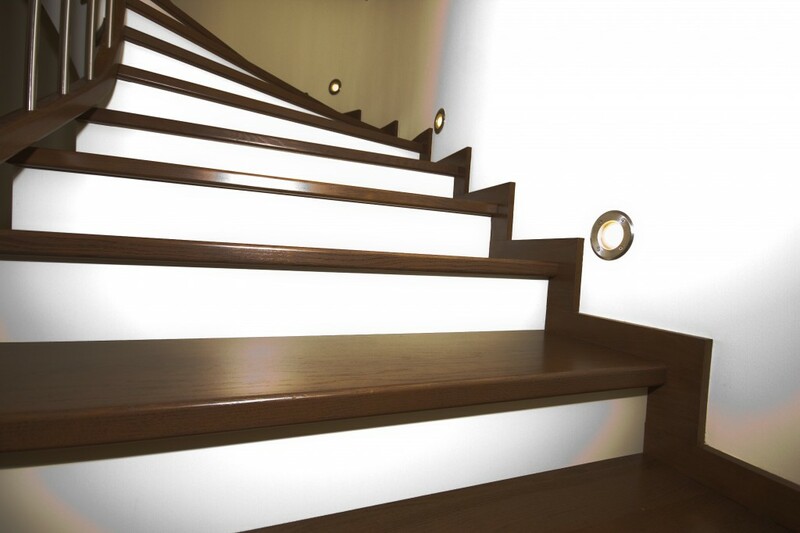 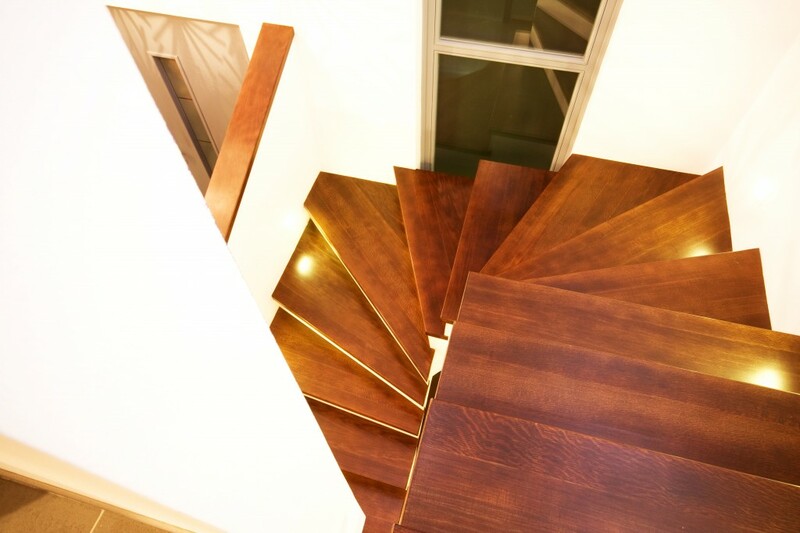 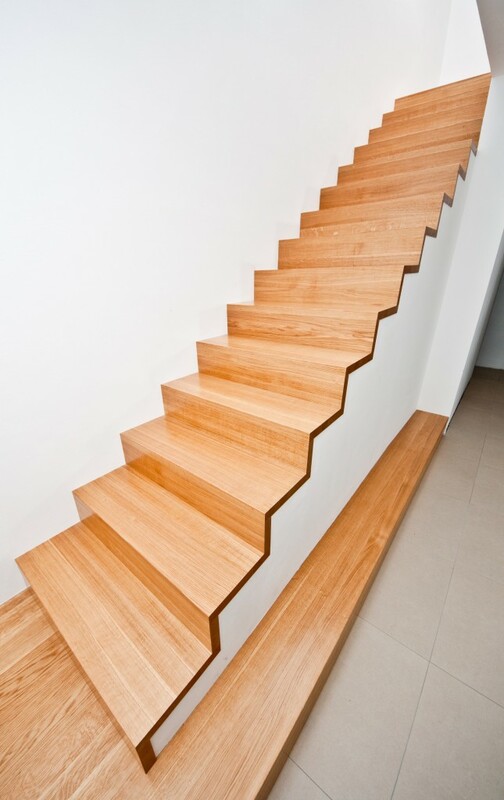 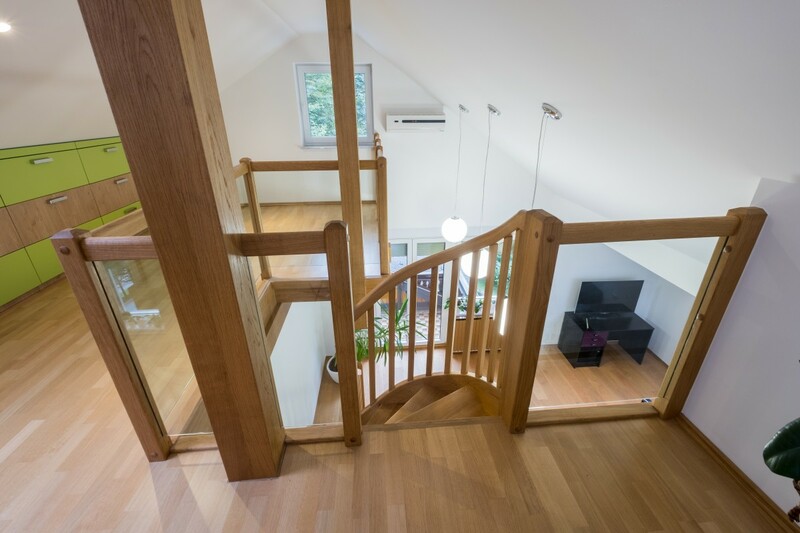 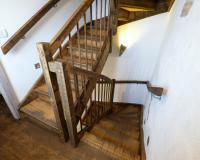 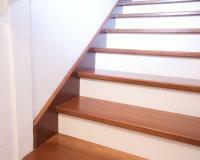 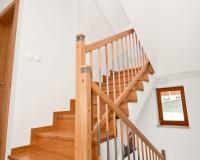 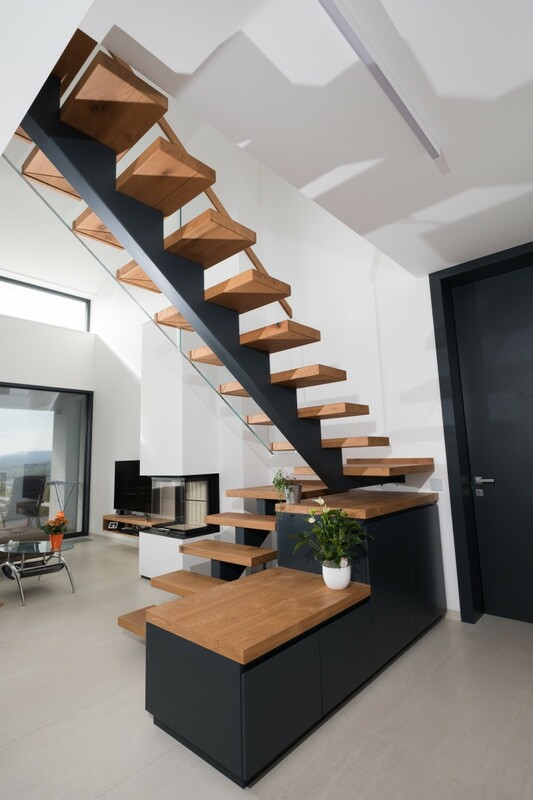 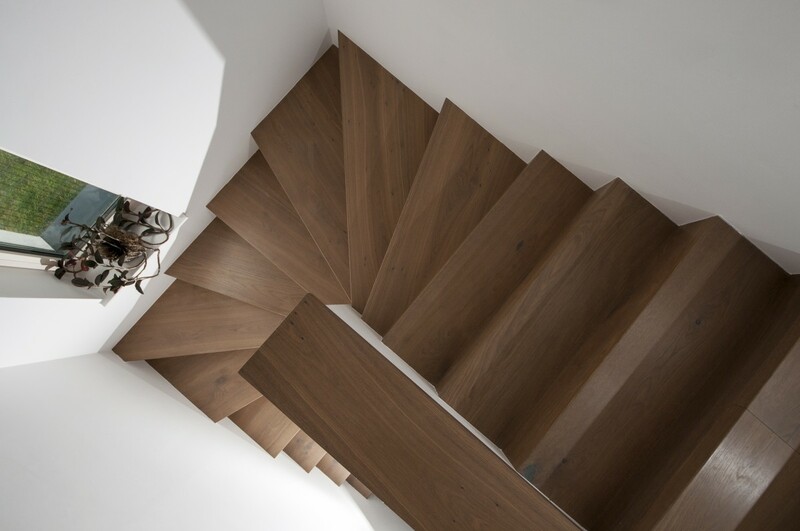 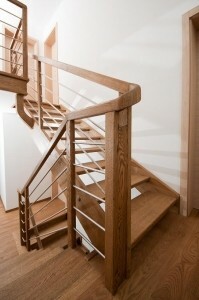 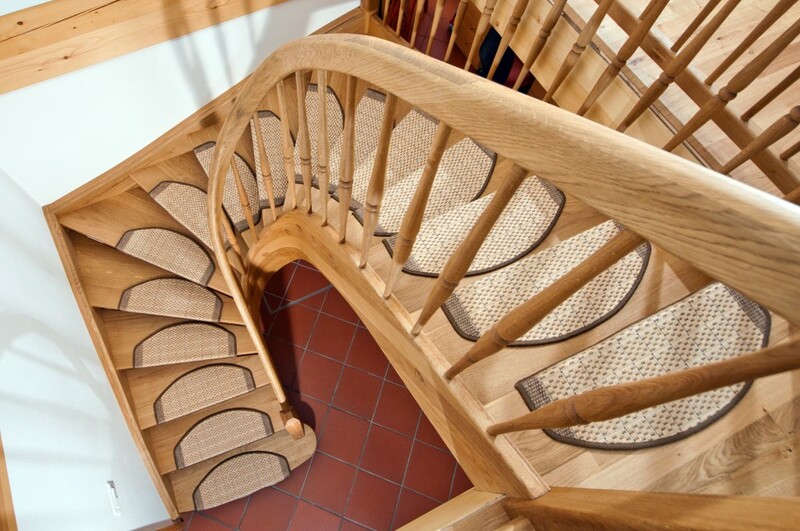 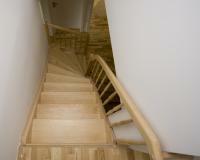 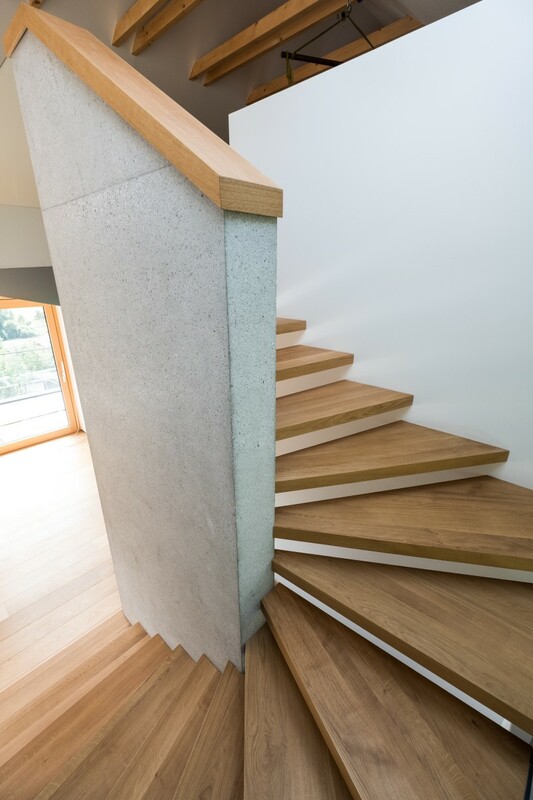 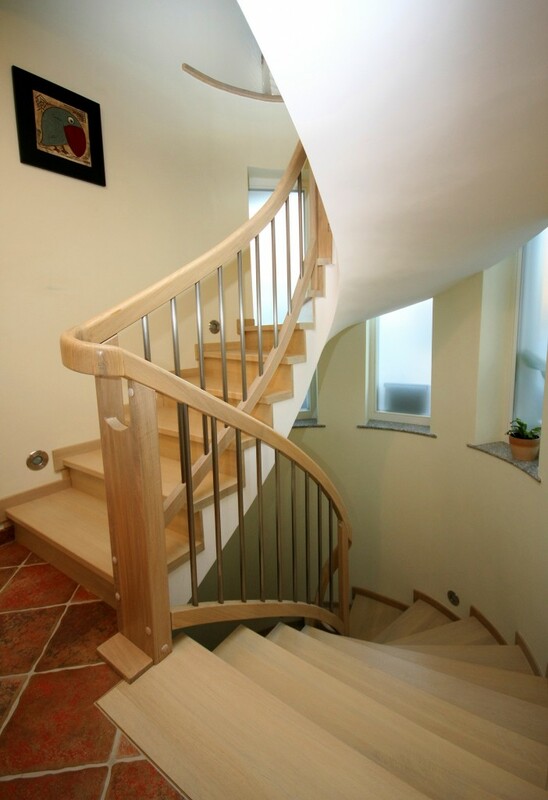 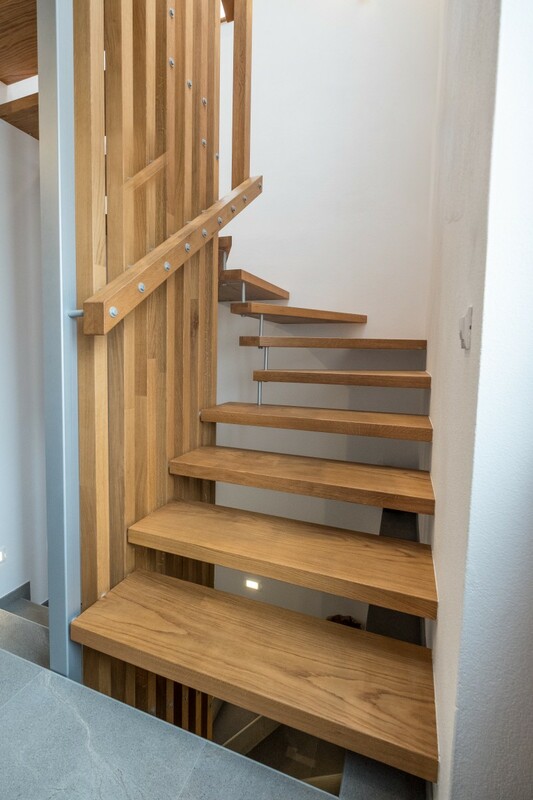 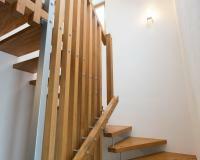 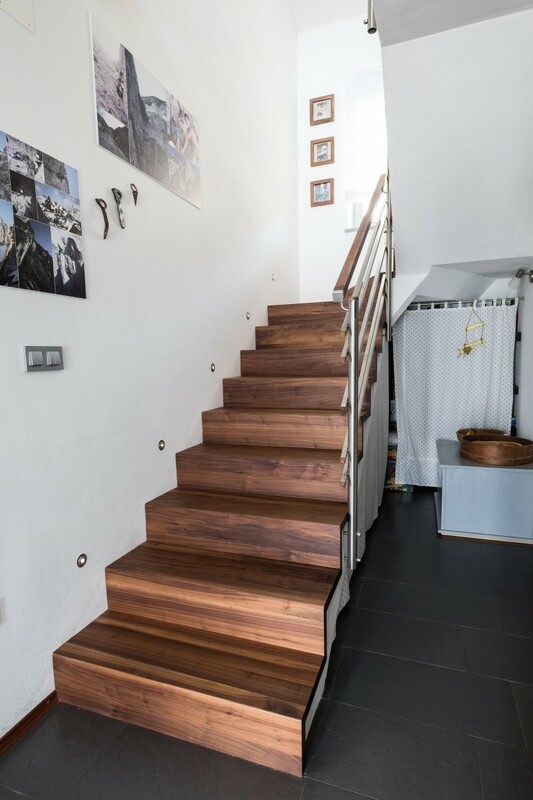 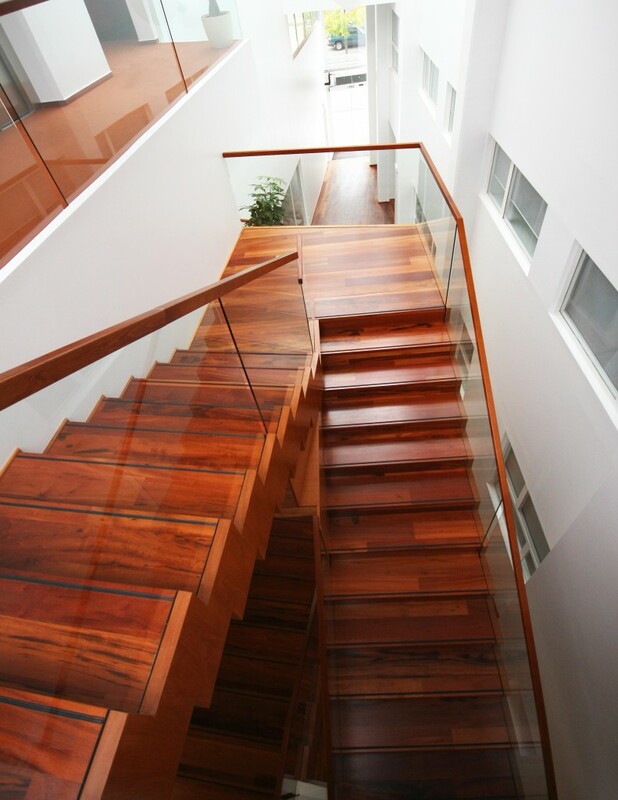 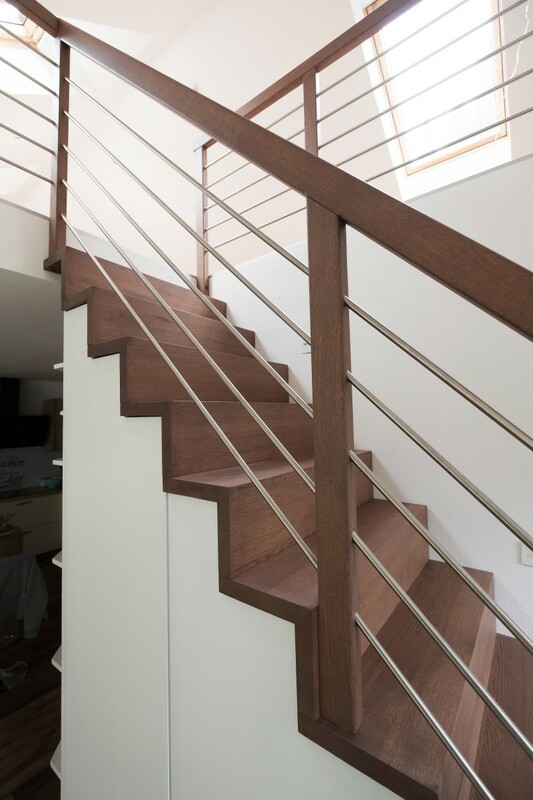 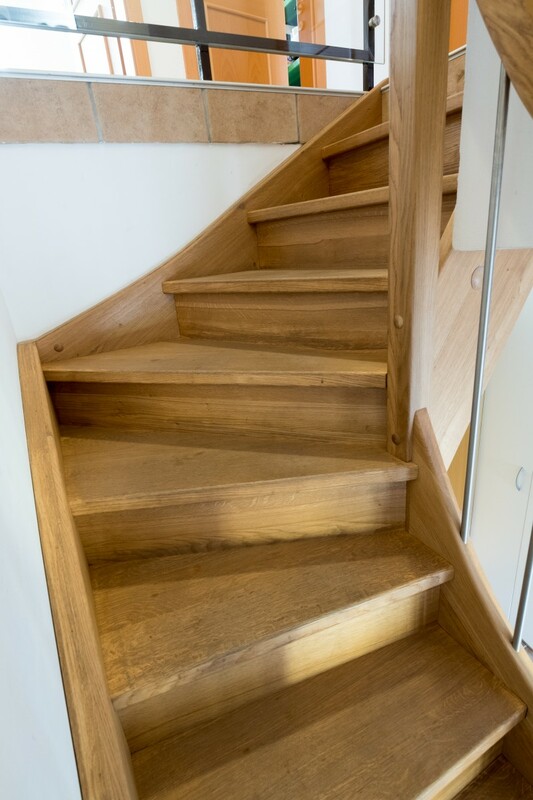 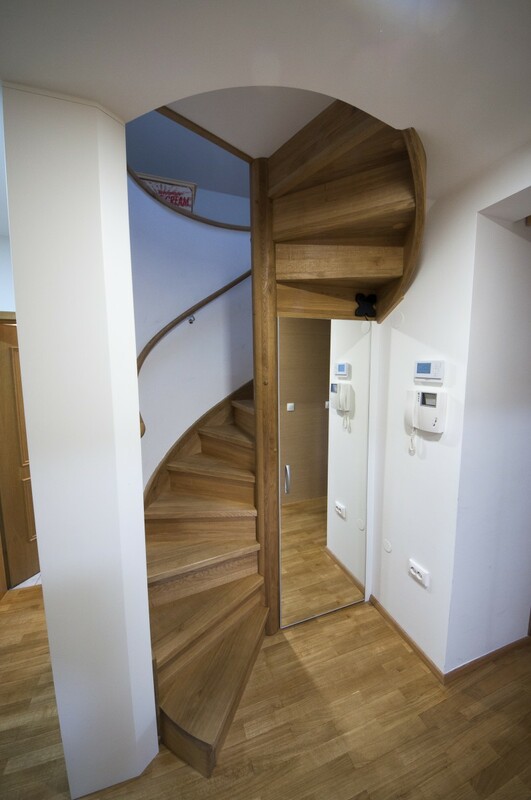 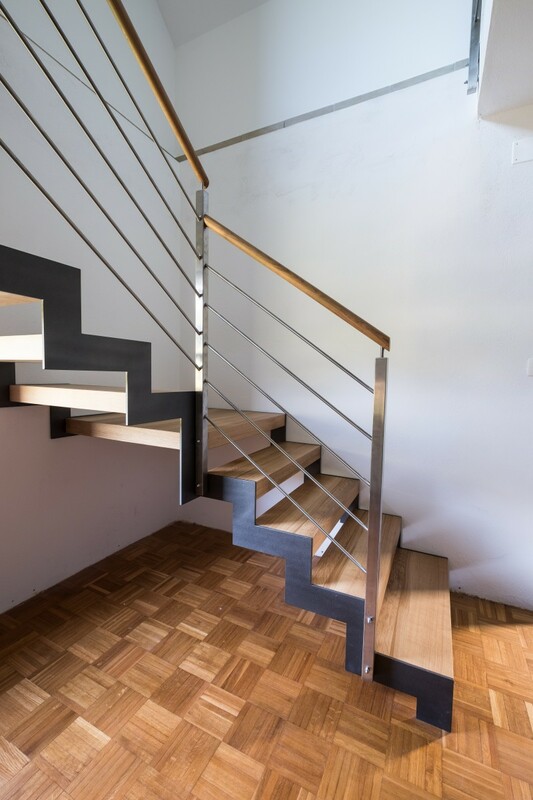 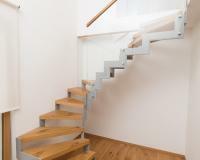 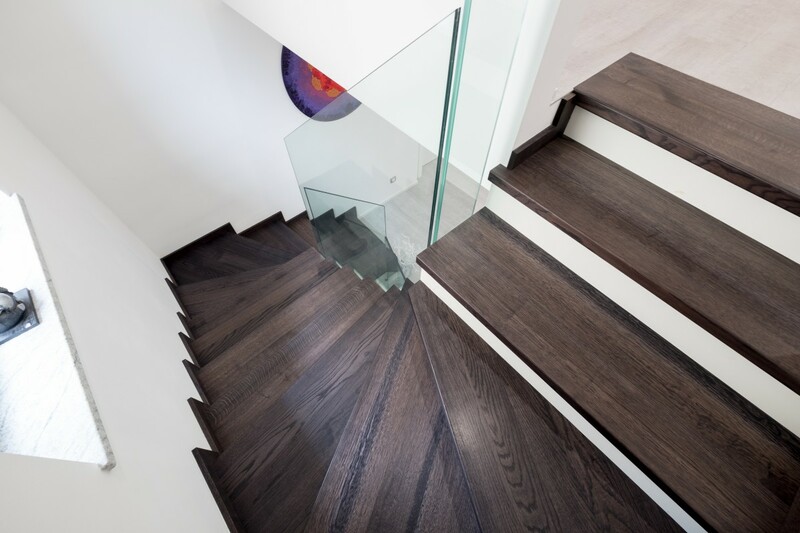 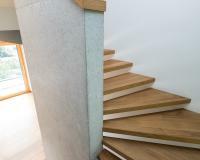 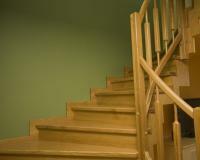 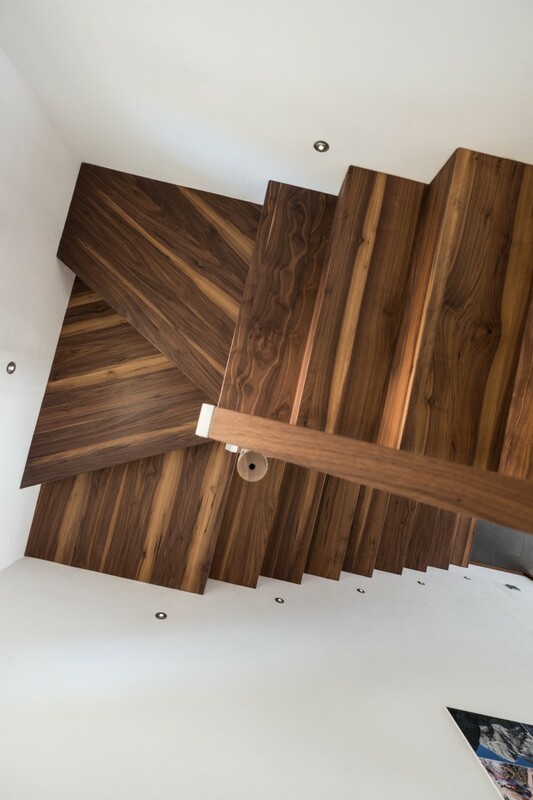 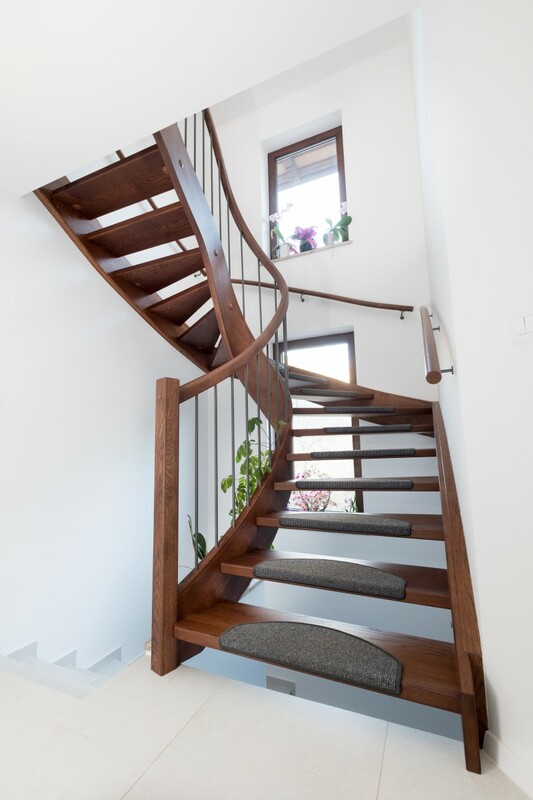 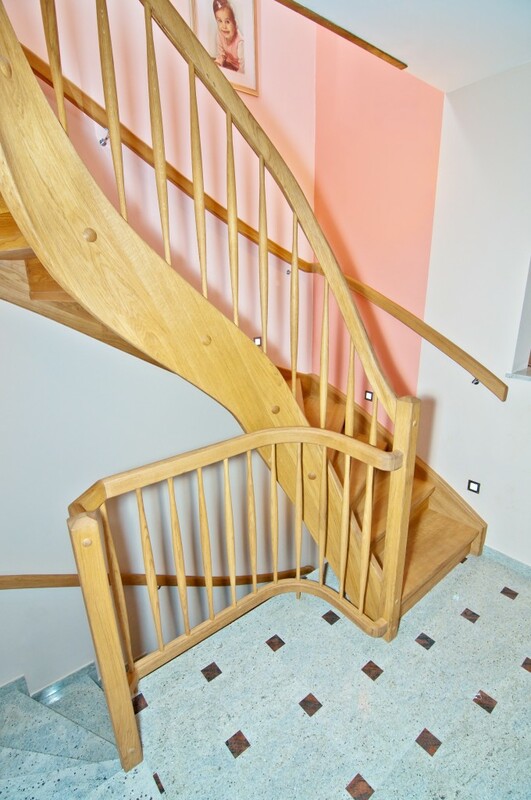 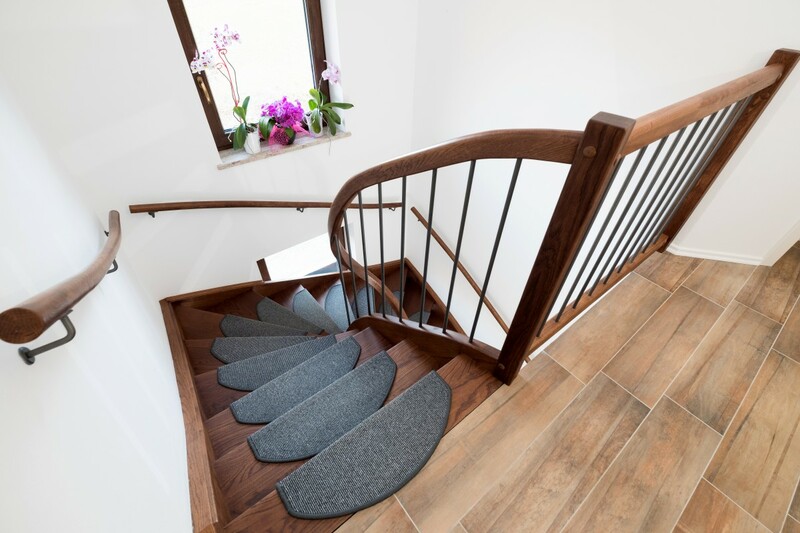 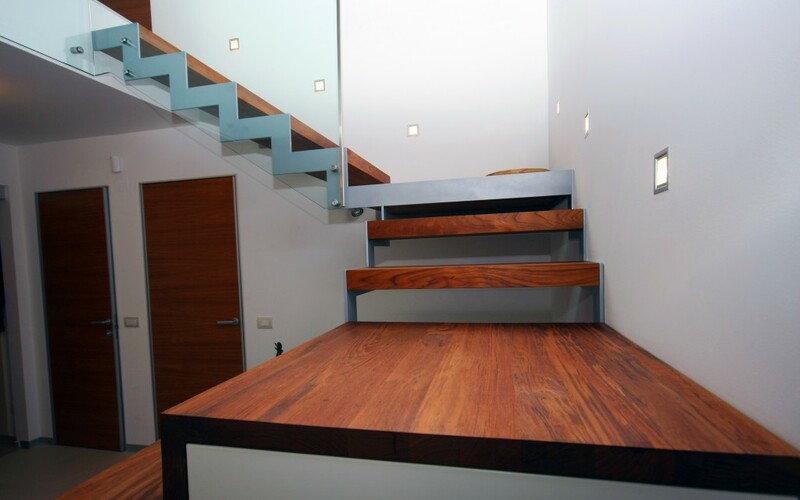 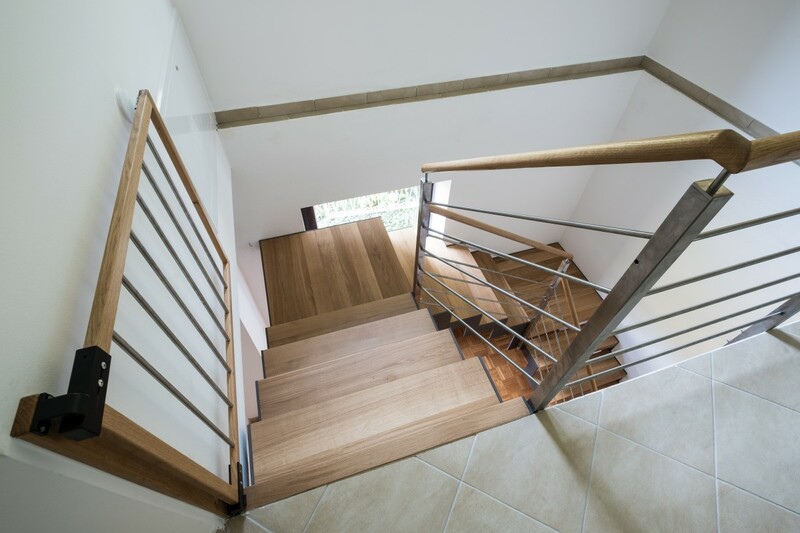 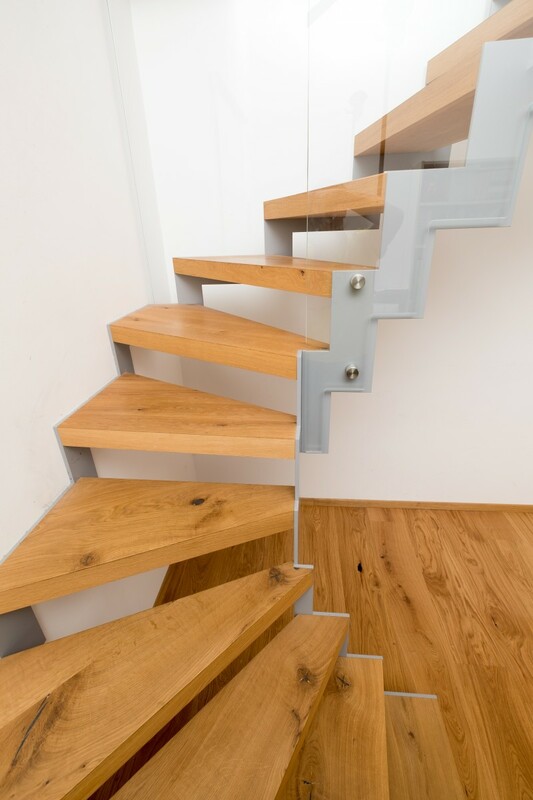 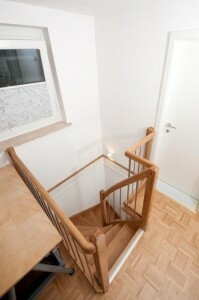 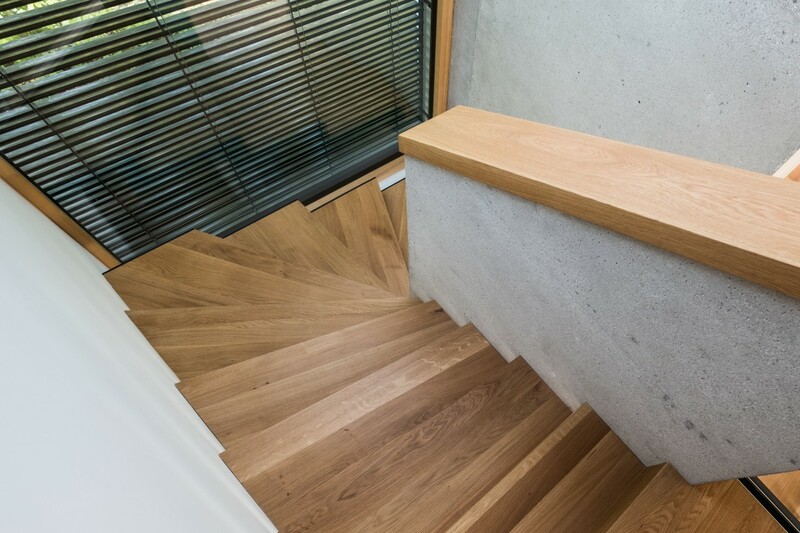 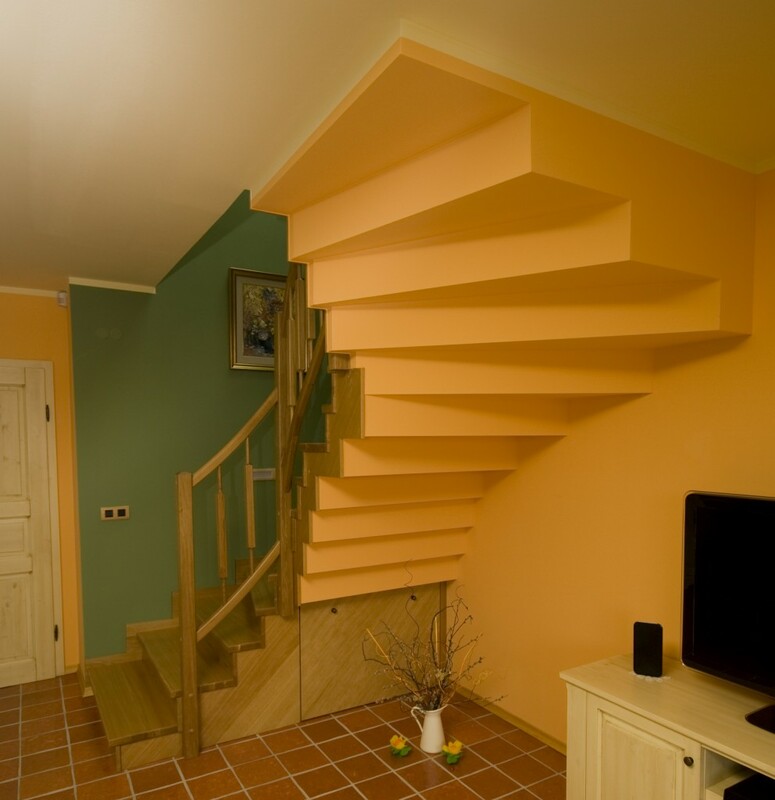 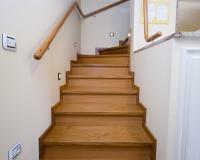 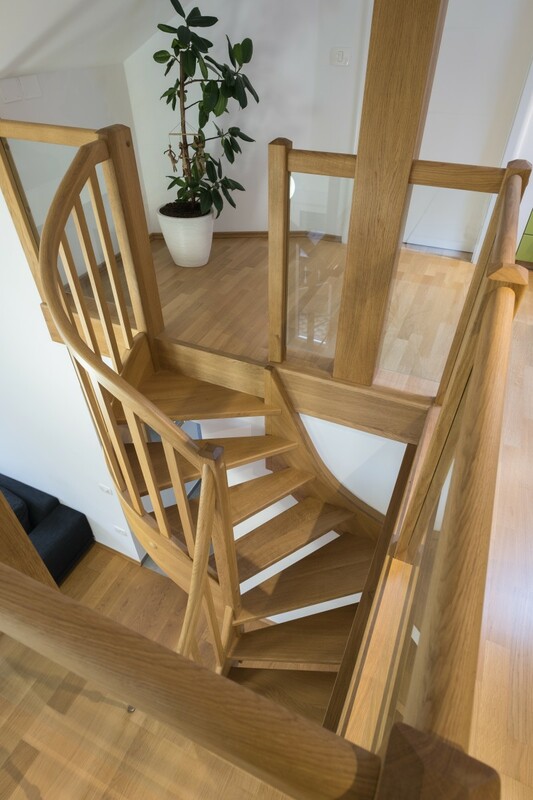 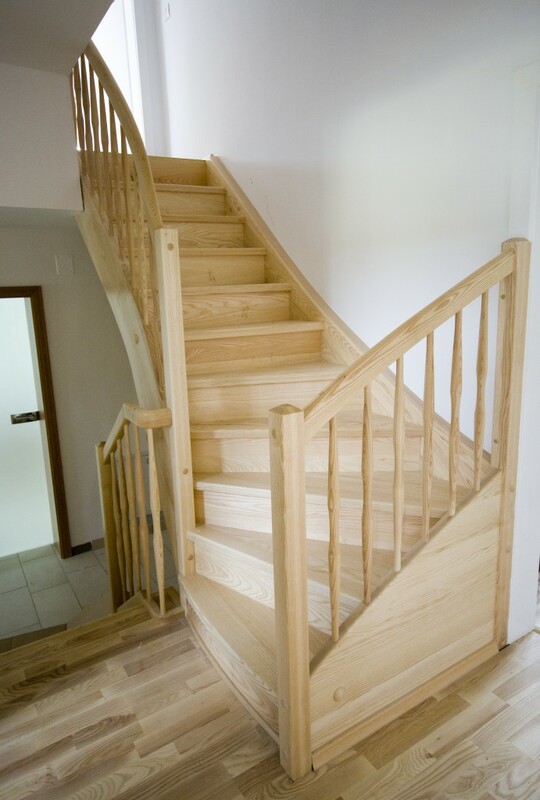 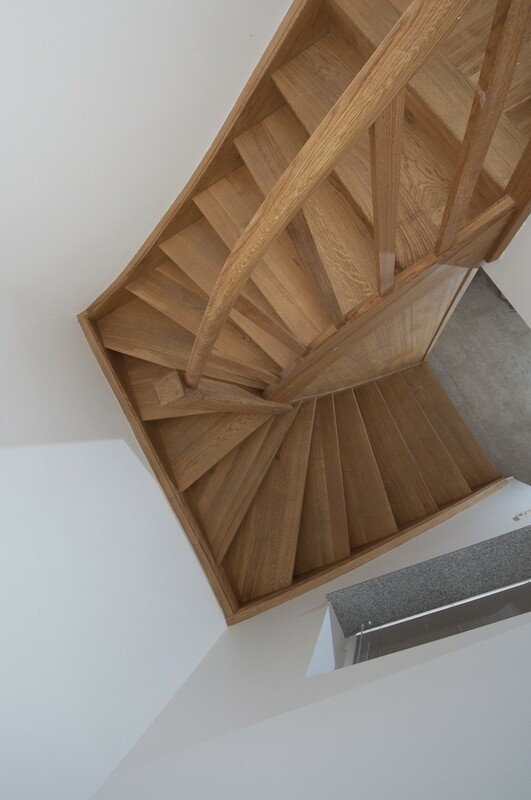 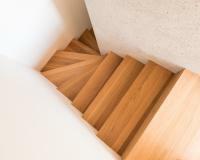 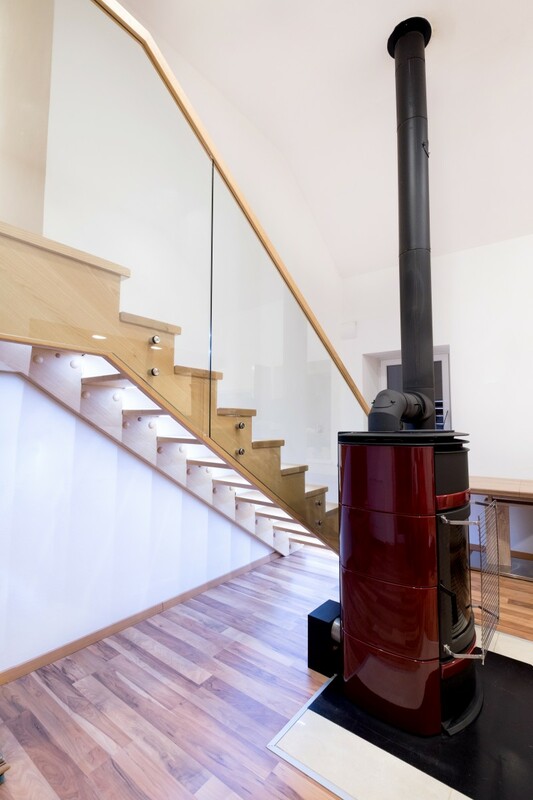 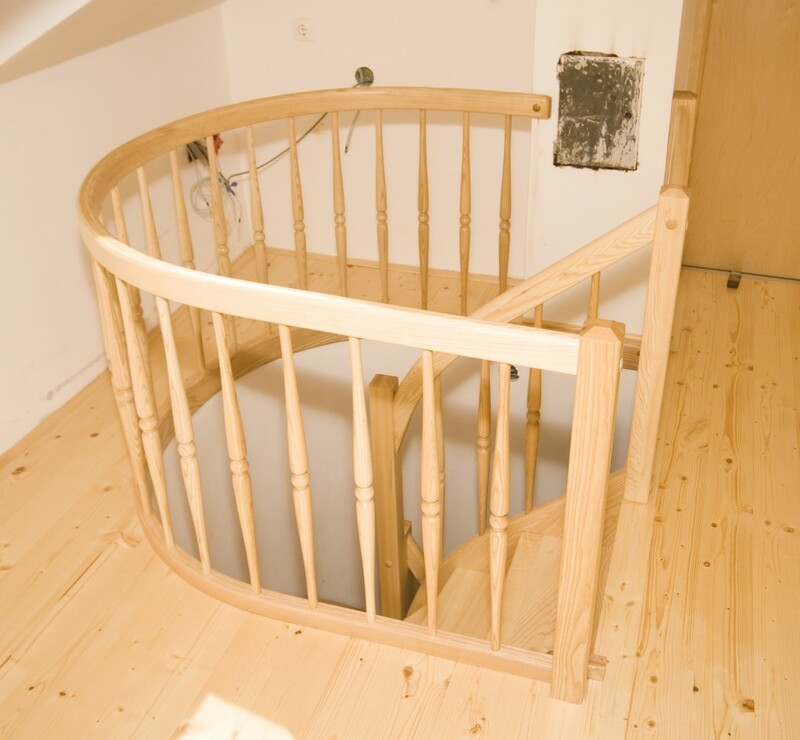 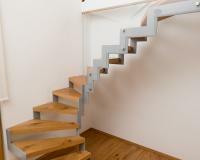 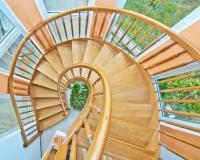 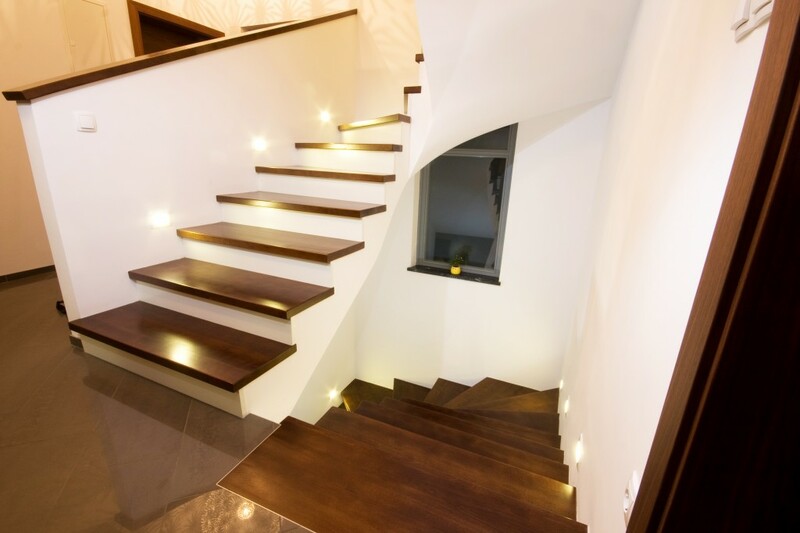 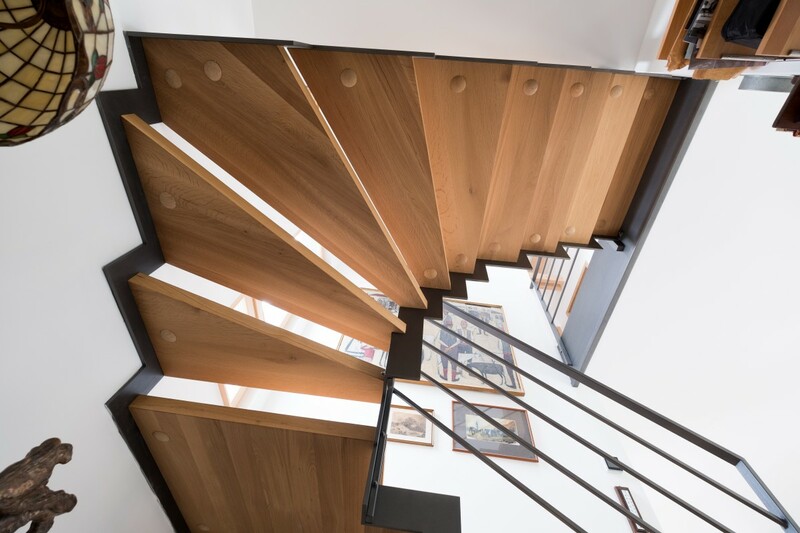 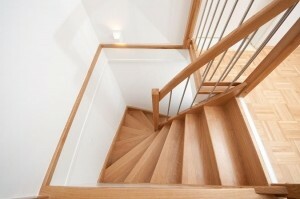 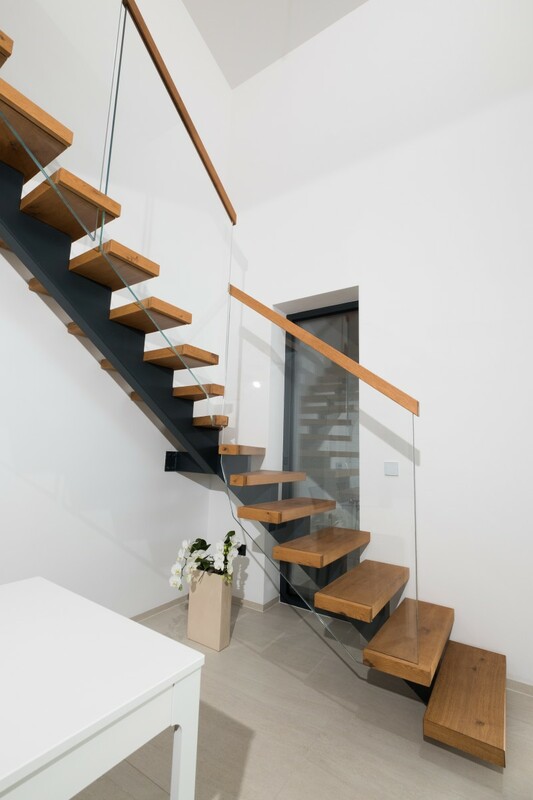 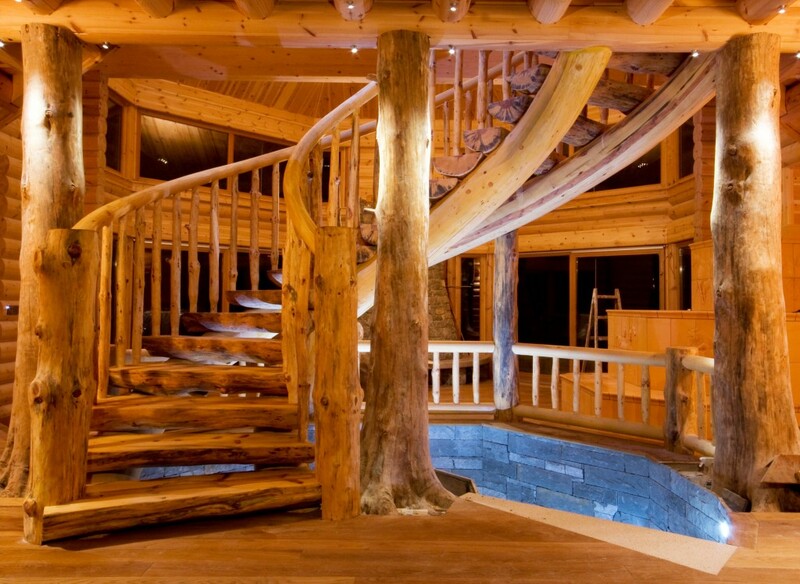 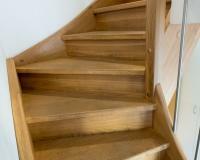 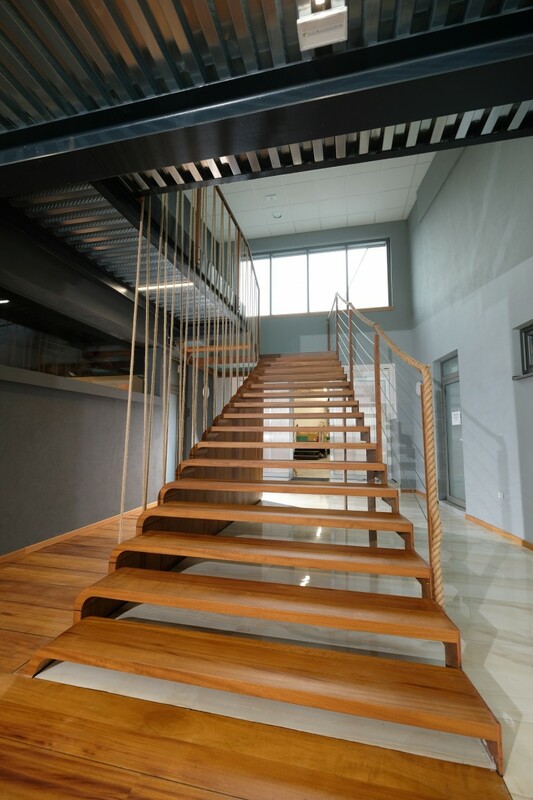 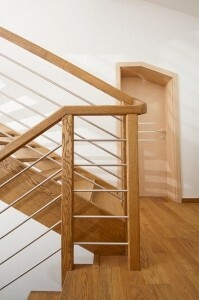 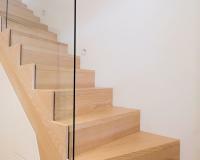 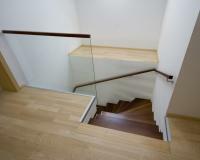 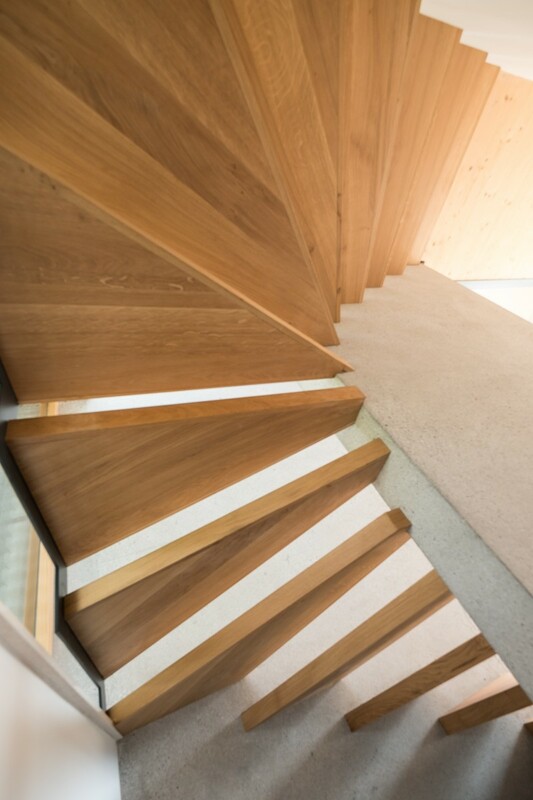 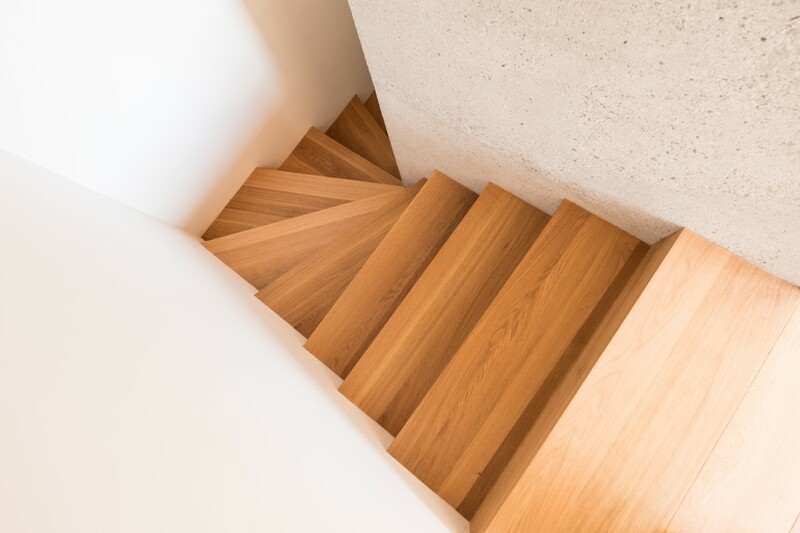 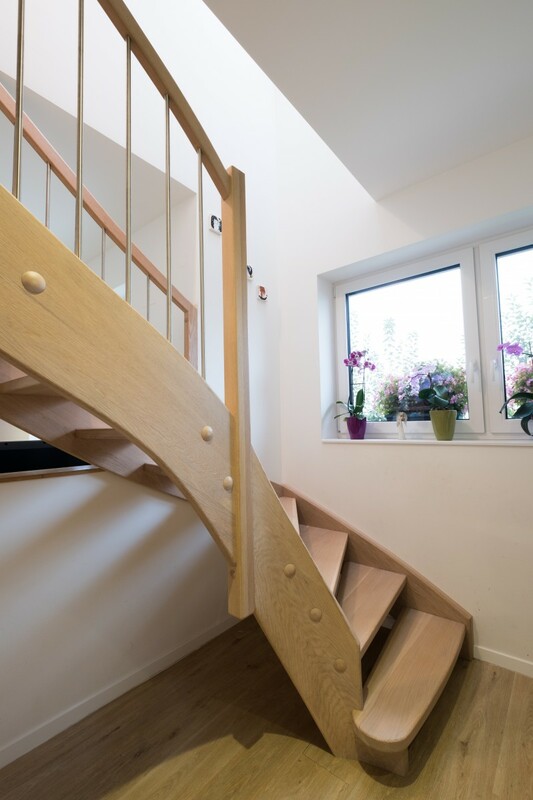 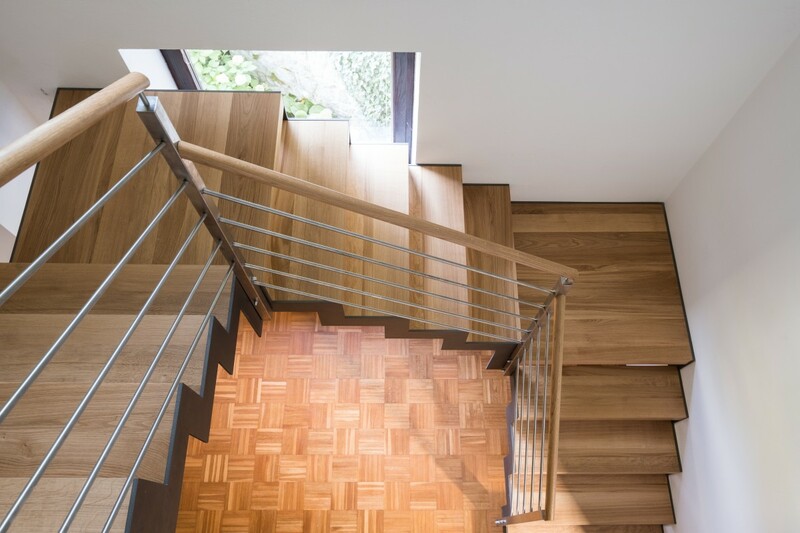 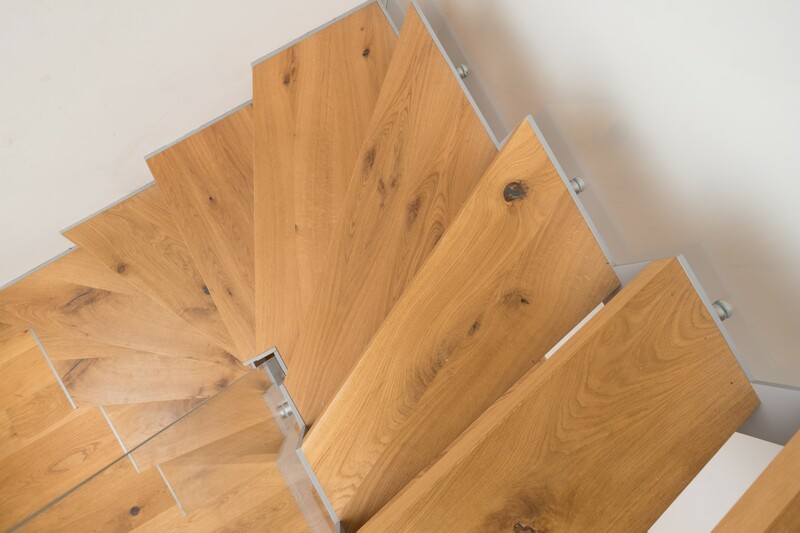 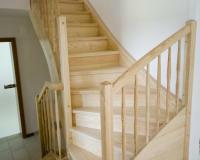 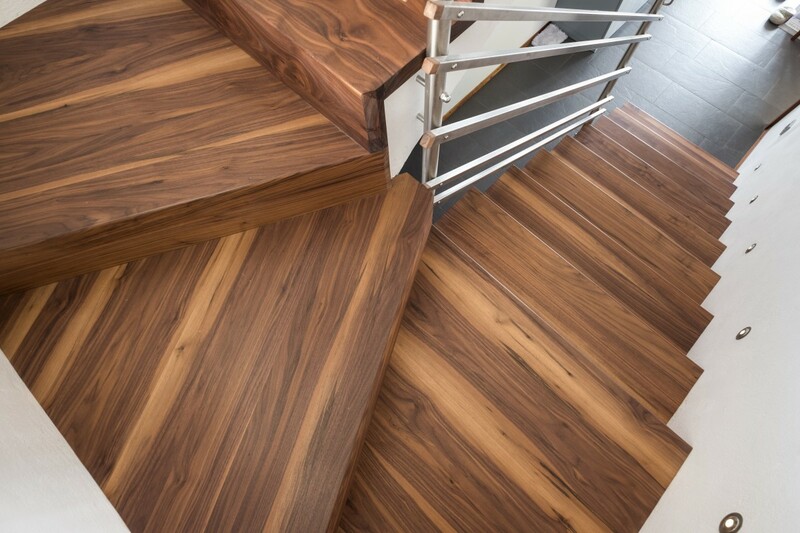 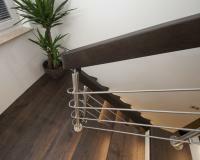 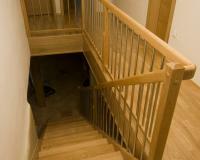 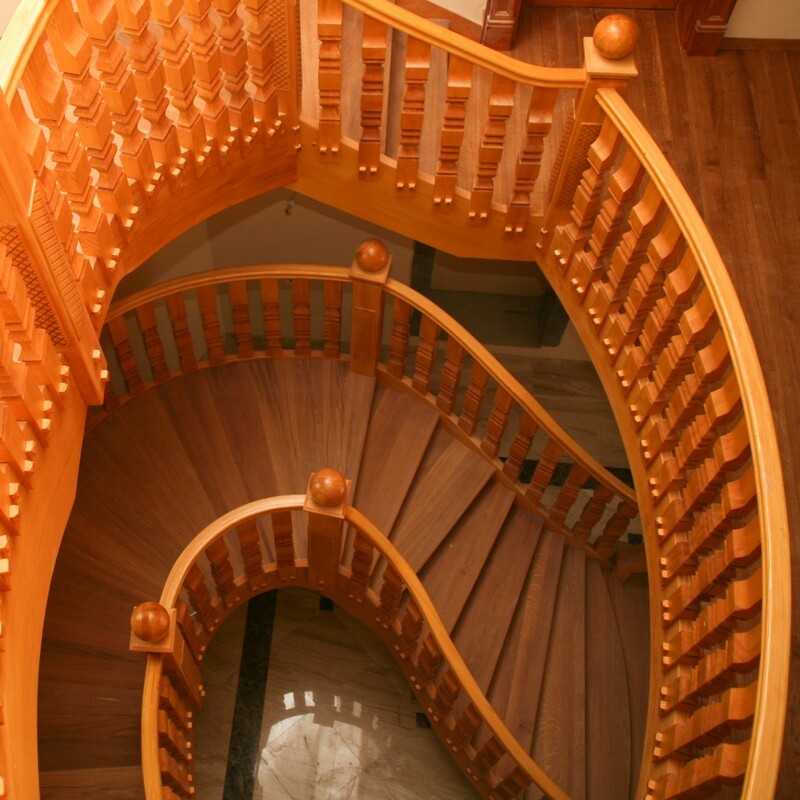 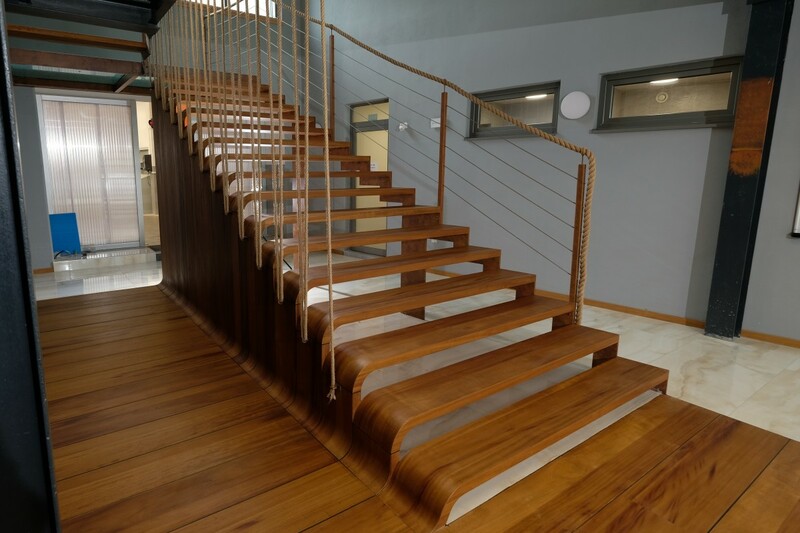 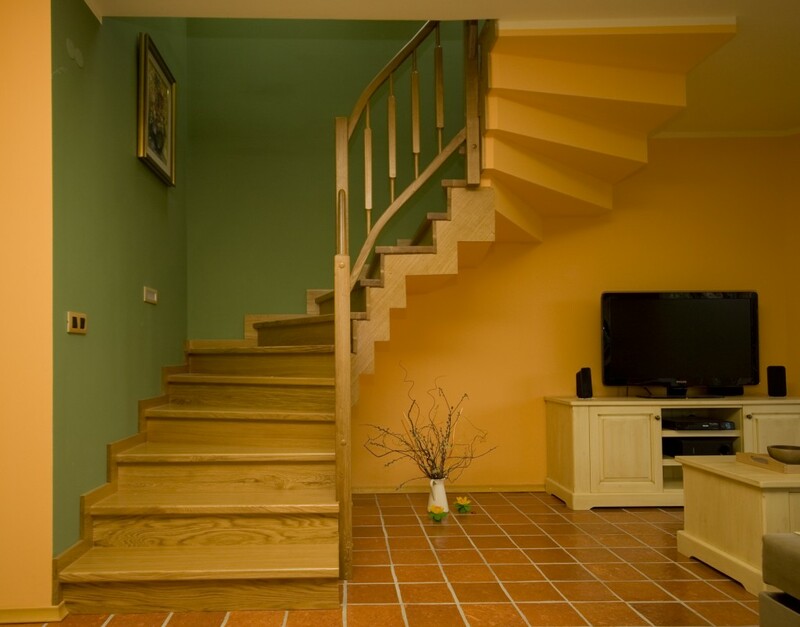 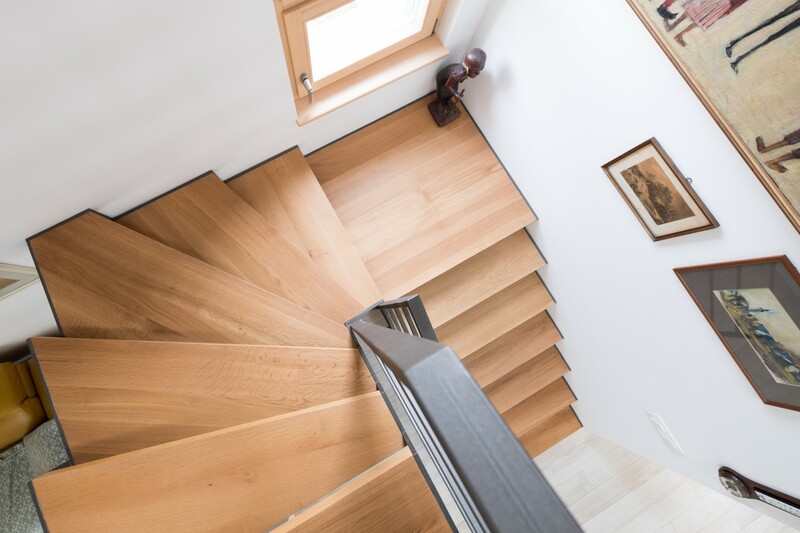 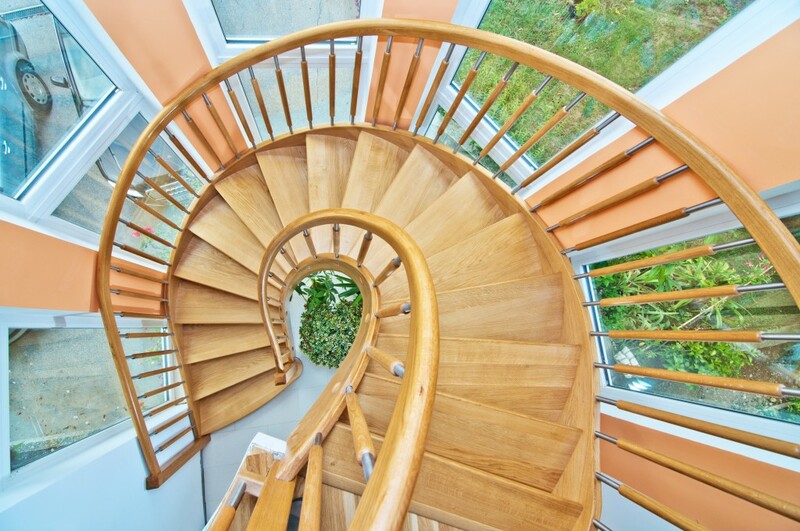 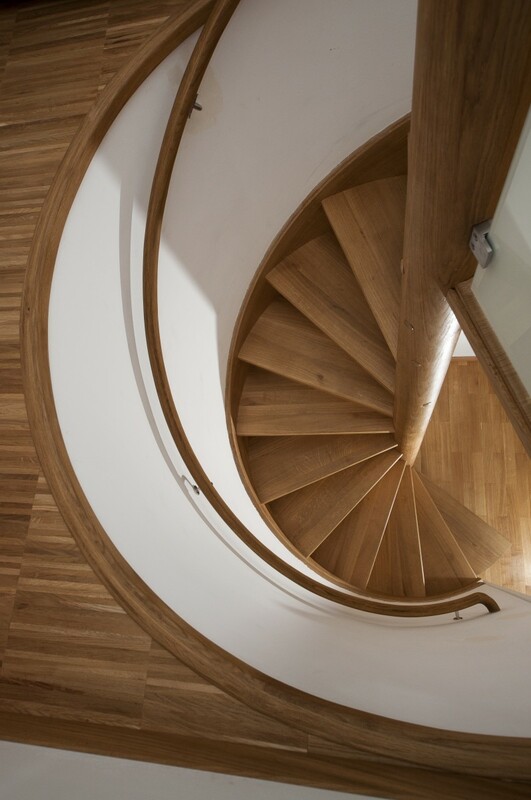 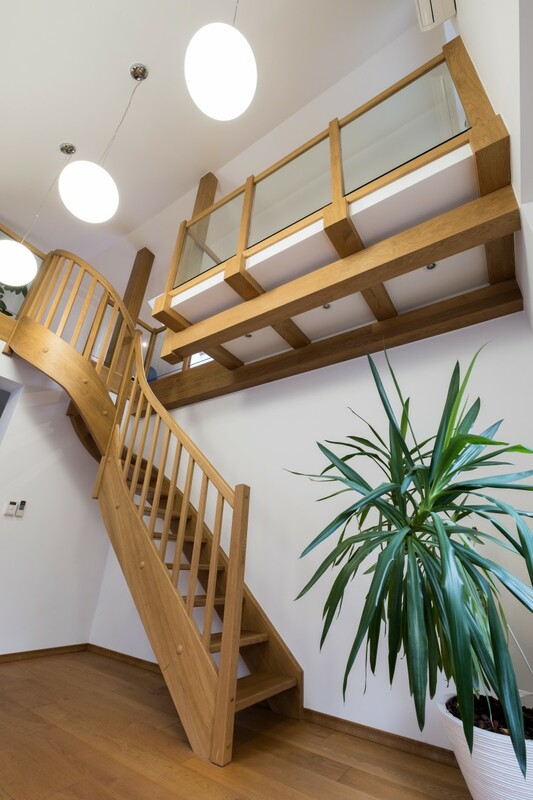 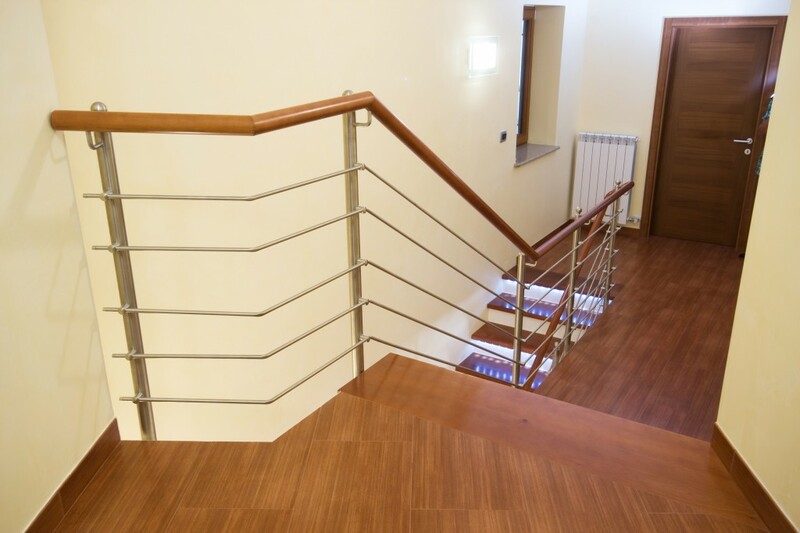 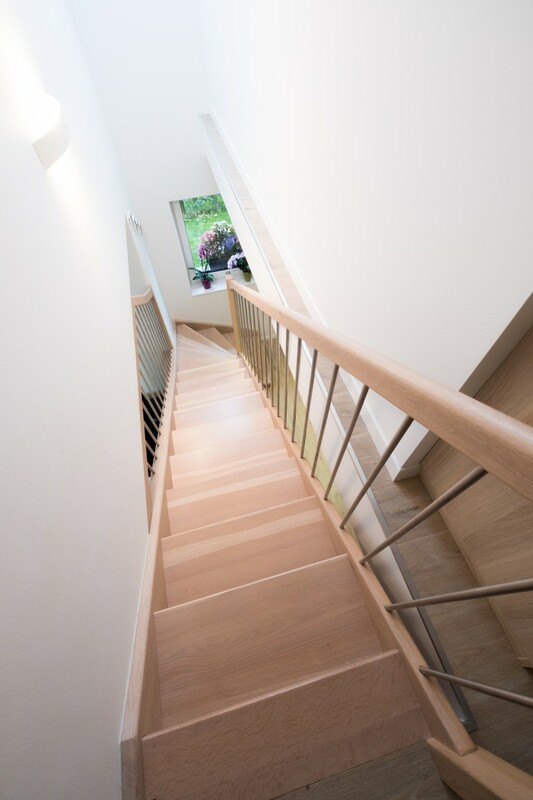 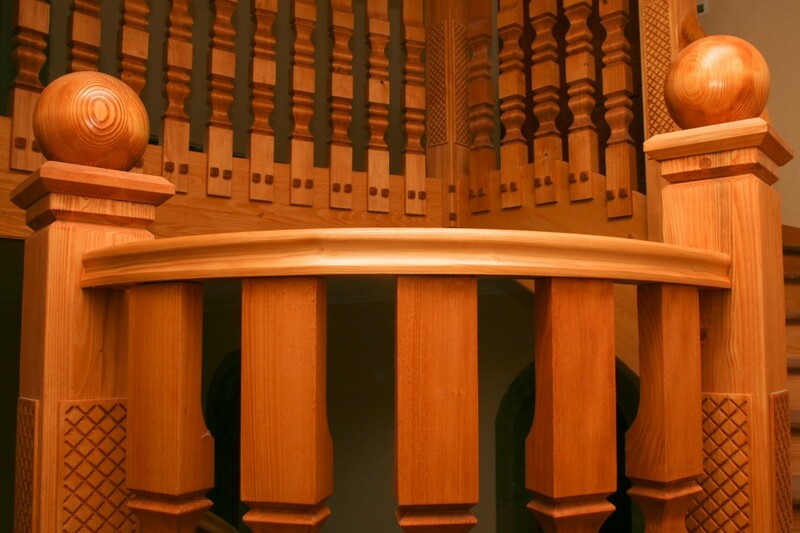 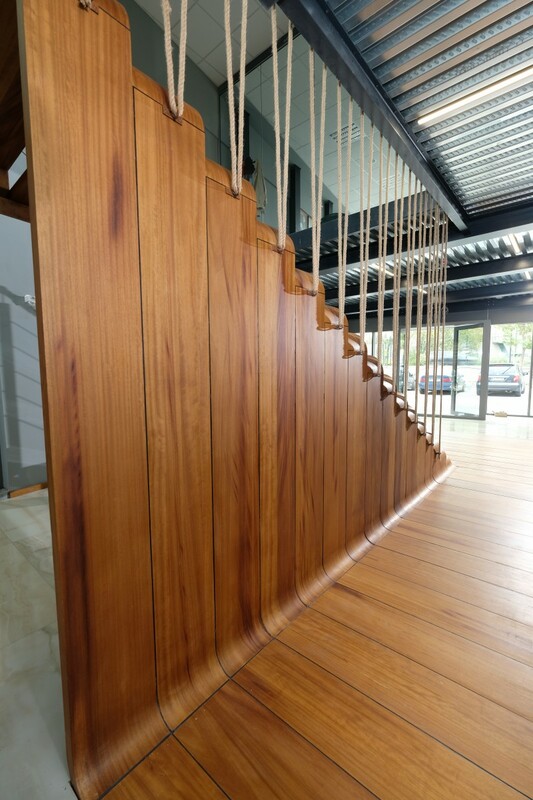 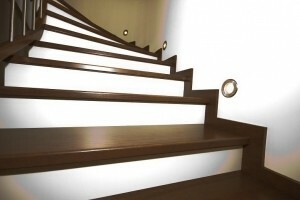 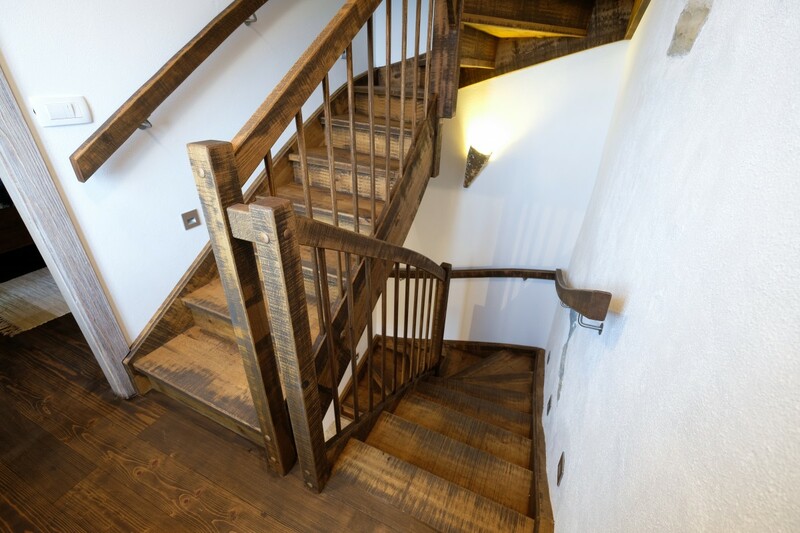 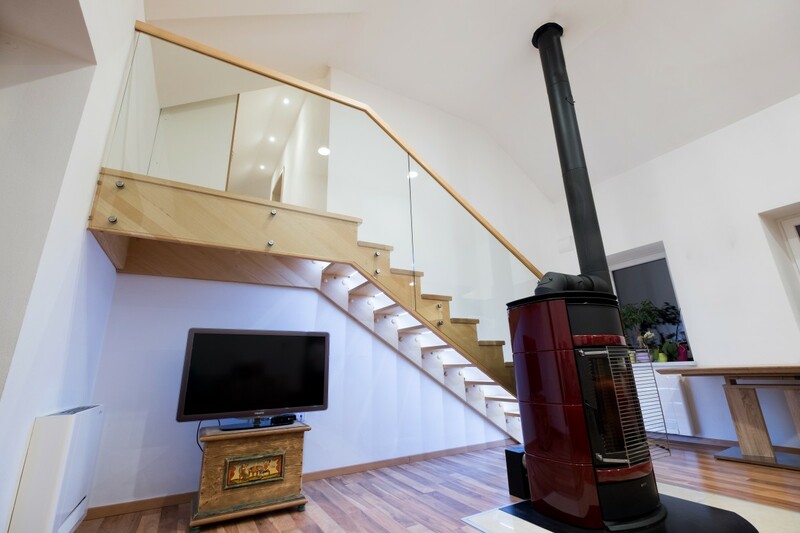 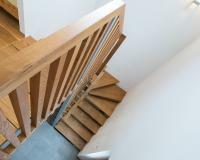 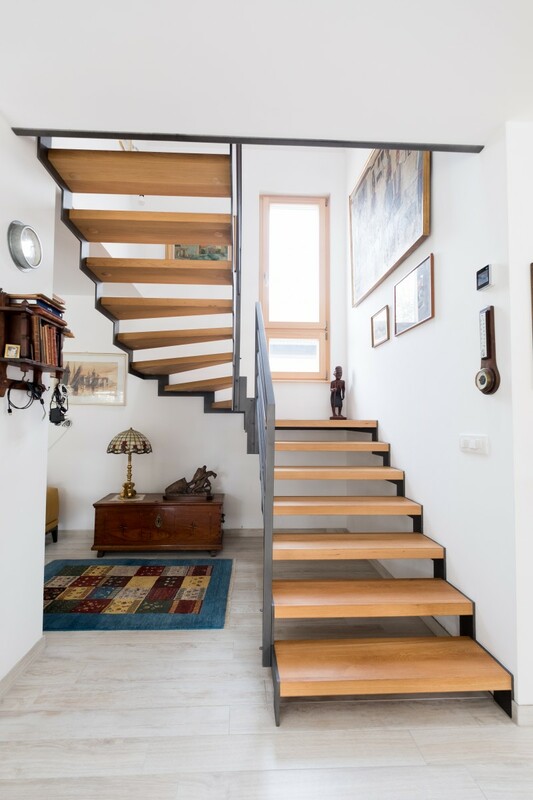 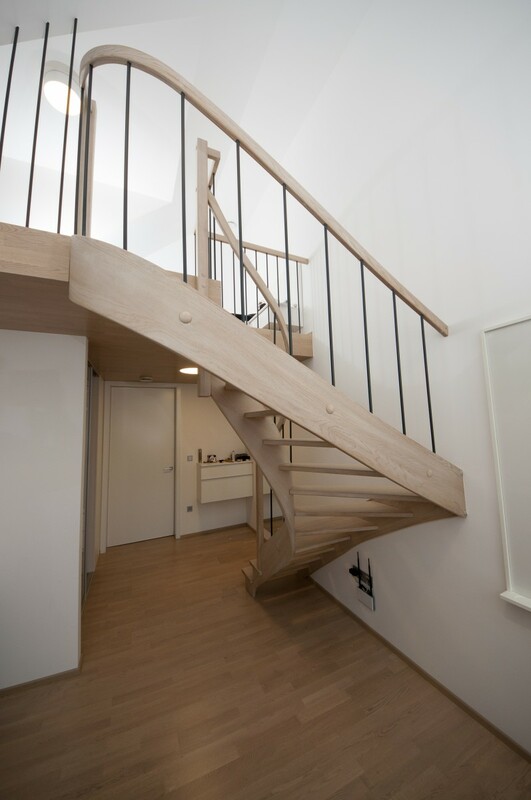 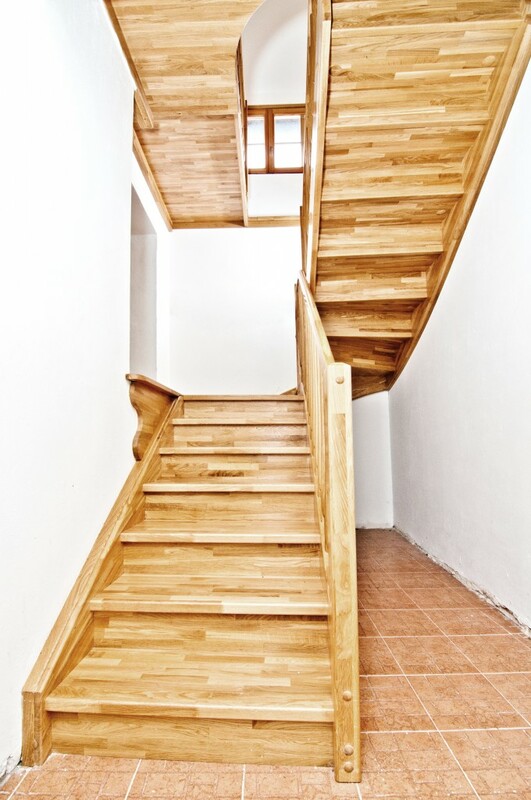 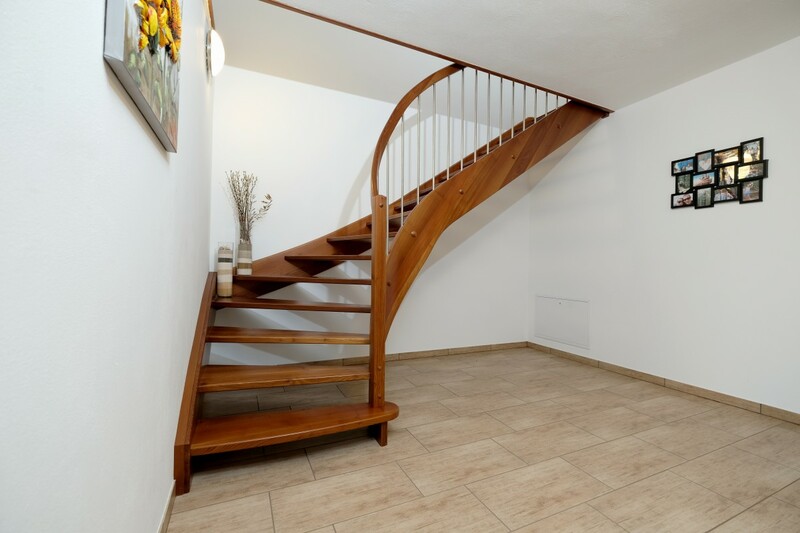 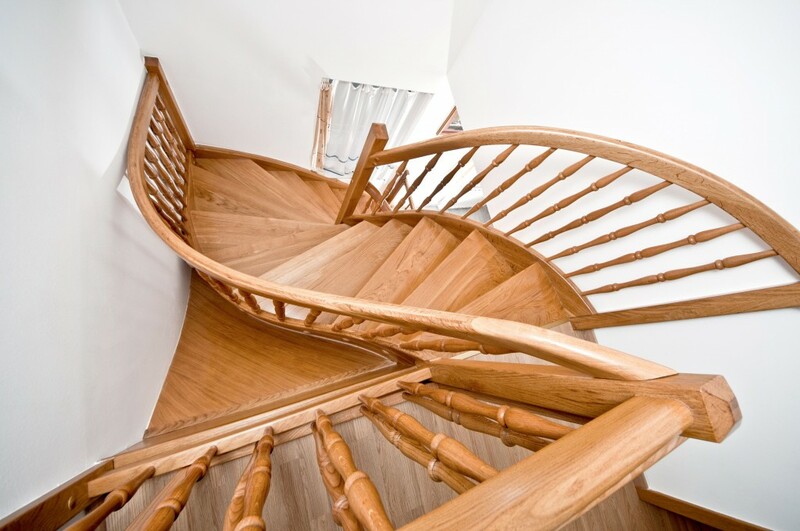 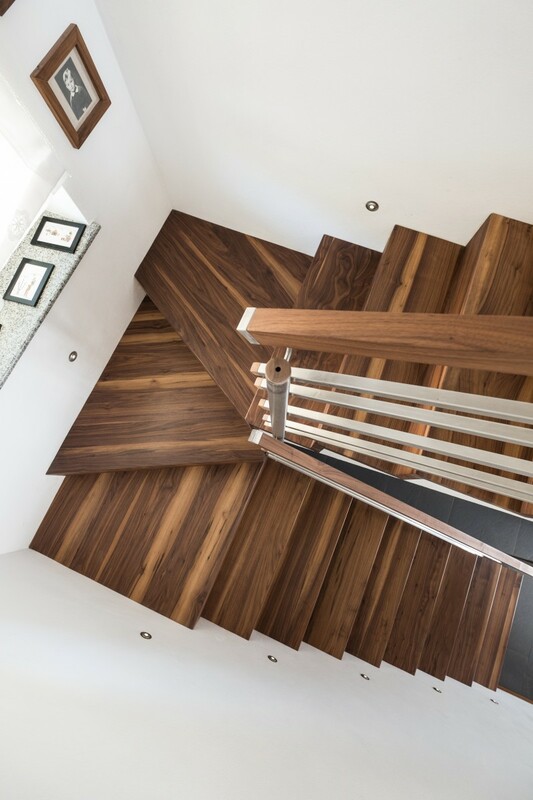 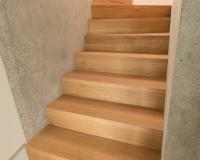 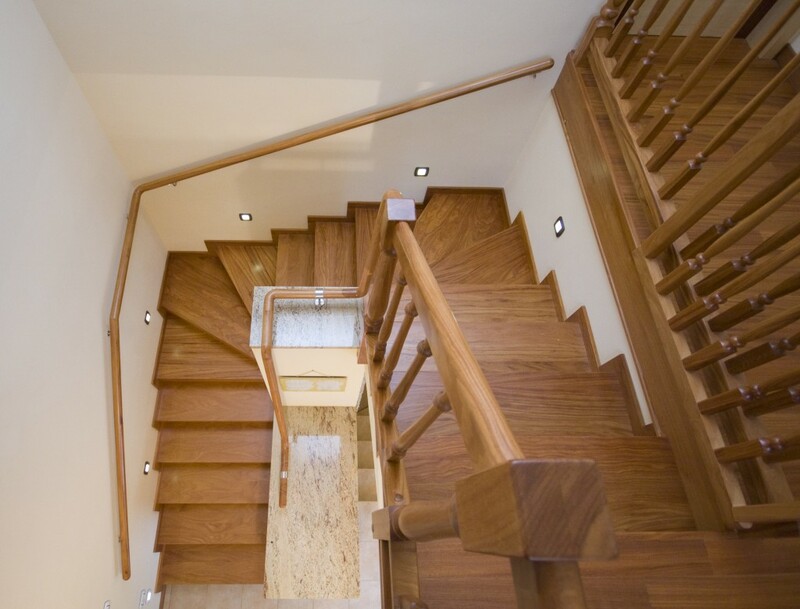 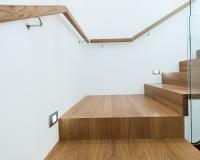 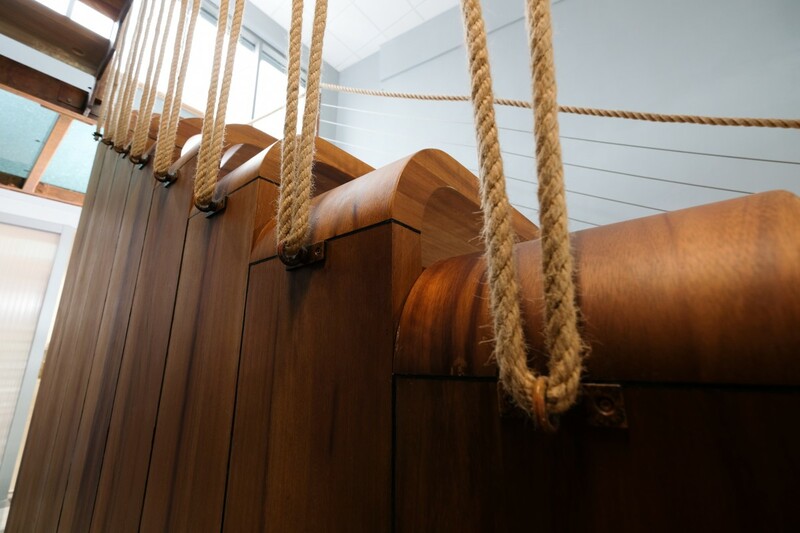 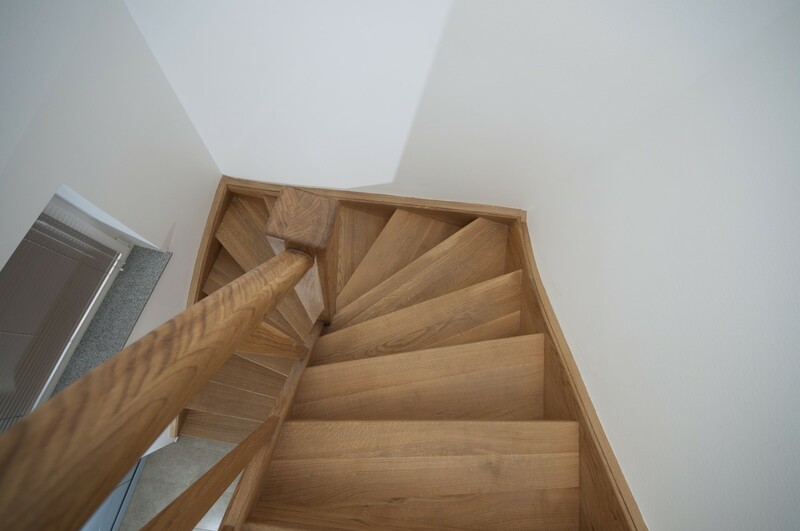 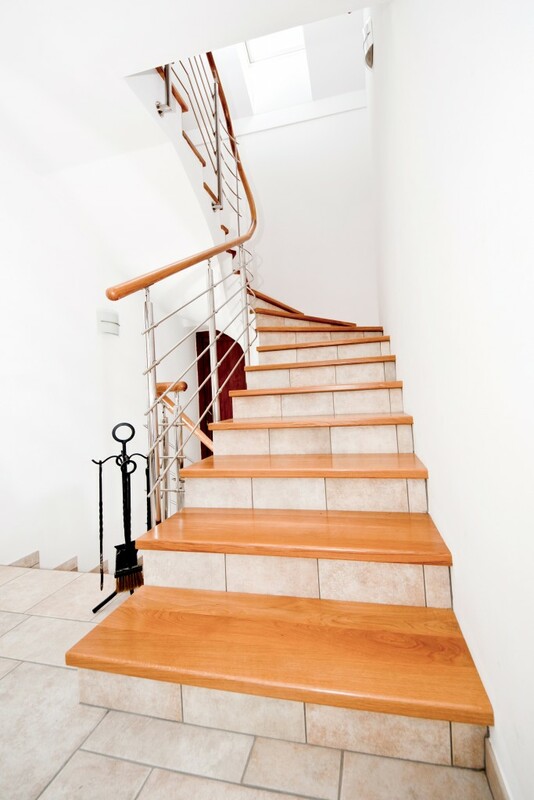 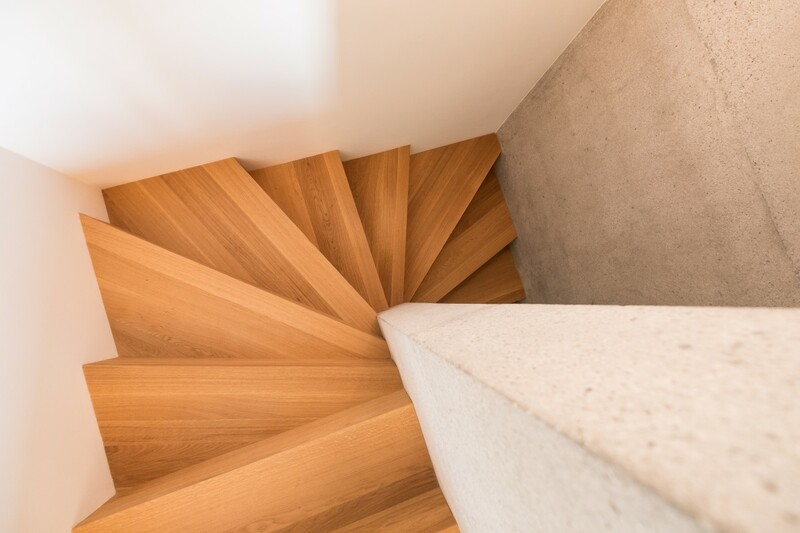 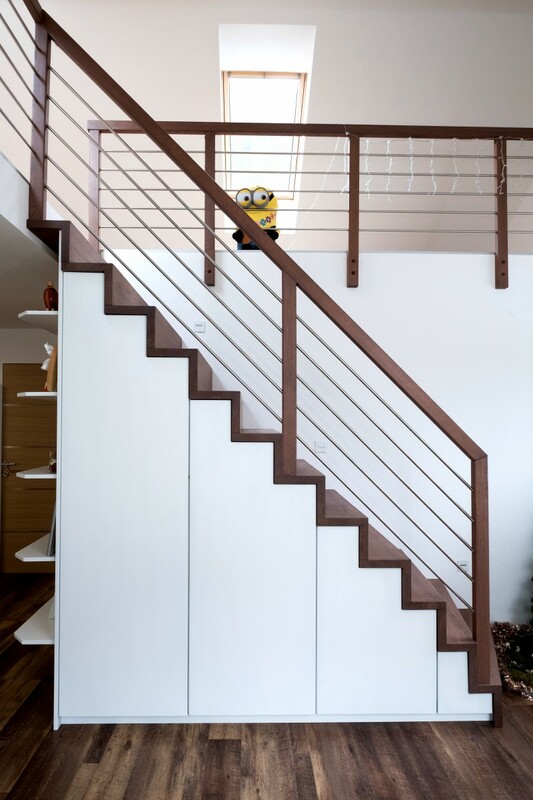 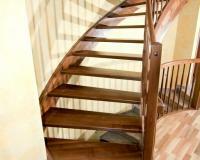 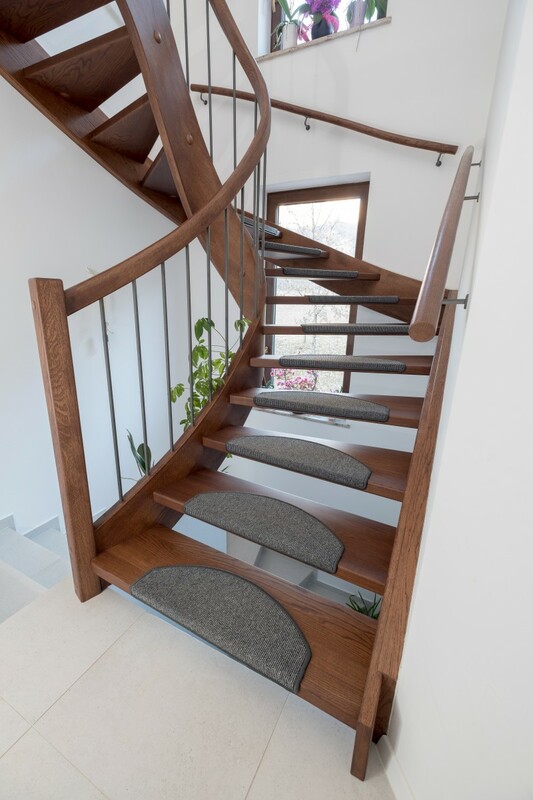 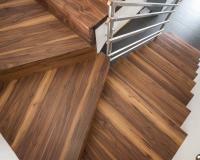 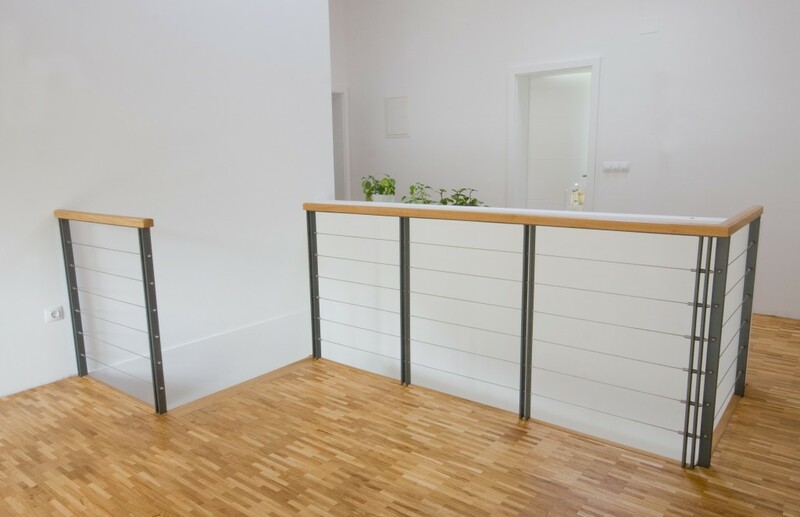 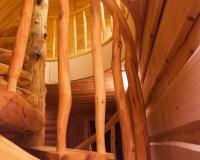 We work with the state-of-the-art computer-controlled machines and programs for designing wooden stairs. 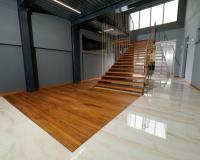 Our new workshop measures 800 m2 of work area. 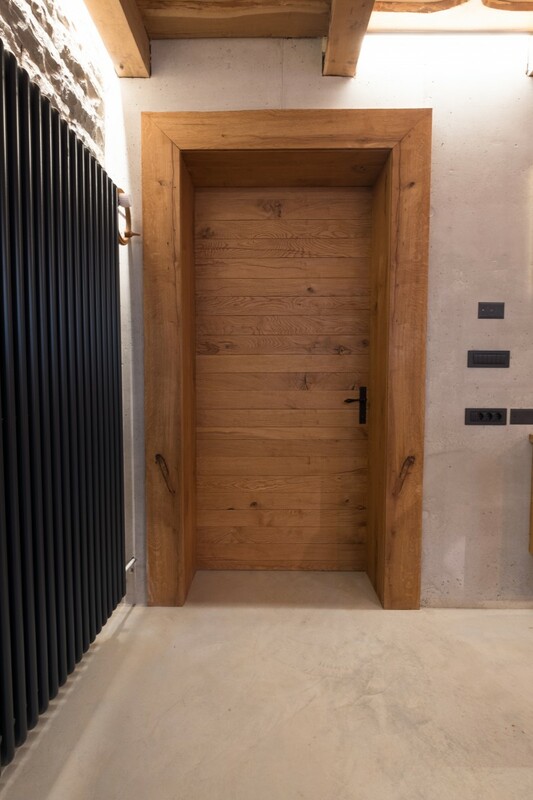 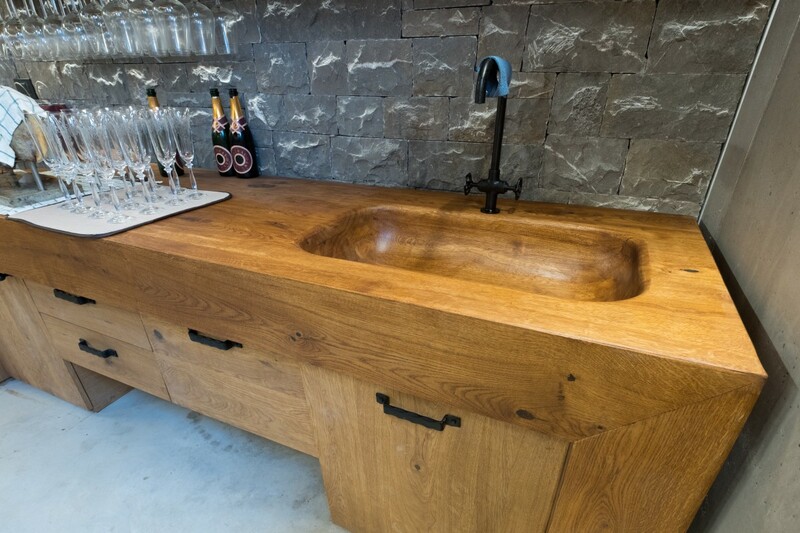 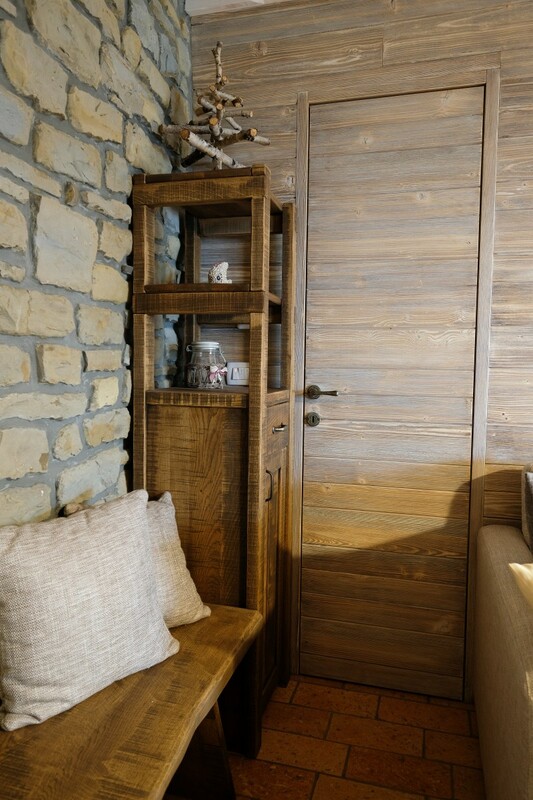 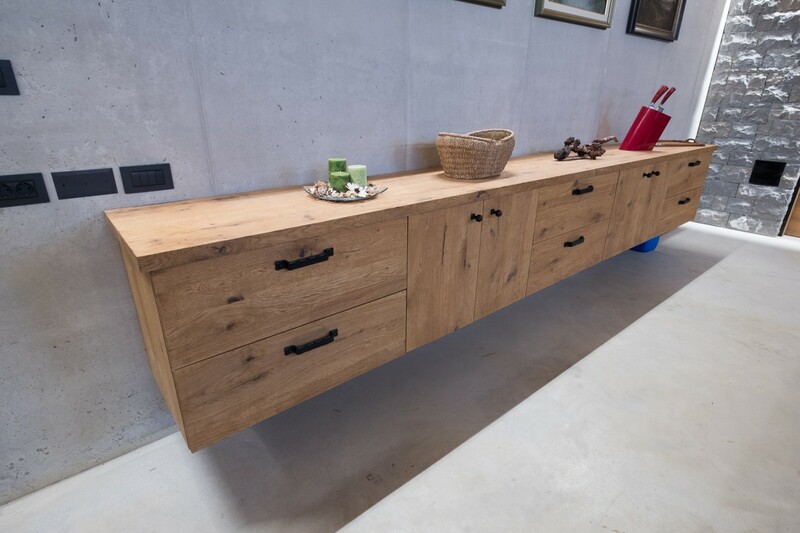 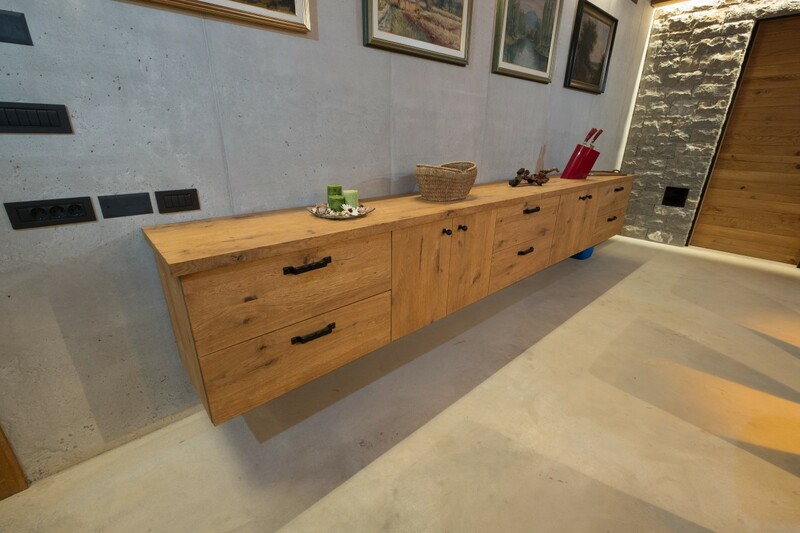 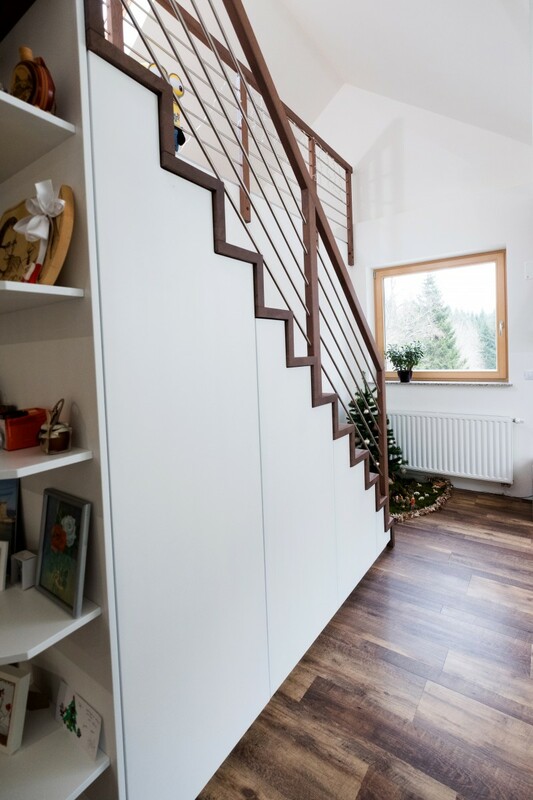 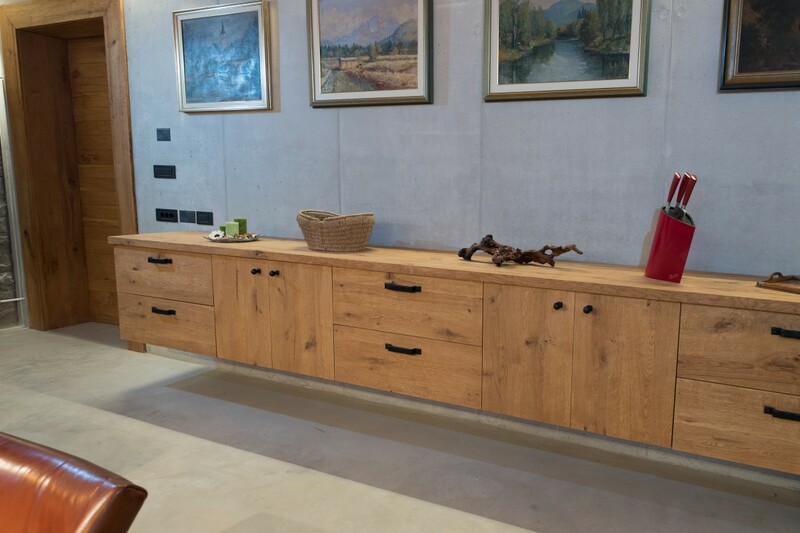 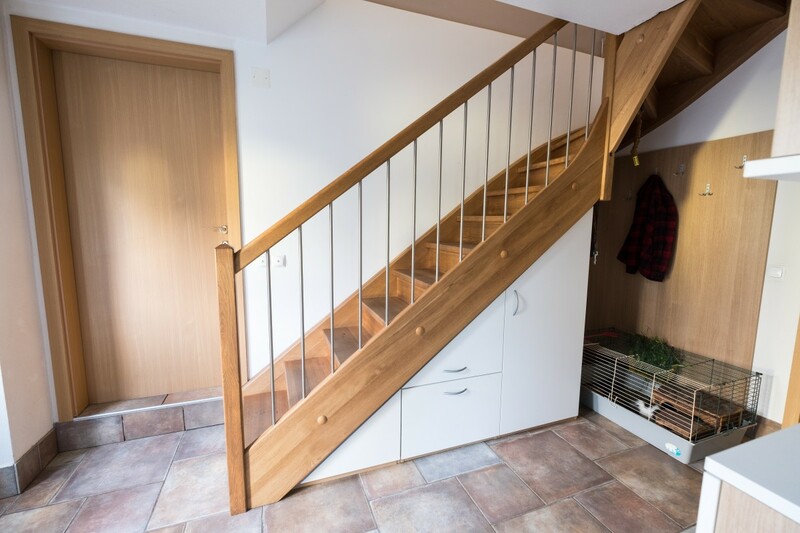 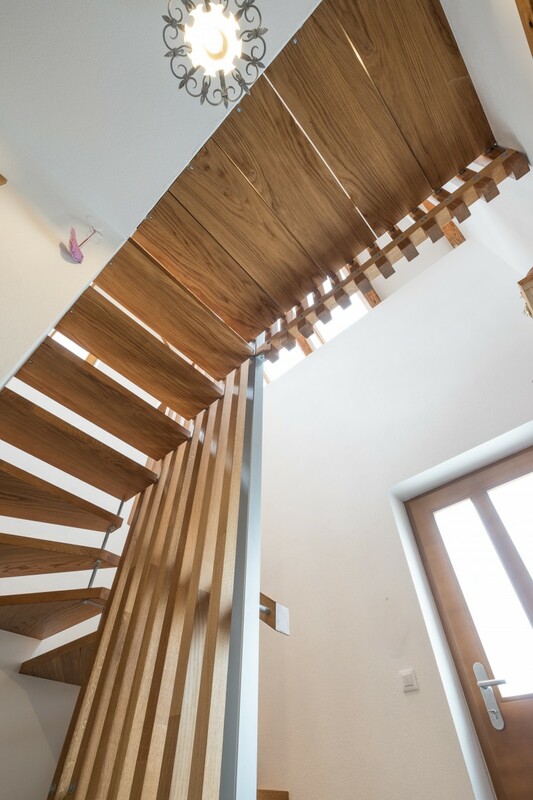 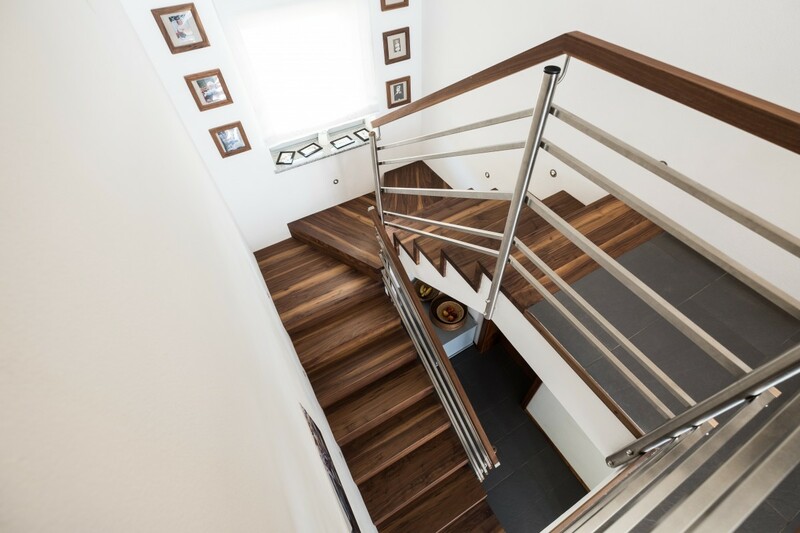 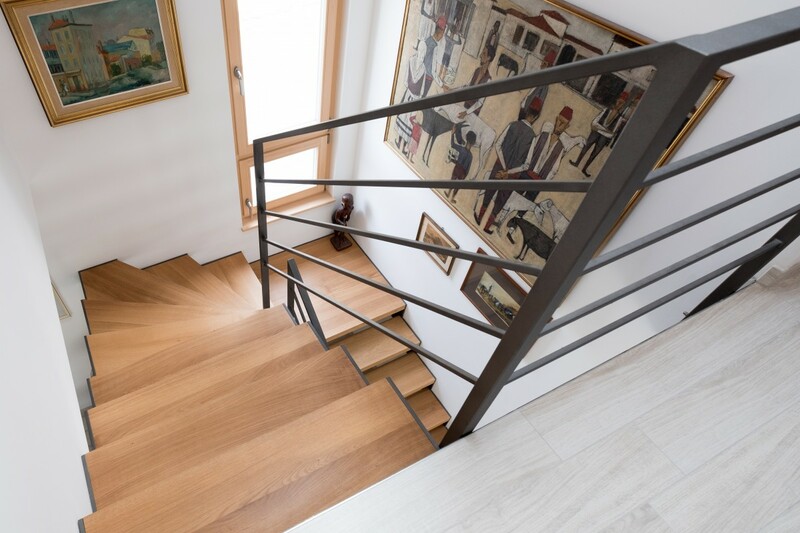 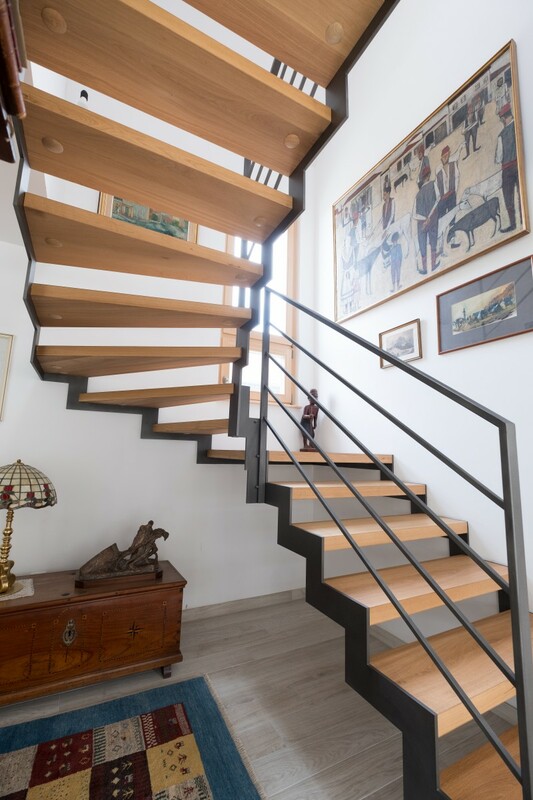 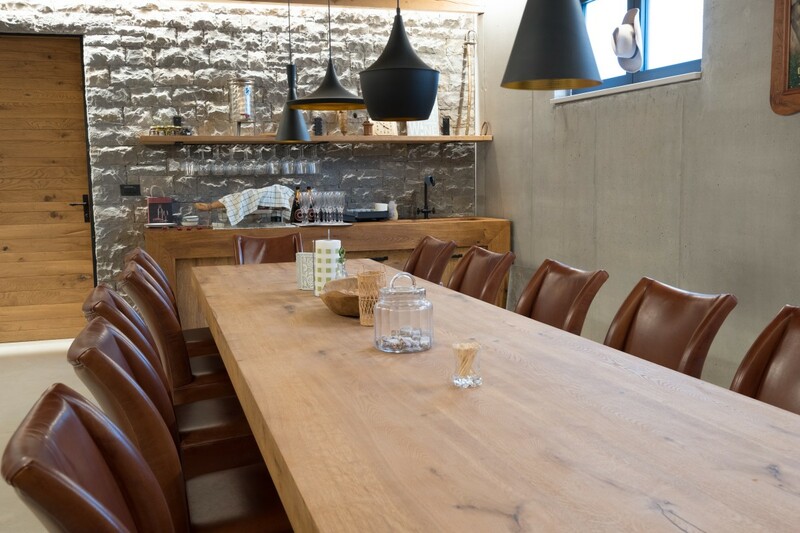 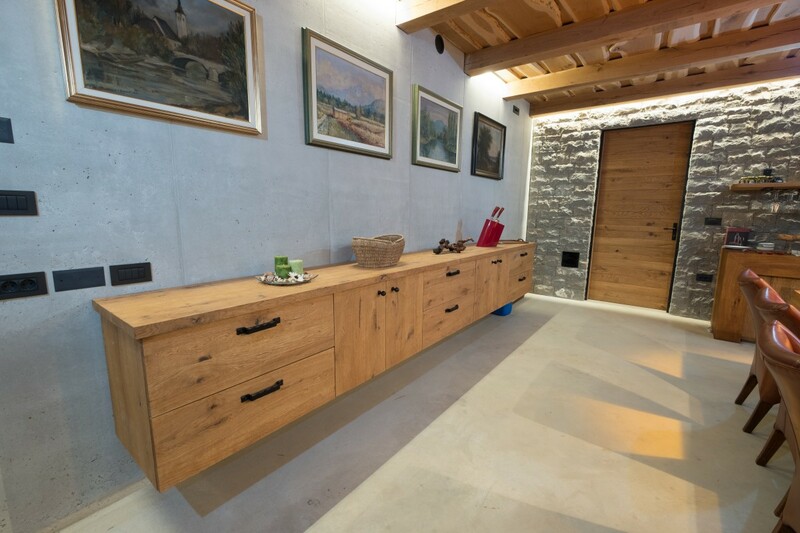 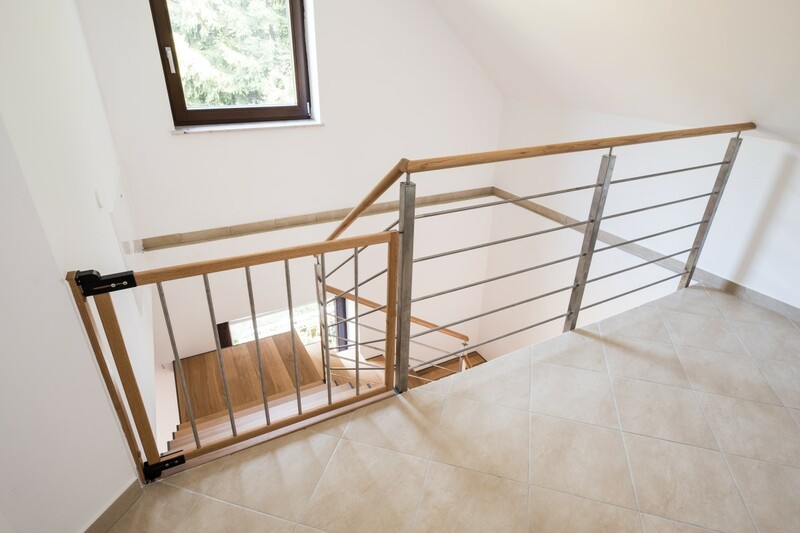 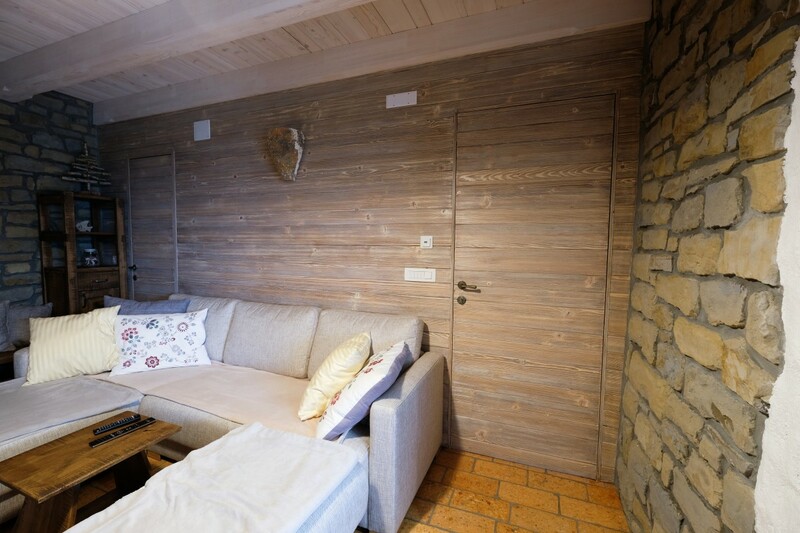 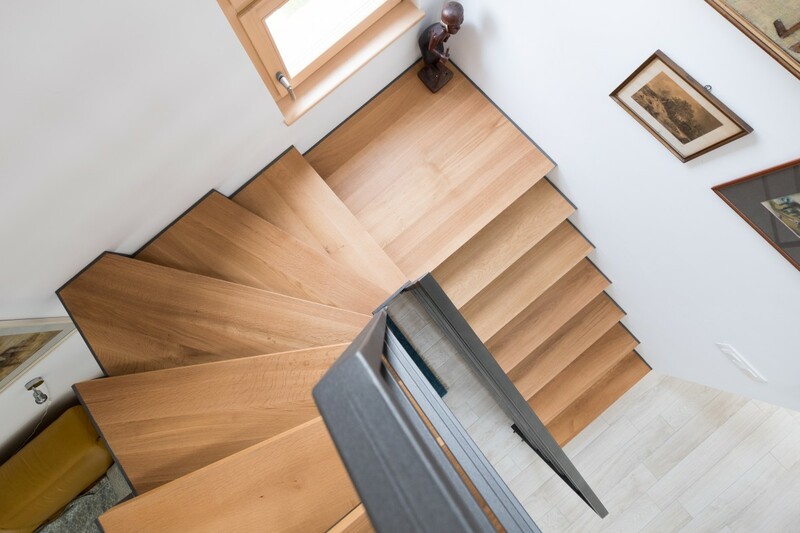 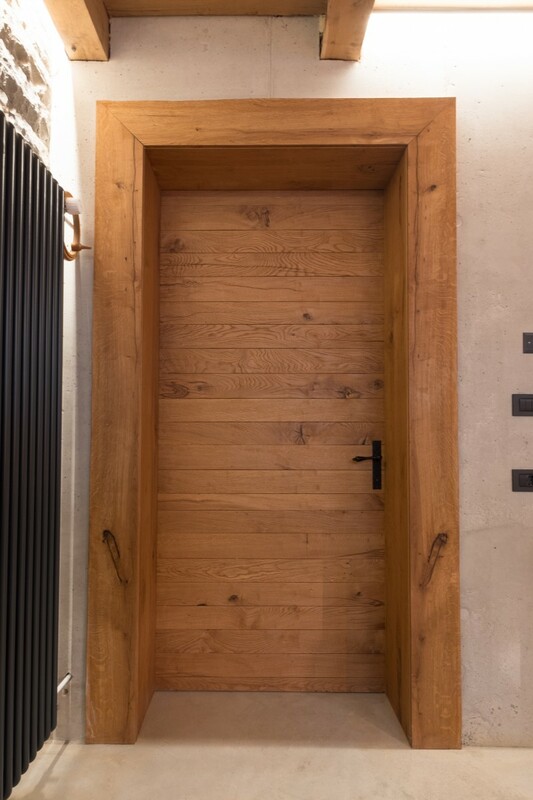 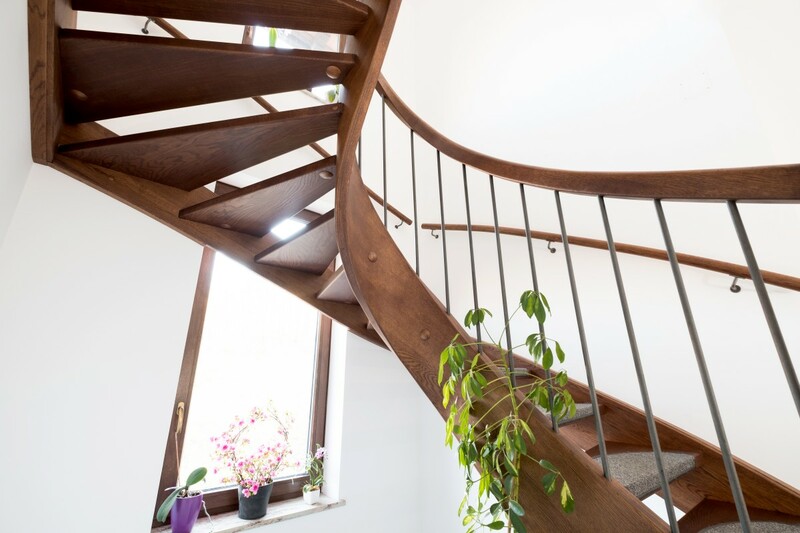 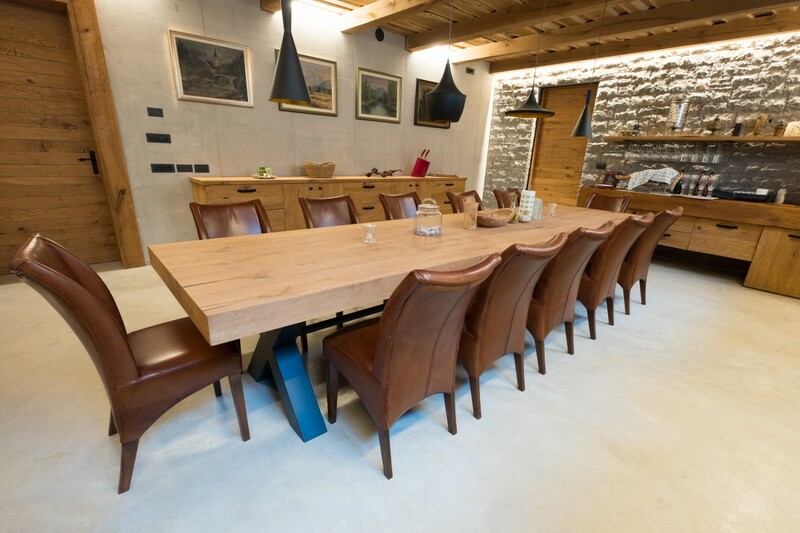 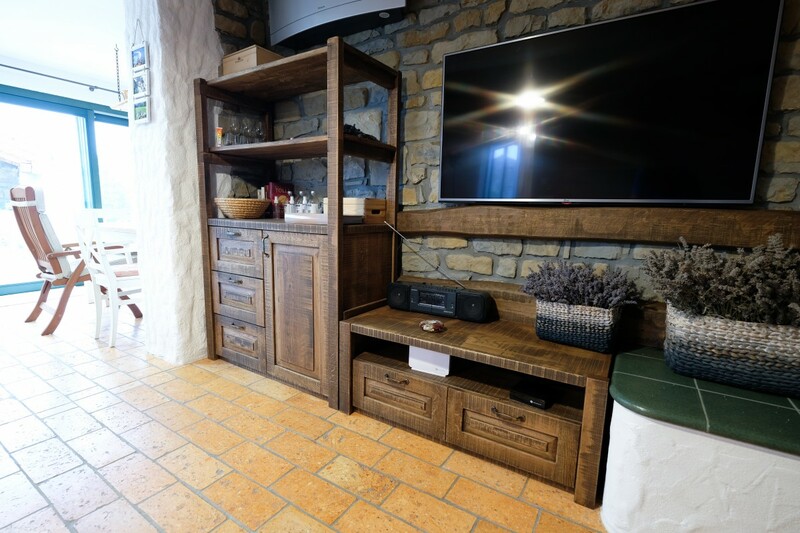 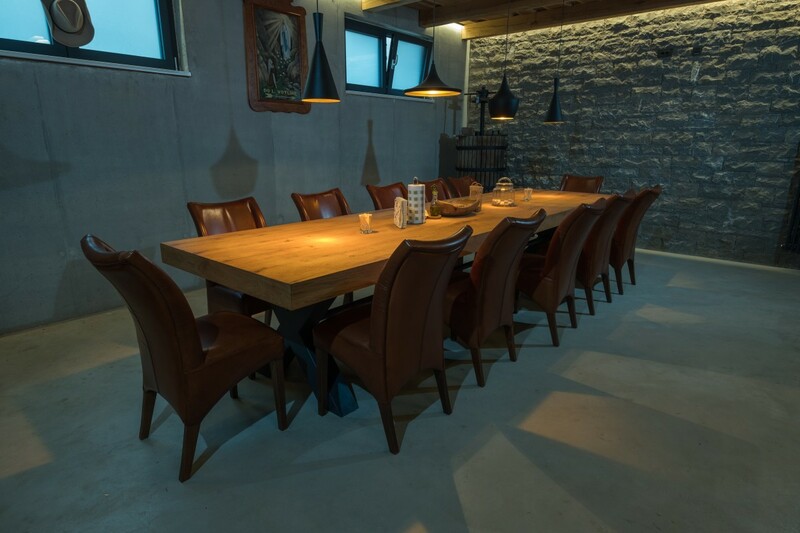 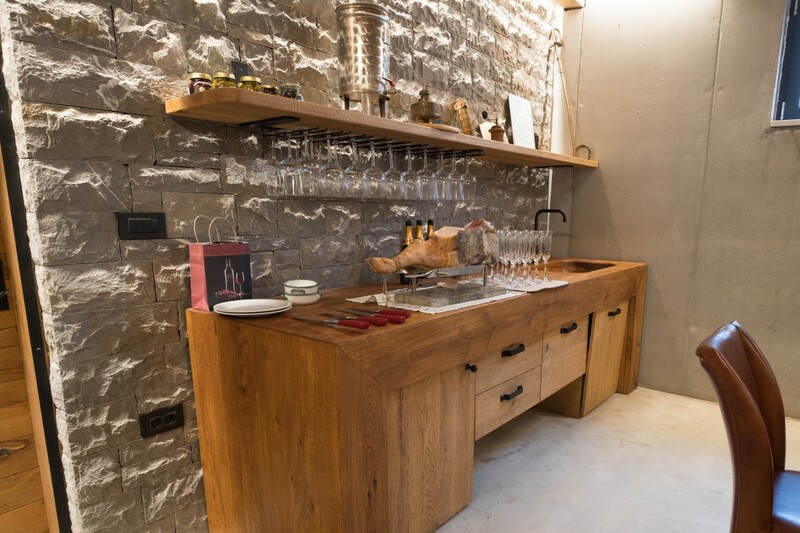 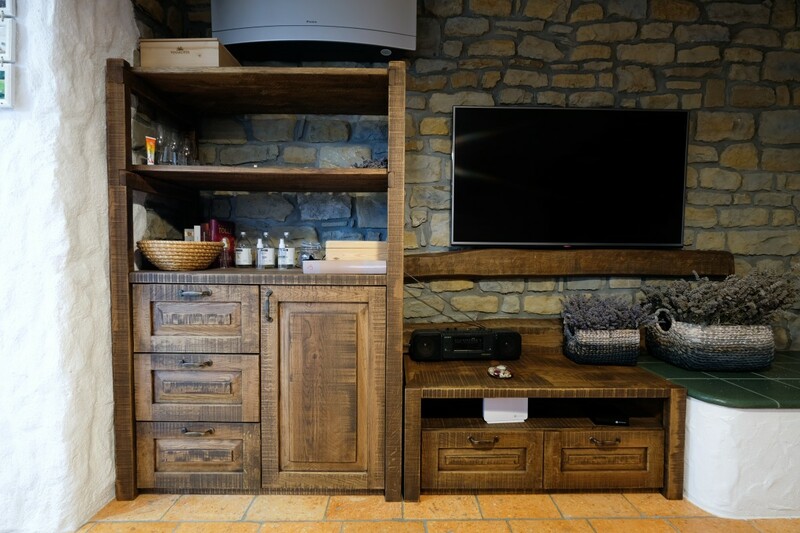 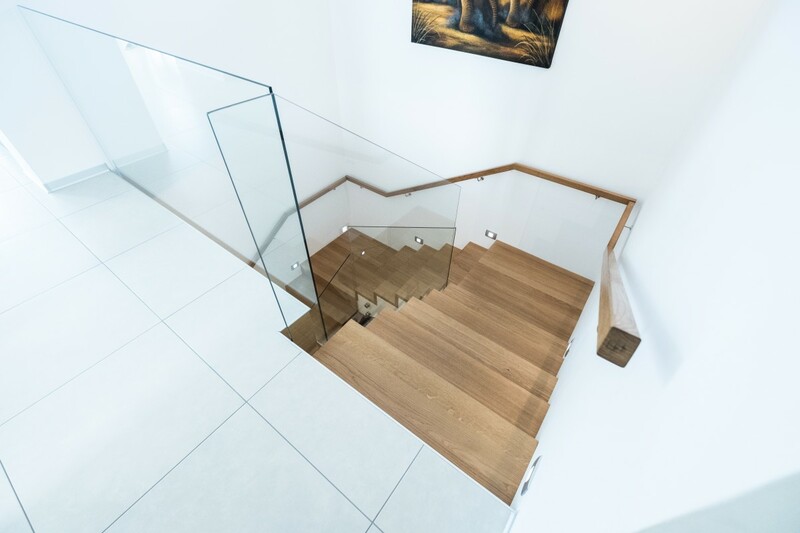 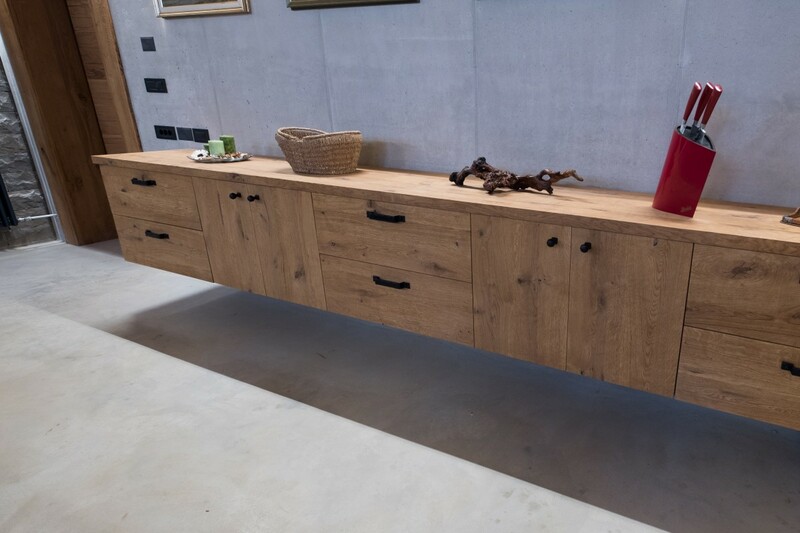 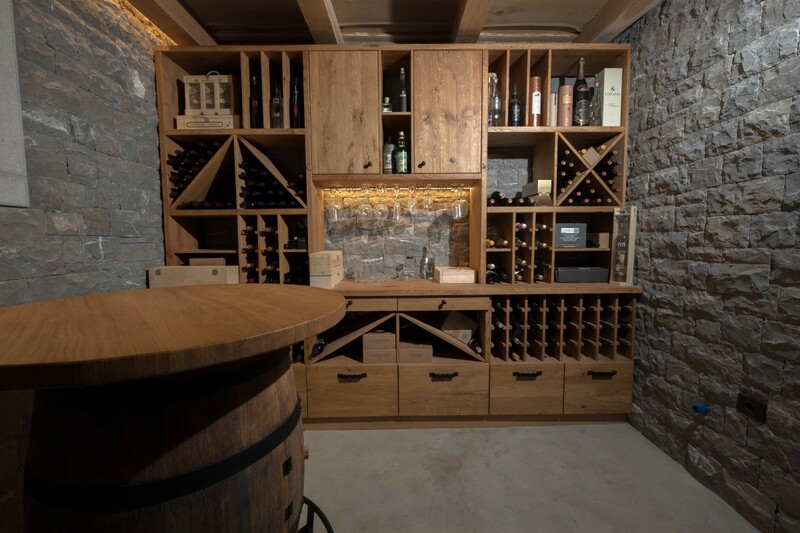 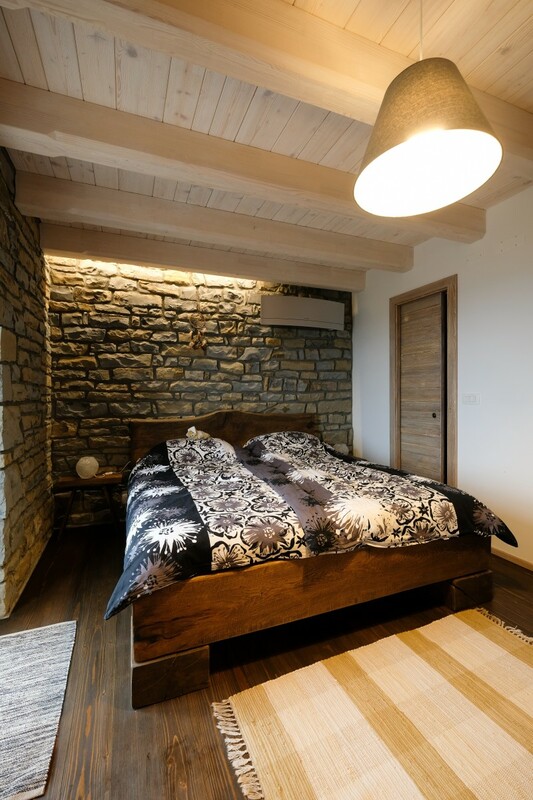 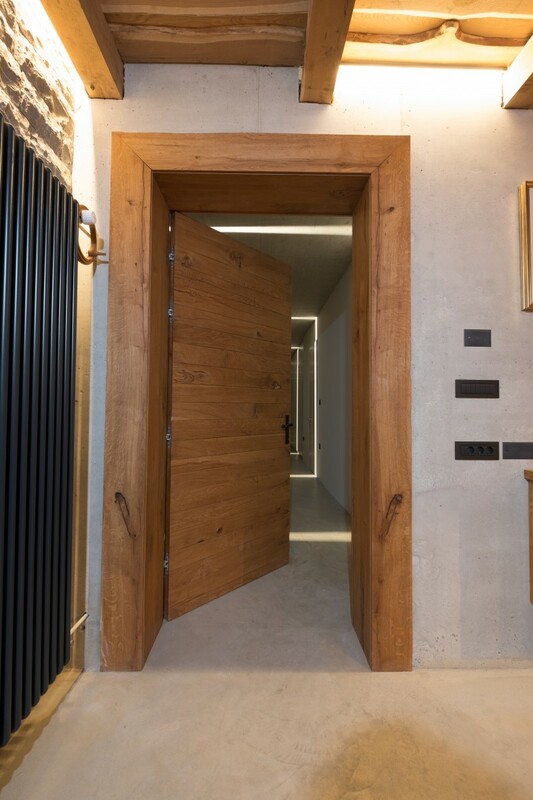 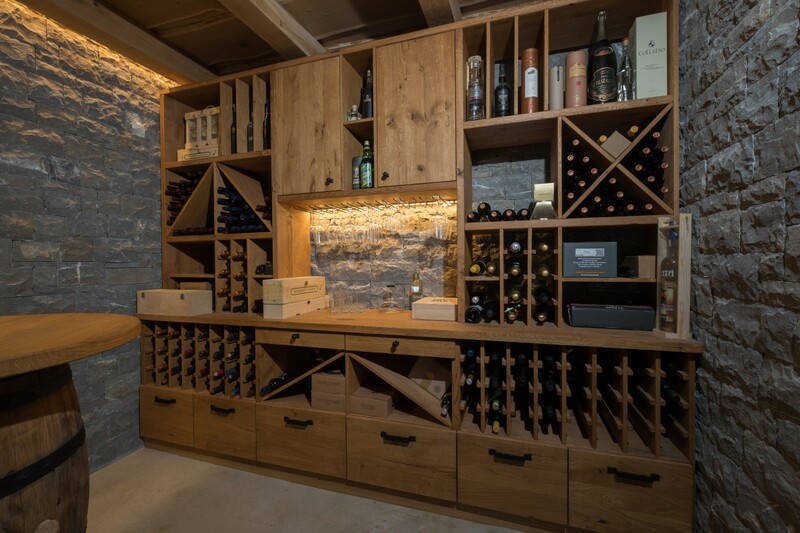 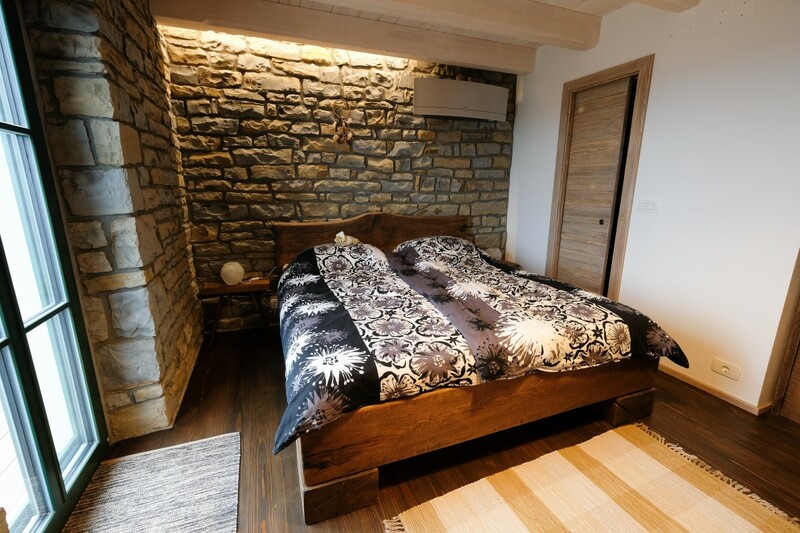 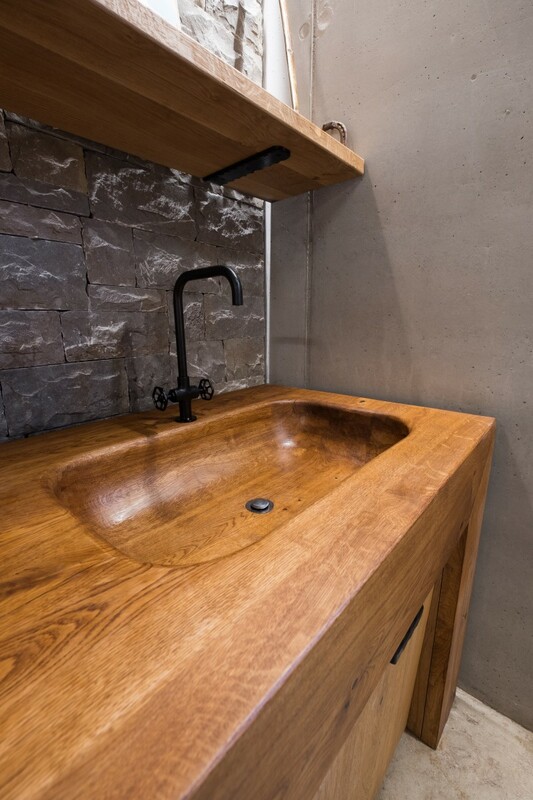 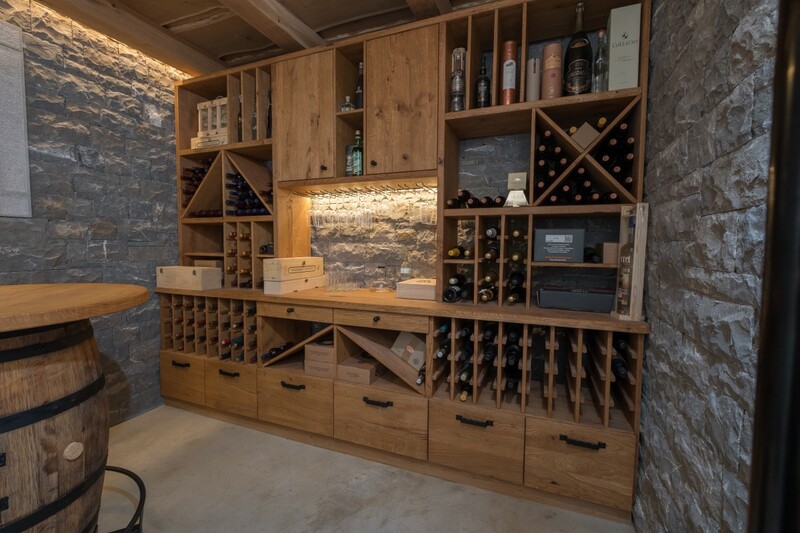 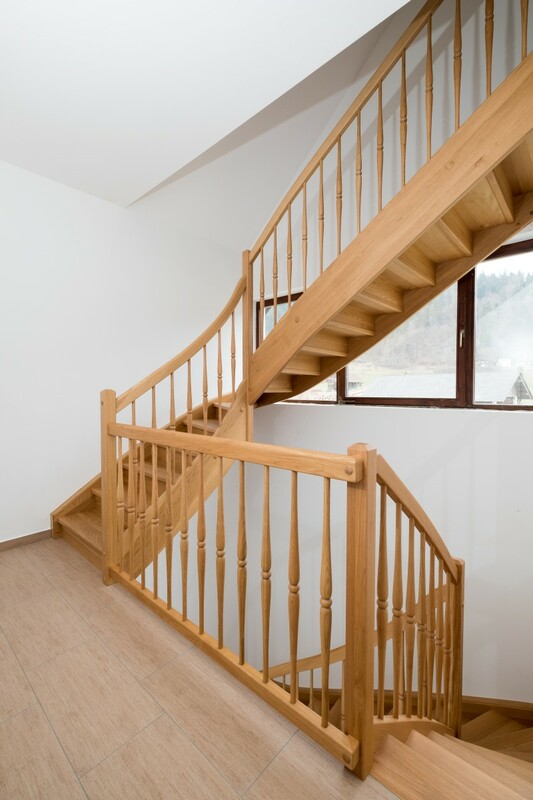 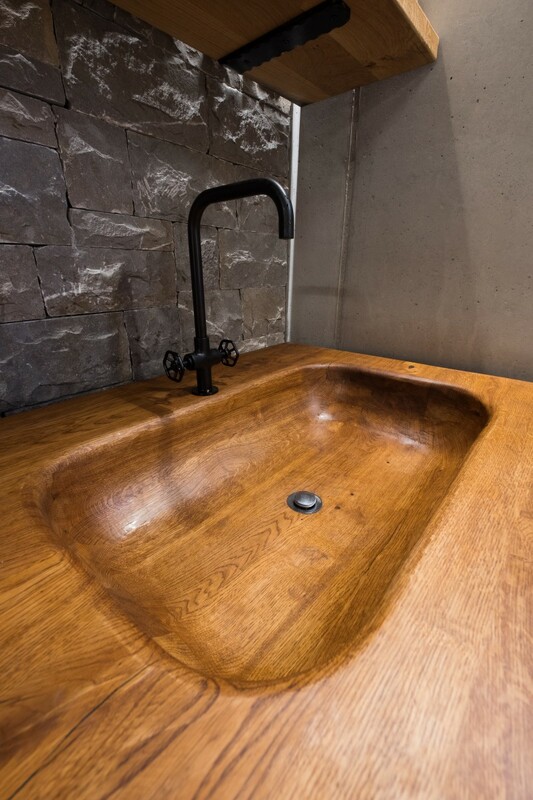 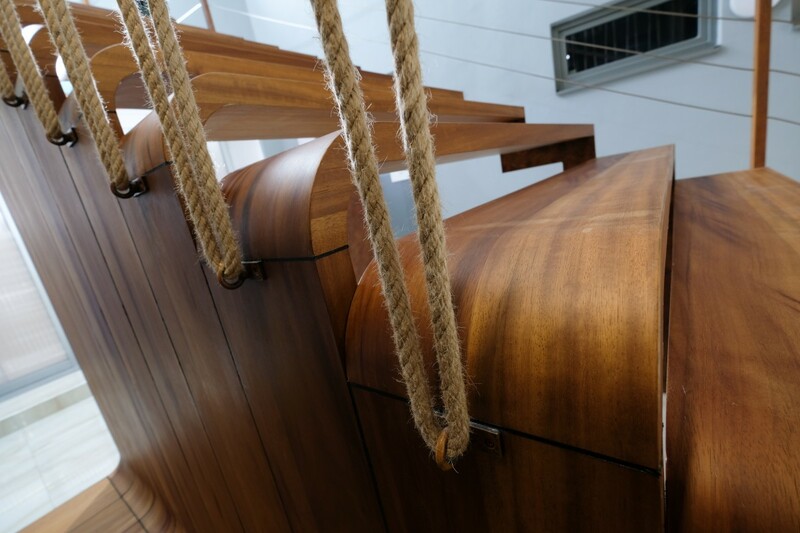 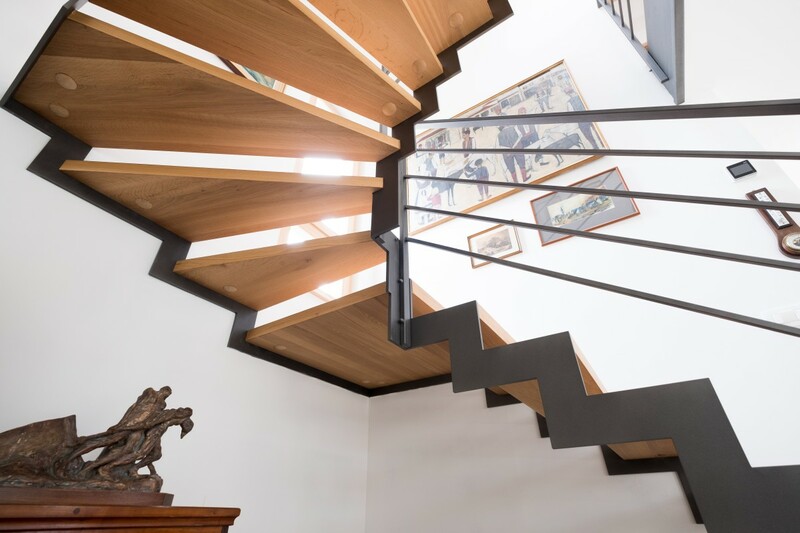 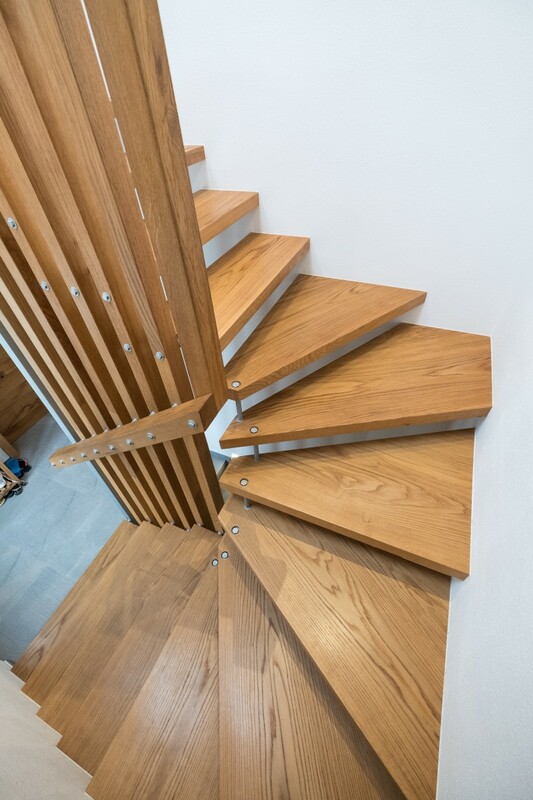 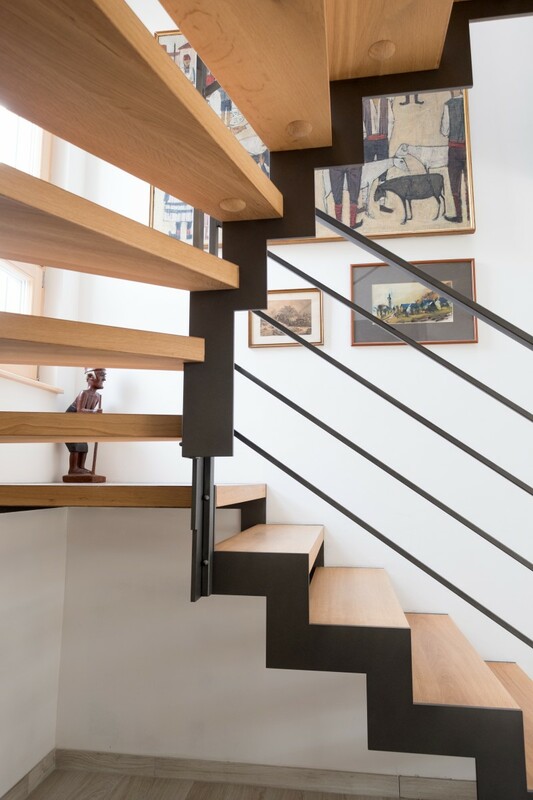 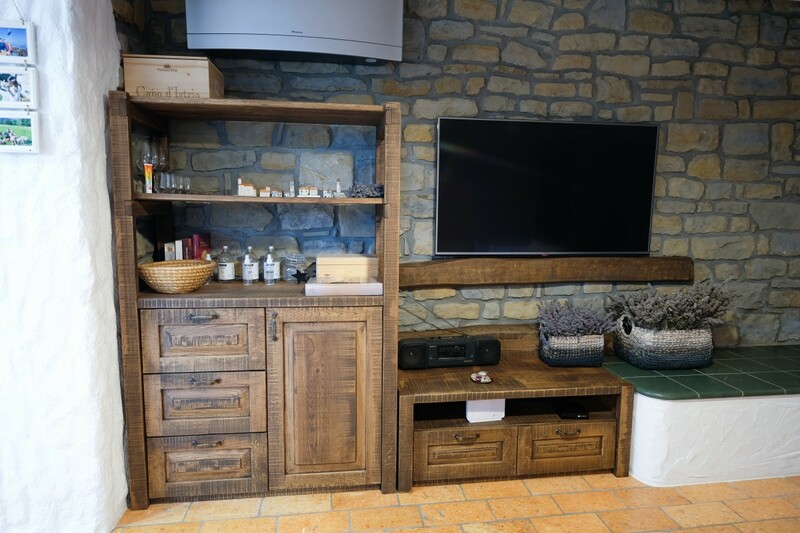 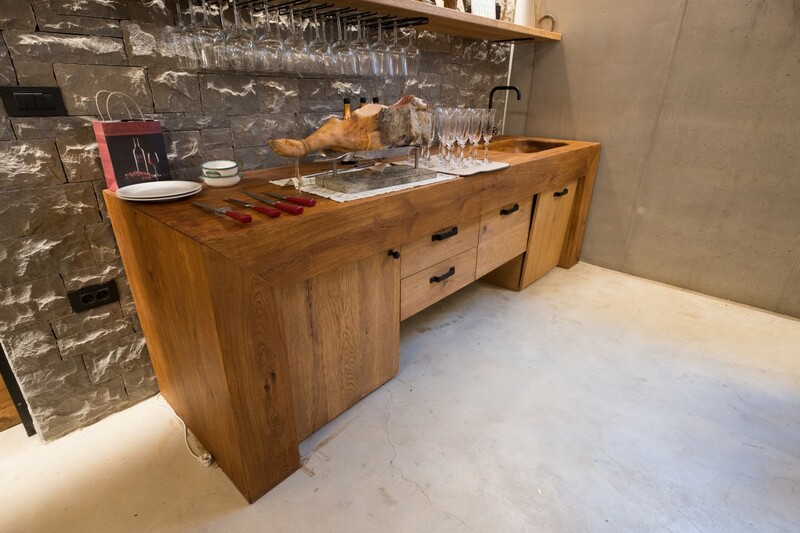 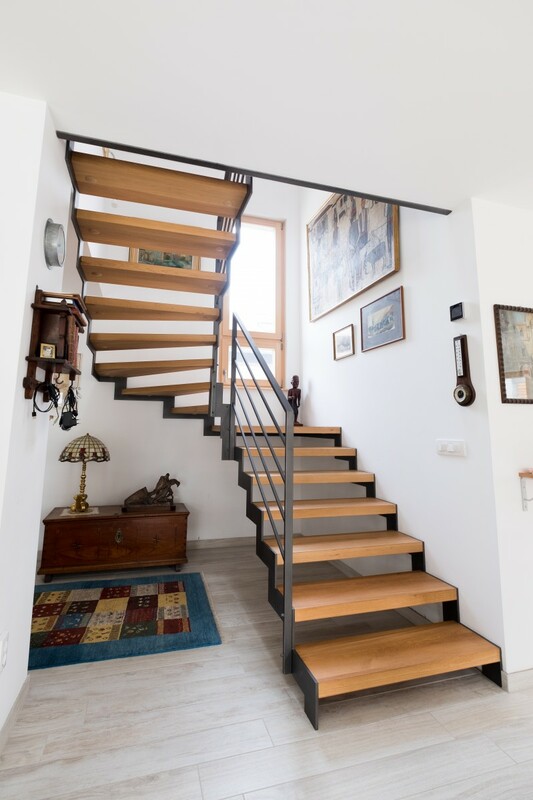 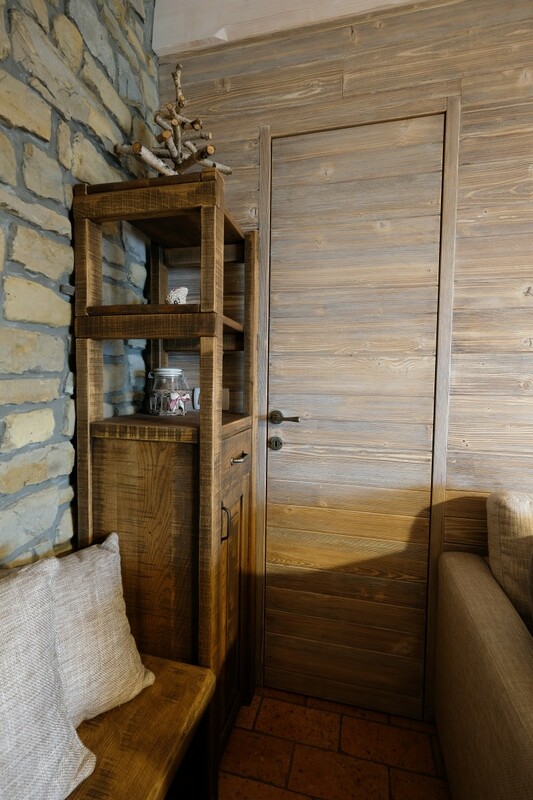 The founder of the family business is Kunc Jože and he is the leading producer of wooden stairs and fences with an experienced team operating in Slovenia and abroad. 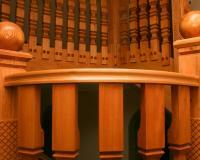 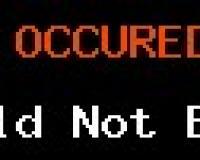 He included both sons in the business. 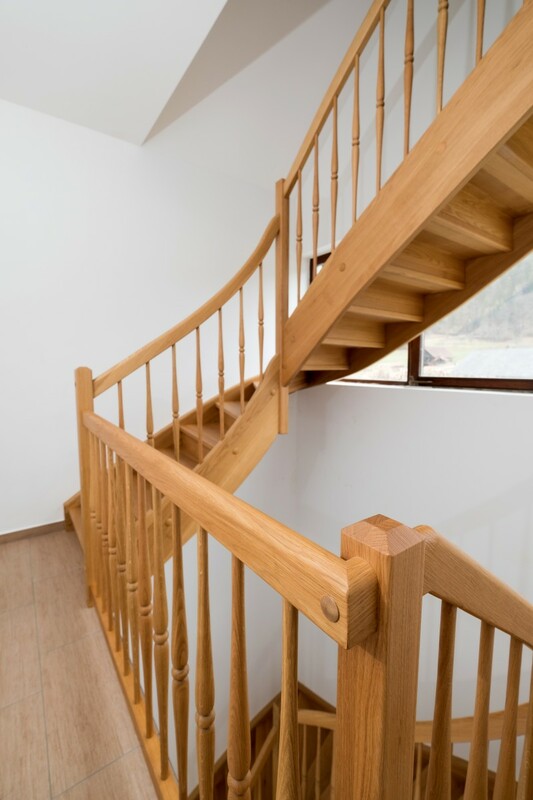 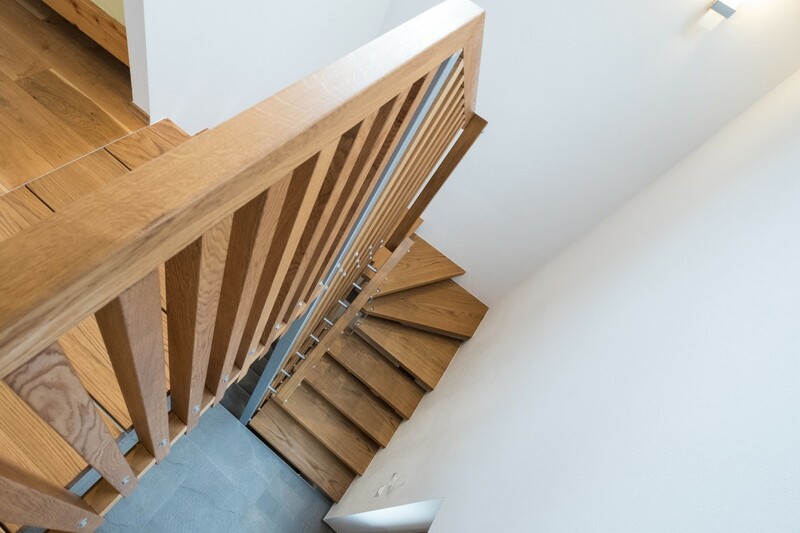 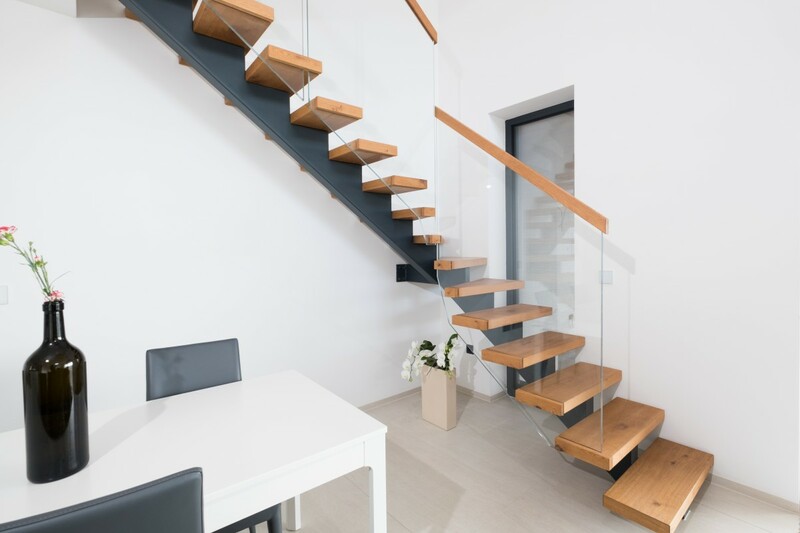 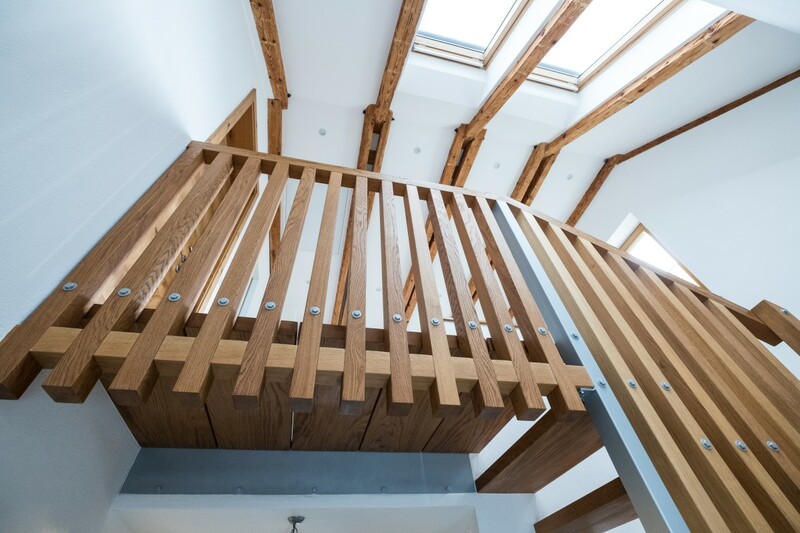 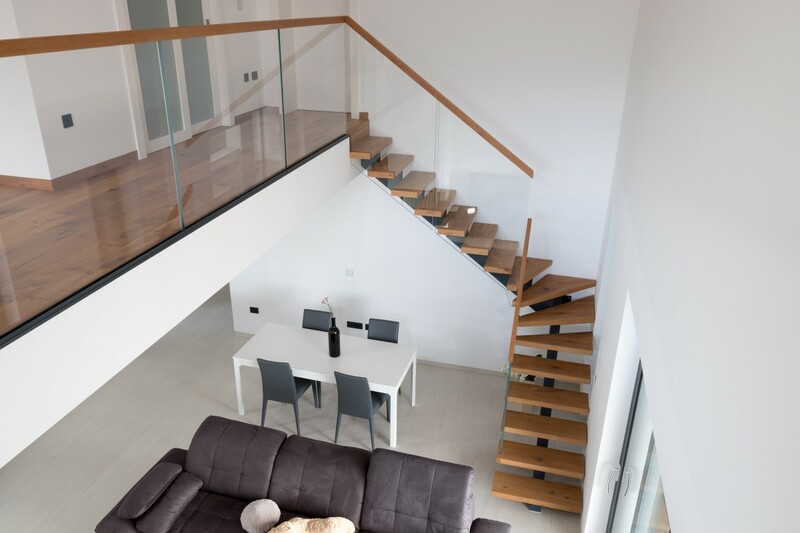 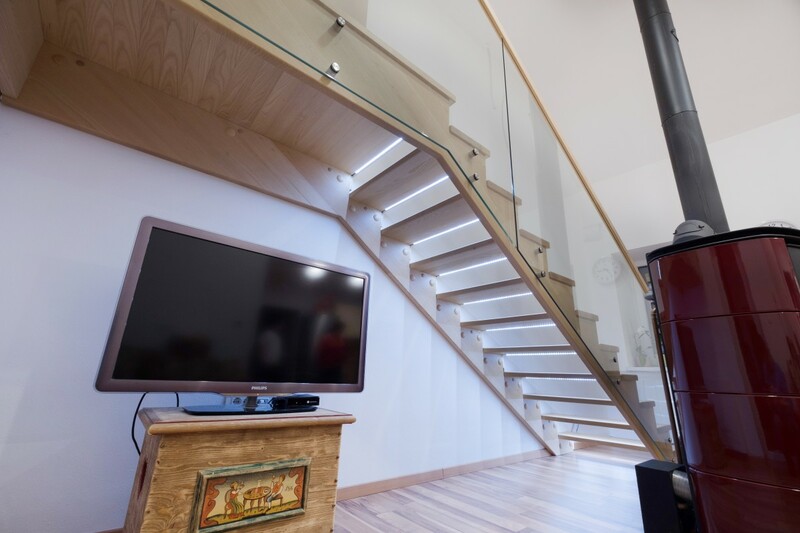 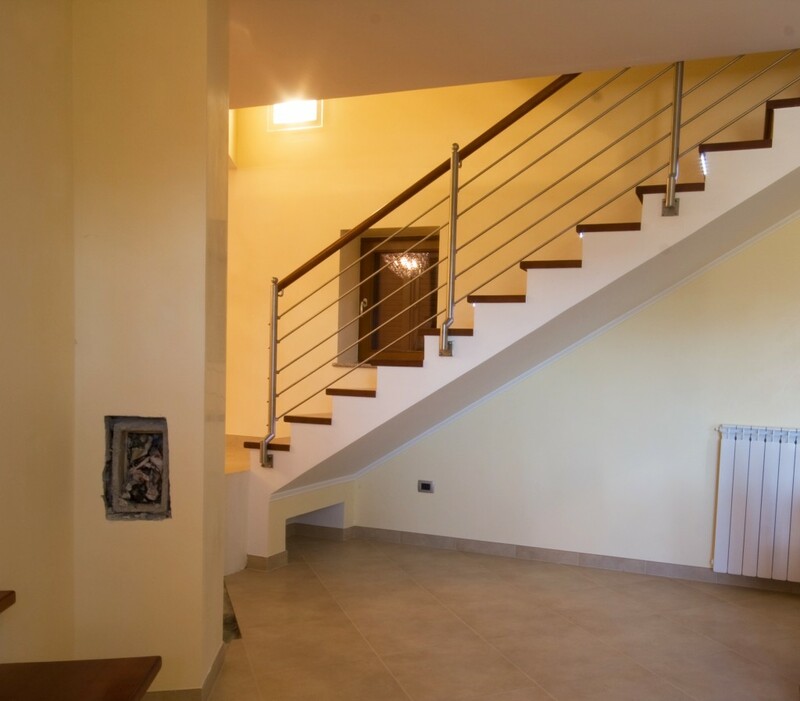 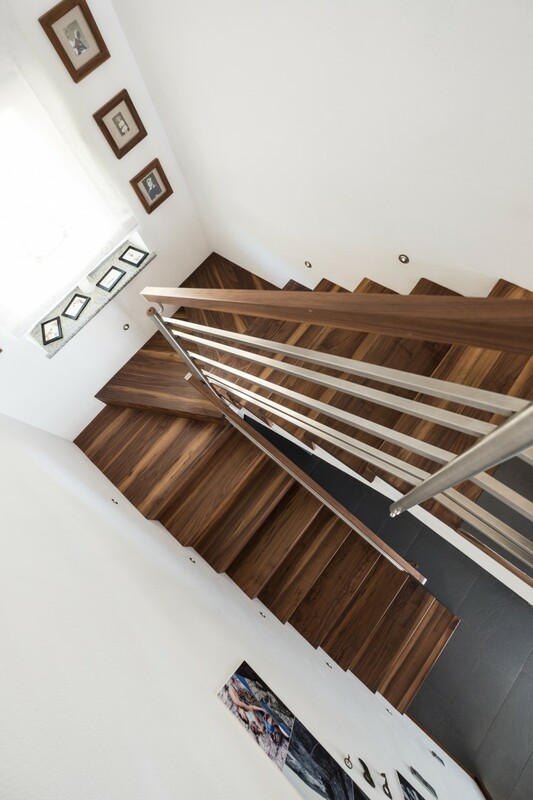 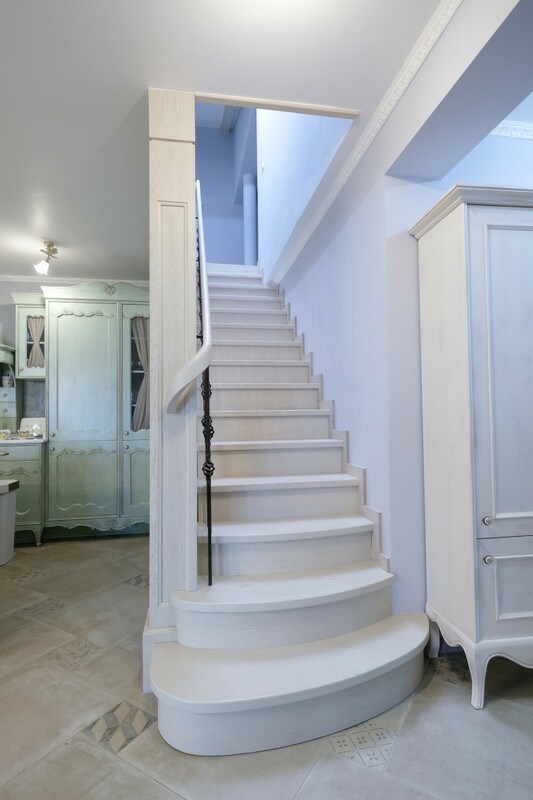 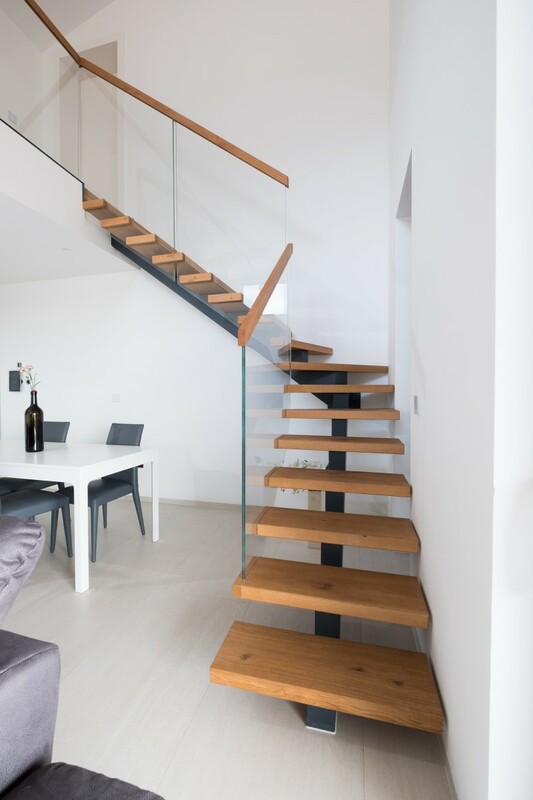 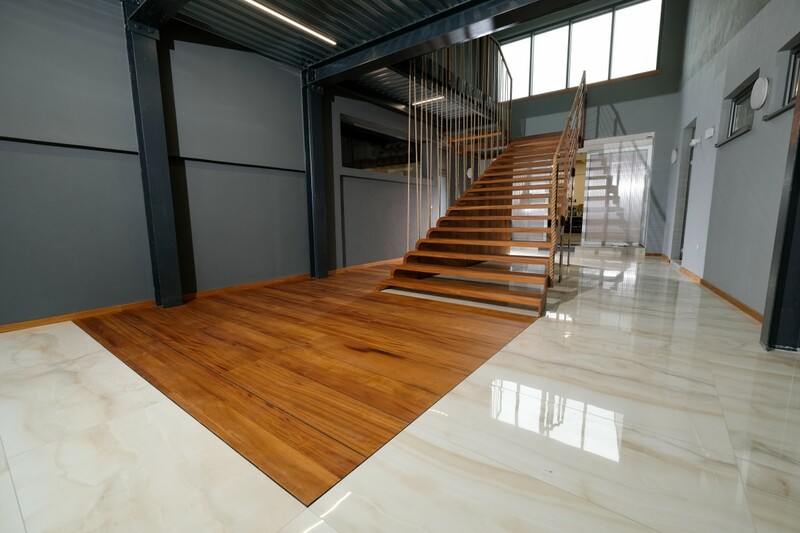 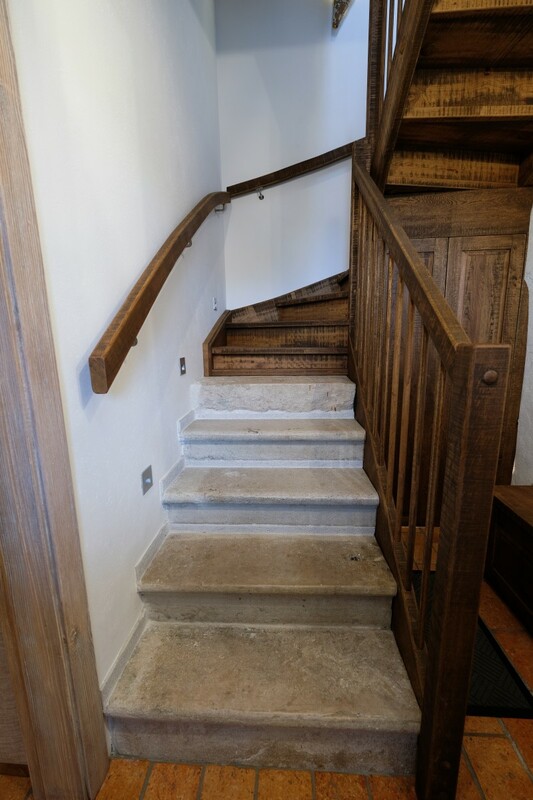 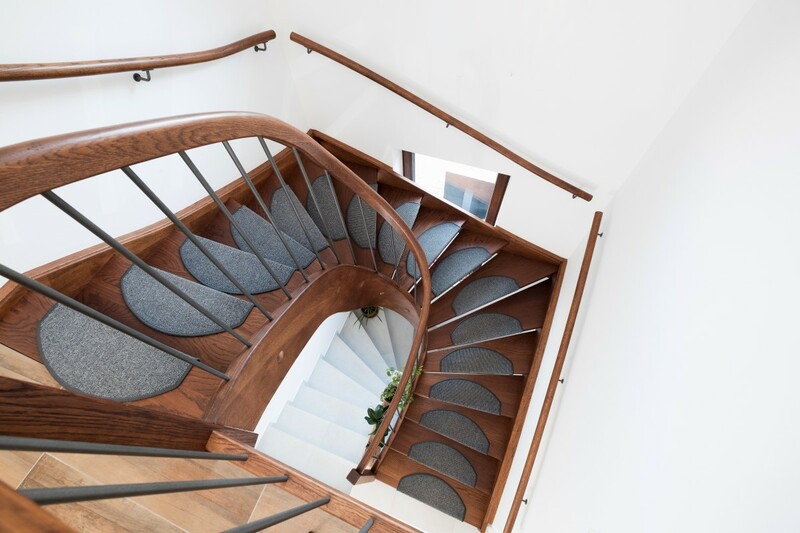 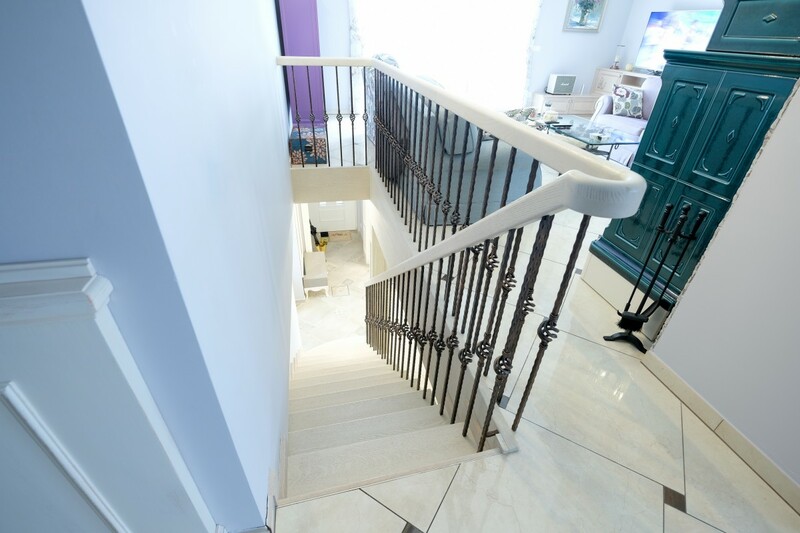 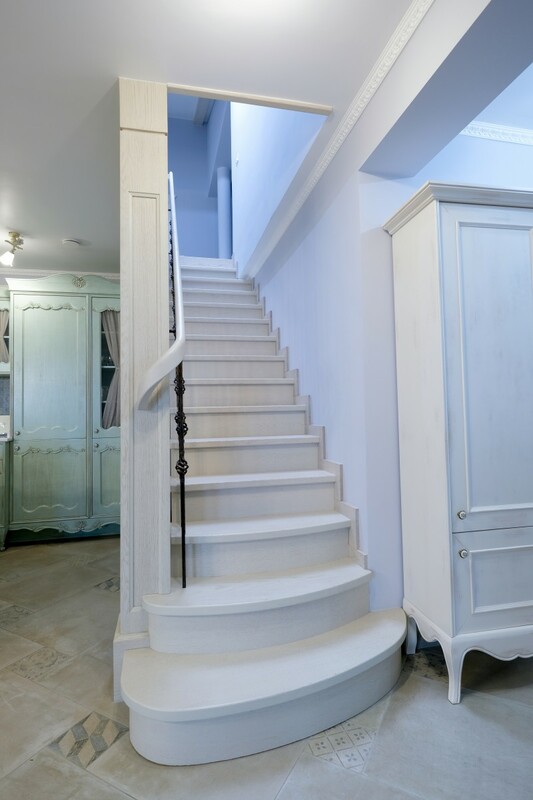 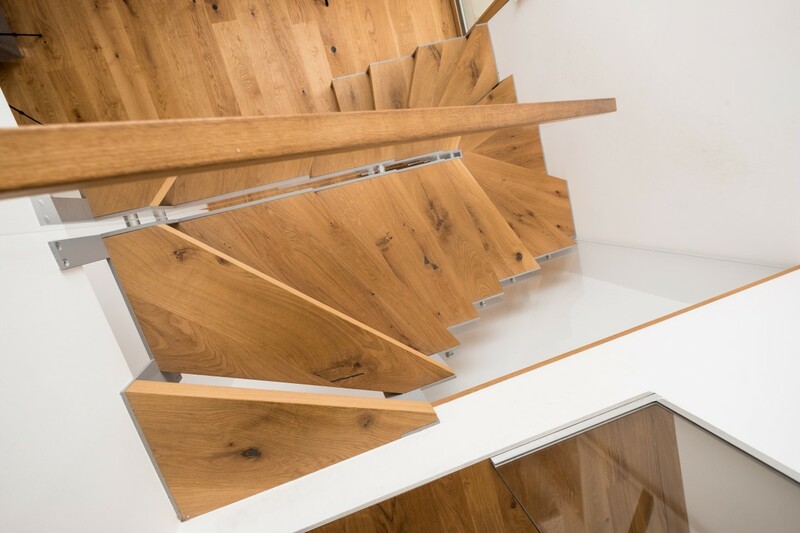 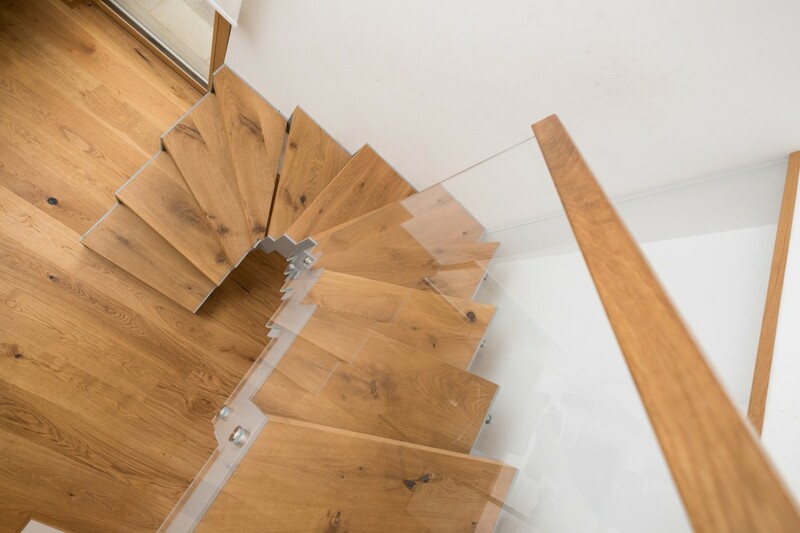 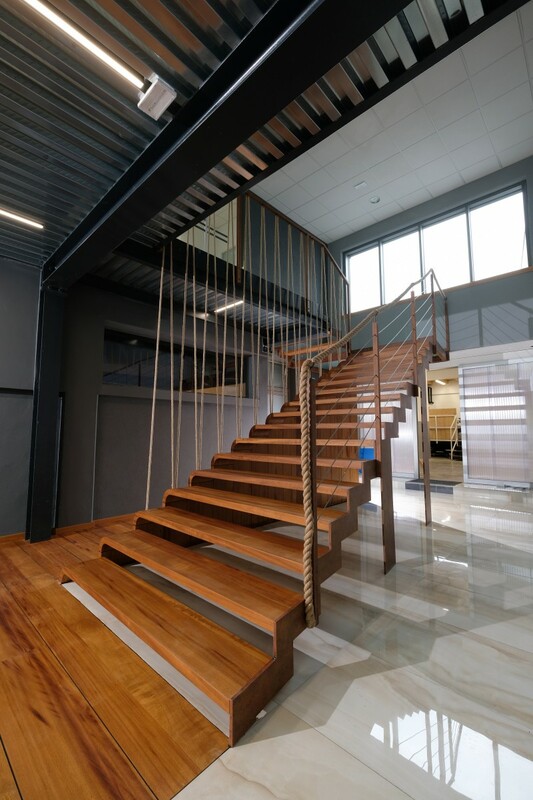 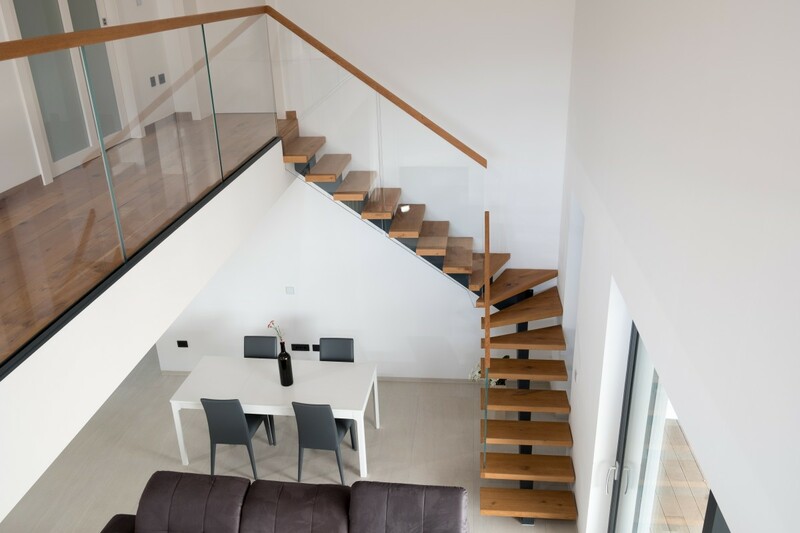 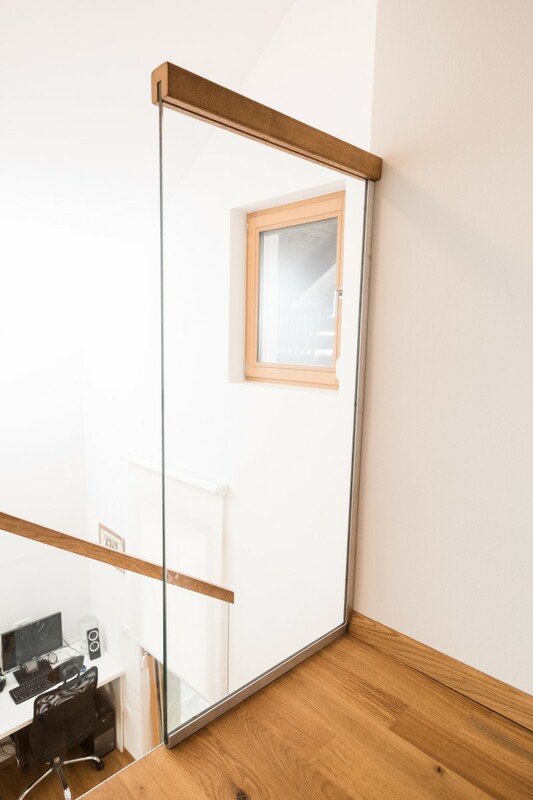 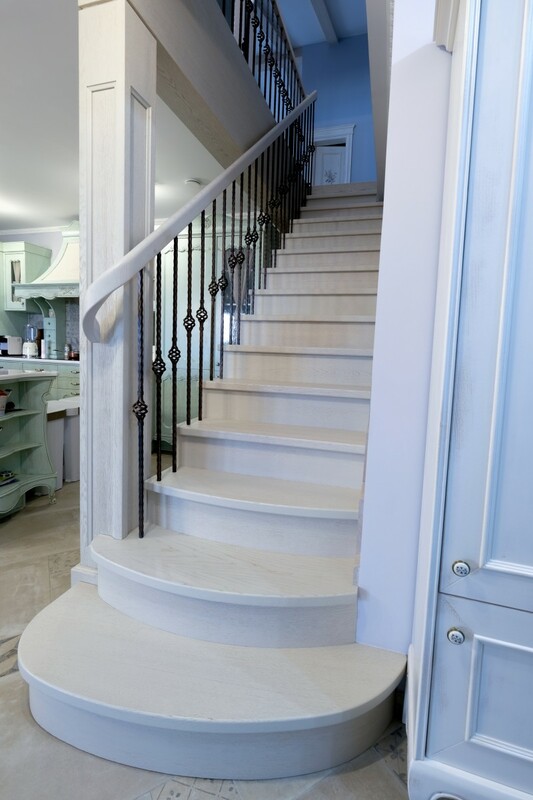 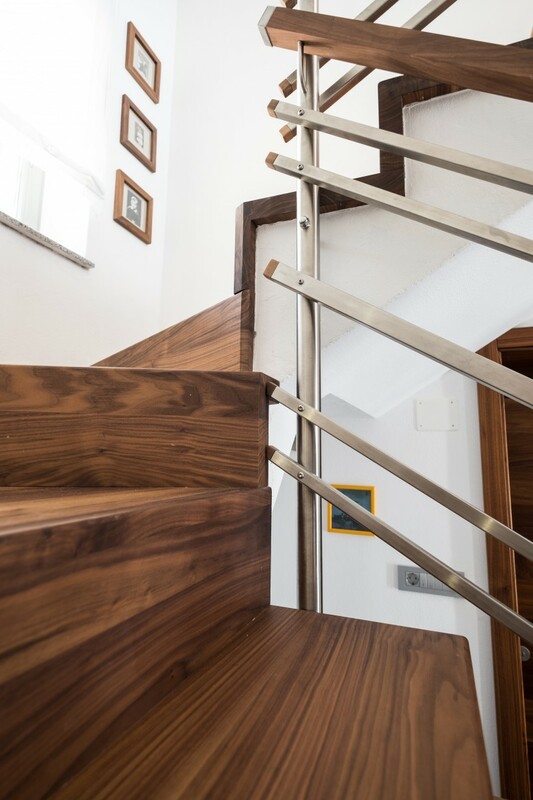 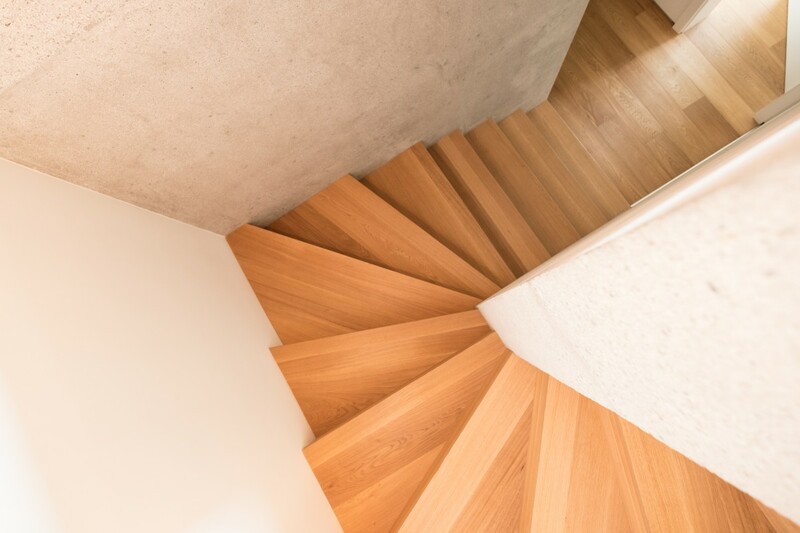 In the manufacture of stairs, we use the latest technology and the highest quality materials, which we combine with many years of experience. 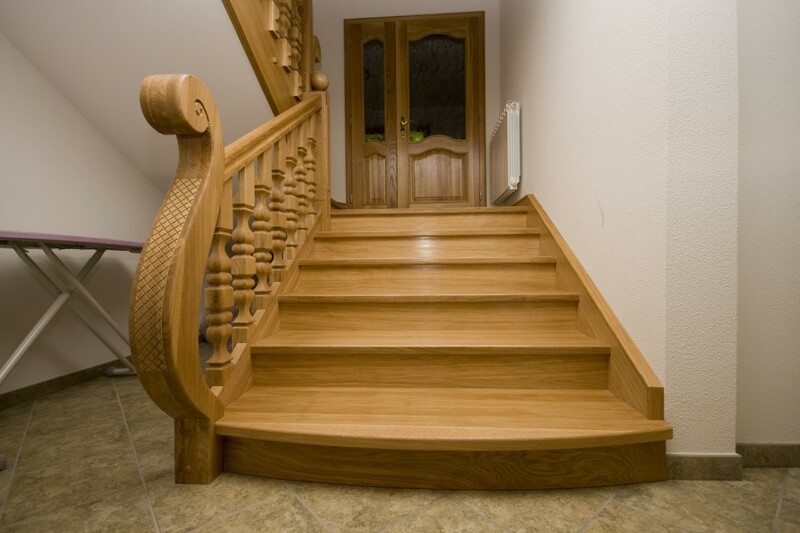 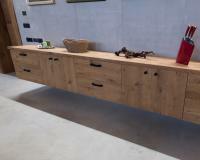 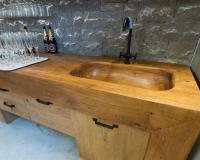 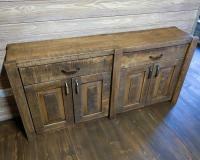 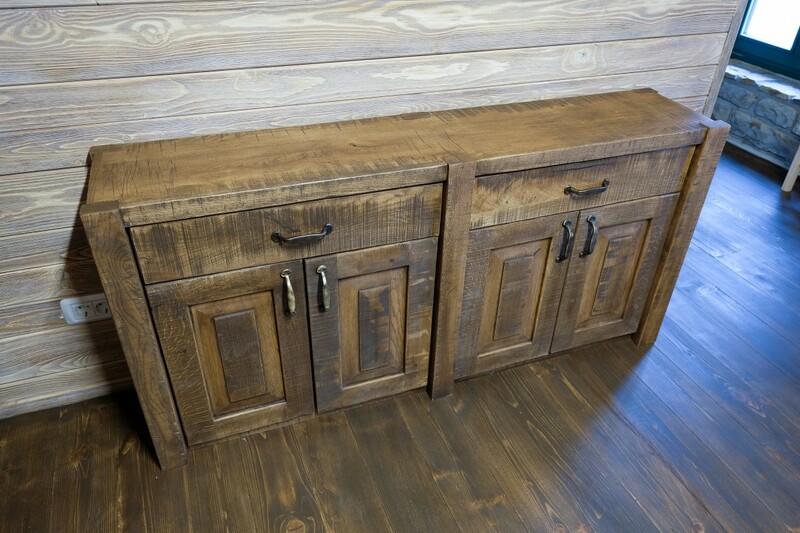 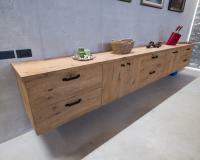 Our products are of exceptional quality! 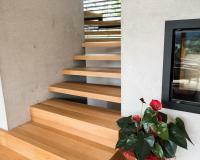 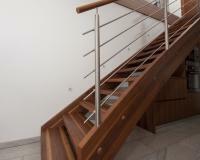 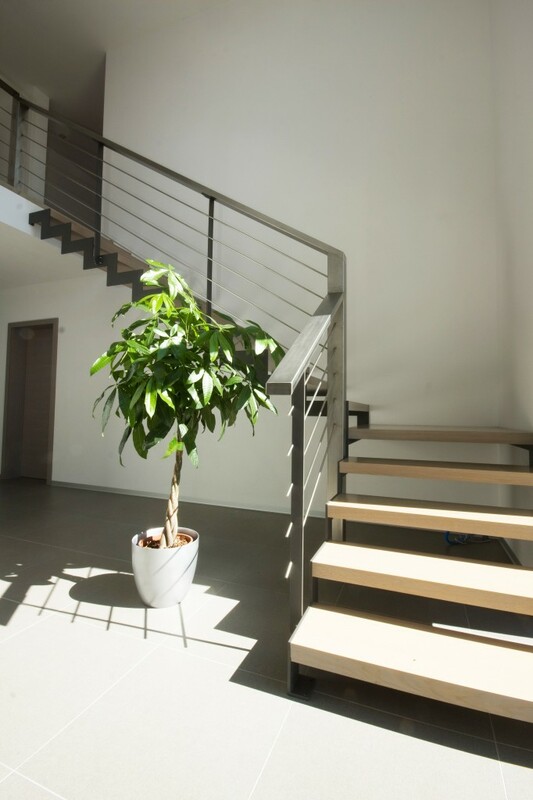 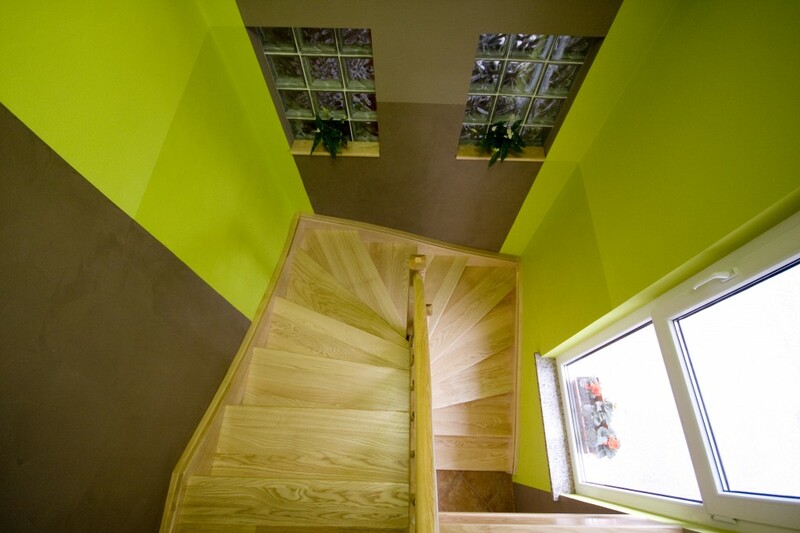 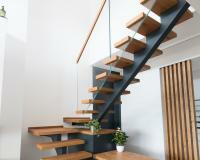 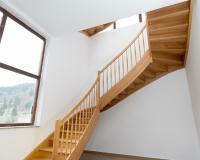 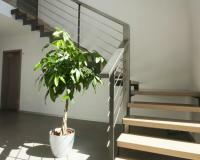 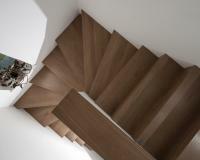 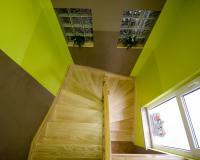 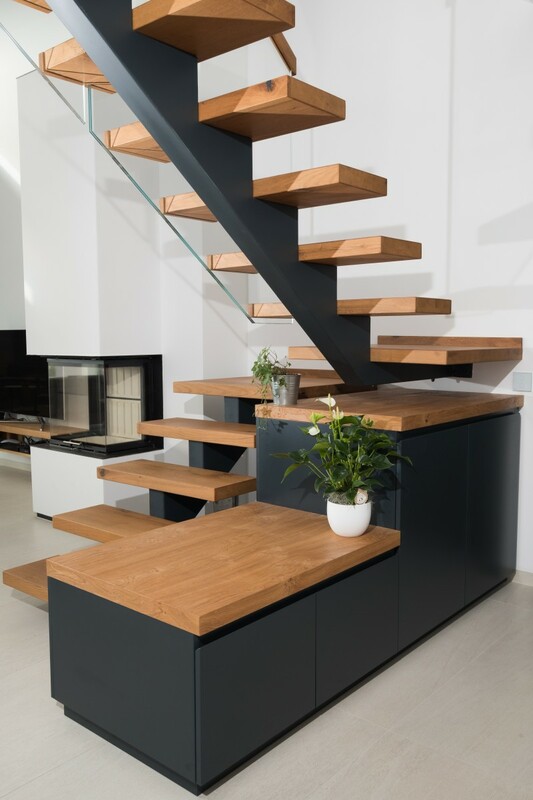 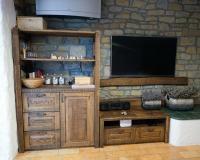 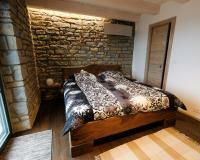 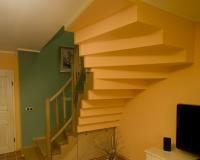 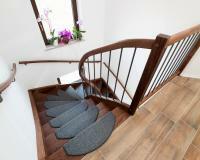 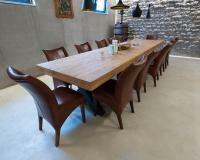 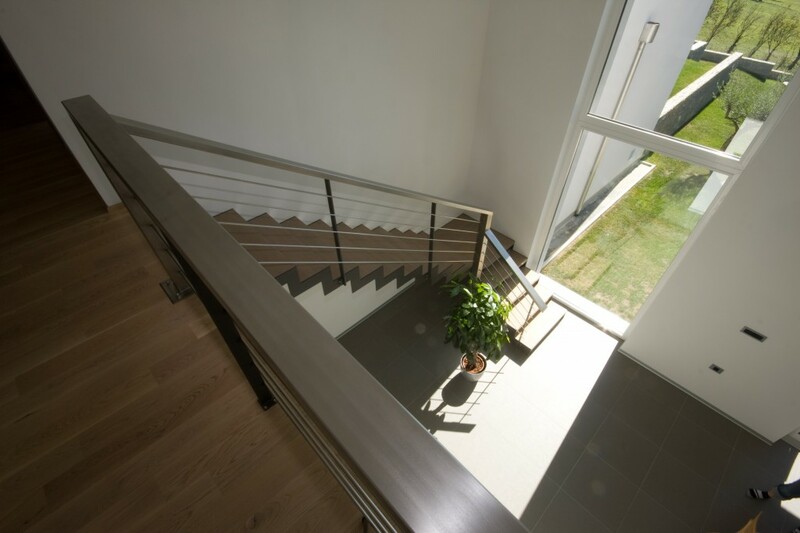 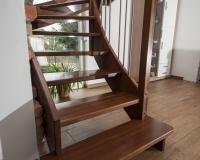 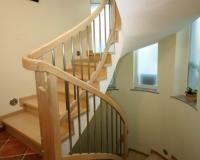 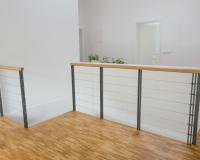 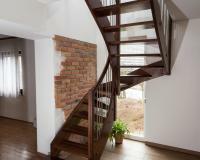 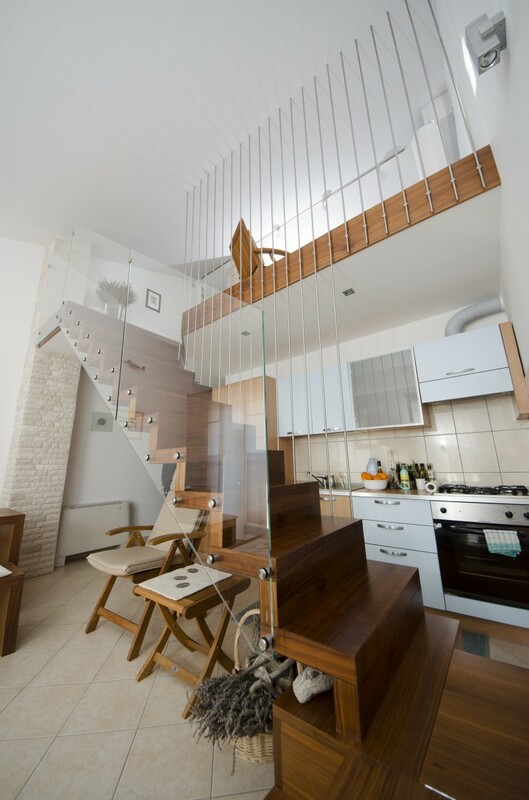 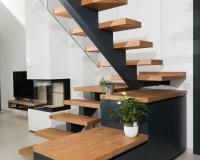 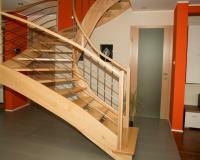 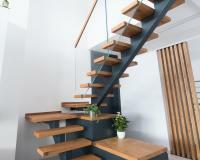 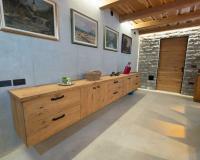 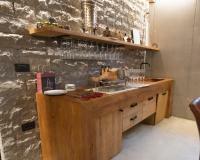 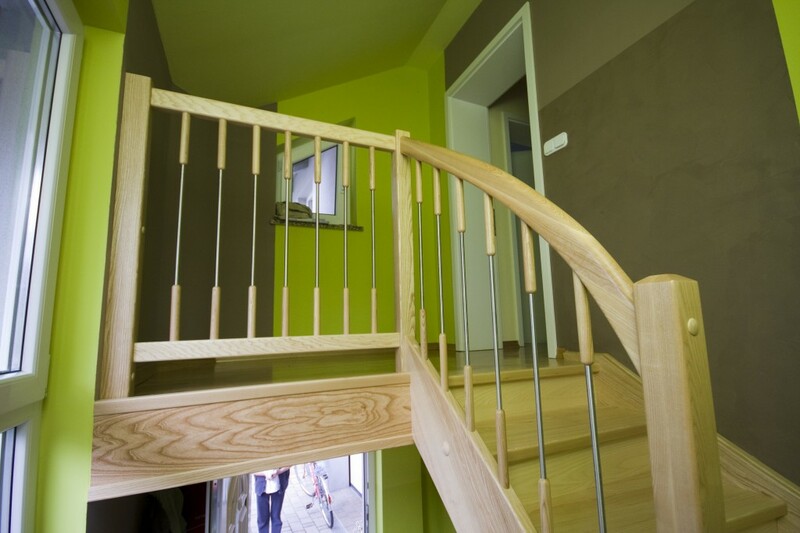 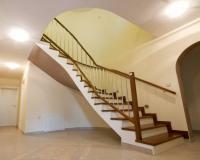 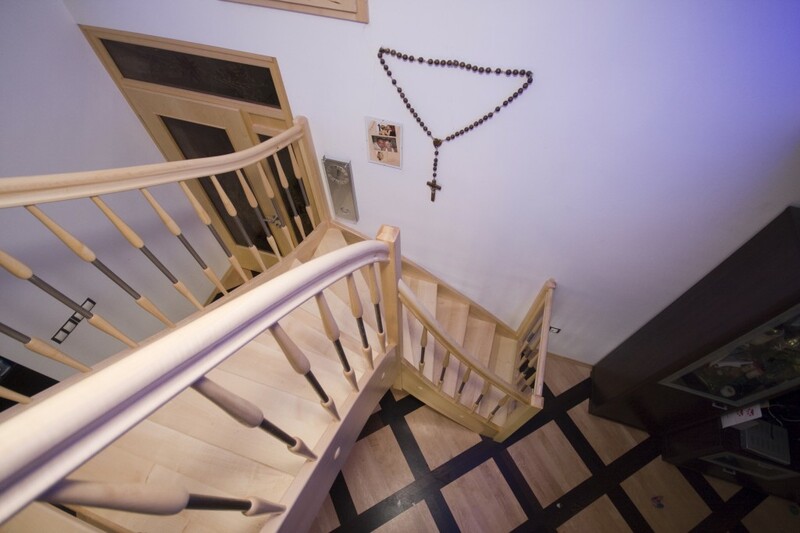 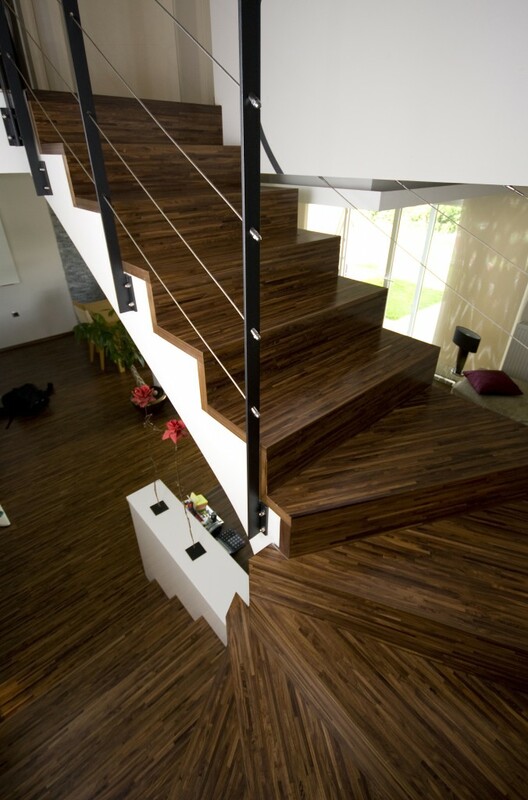 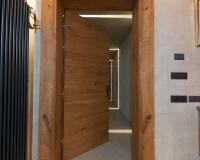 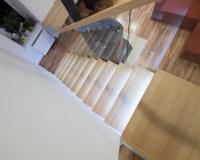 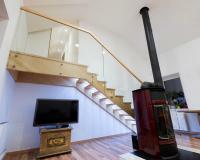 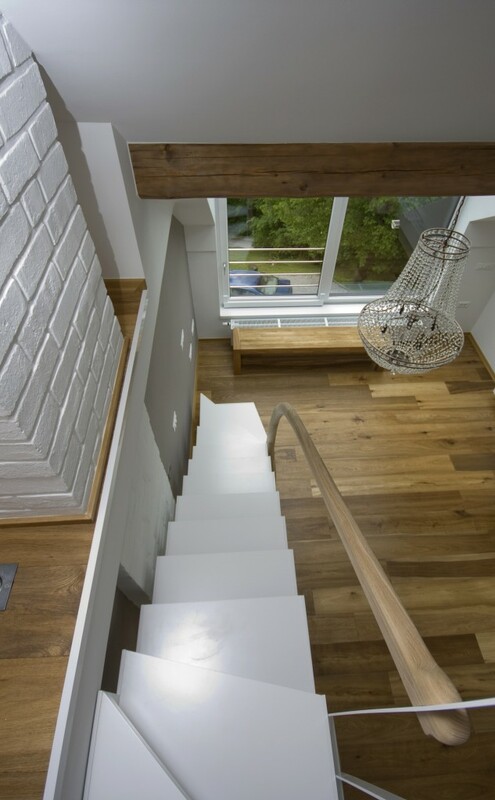 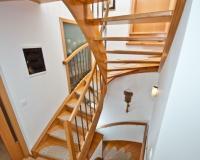 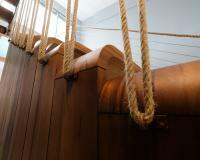 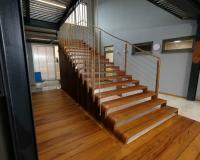 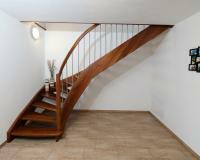 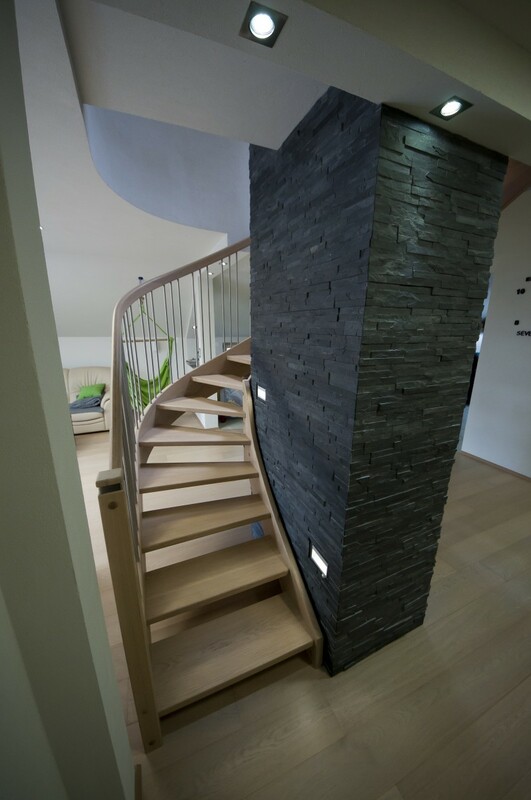 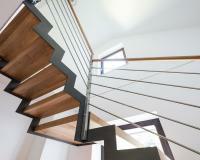 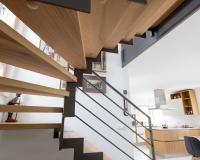 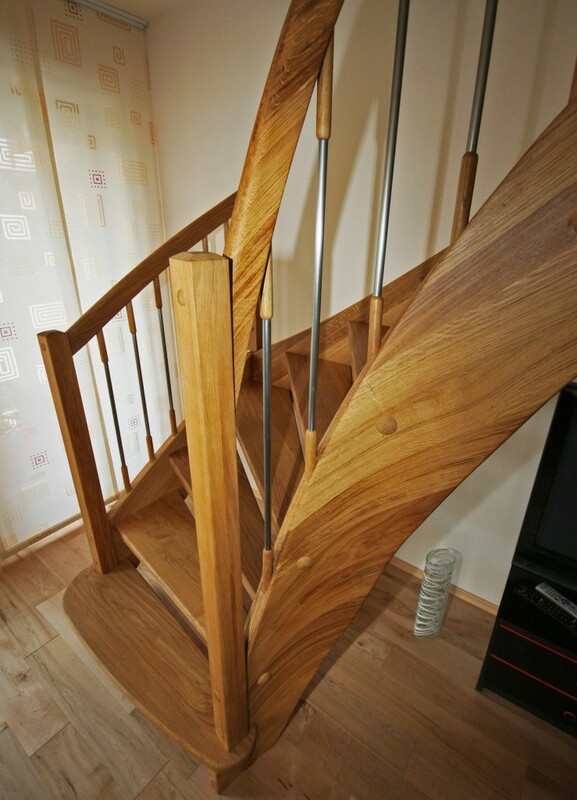 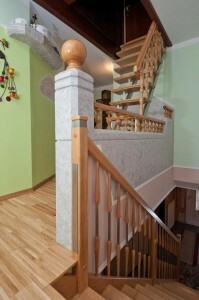 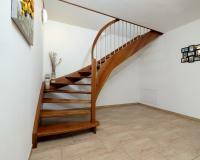 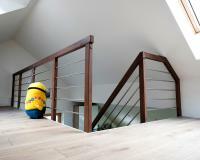 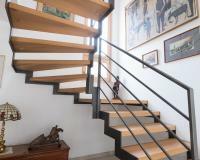 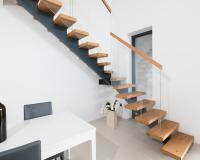 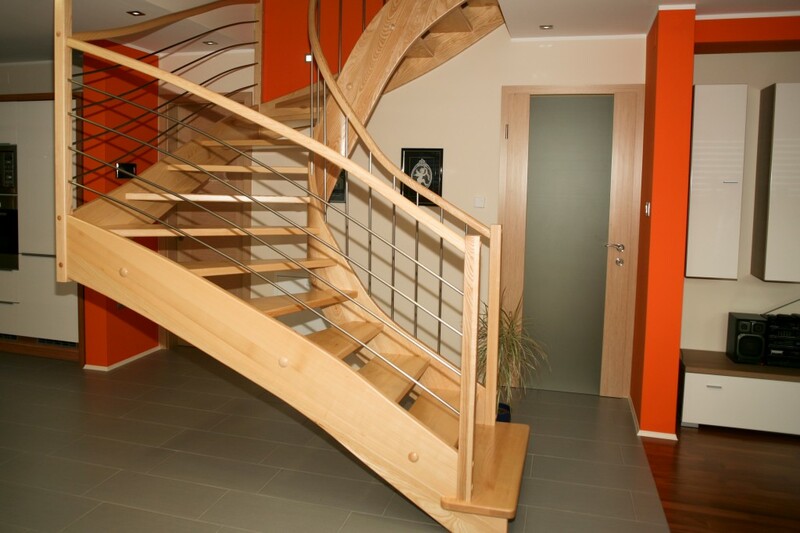 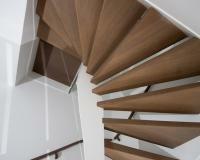 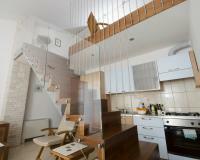 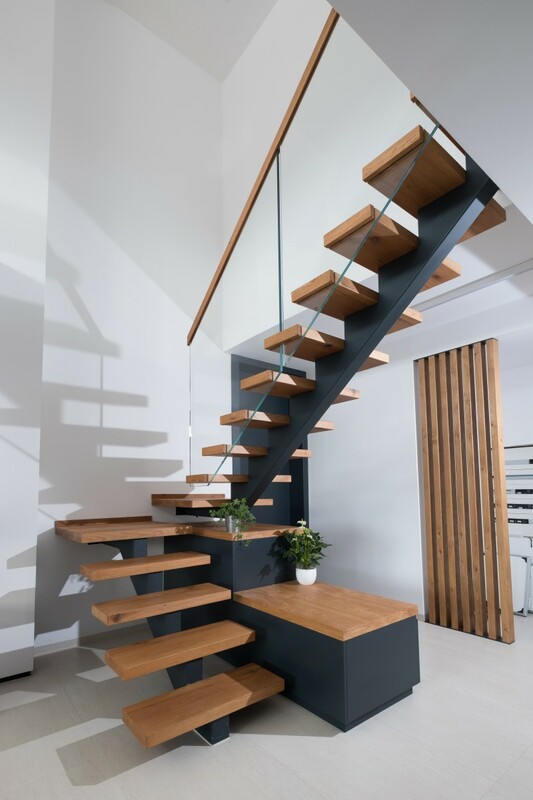 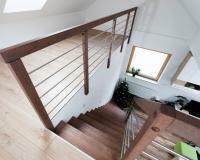 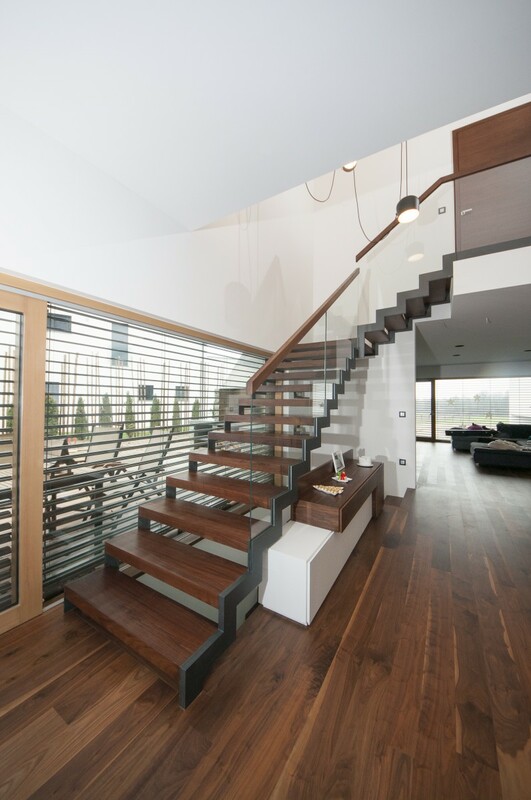 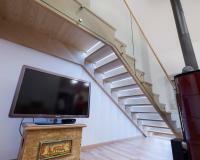 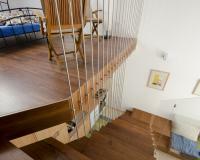 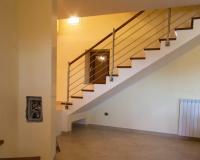 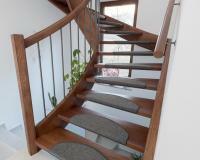 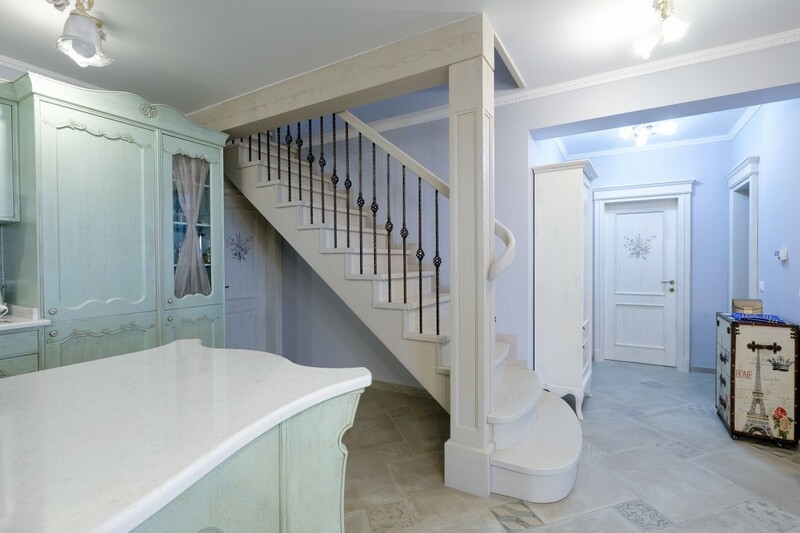 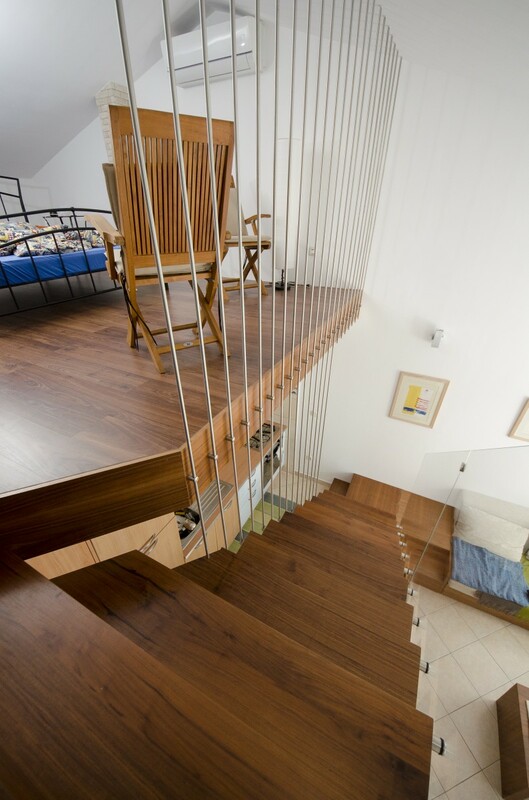 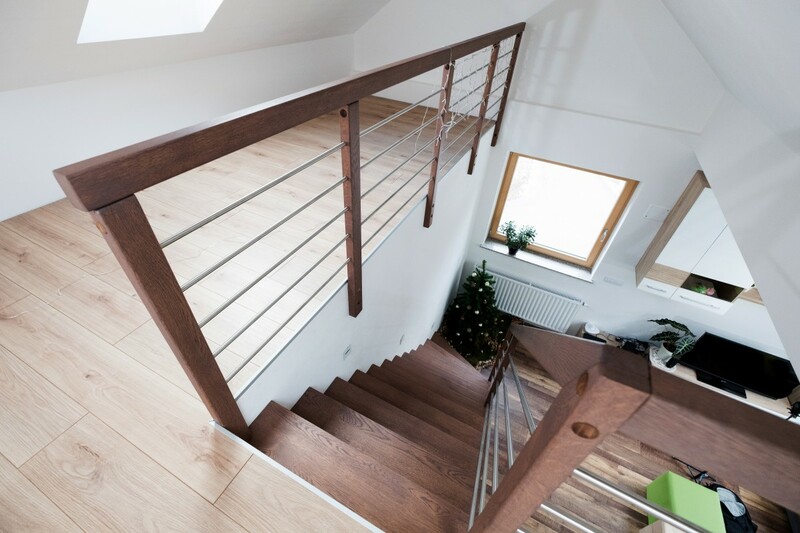 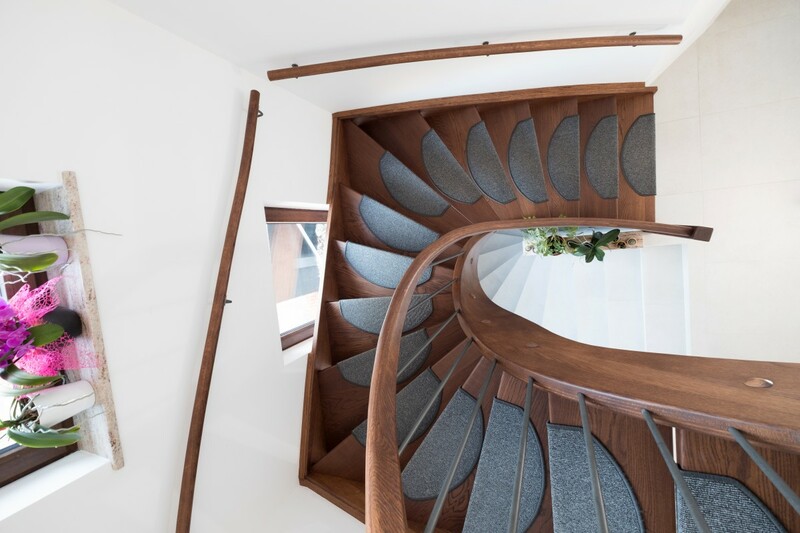 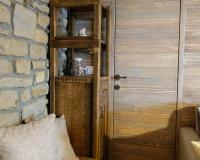 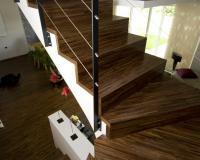 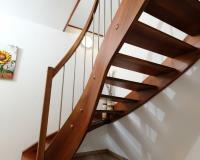 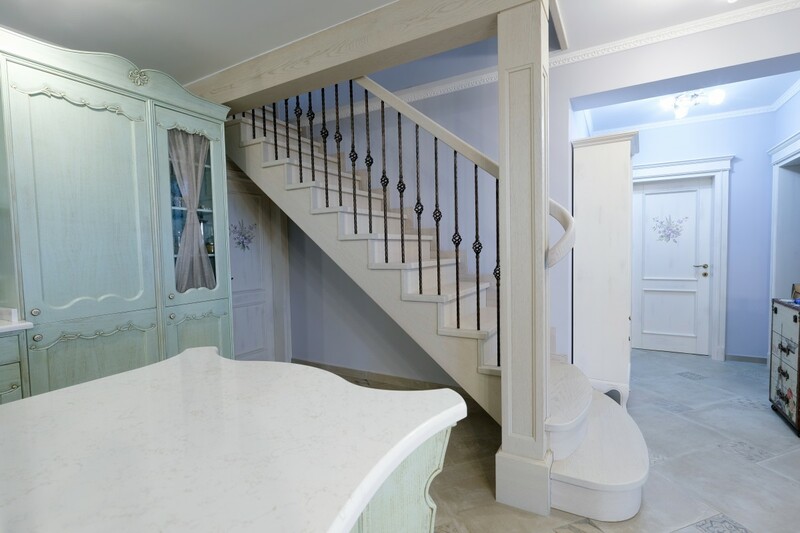 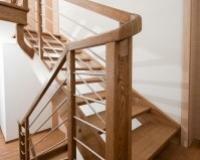 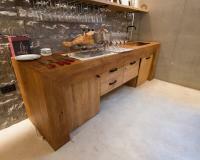 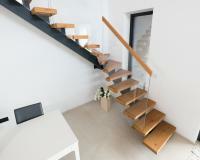 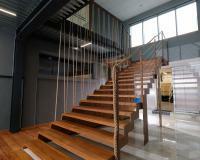 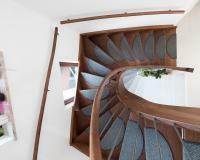 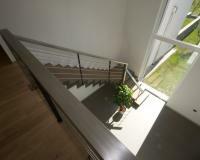 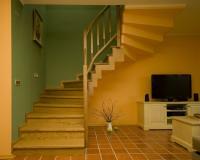 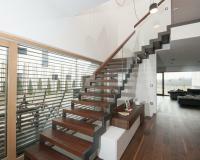 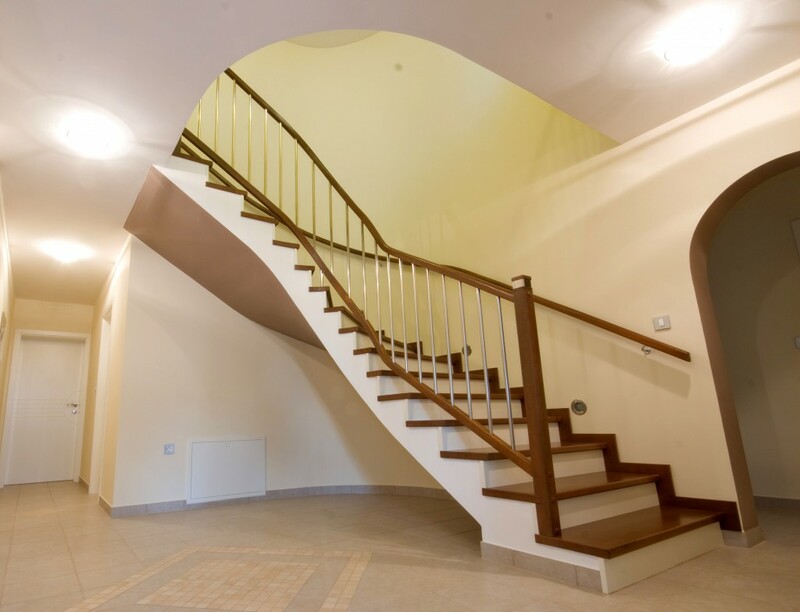 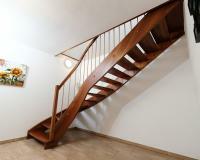 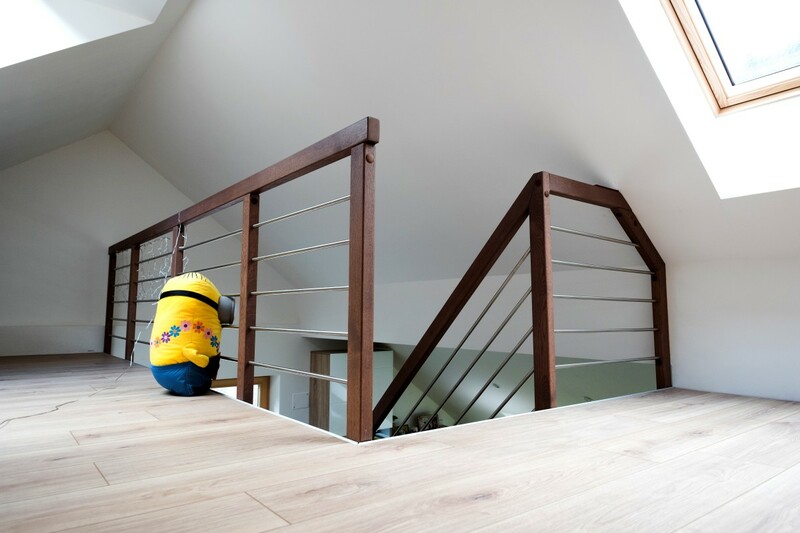 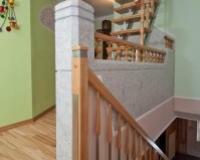 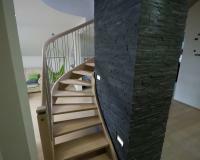 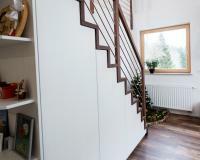 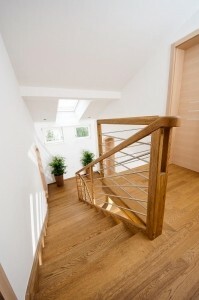 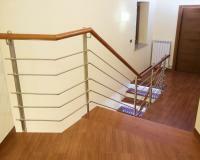 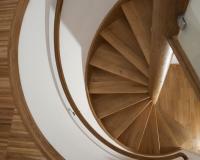 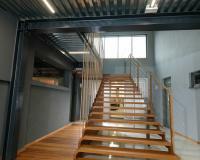 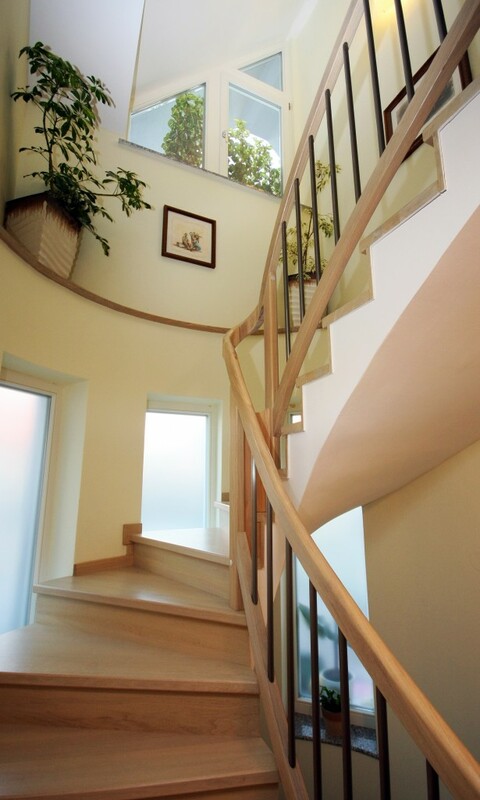 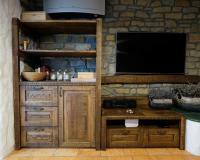 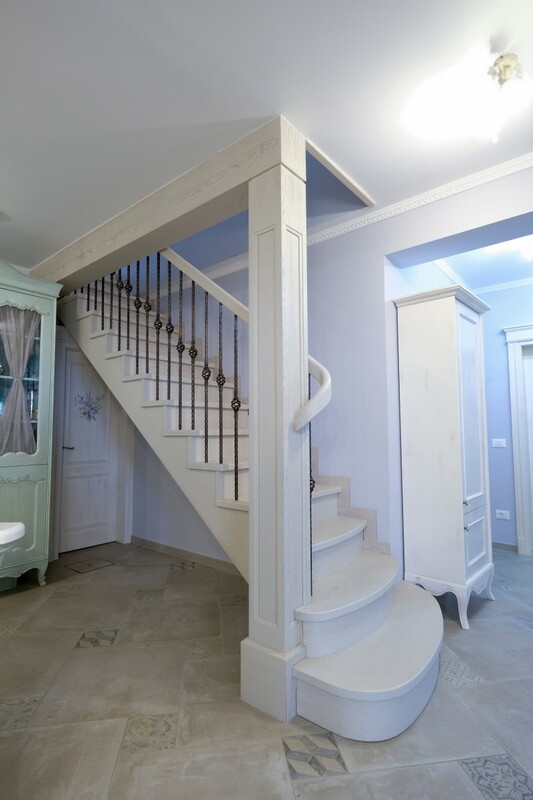 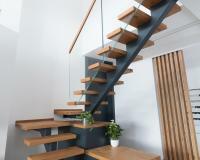 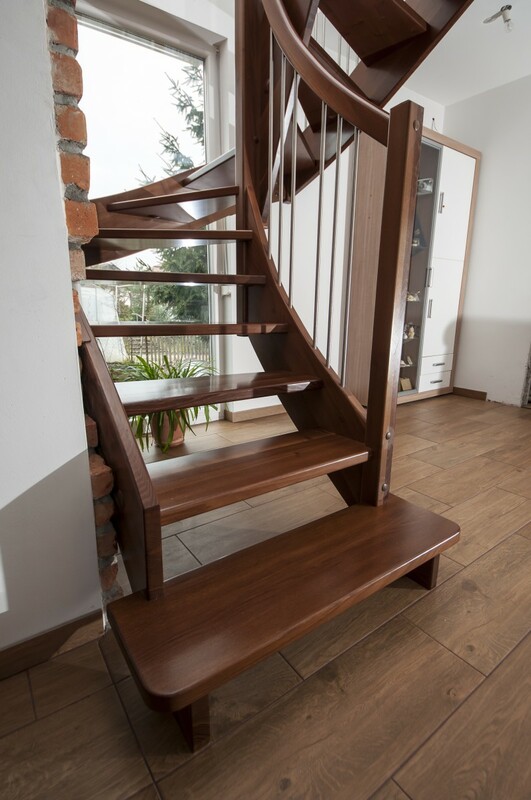 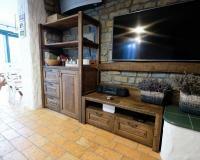 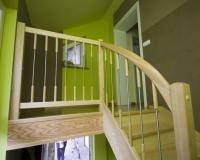 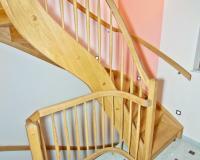 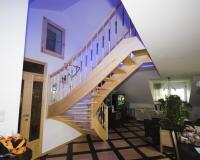 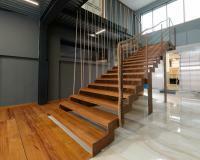 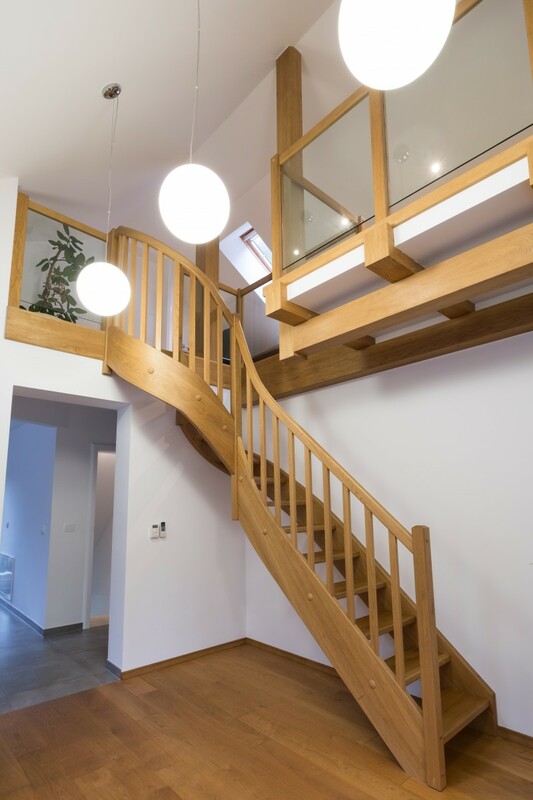 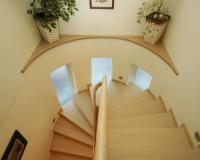 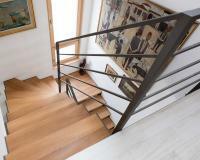 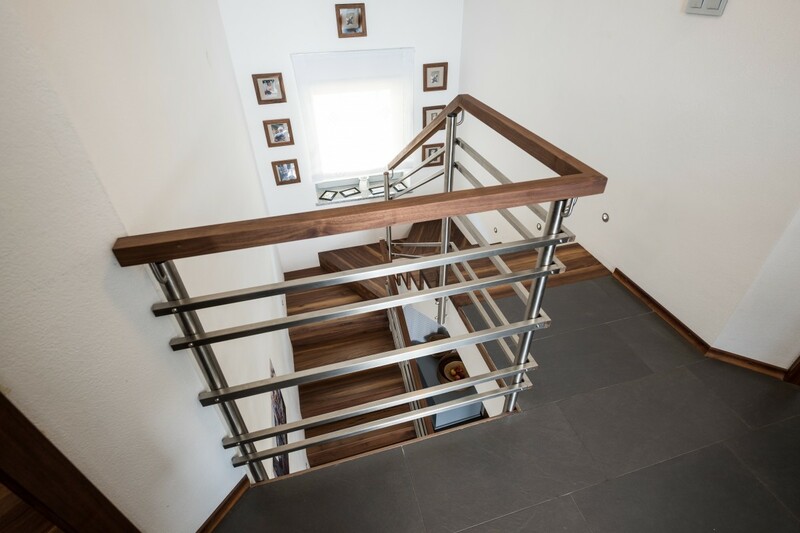 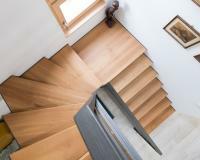 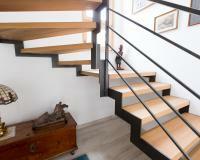 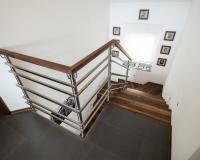 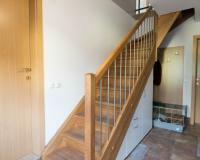 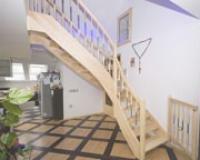 Mizarstvo Kunc is a family company with twenty years of experience in making modern stairs for every home.